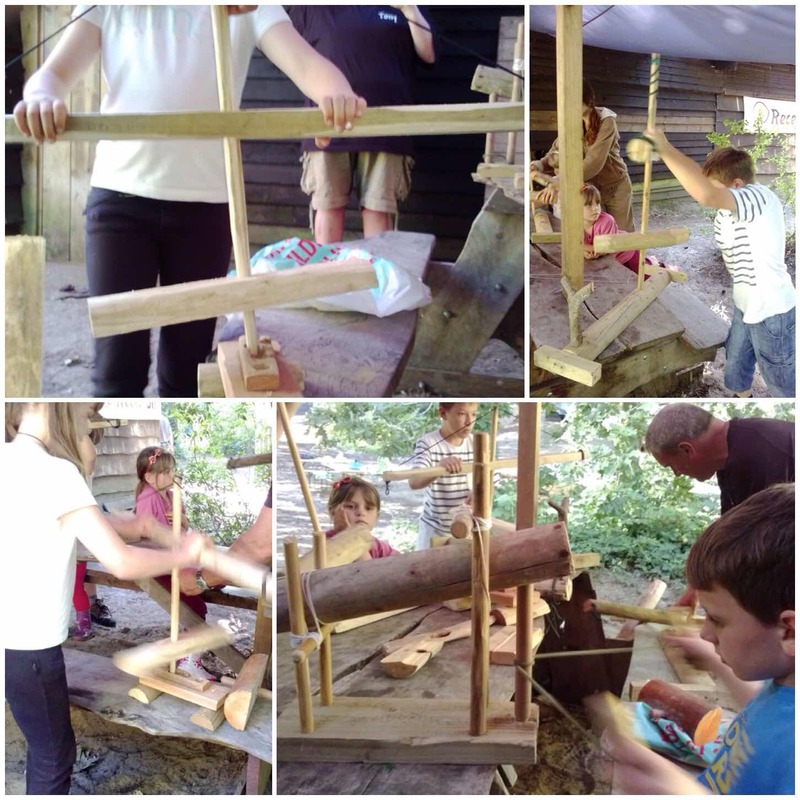 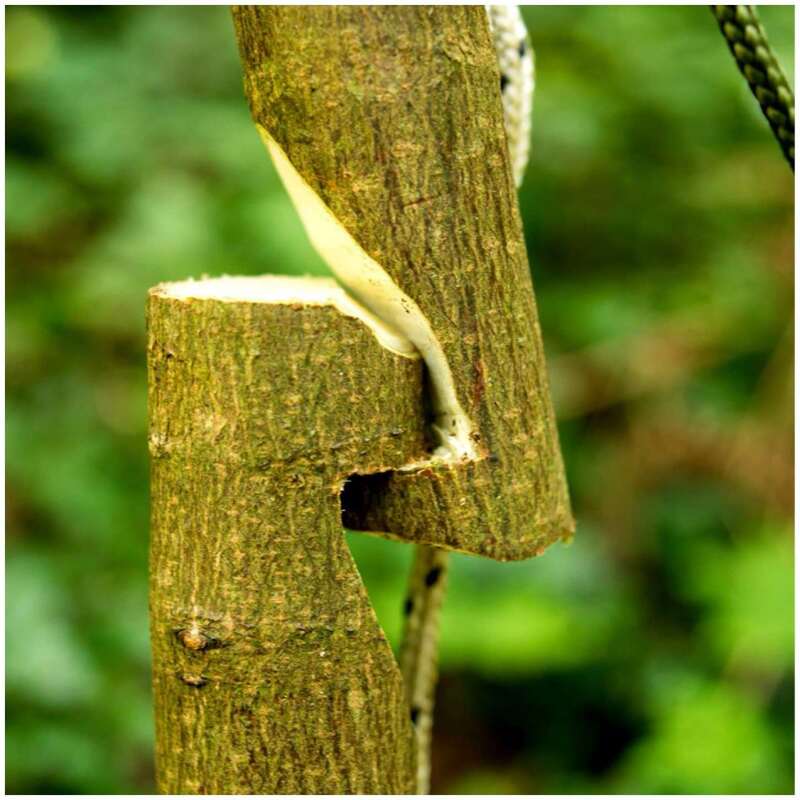 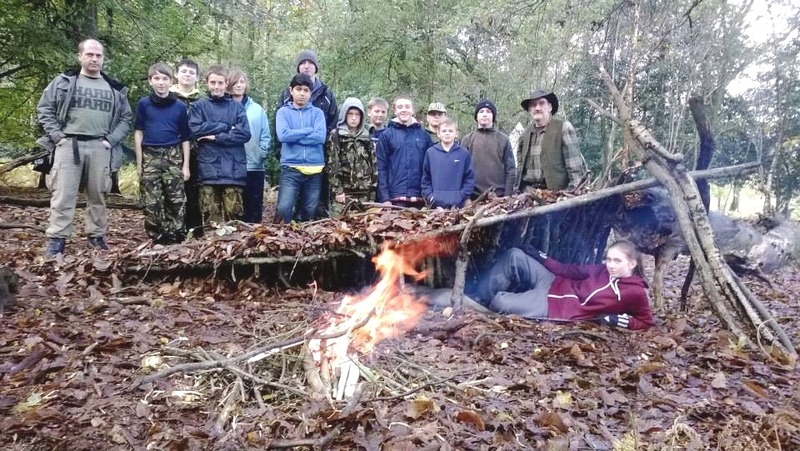 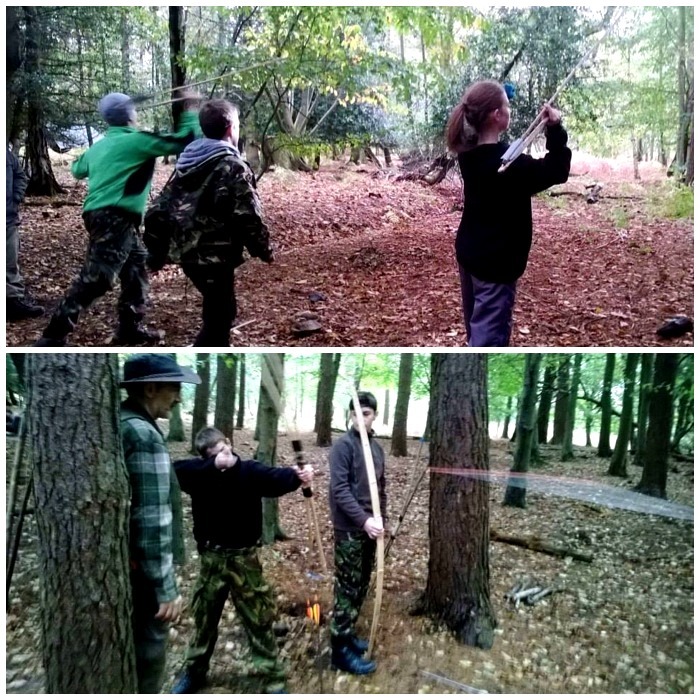 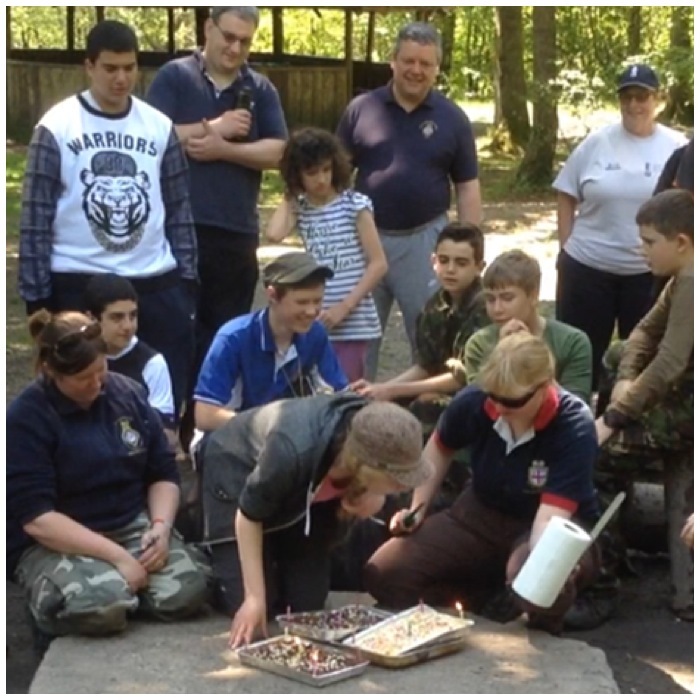 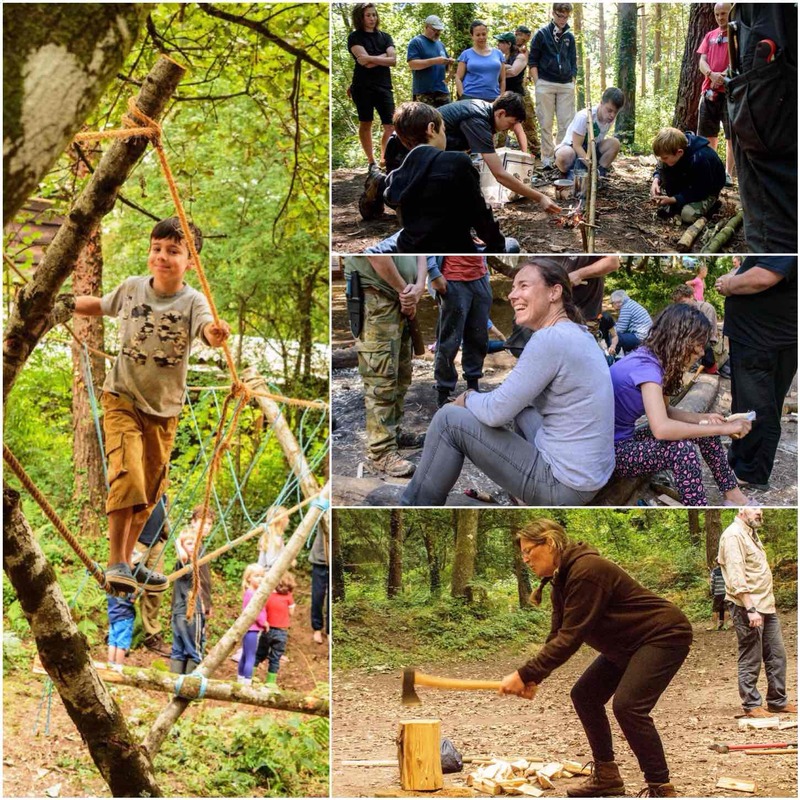 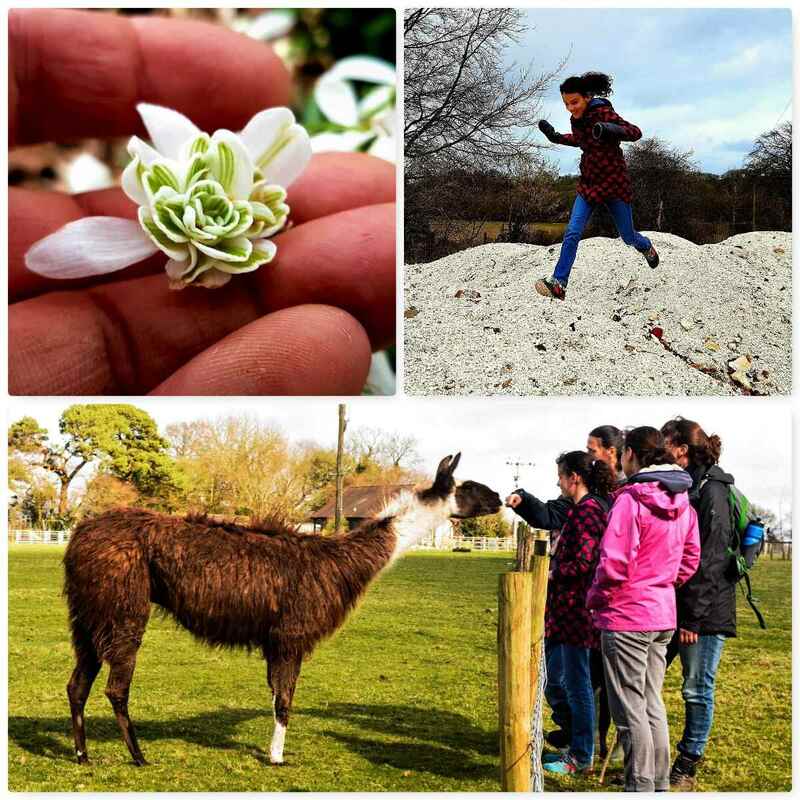 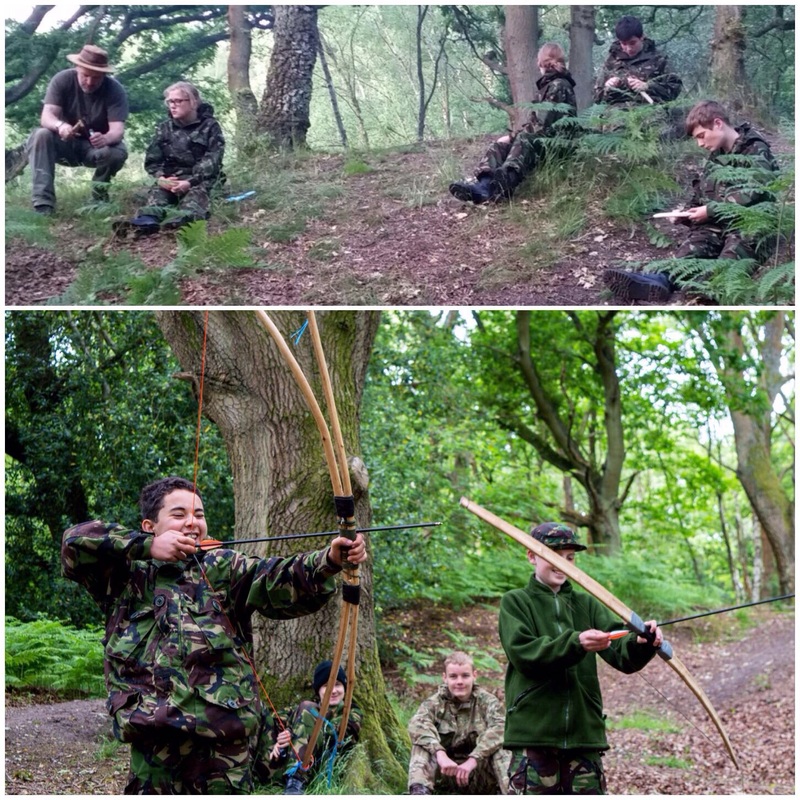 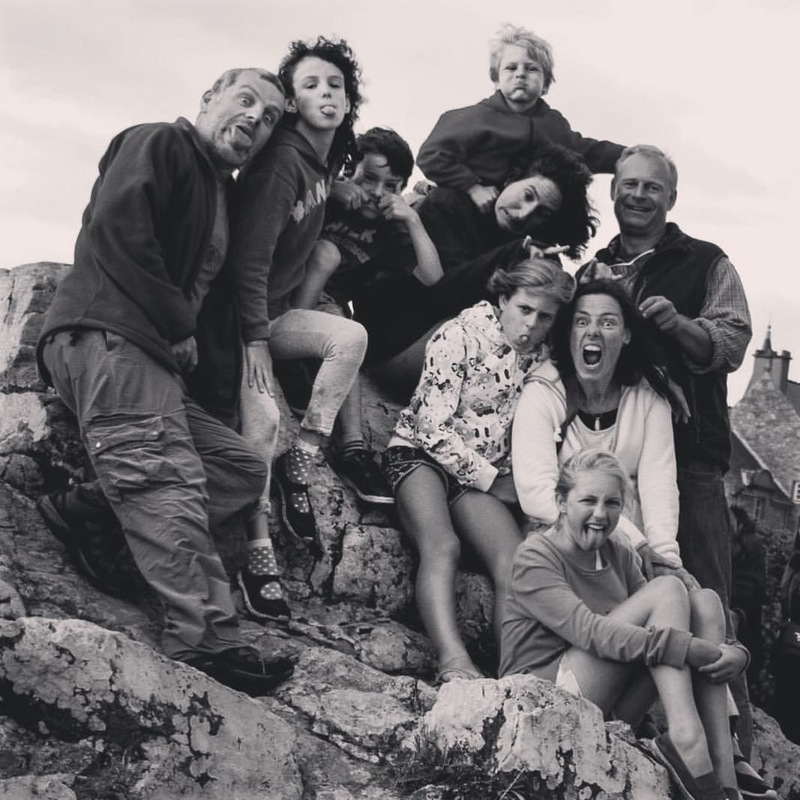 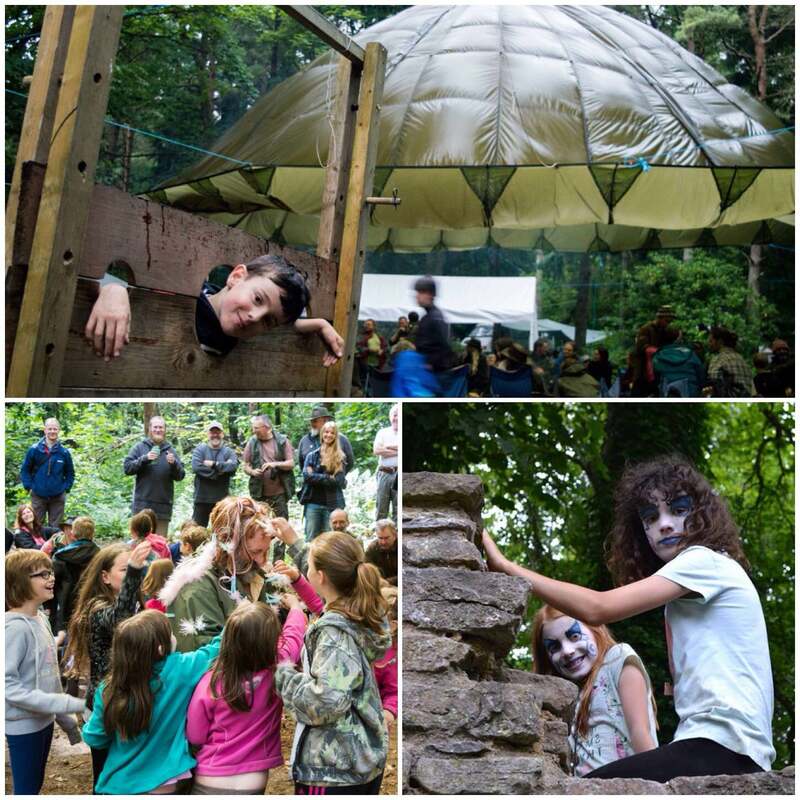 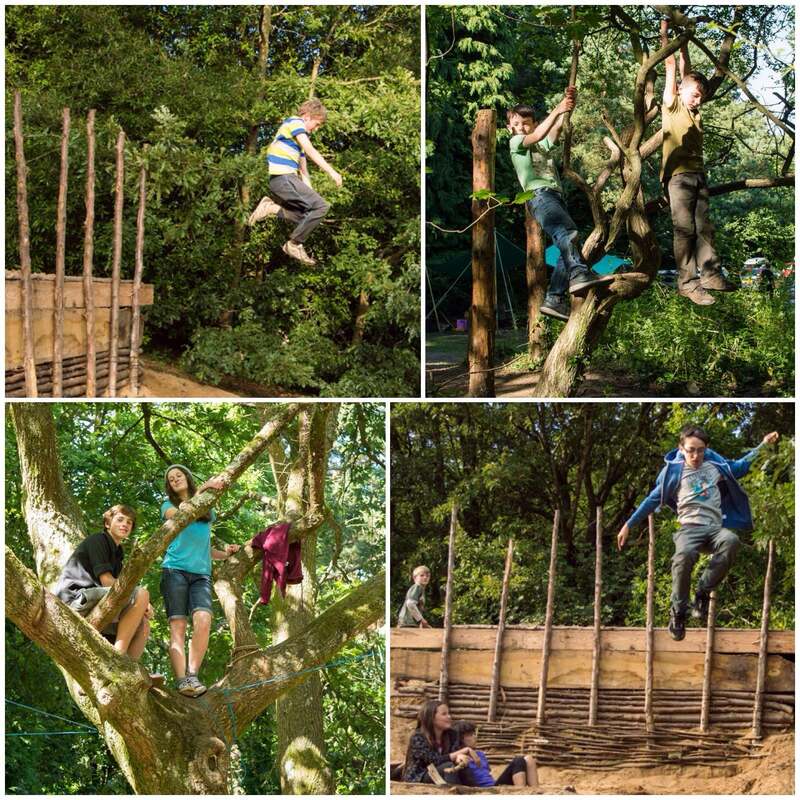 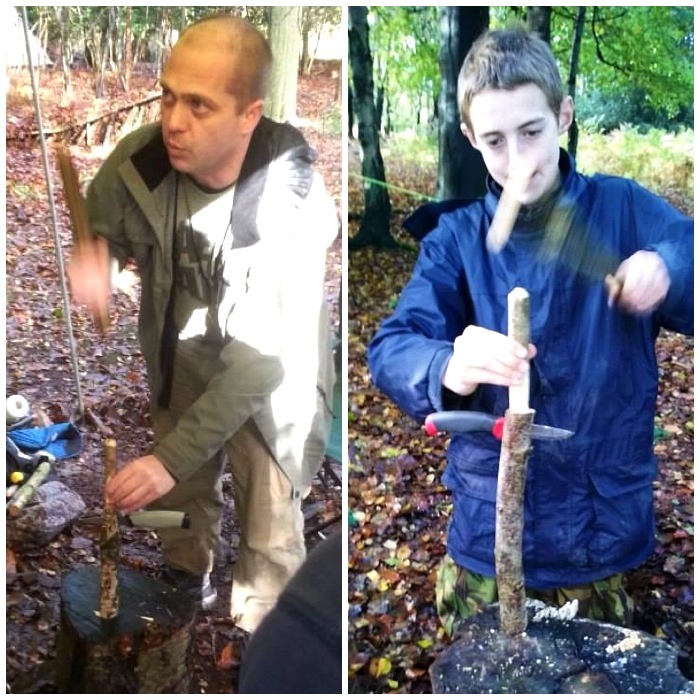 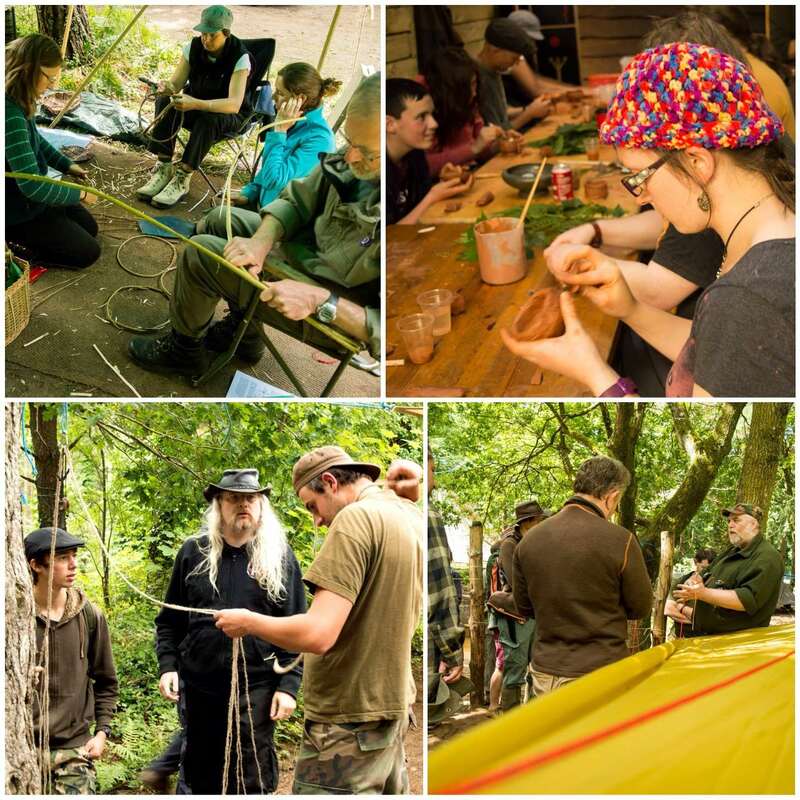 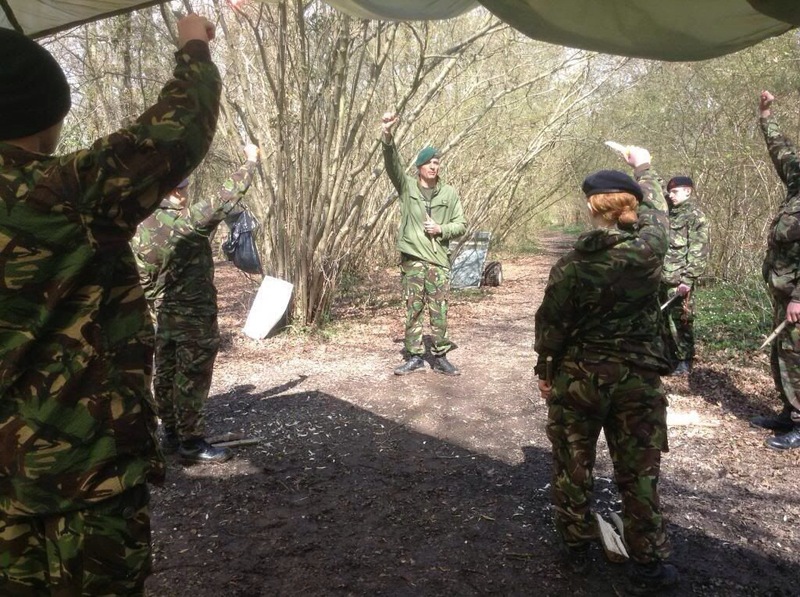 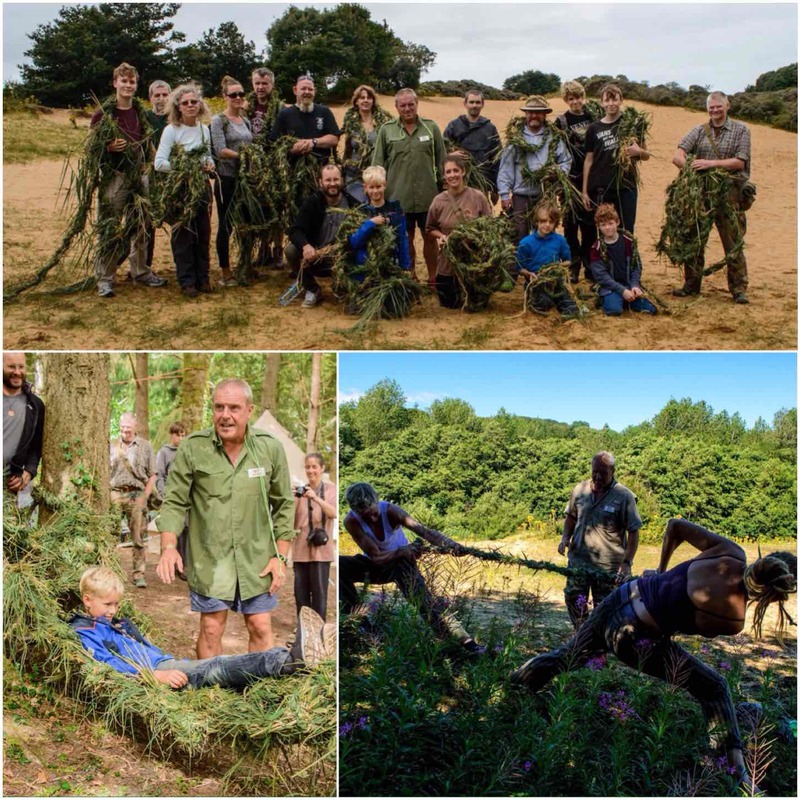 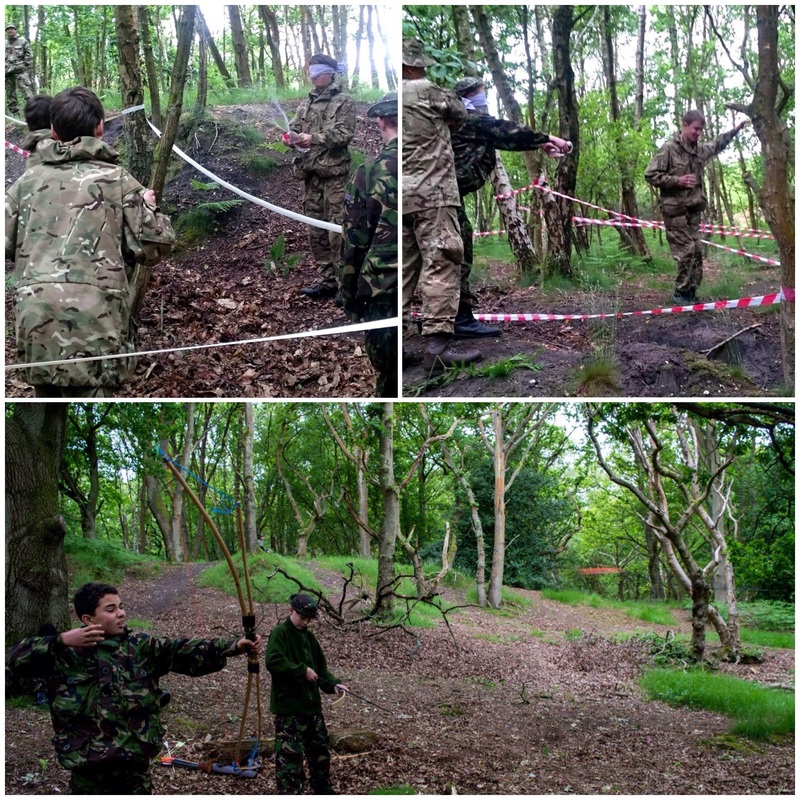 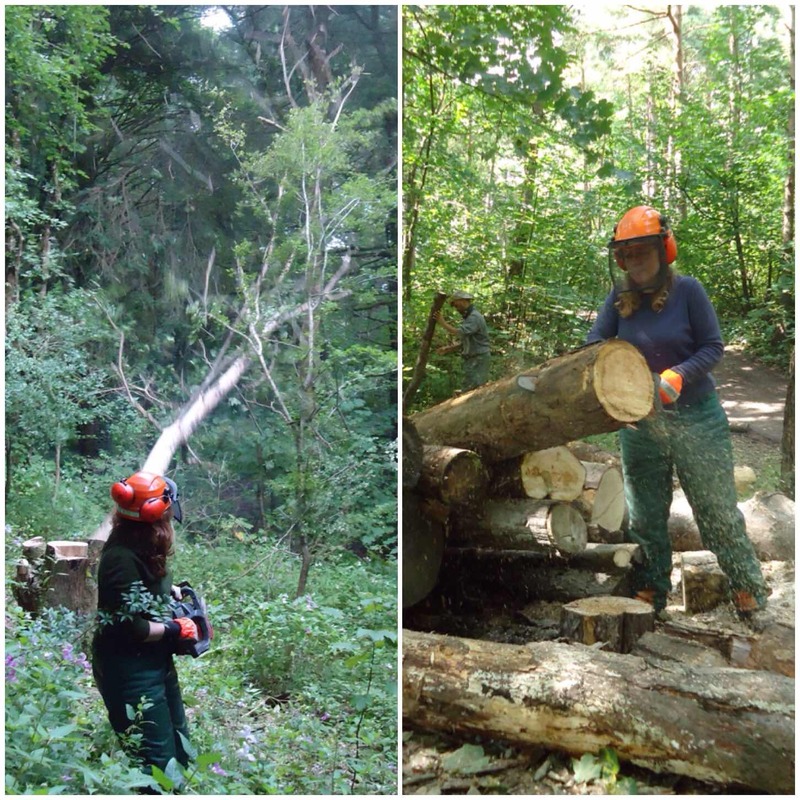 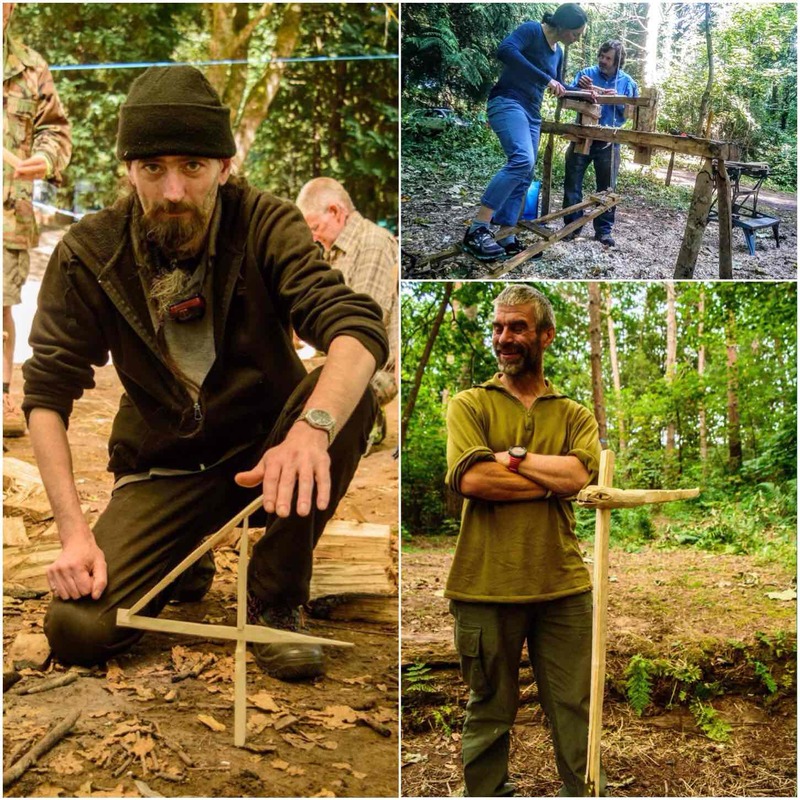 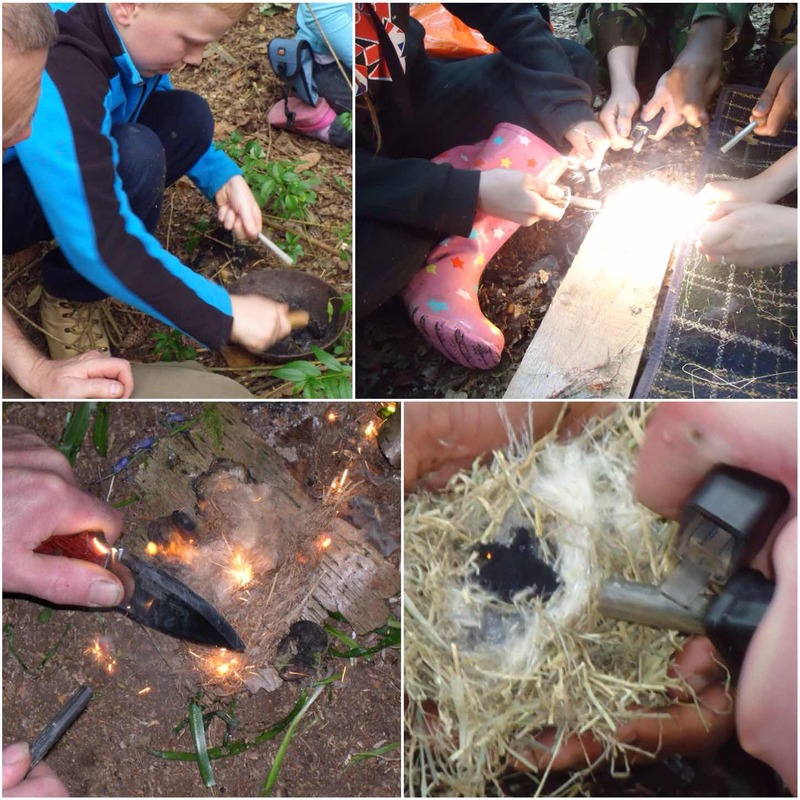 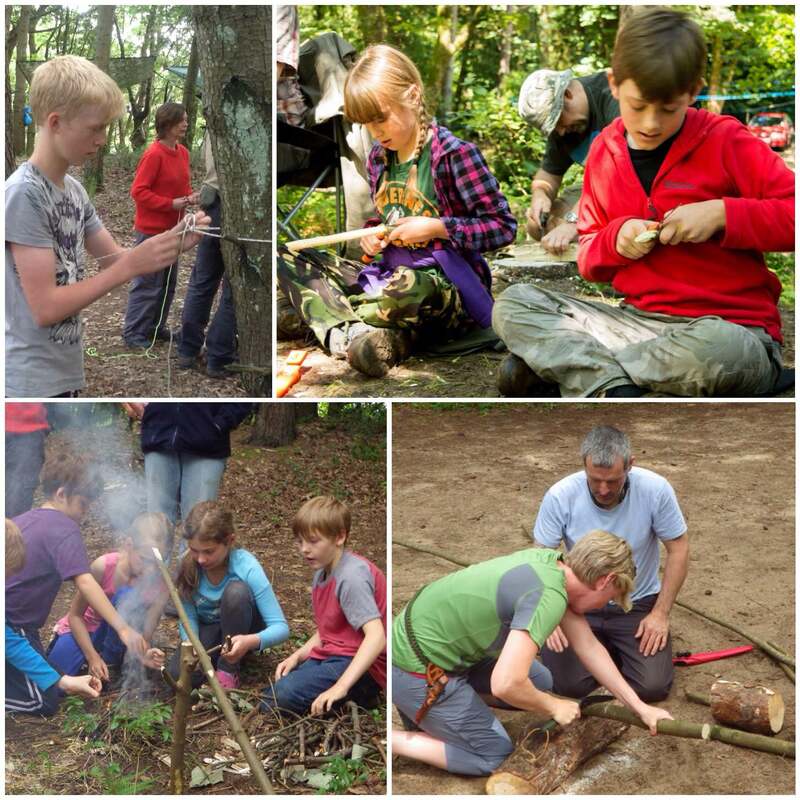 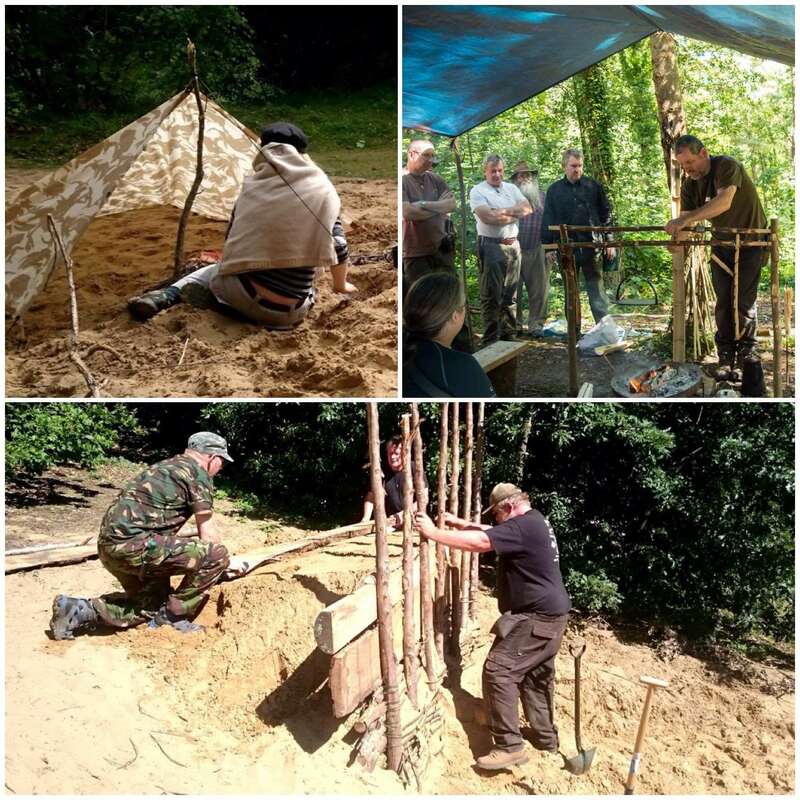 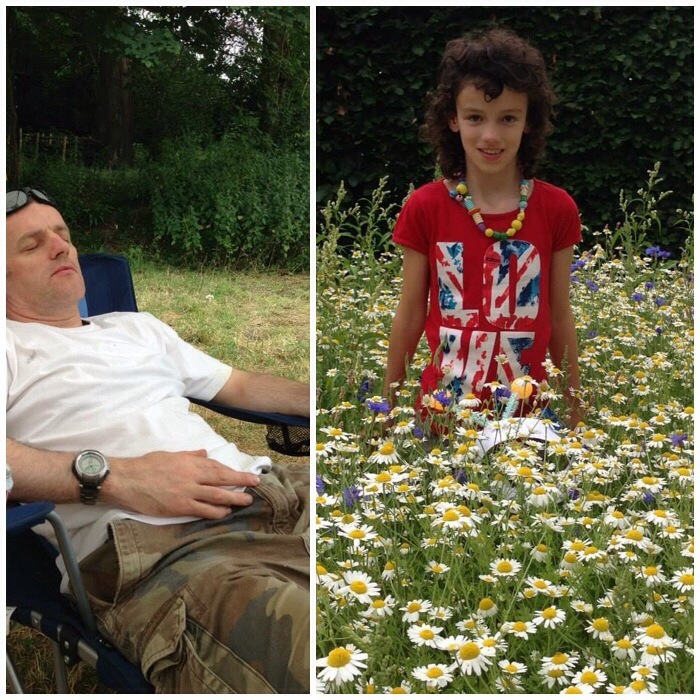 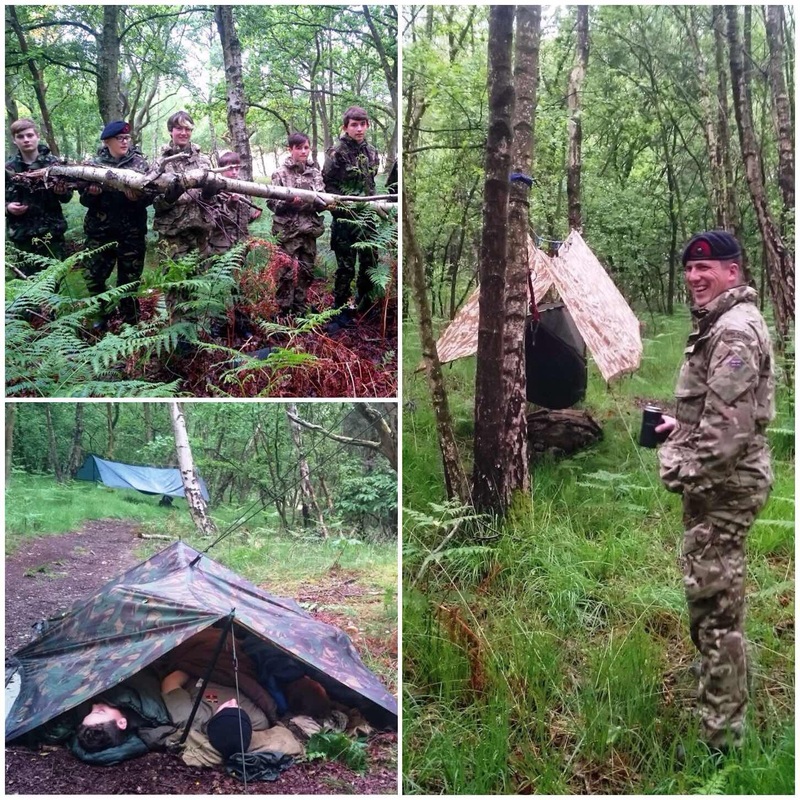 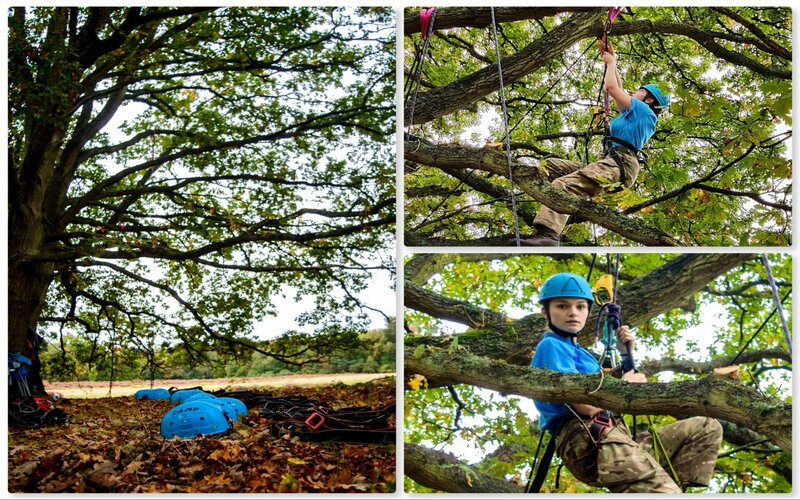 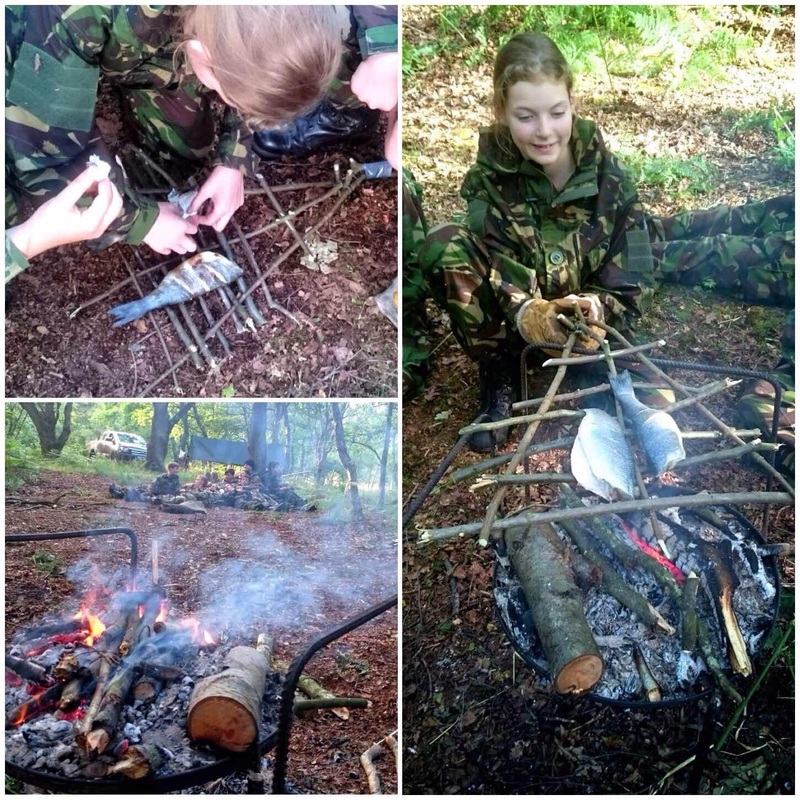 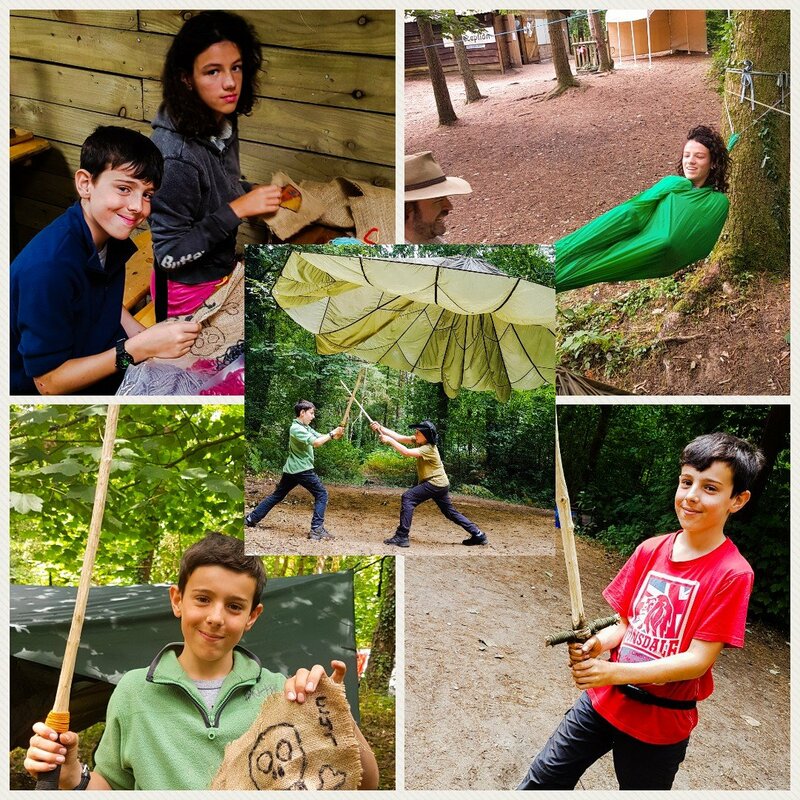 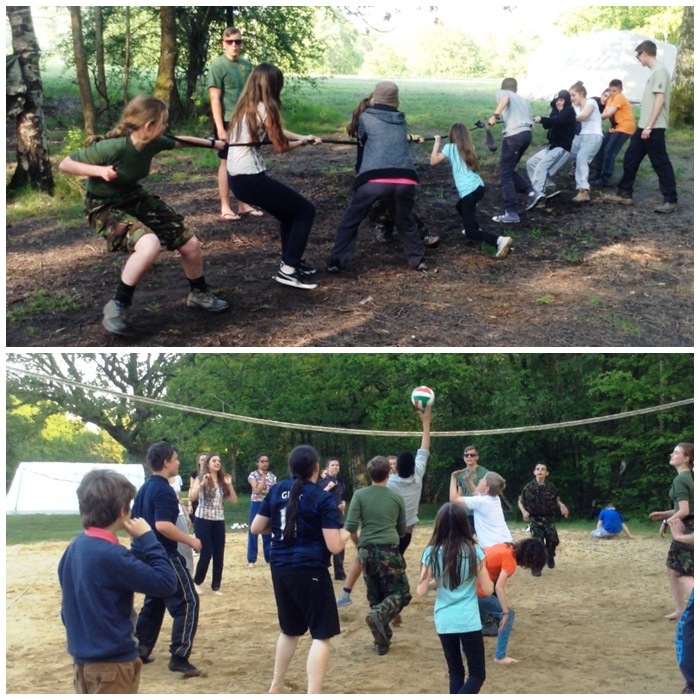 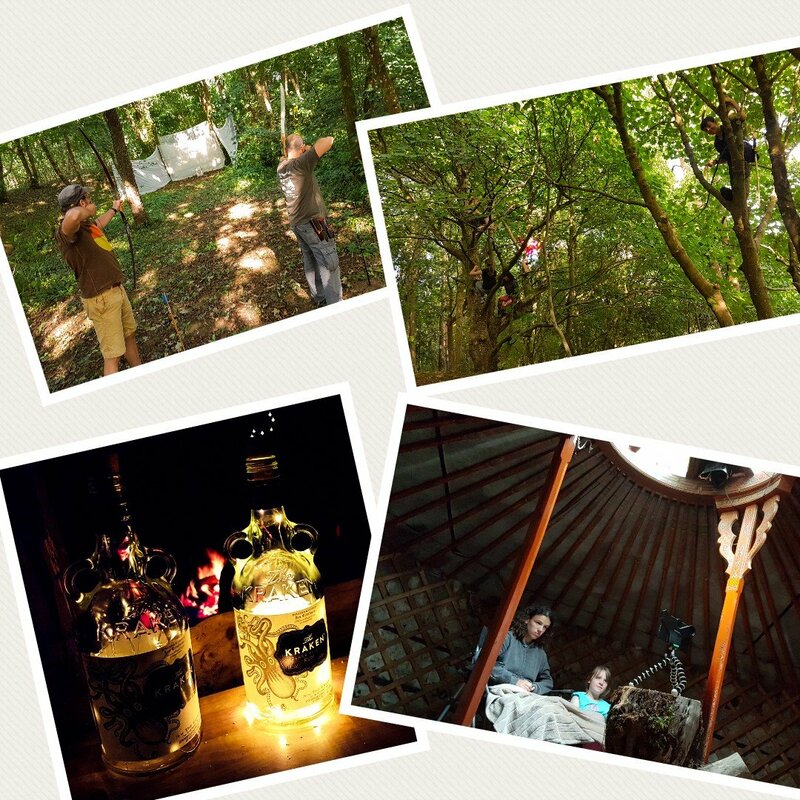 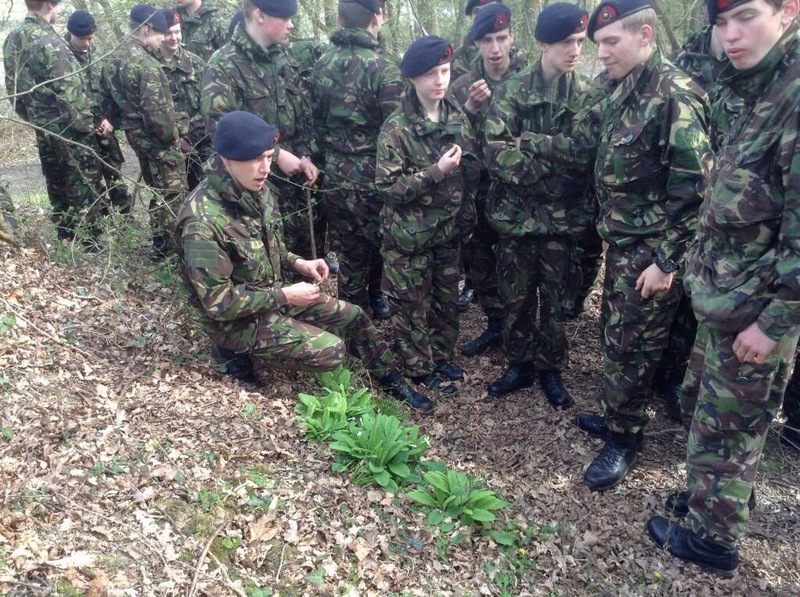 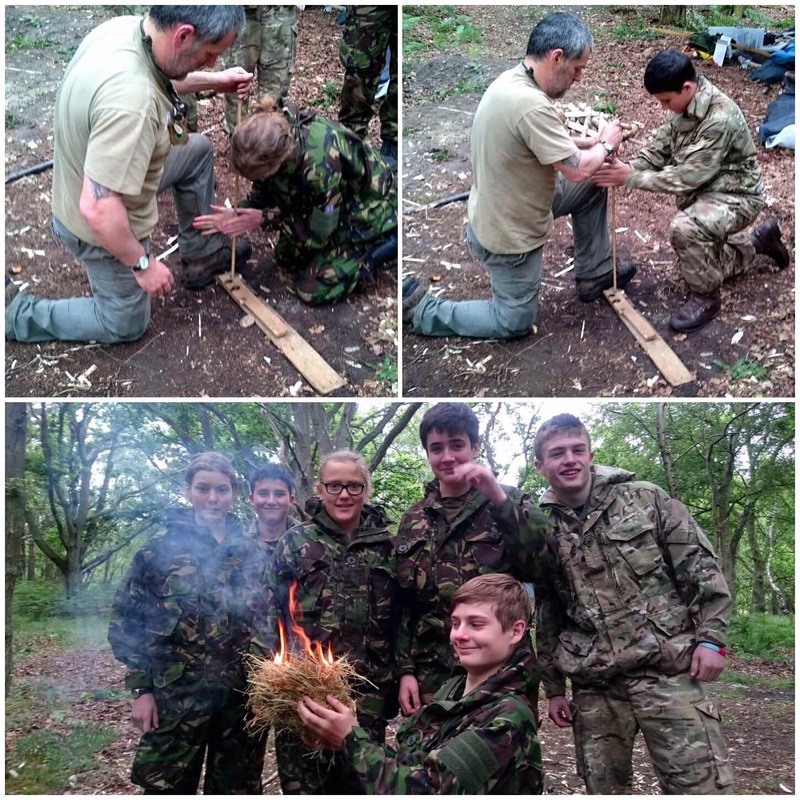 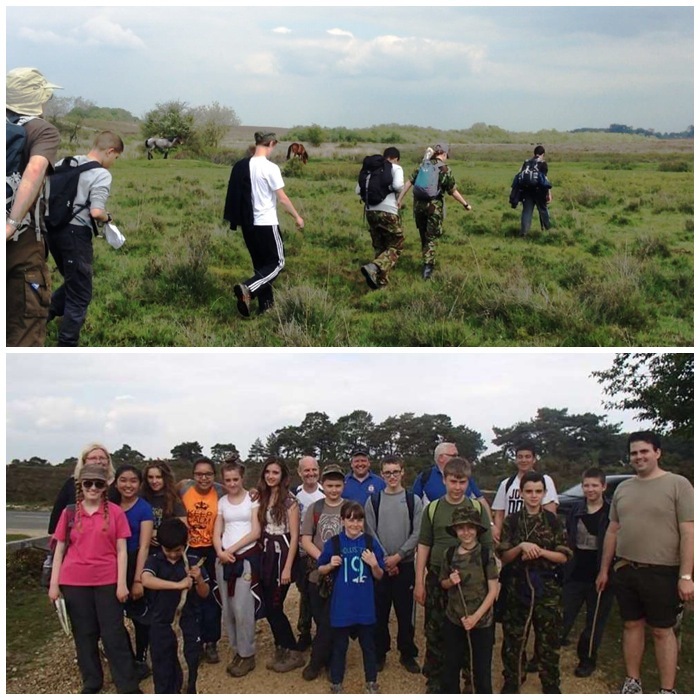 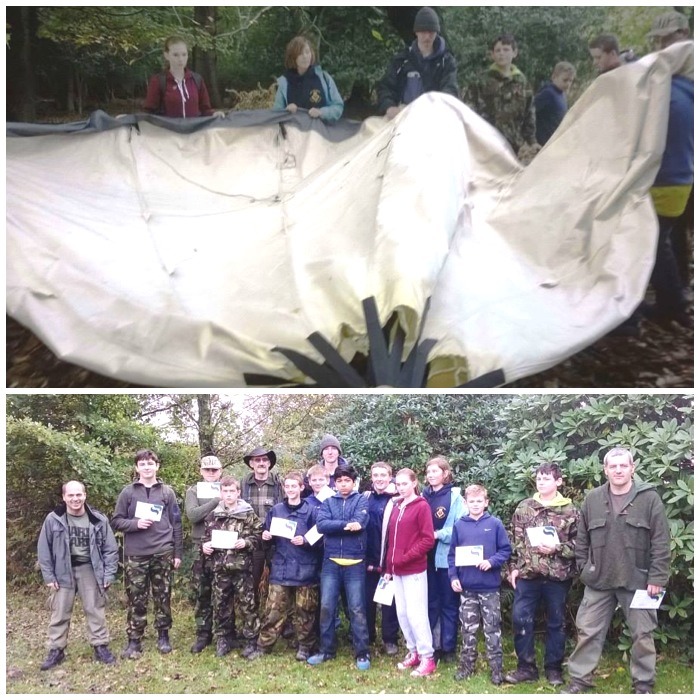 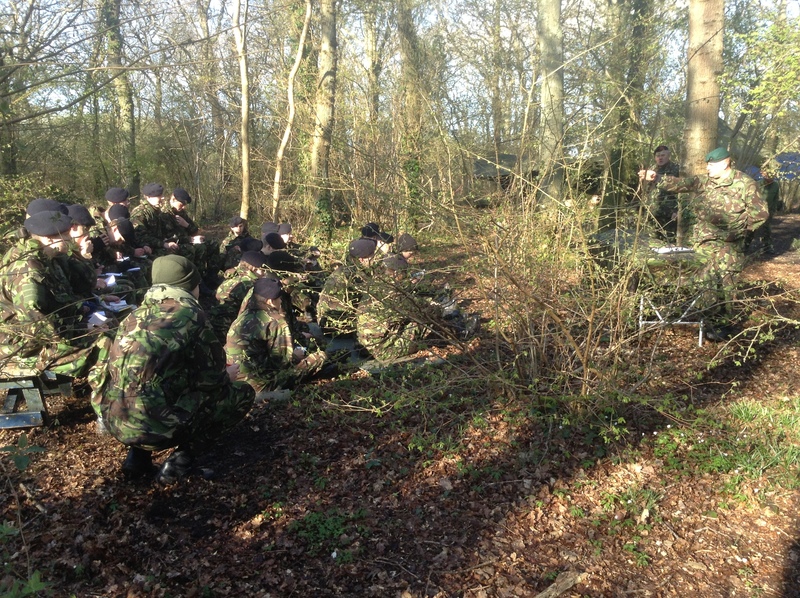 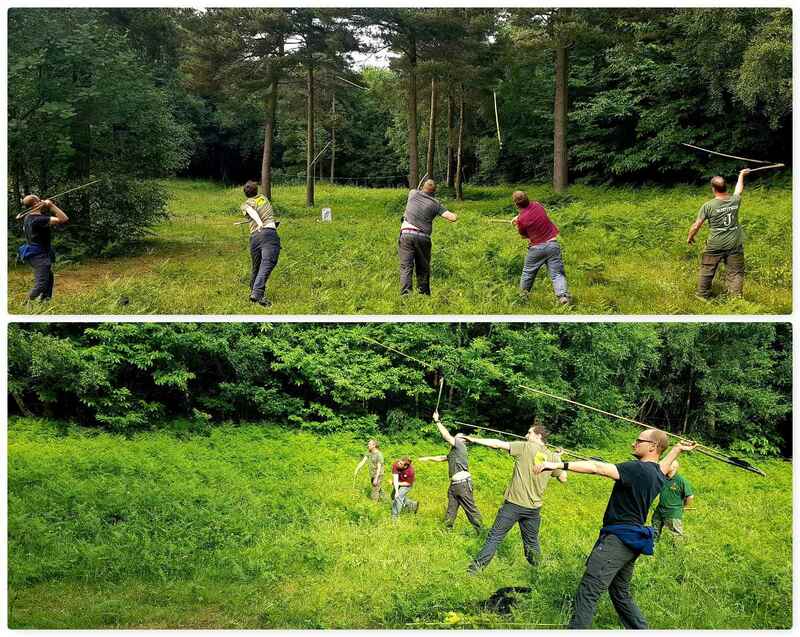 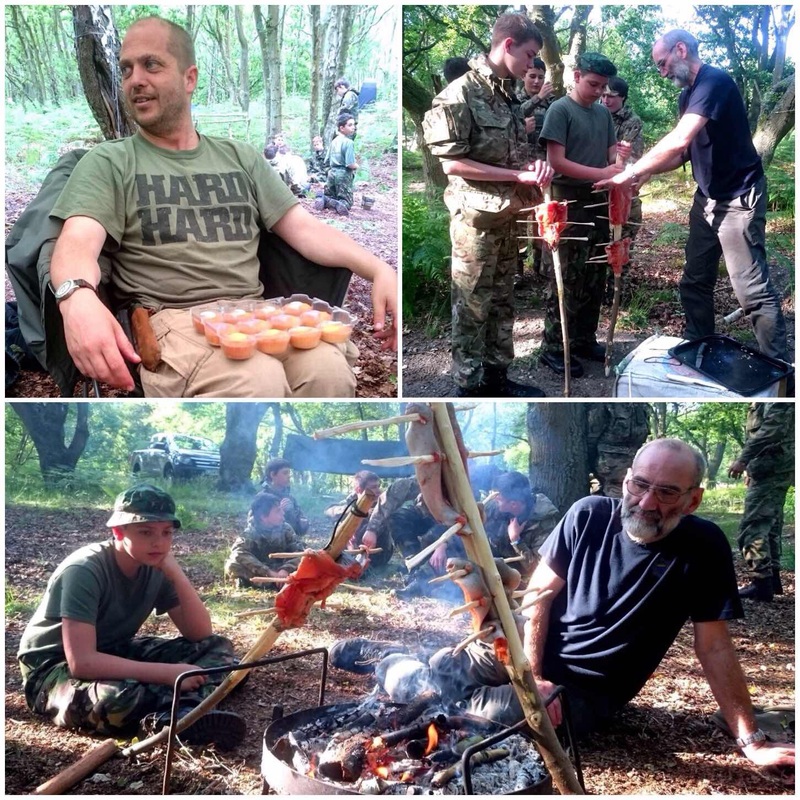 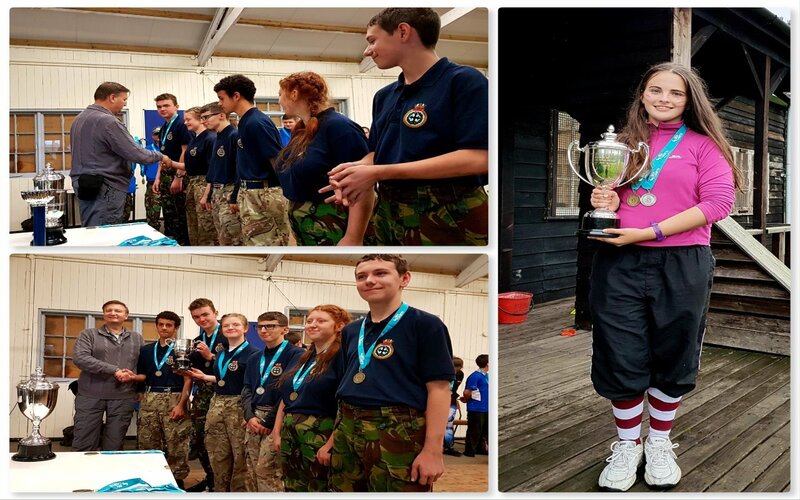 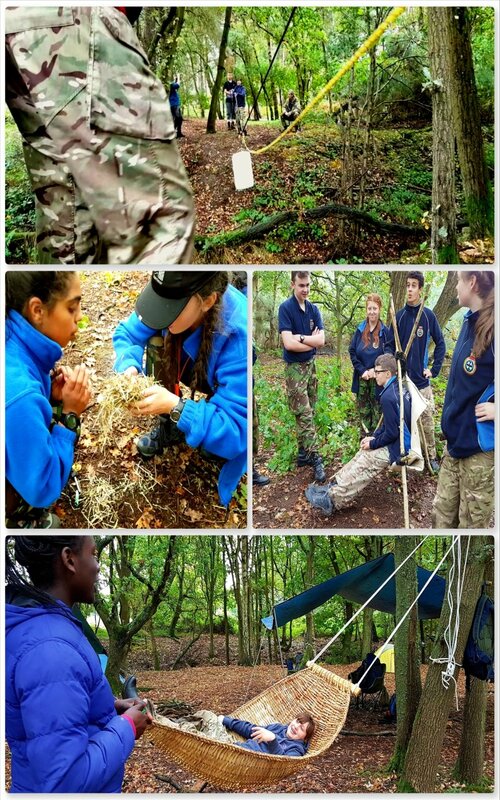 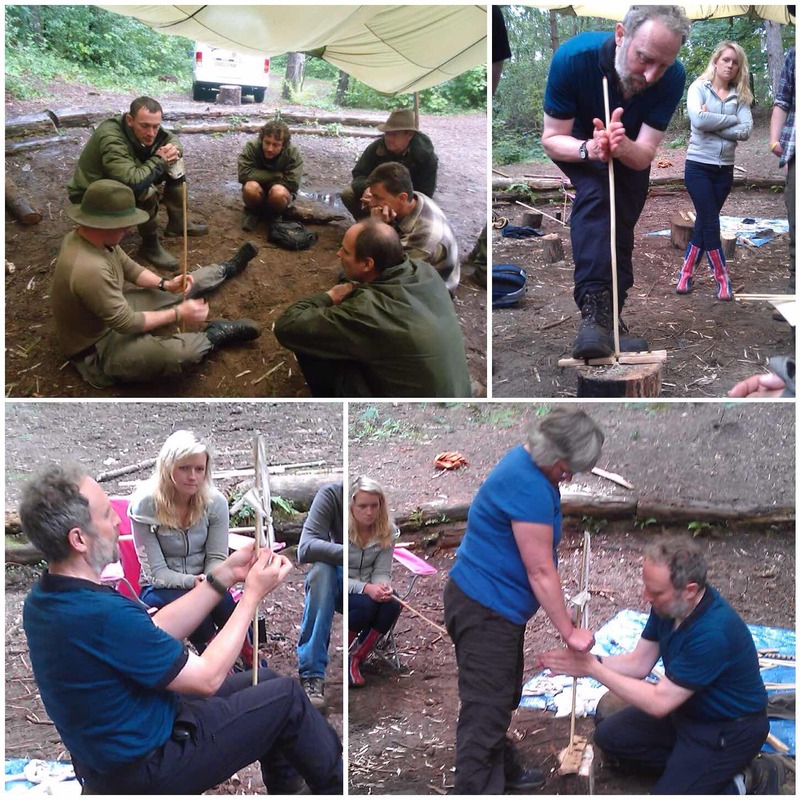 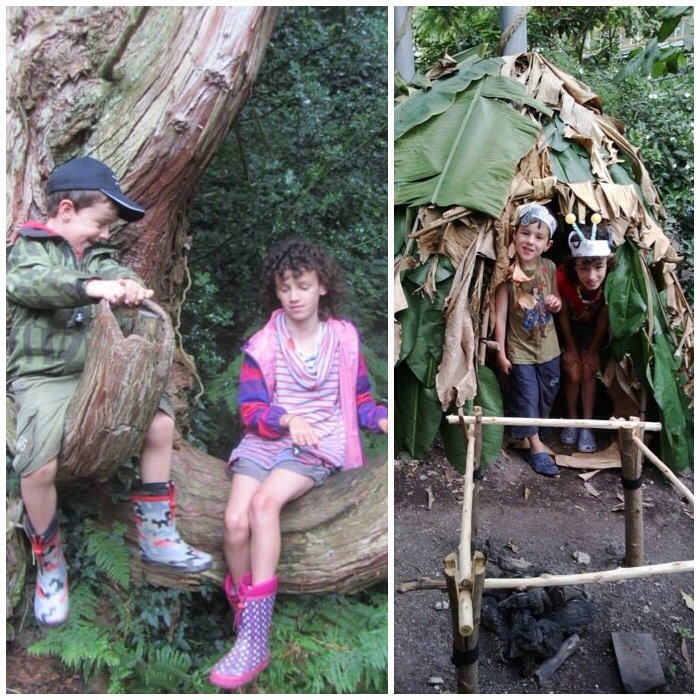 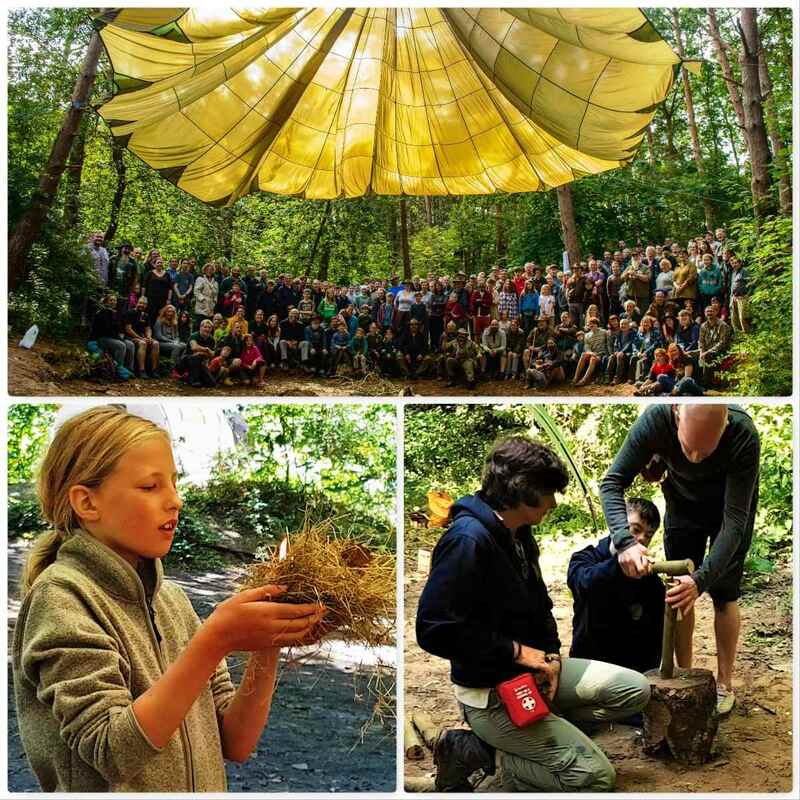 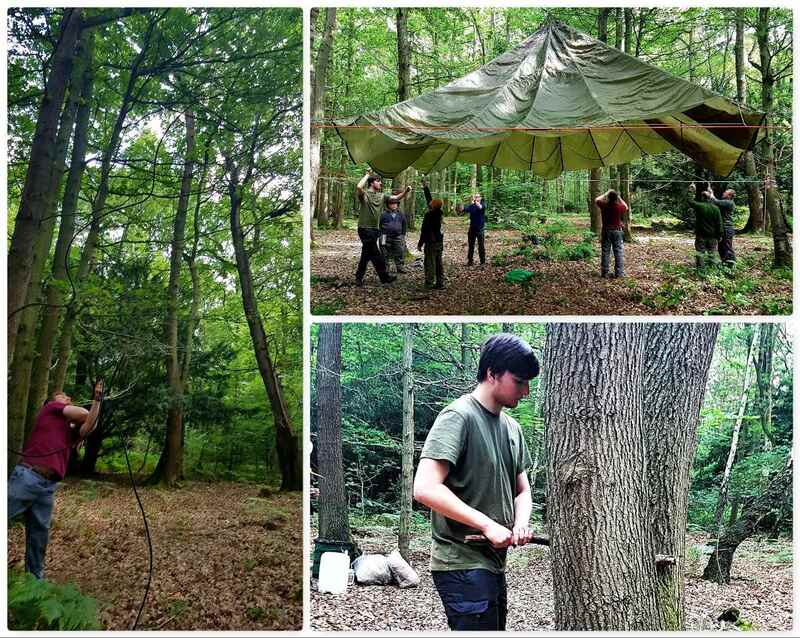 The cadets knuckled down, worked hard, had great fun and made things comfy for themselves – that’s bushcrafting for you. 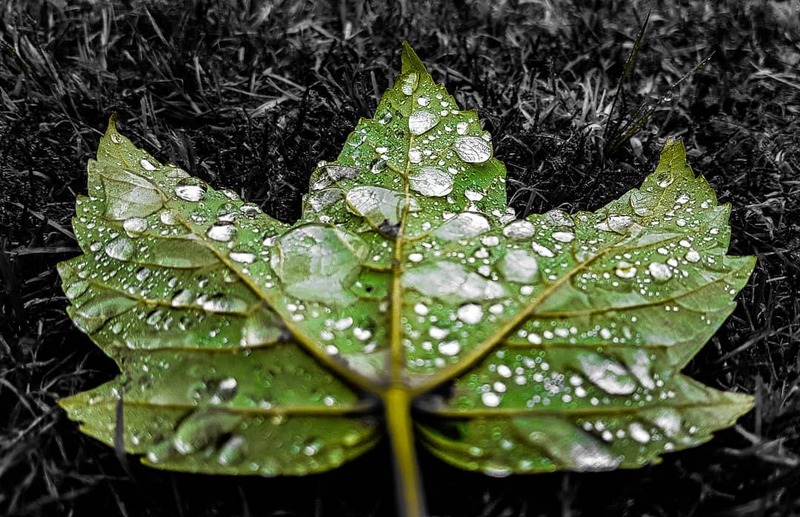 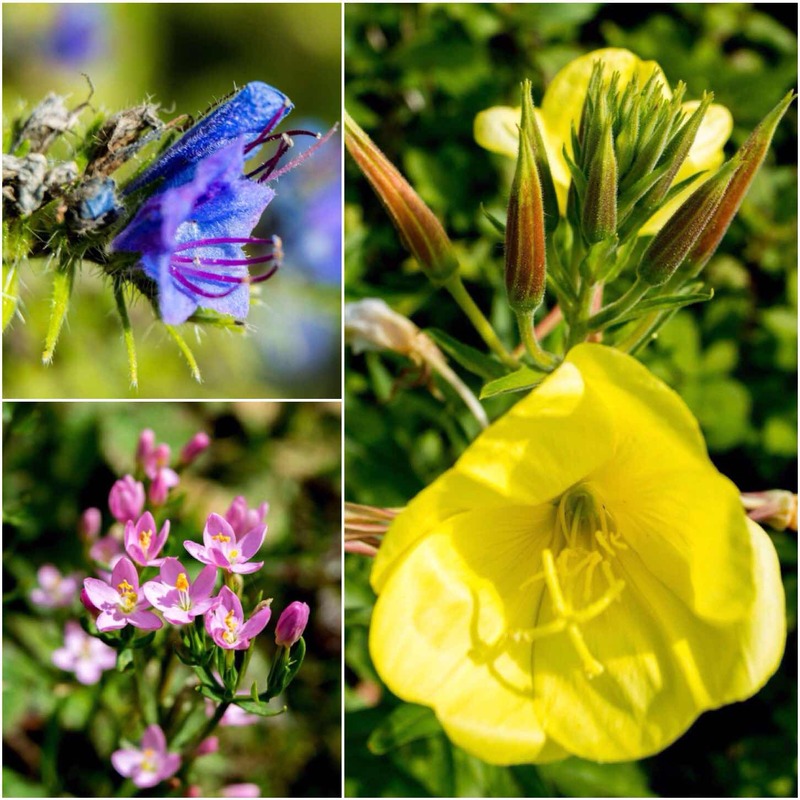 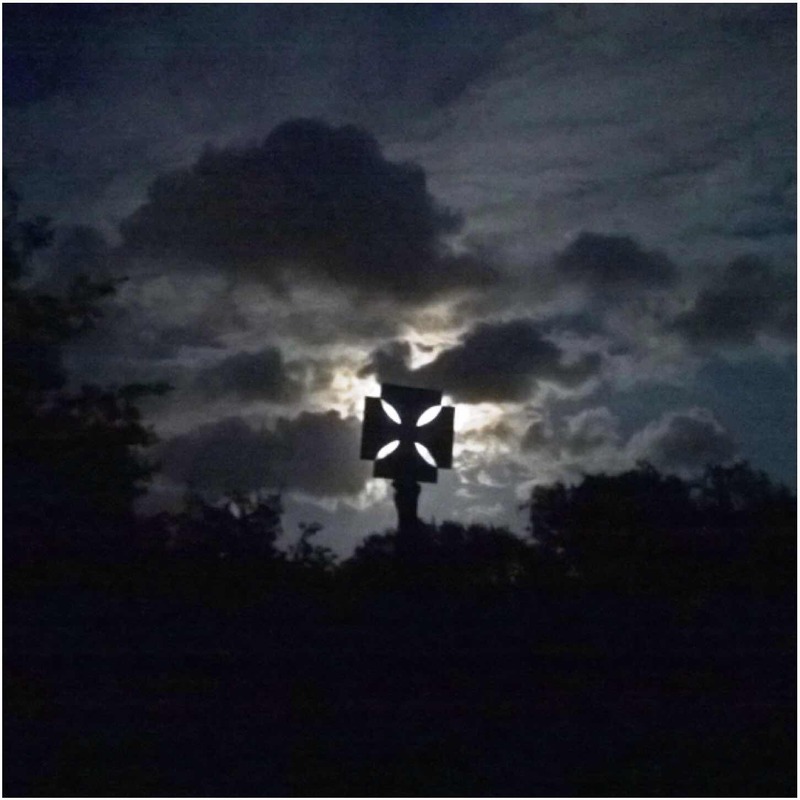 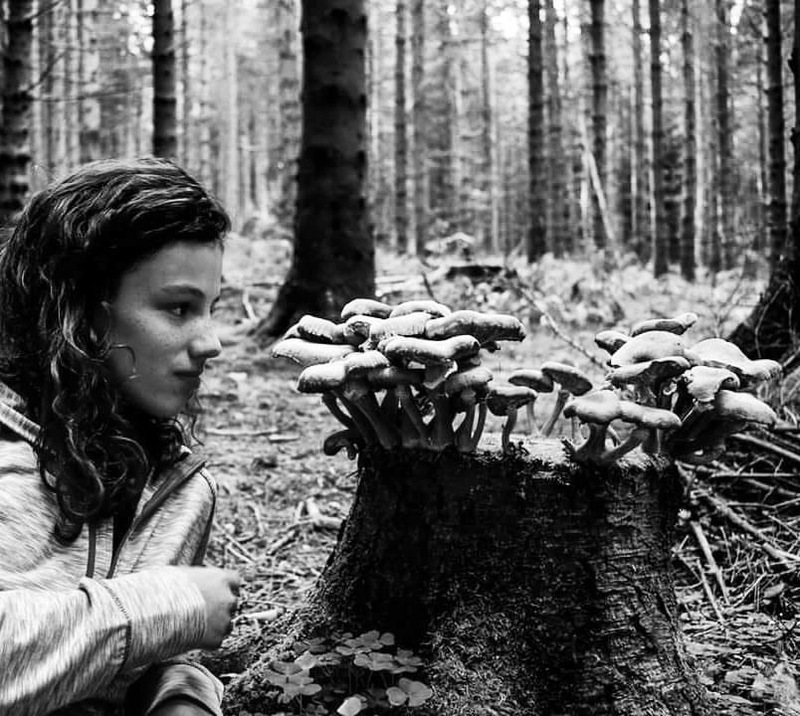 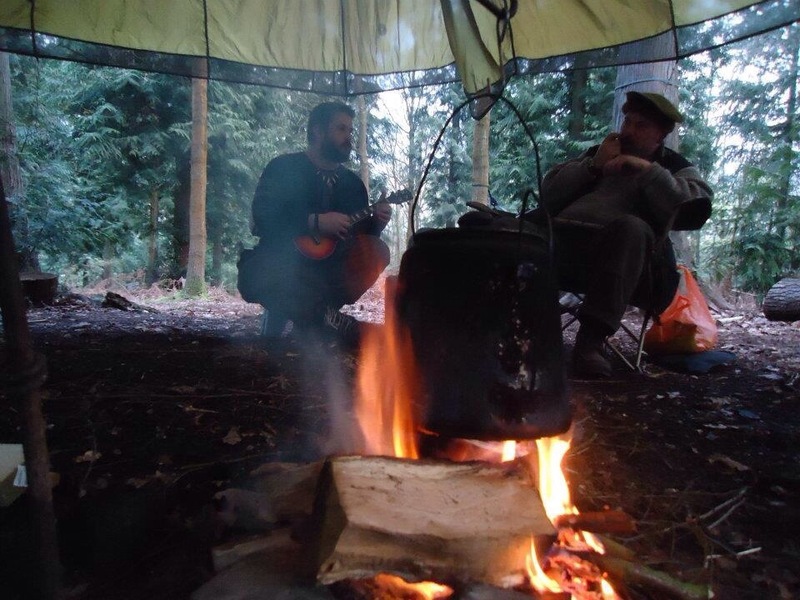 The end of October last year found me down at Crowborough Army camp in the Ashdown Forest. 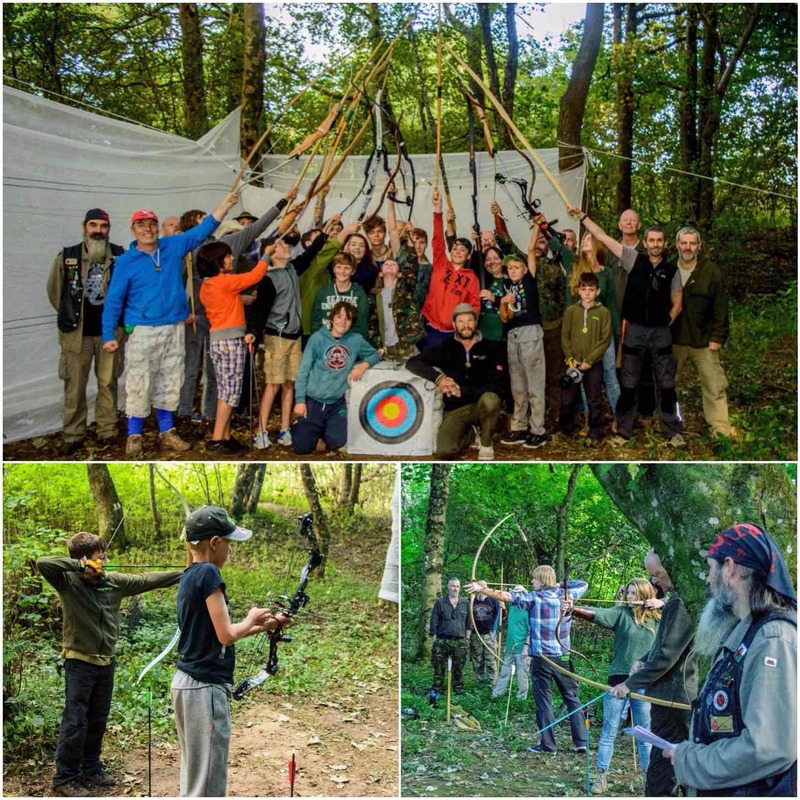 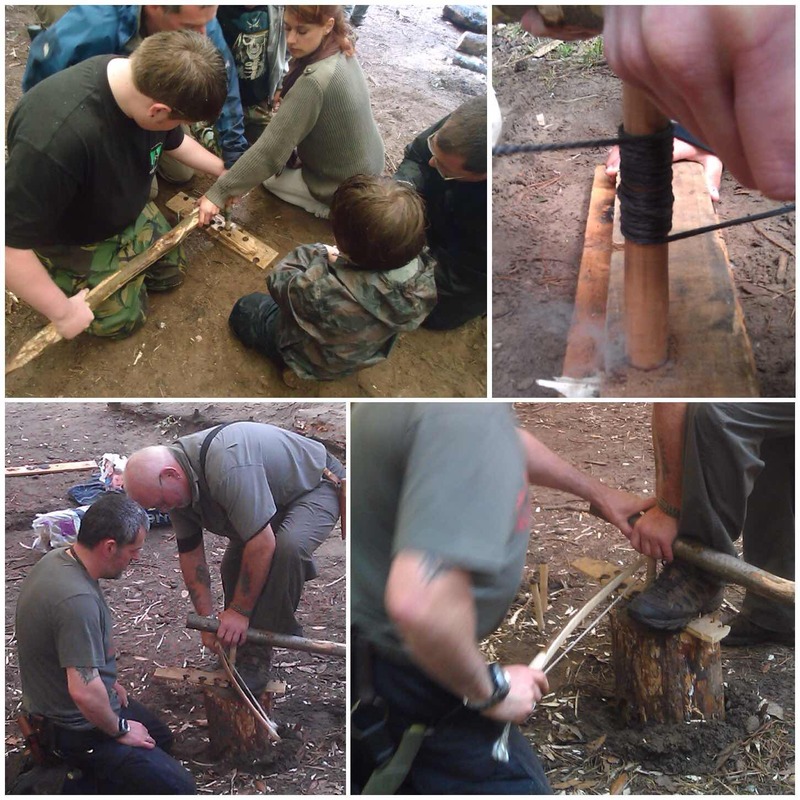 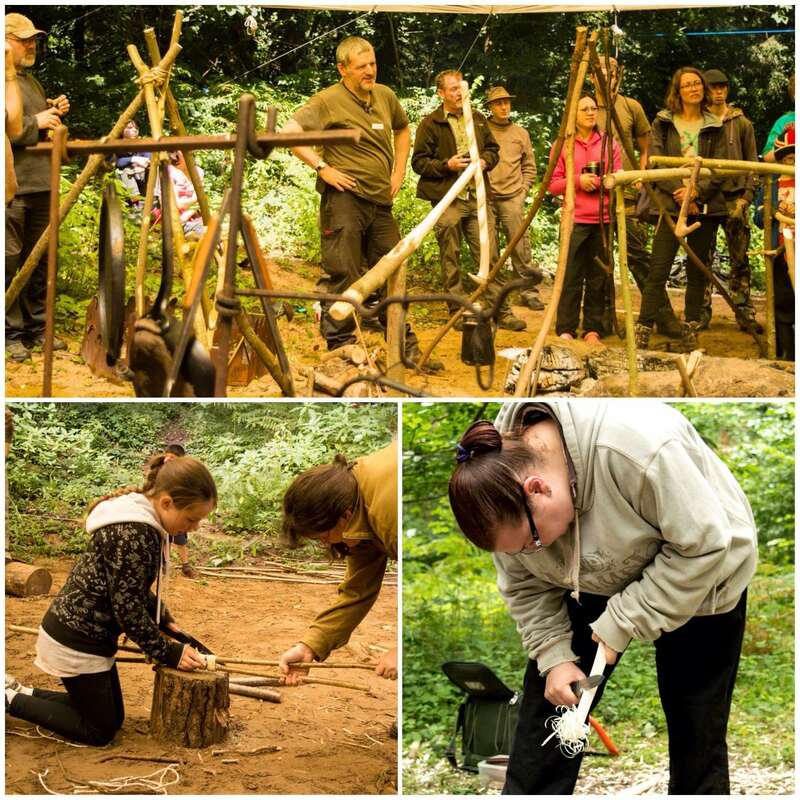 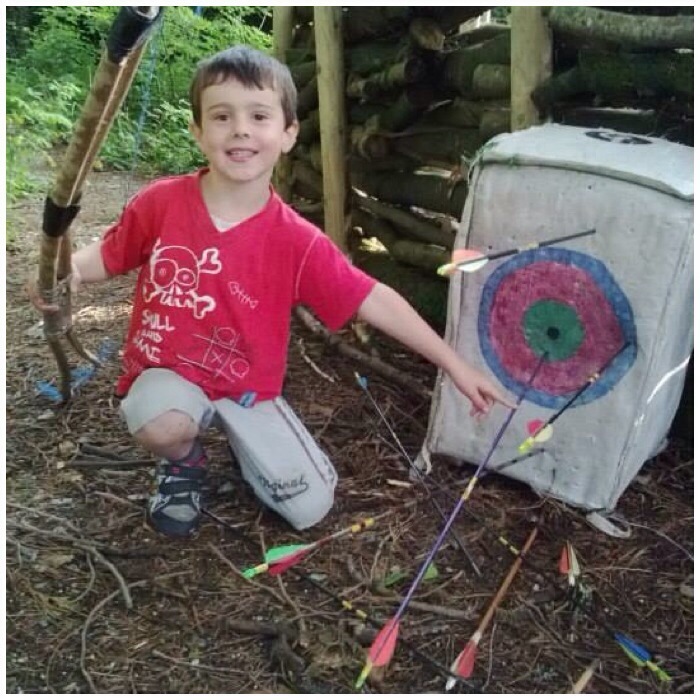 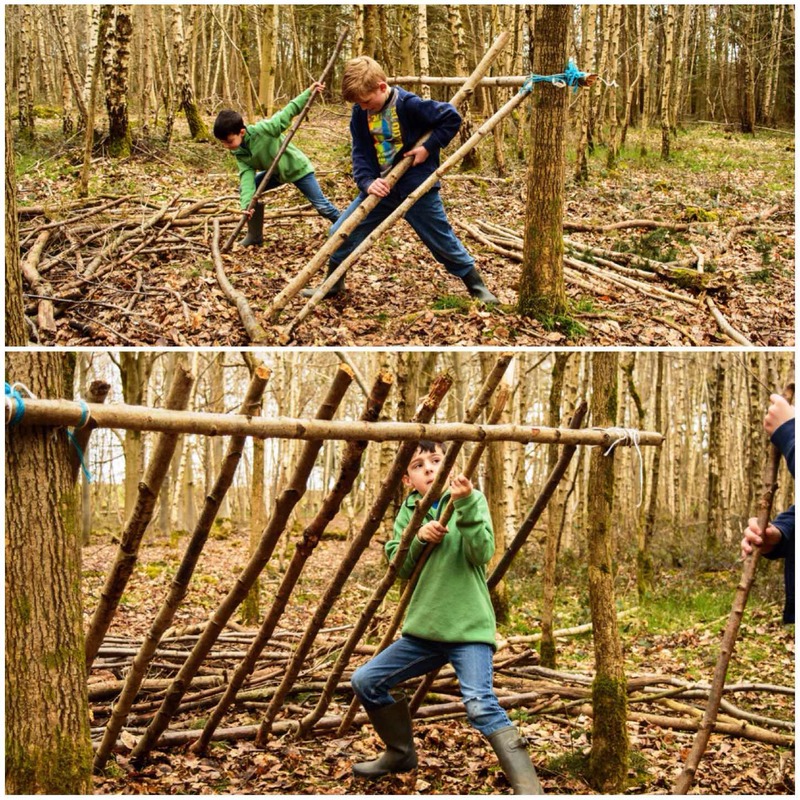 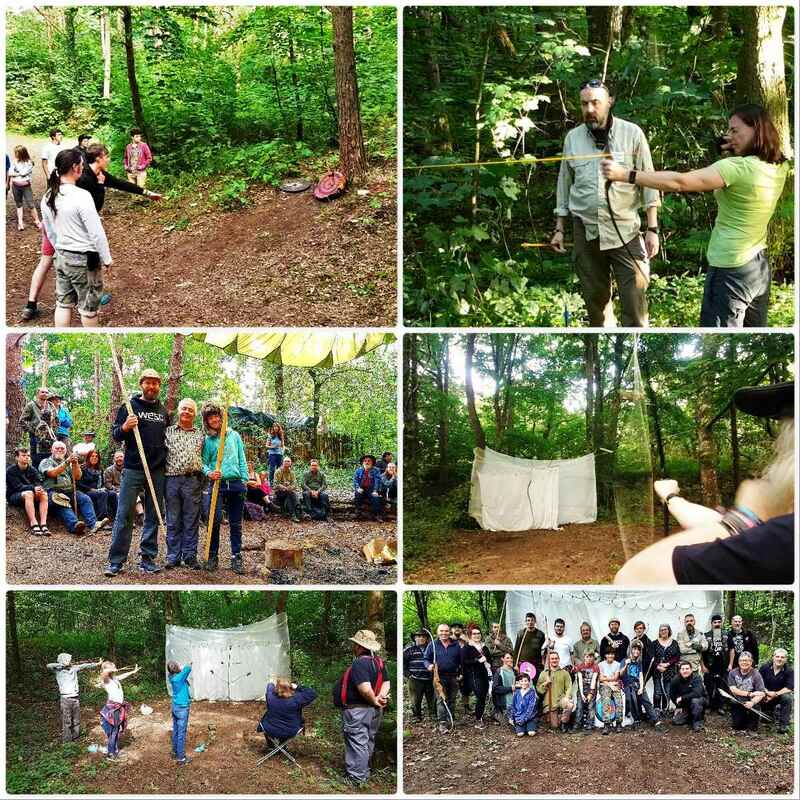 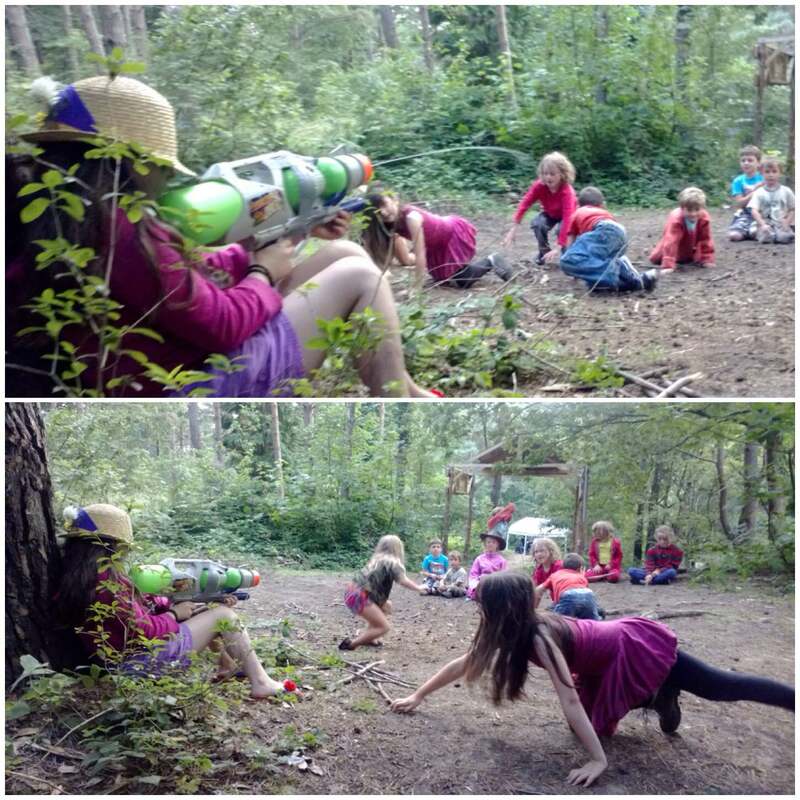 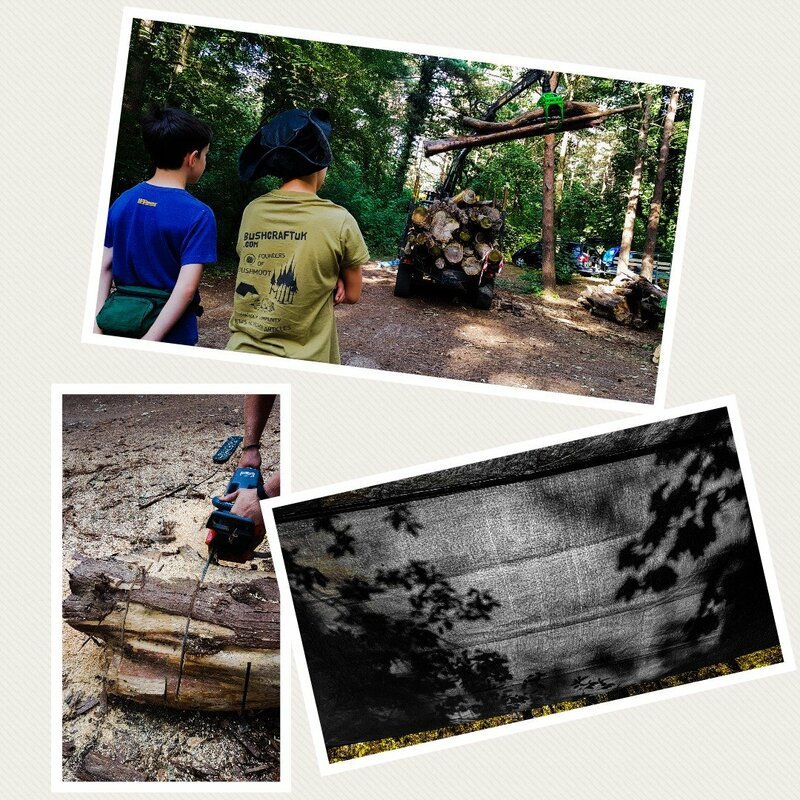 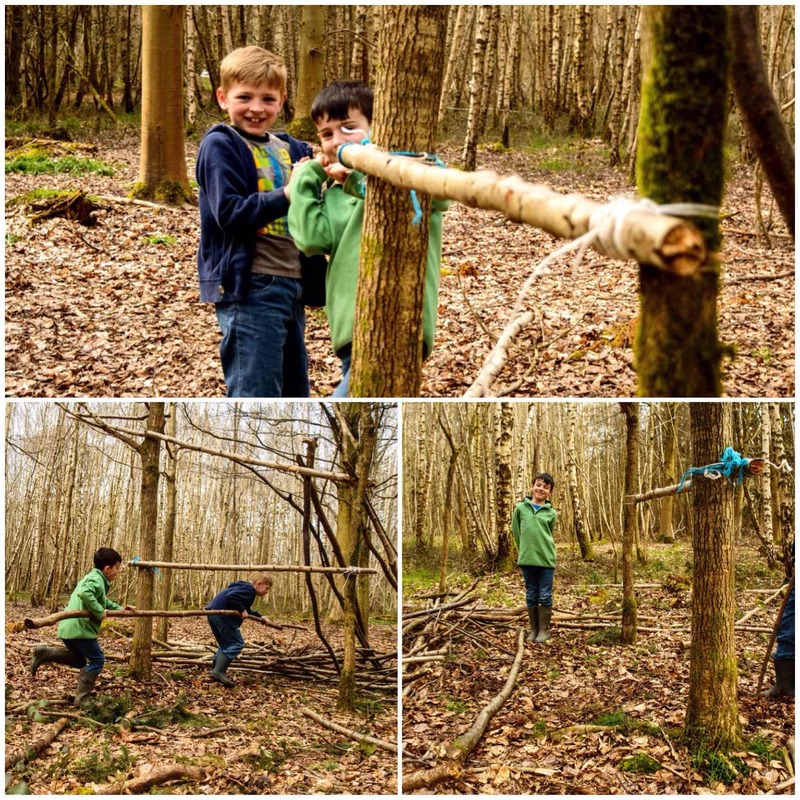 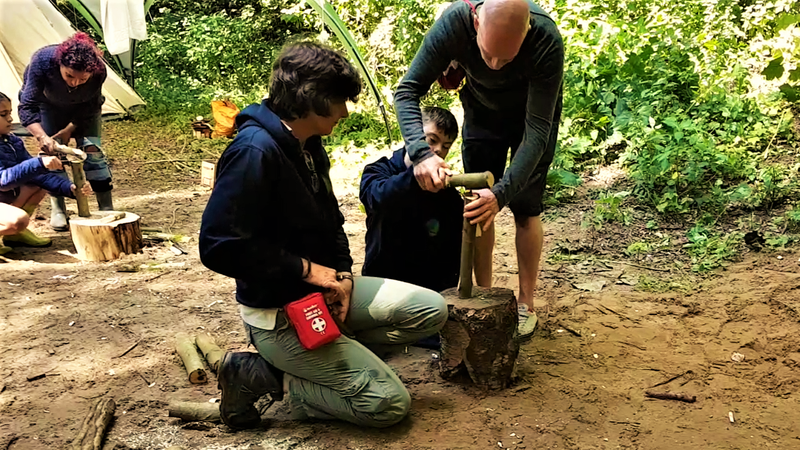 I set up a bushcraft area in the woods near for the camp to run a course to introduce some of our younger Sea Cadets to bushcraft. 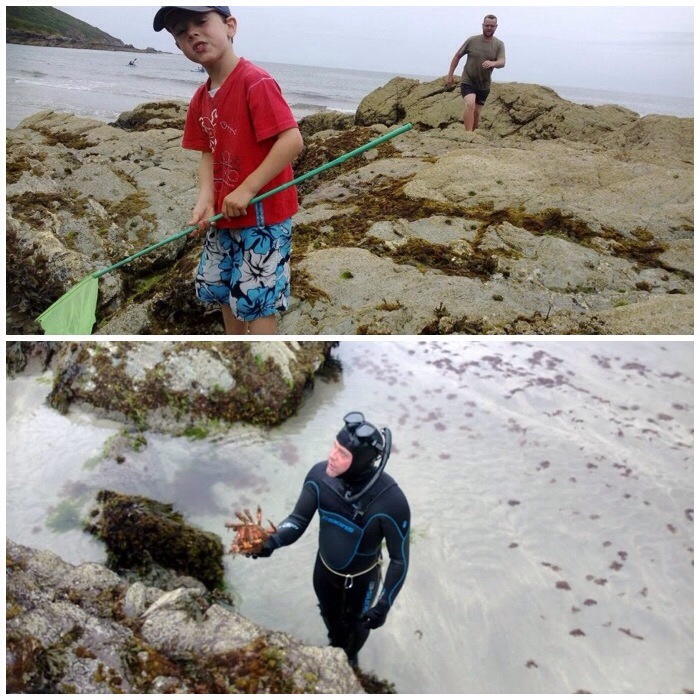 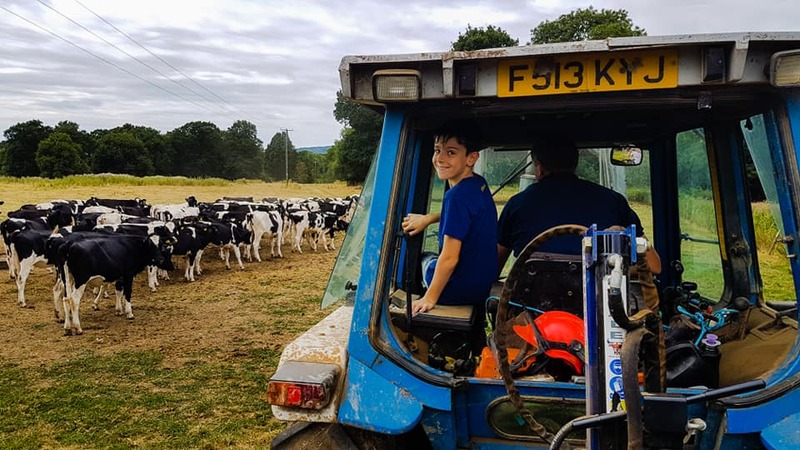 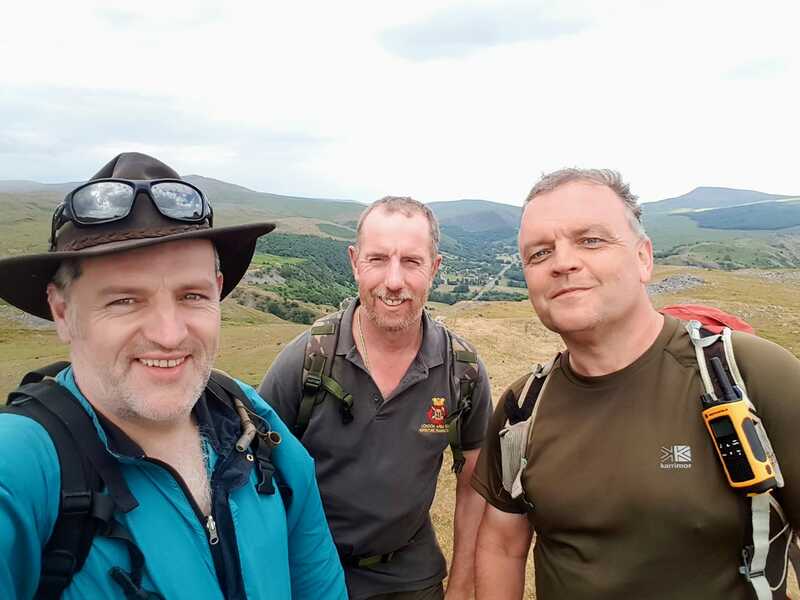 Helping me on the weekend were Dave Lewis and Charlie Brookes (and at different times Christine Weston and Emma Deasy). 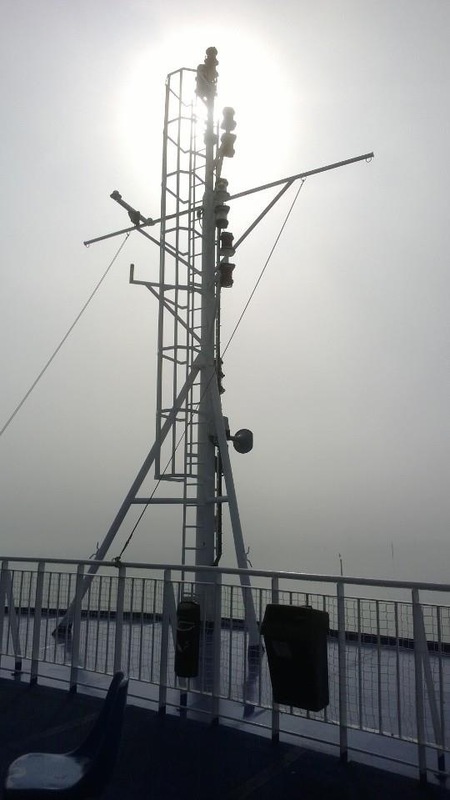 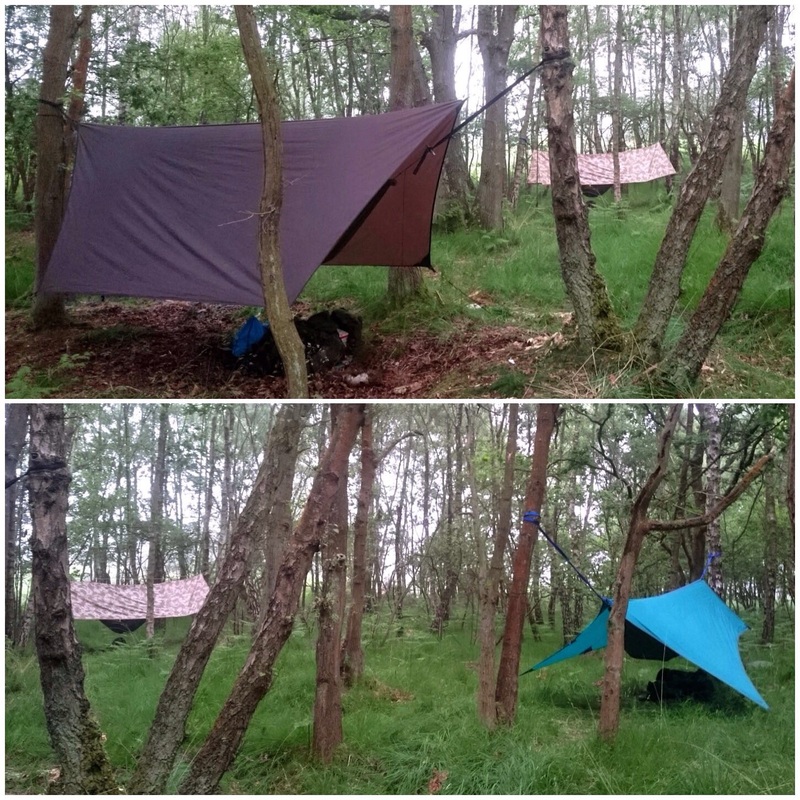 The weekend’s weather was pretty poor to say the least with a lot of rain and some quite high winds. 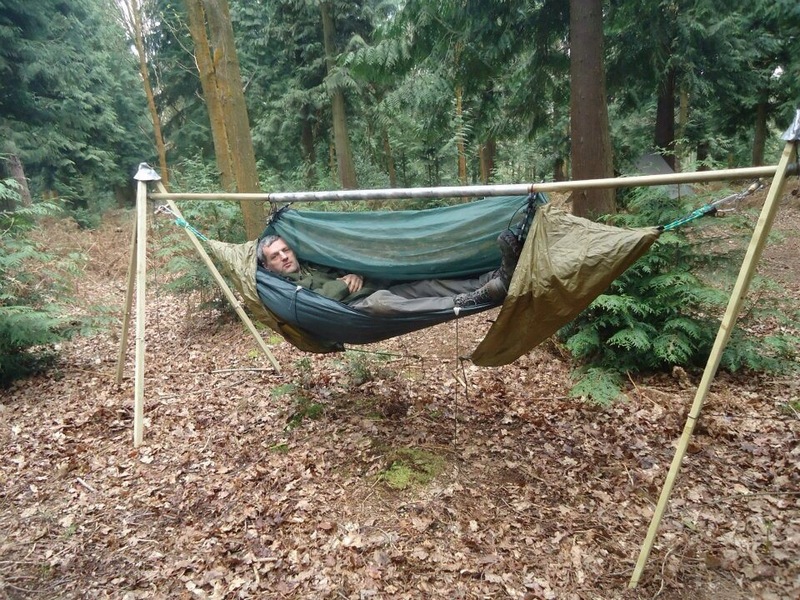 The high winds were a concern for me so I told the cadets that sleeping in hammocks over the weekend was not an option. 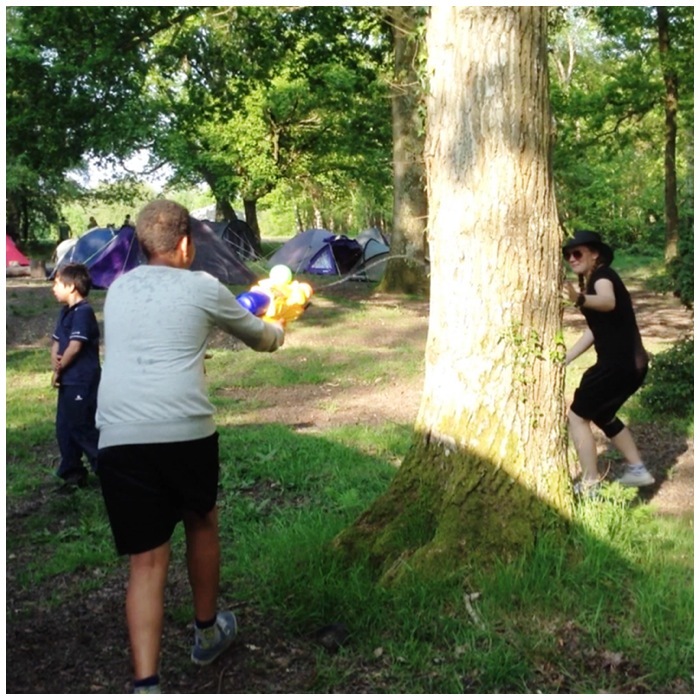 A few were upset but soon got on with things. 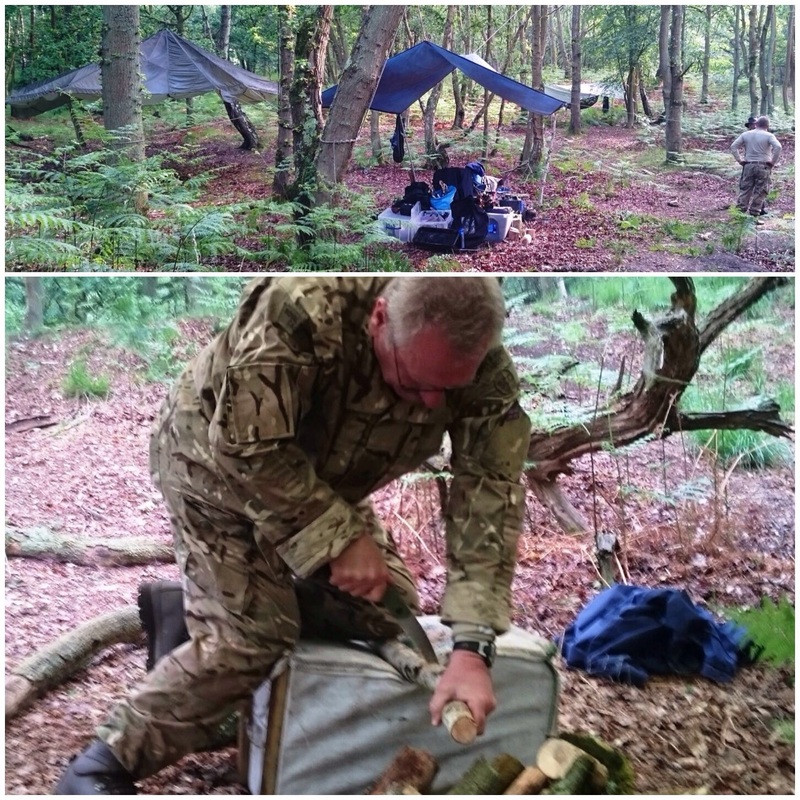 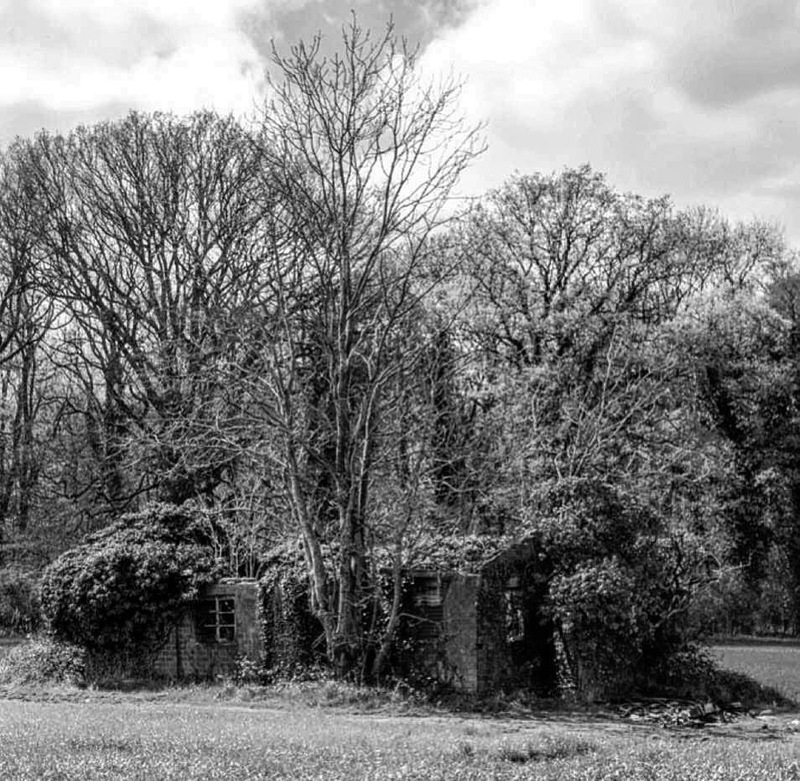 The cadets ended up sleeping in their tents in the grounds of the main camp nowhere near any trees. 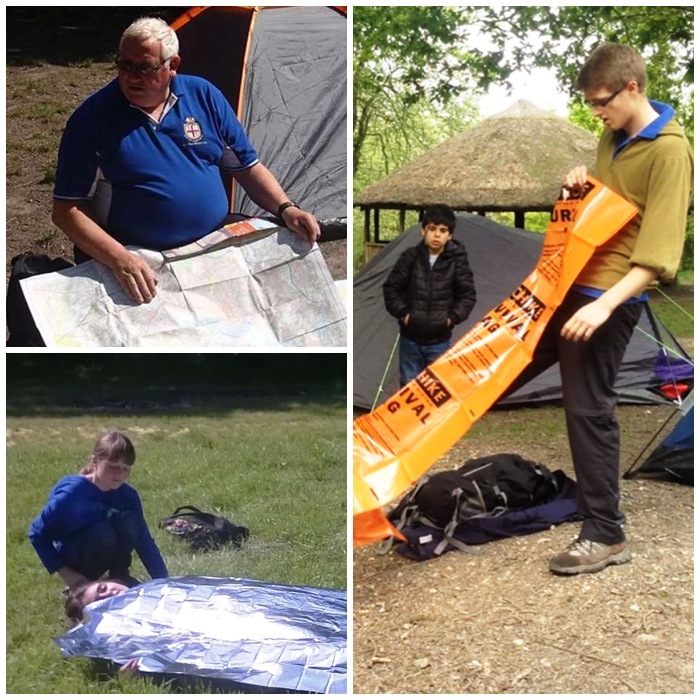 They had to set up the main tarps to work under, after a bit of instruction on knots they were left to their own devices and managed to get two big tarps up by themselves. 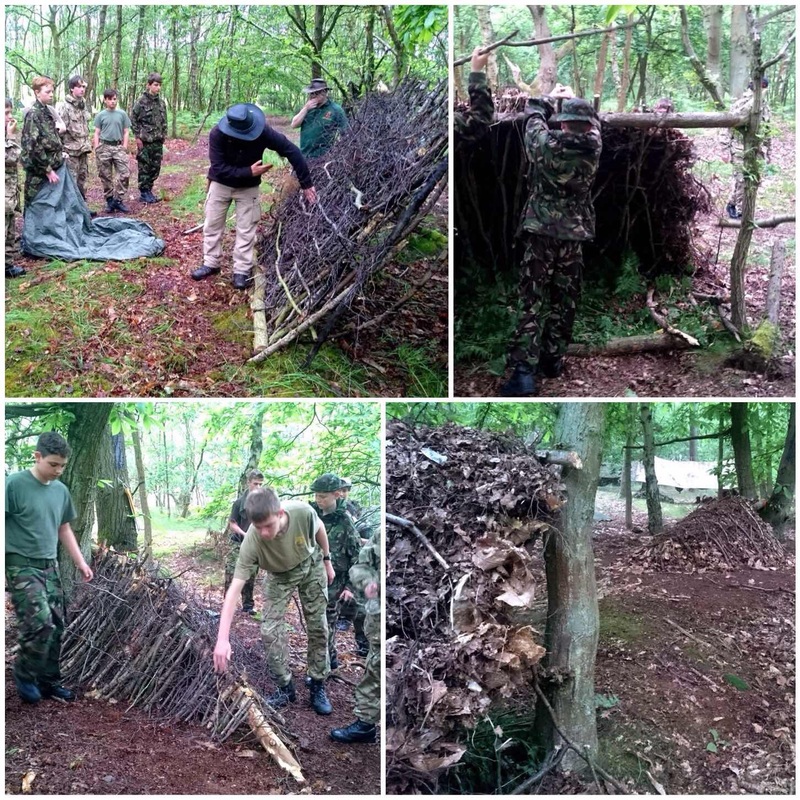 Once the tarps were up the cadets had to collect dry wood from the surrounding area. 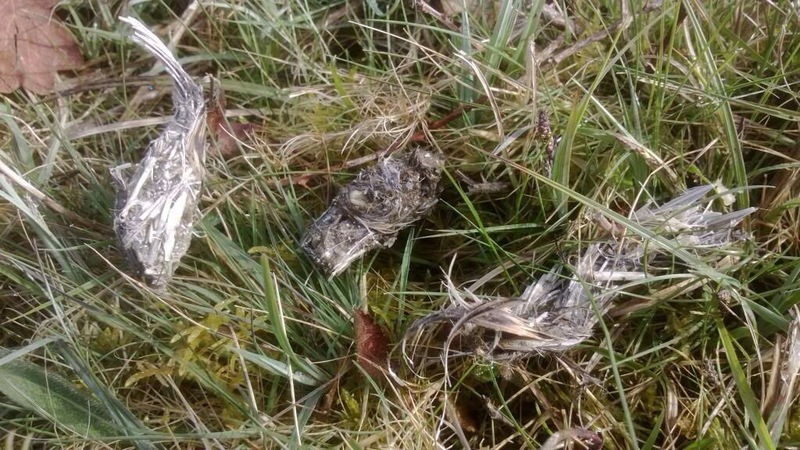 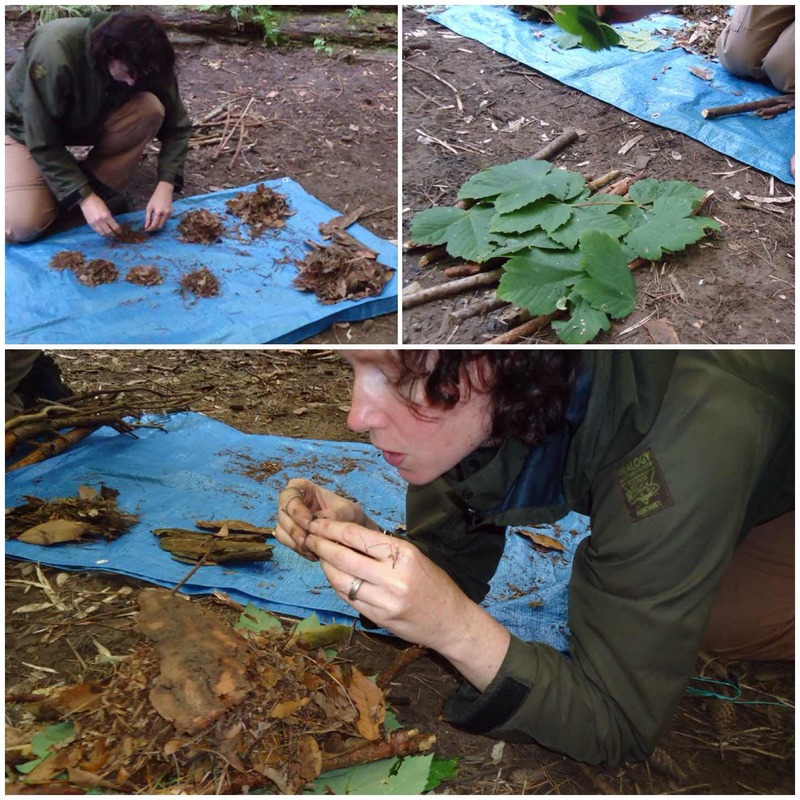 As it had been raining heavily there was very little in the way of dry wood lying around so we taught them how to identify dead standing wood. 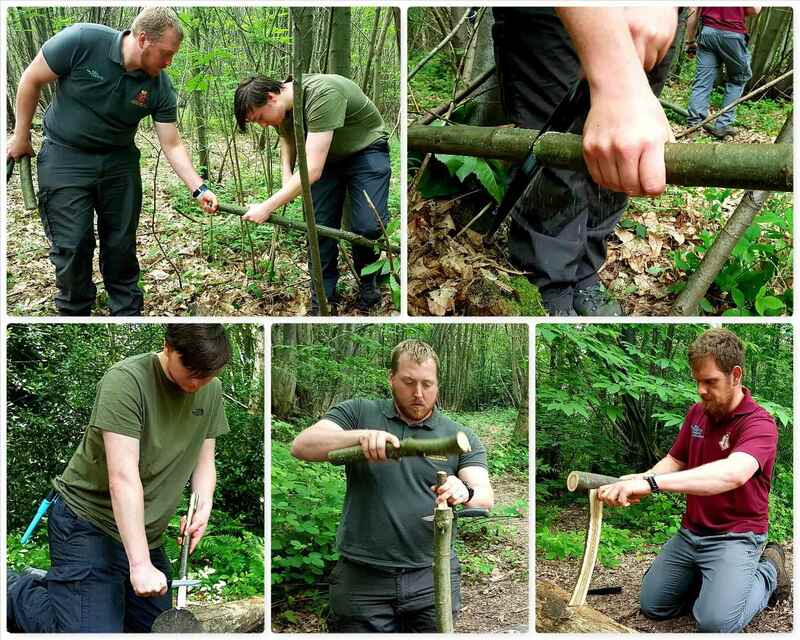 Thankfully the woodland had been coppiced in the past and left untouched for many years so there were plenty of dead standing coppice poles in the area. 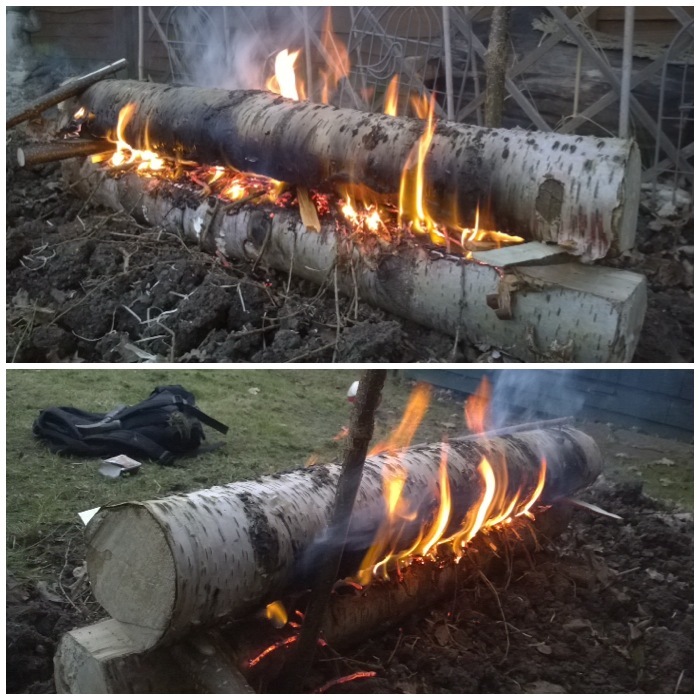 Once all the wood had been collected and graded it was time to play with some firesteels. 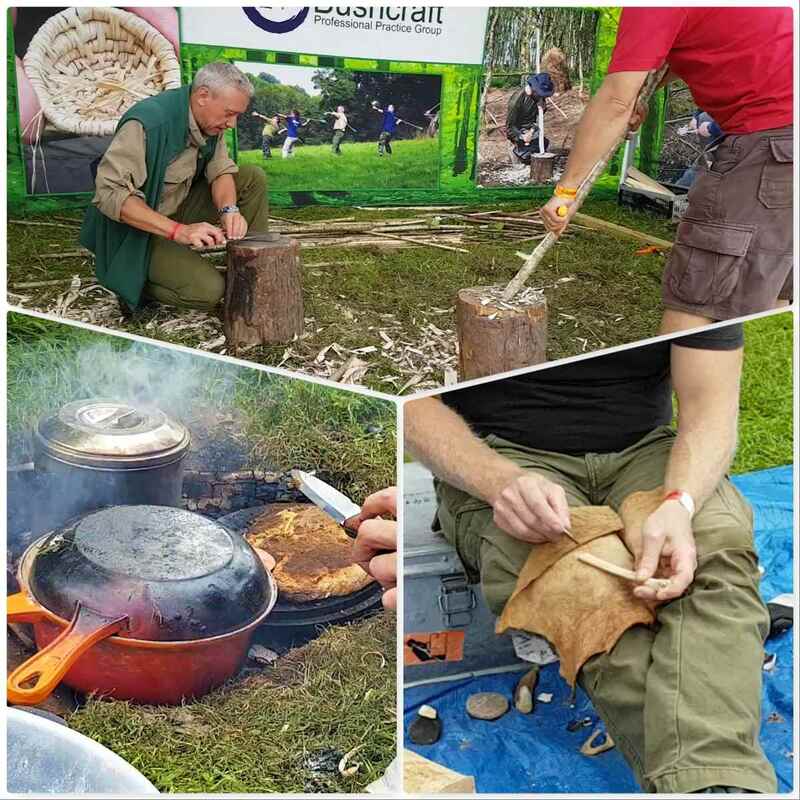 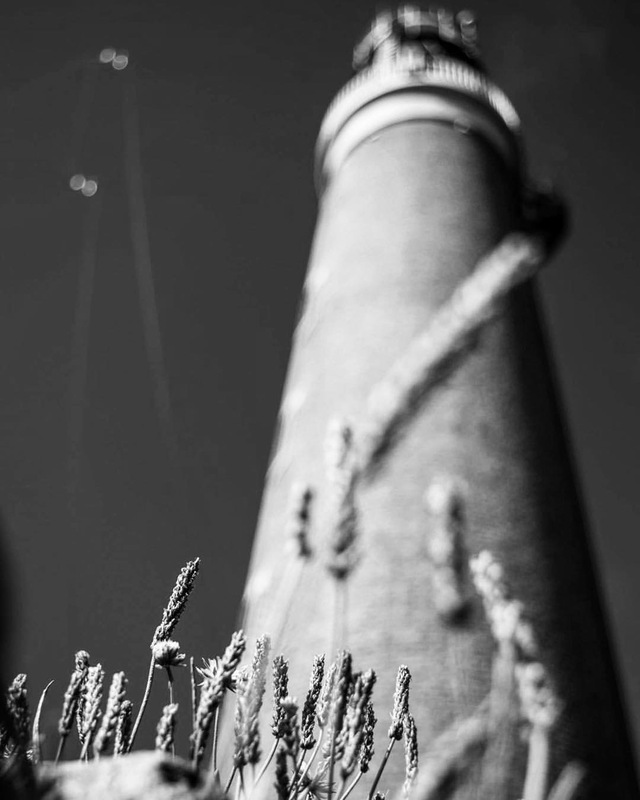 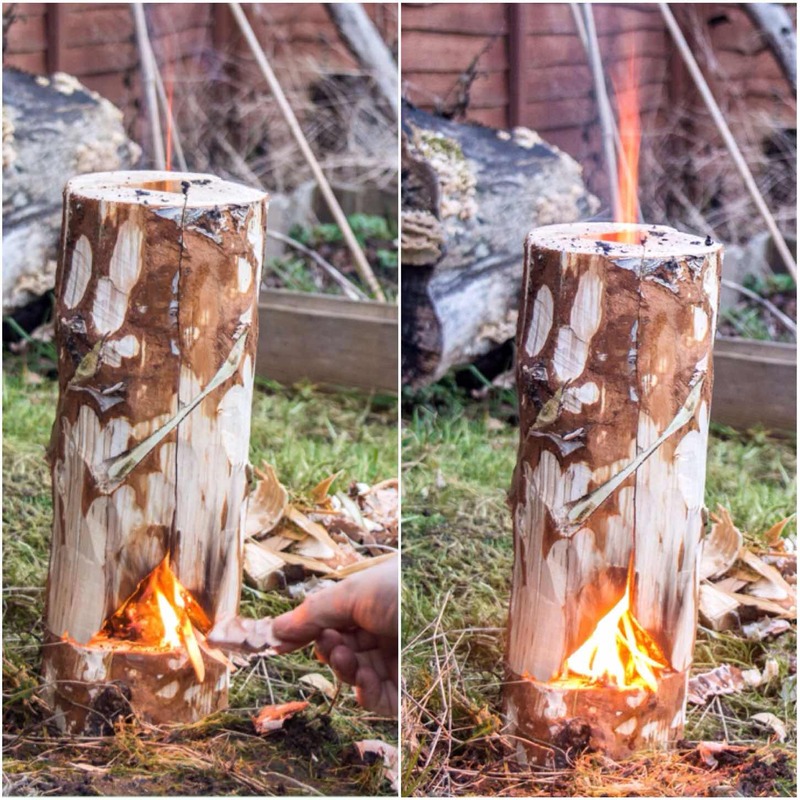 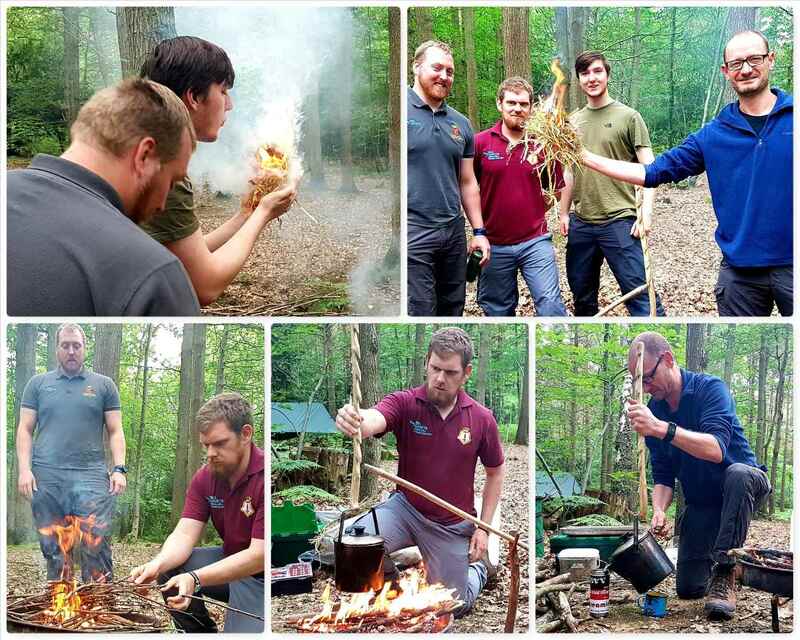 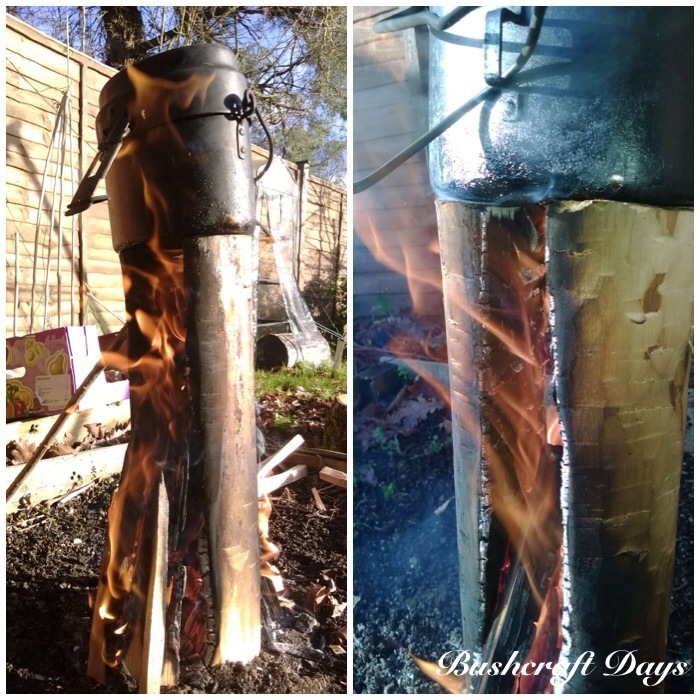 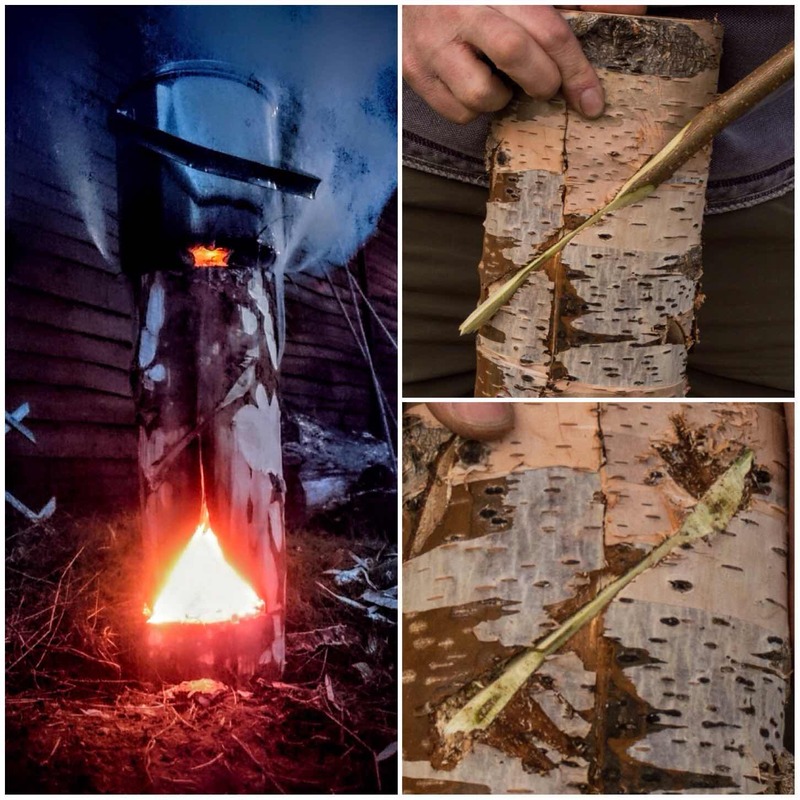 Once they got the hang of lighting char cloth the cadets experimented with other tinders such as pampas grass and birch bark. 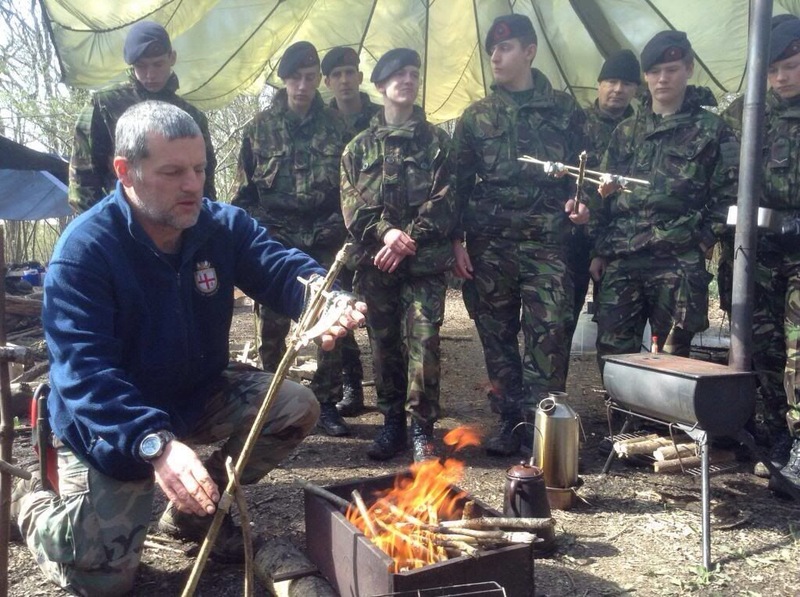 Everything was very damp but the cadets persevered and eventually had two good fires going to get a hot brew on. 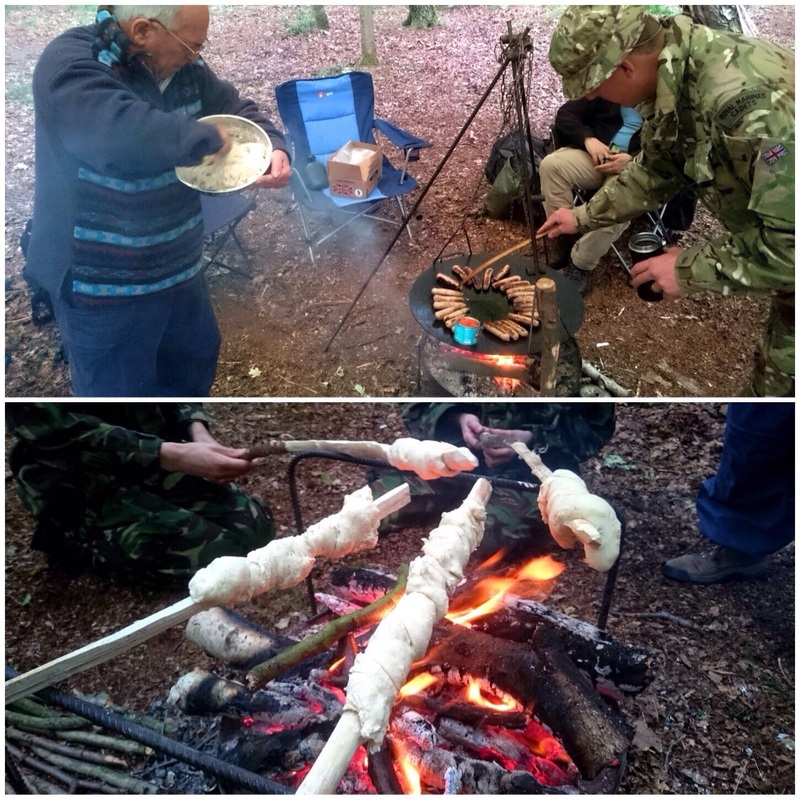 As we were running the course in the woodland within the grounds of the camp all the cadets were being fed from the main camp galley. 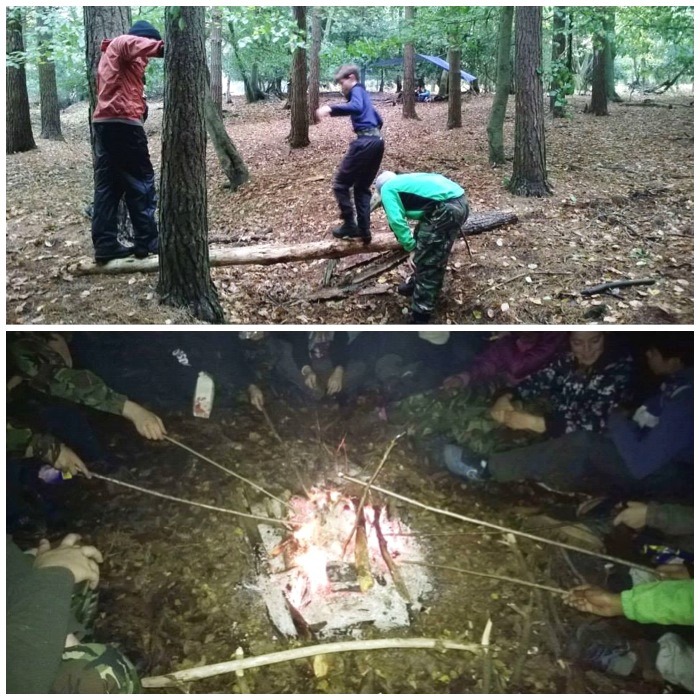 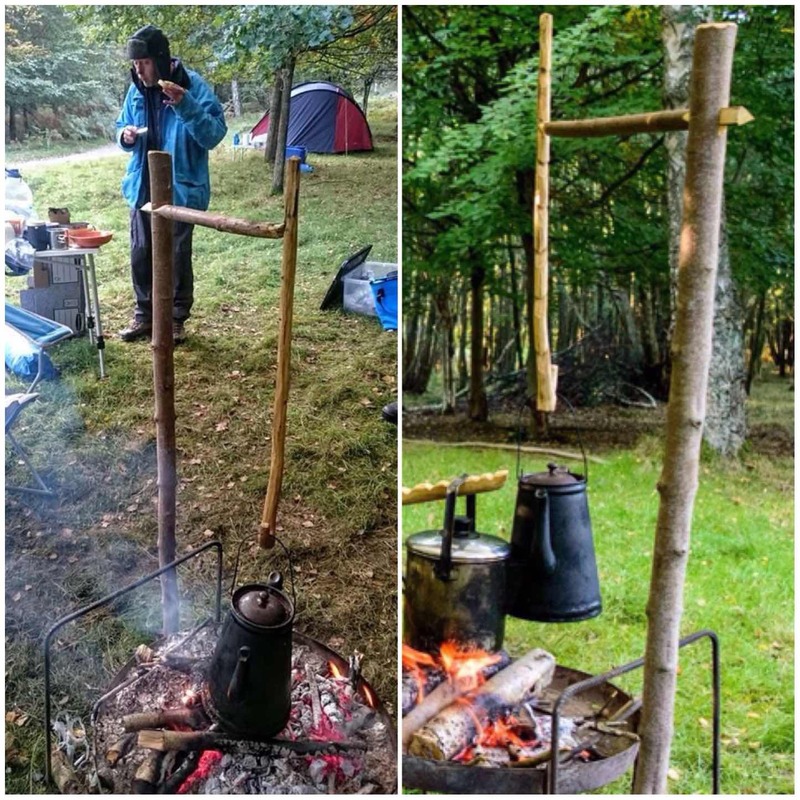 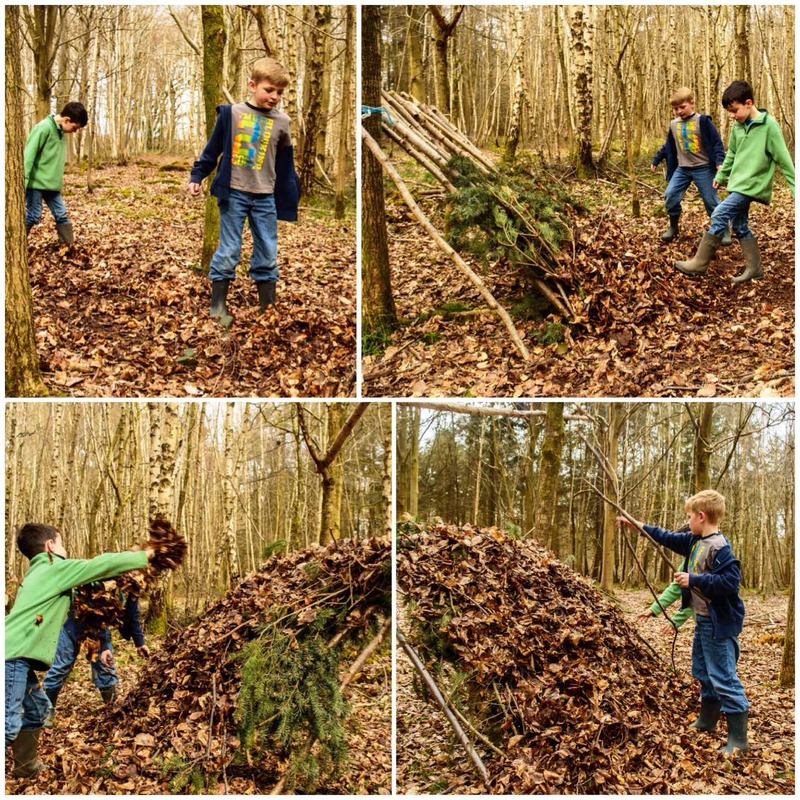 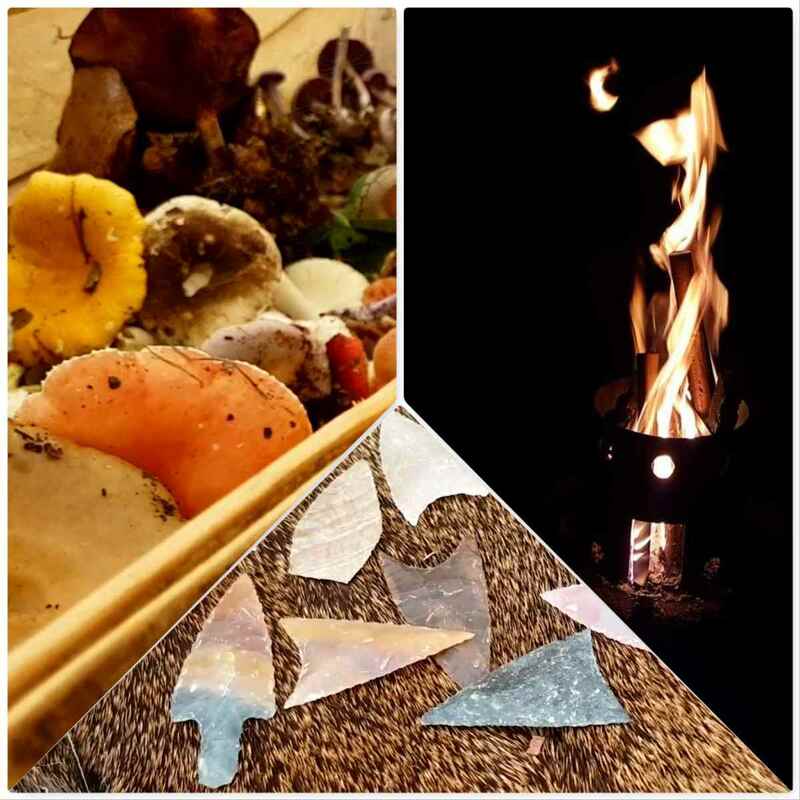 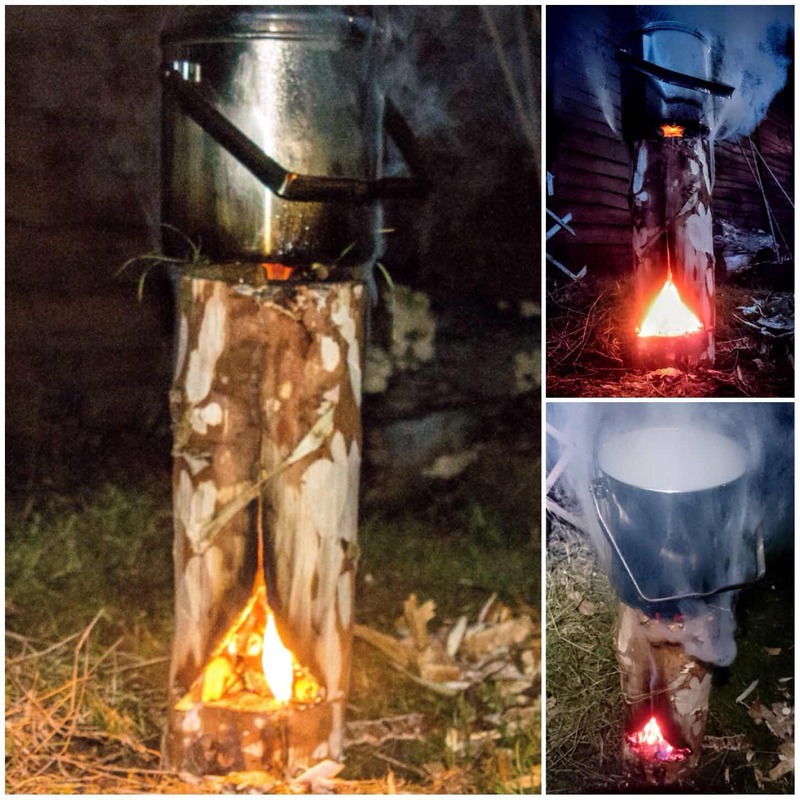 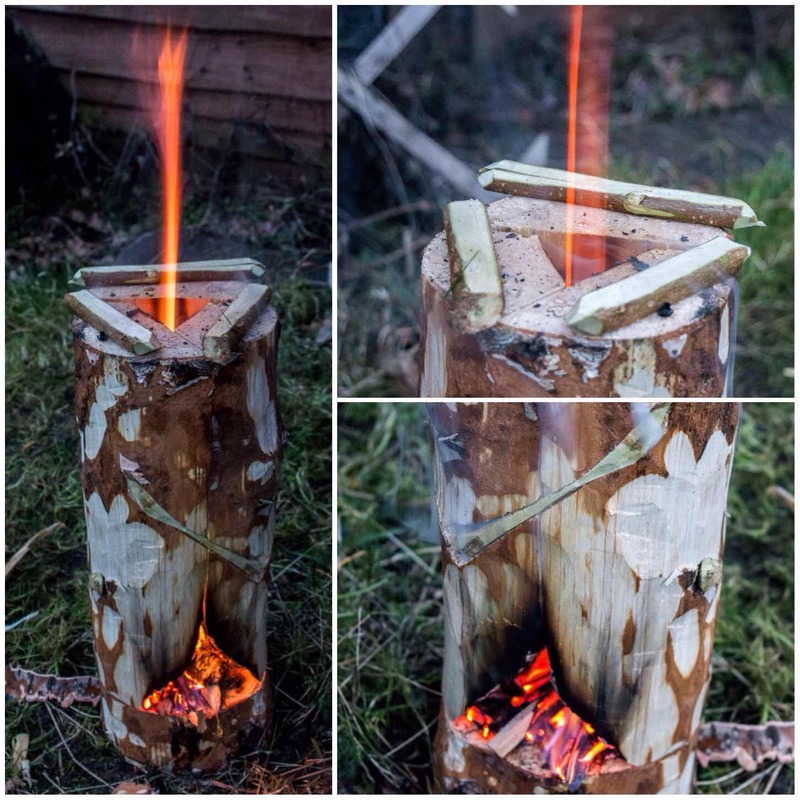 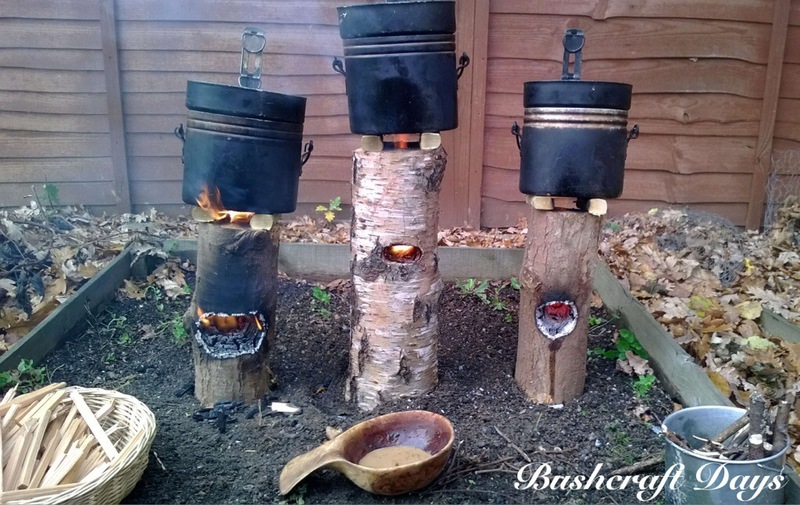 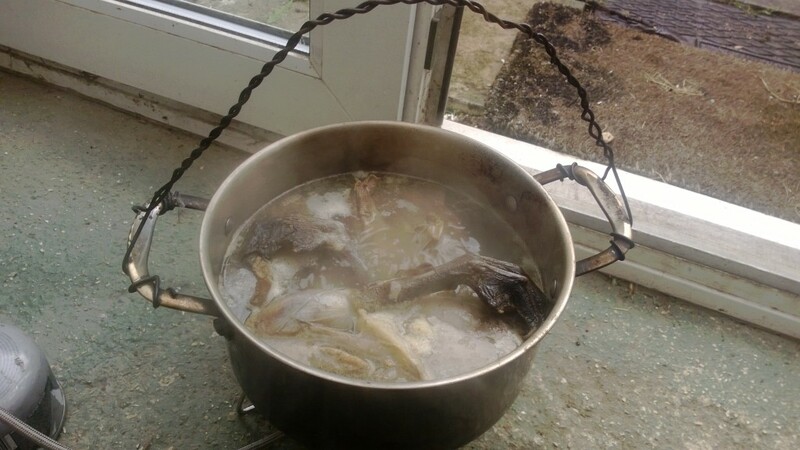 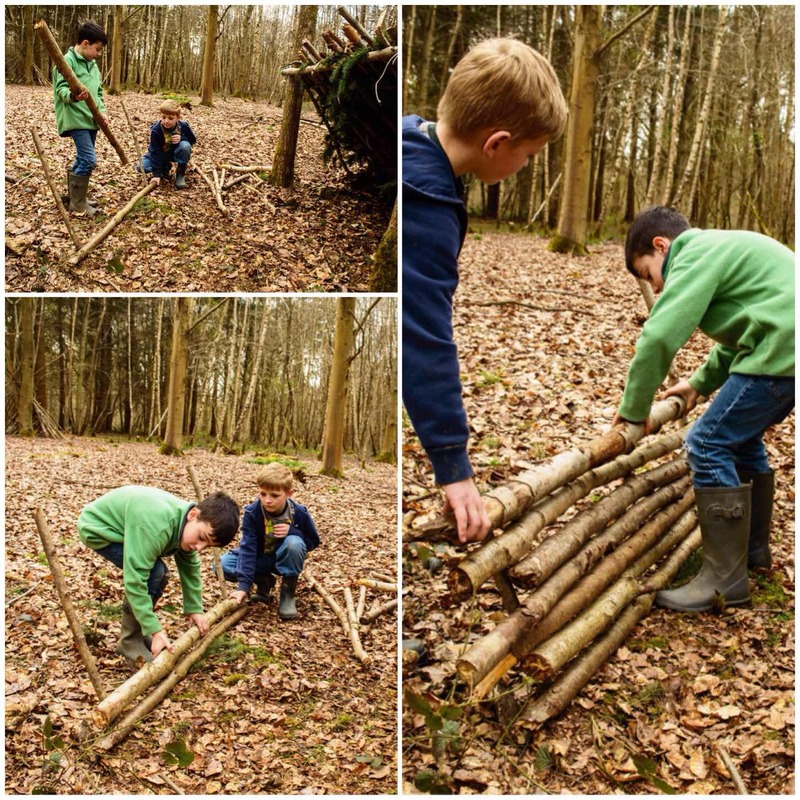 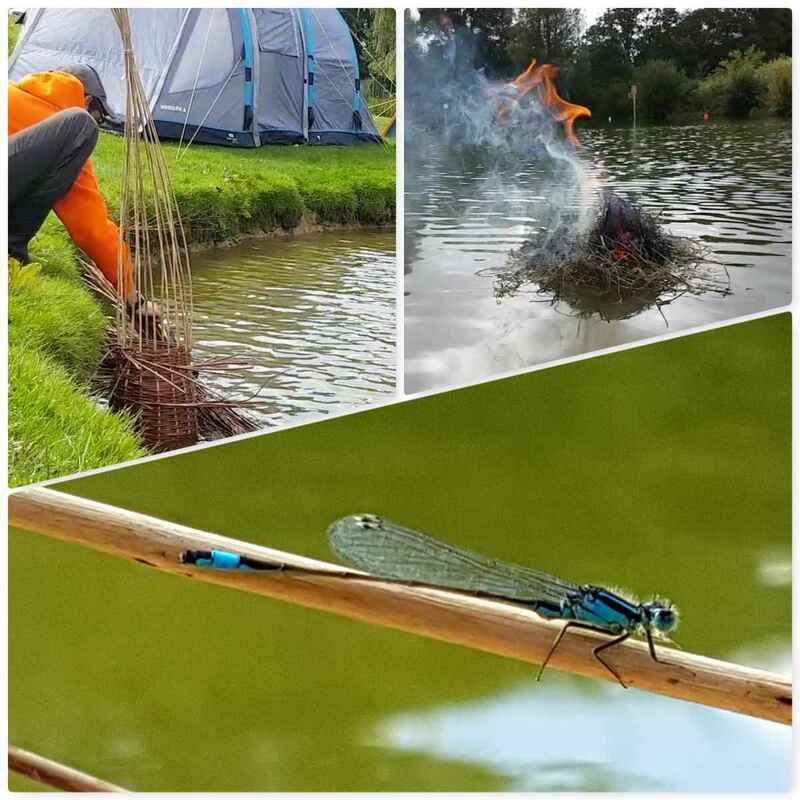 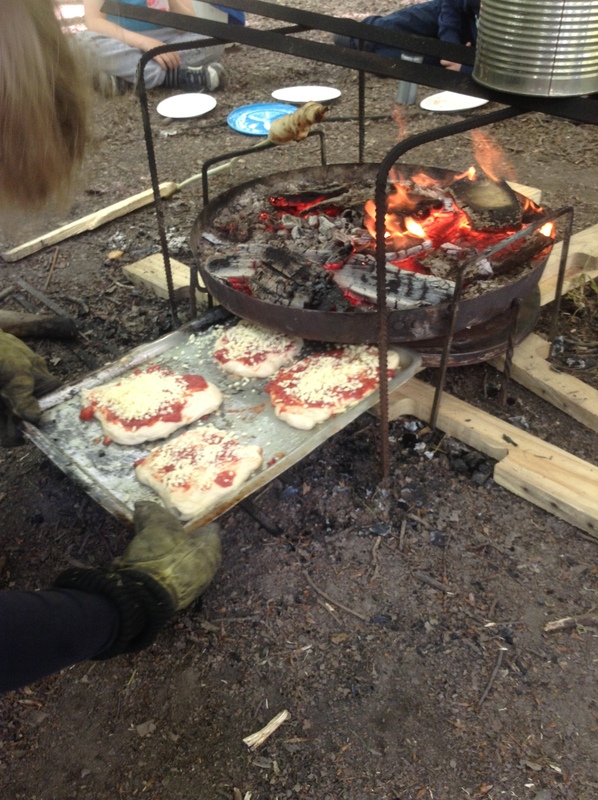 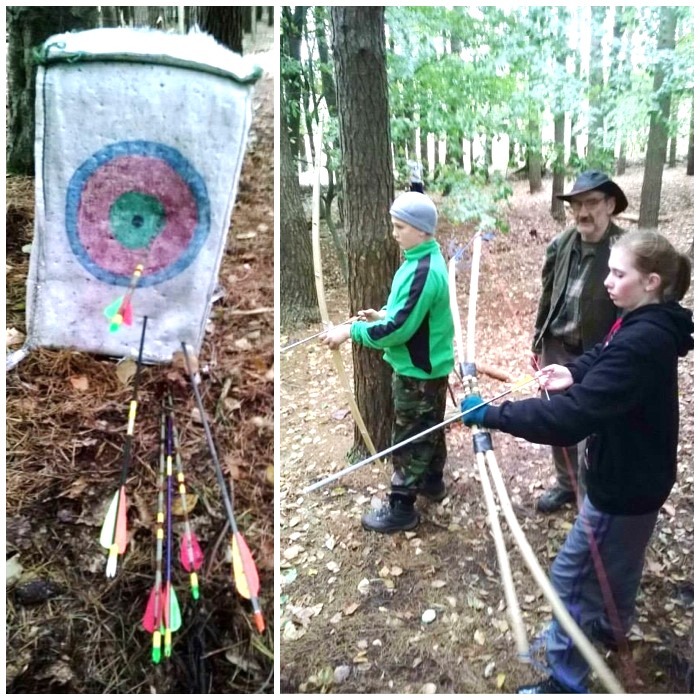 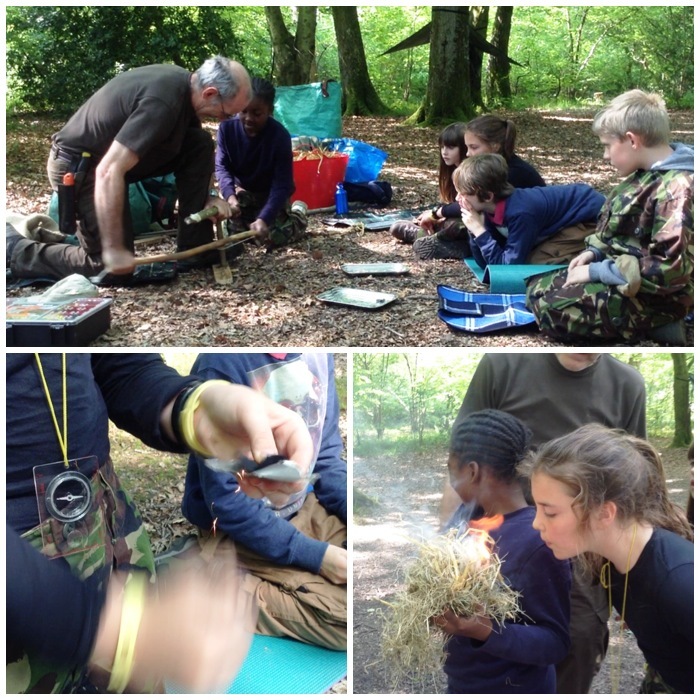 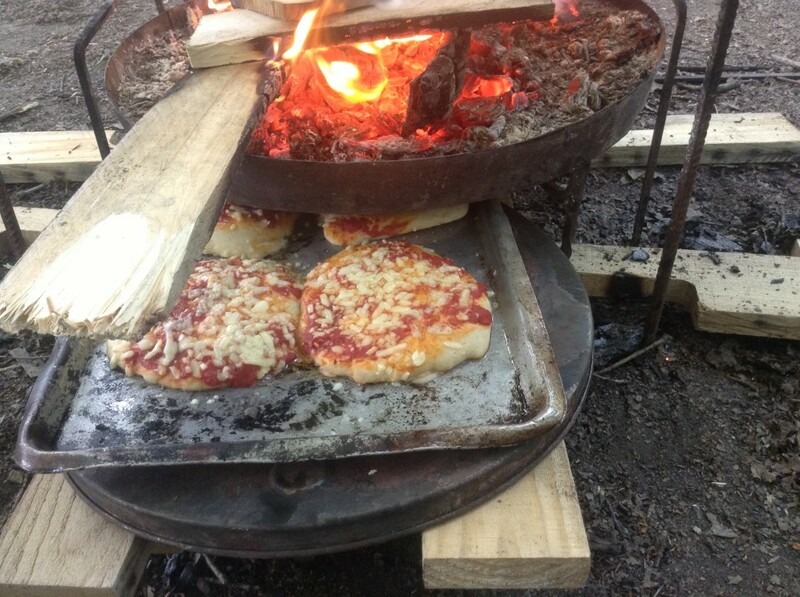 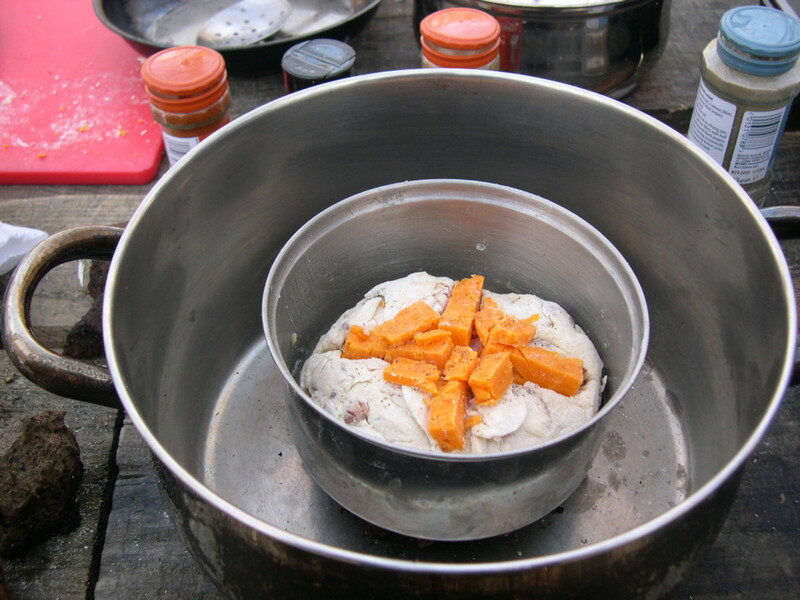 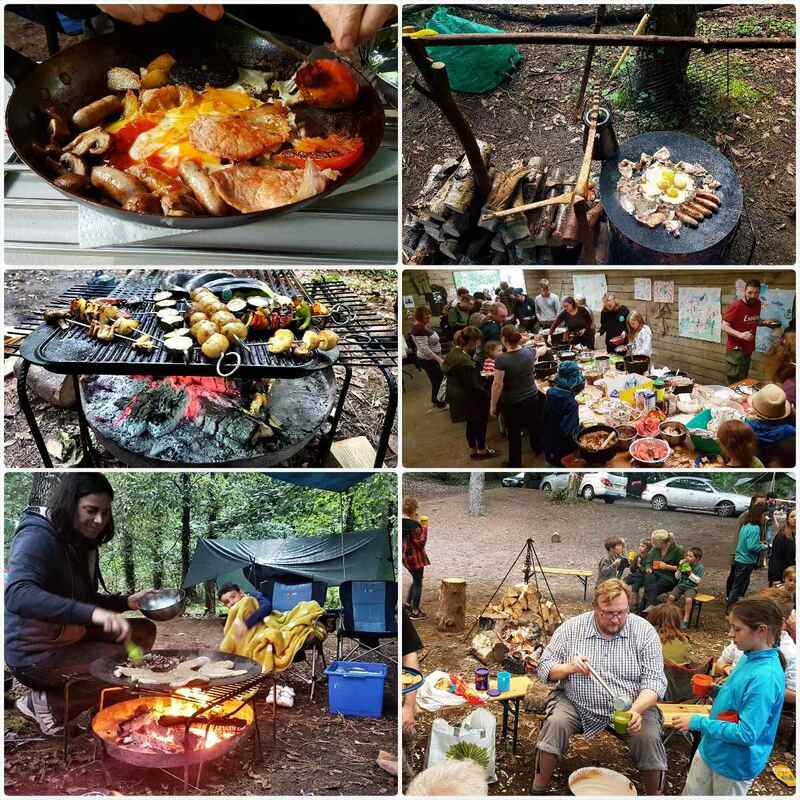 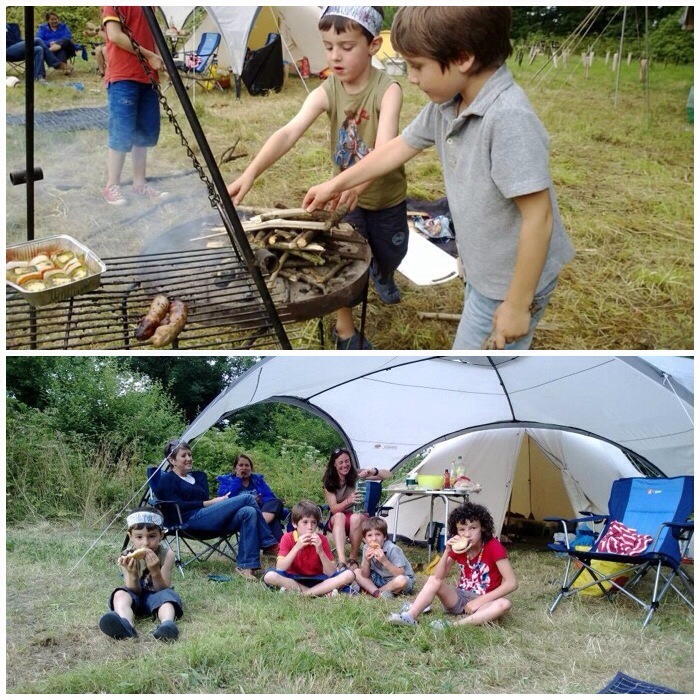 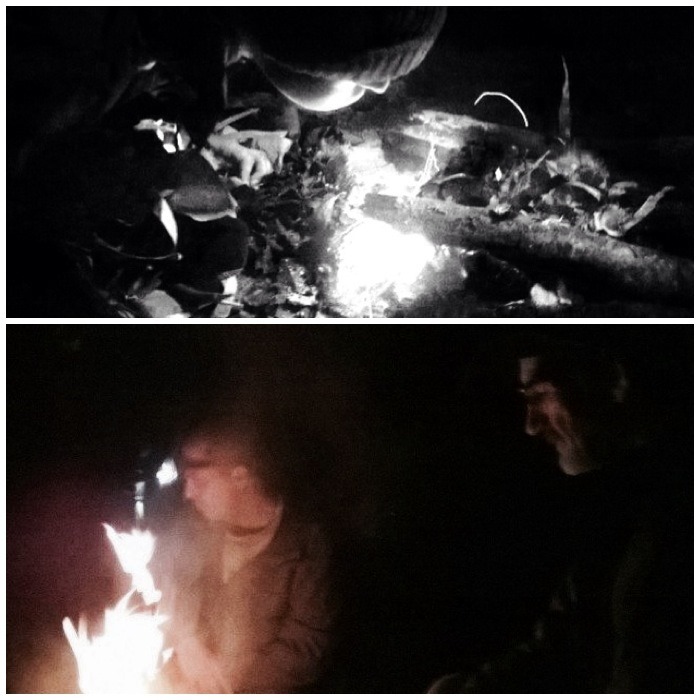 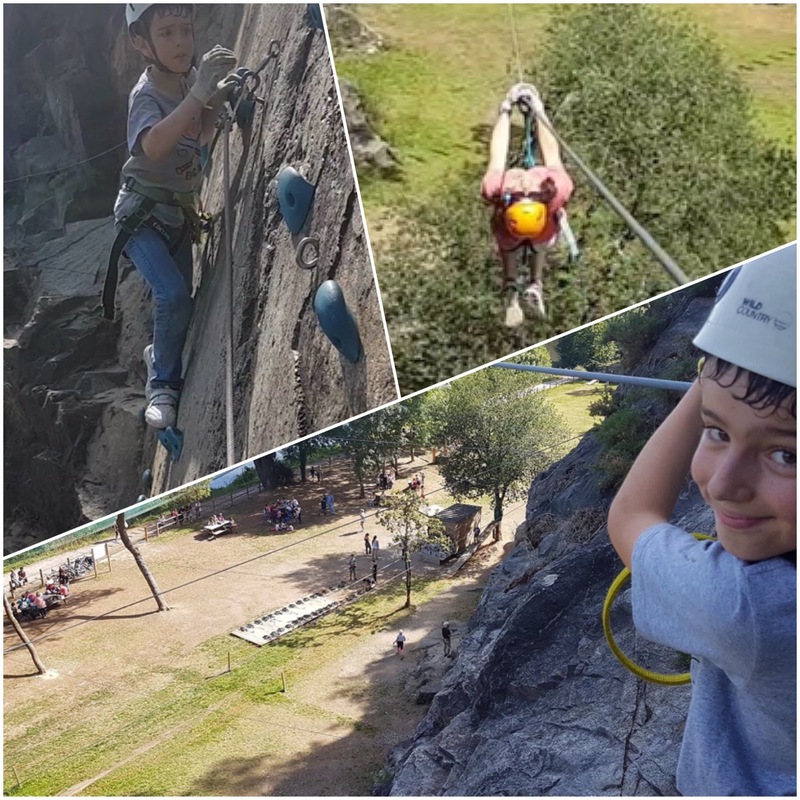 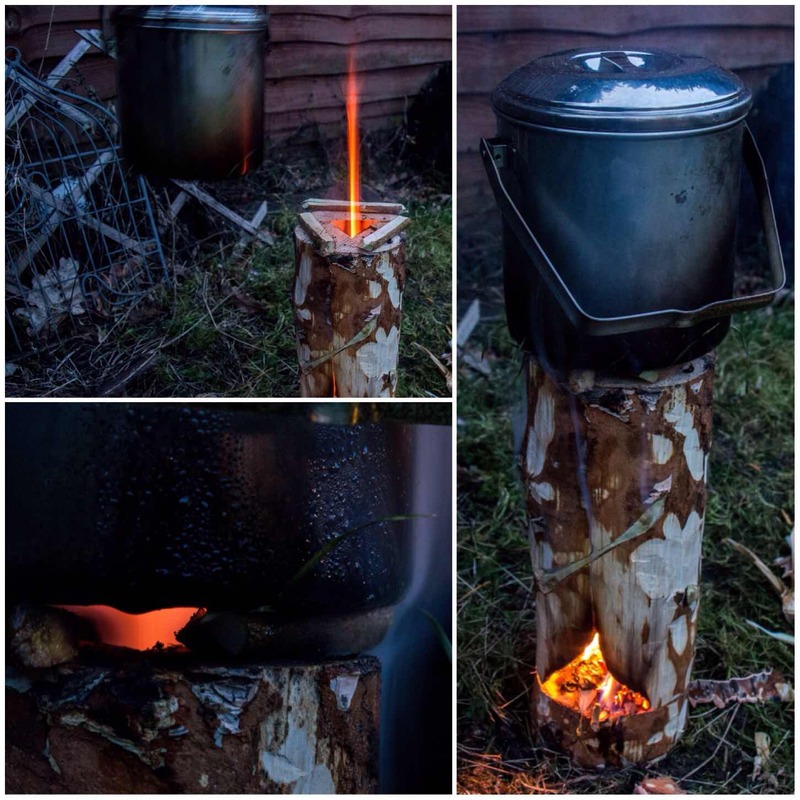 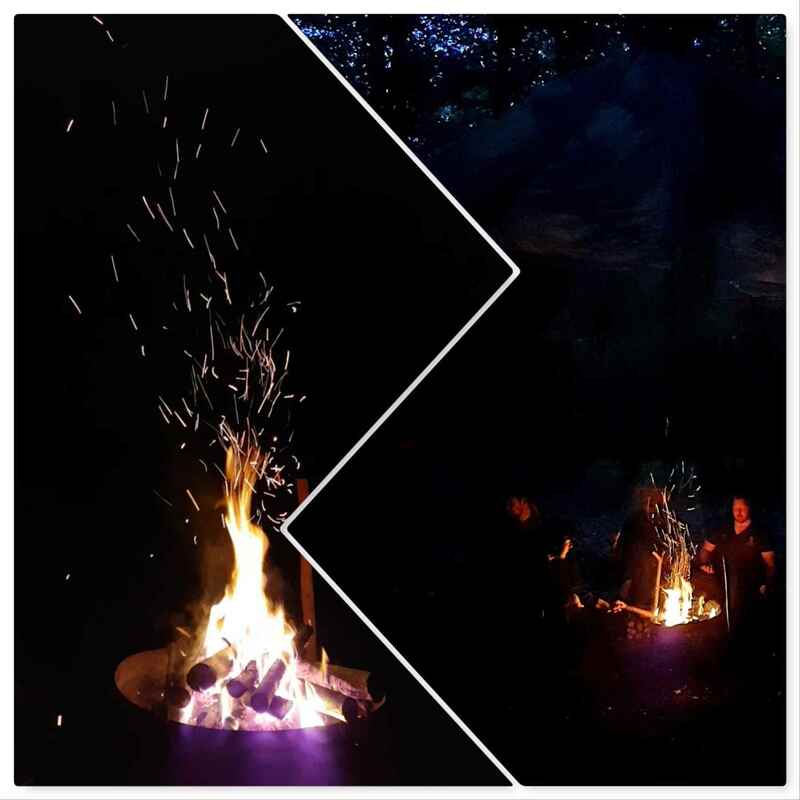 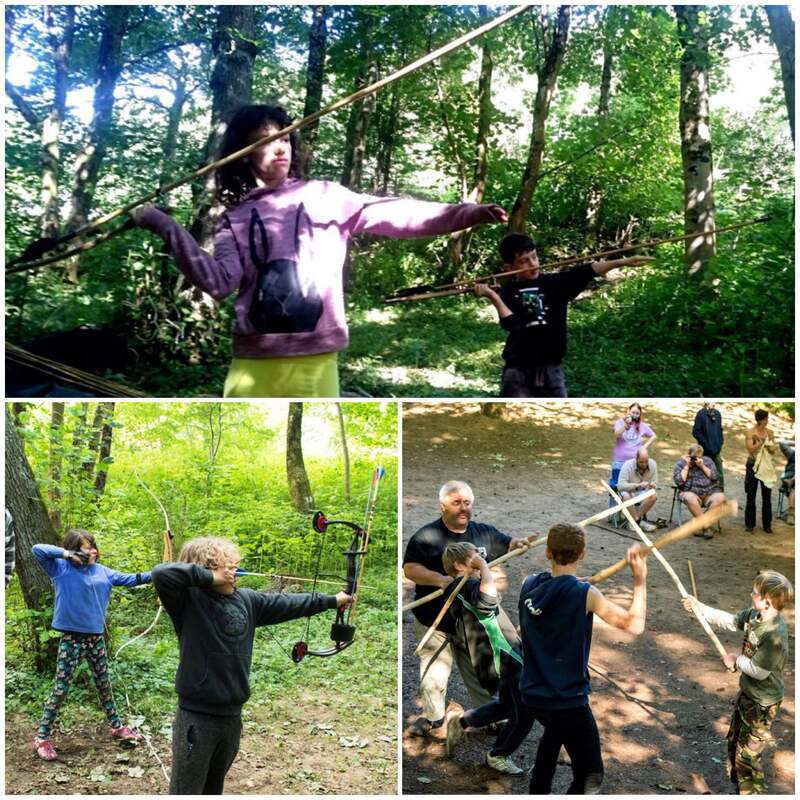 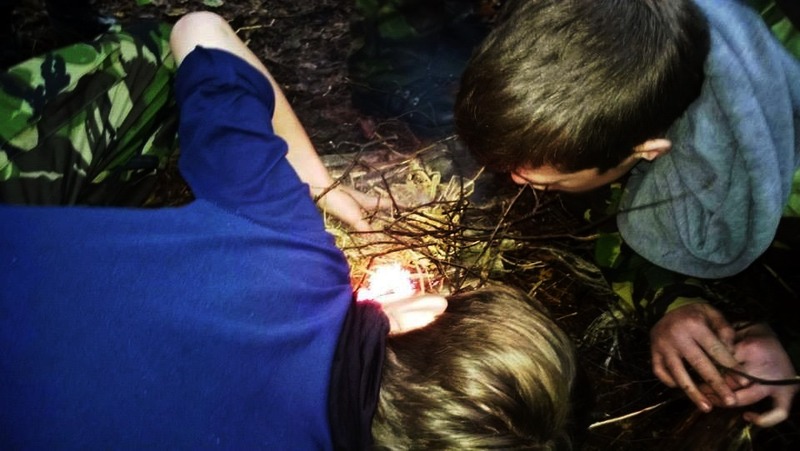 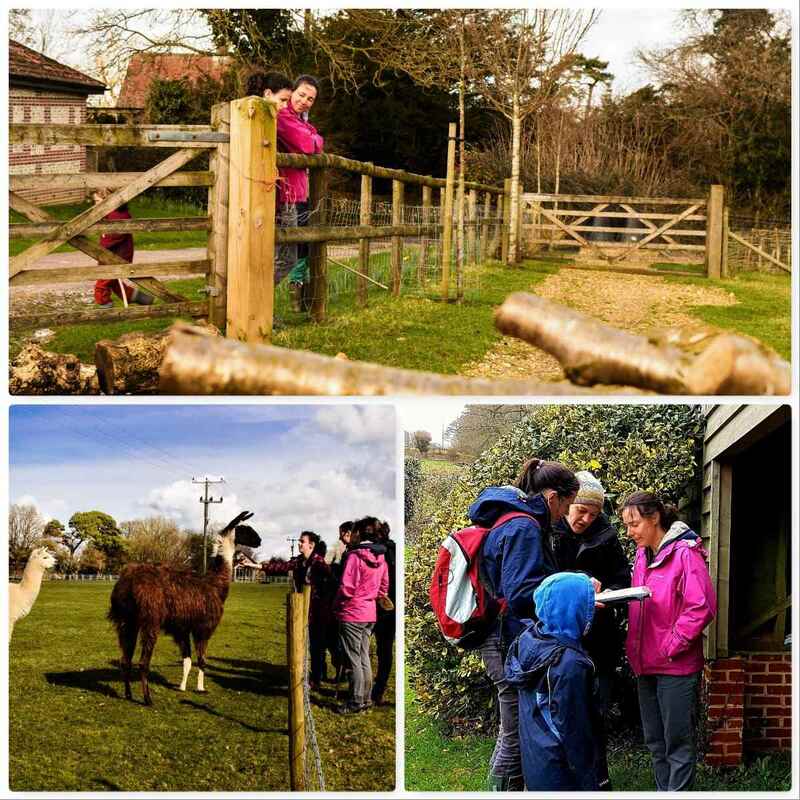 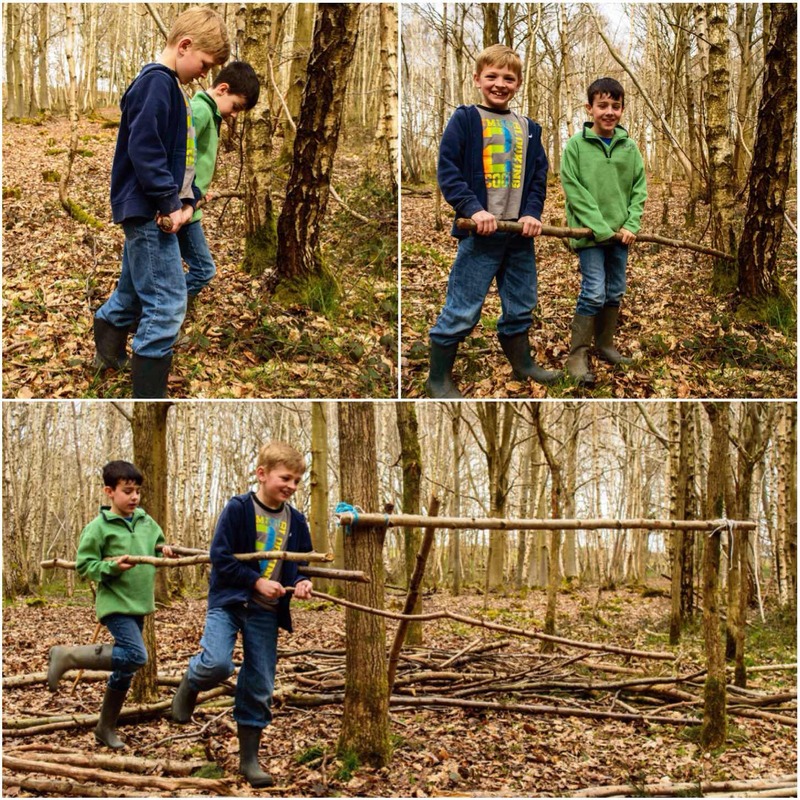 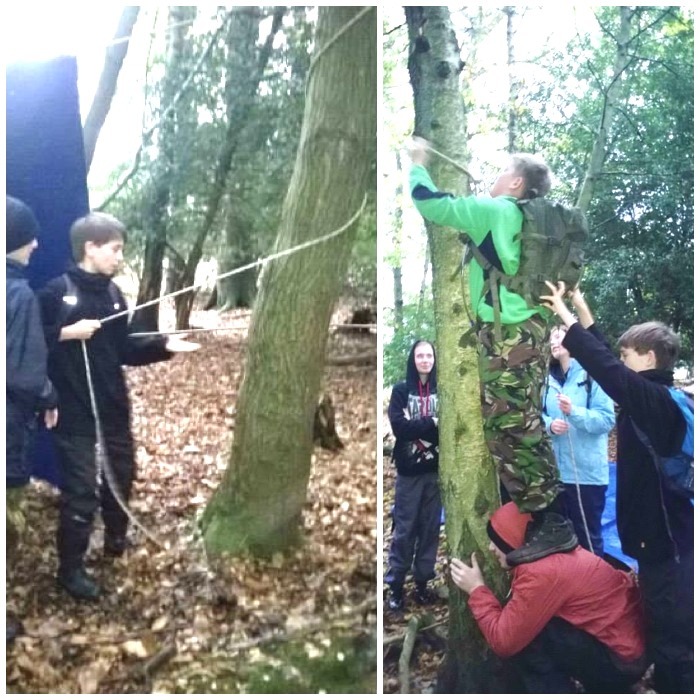 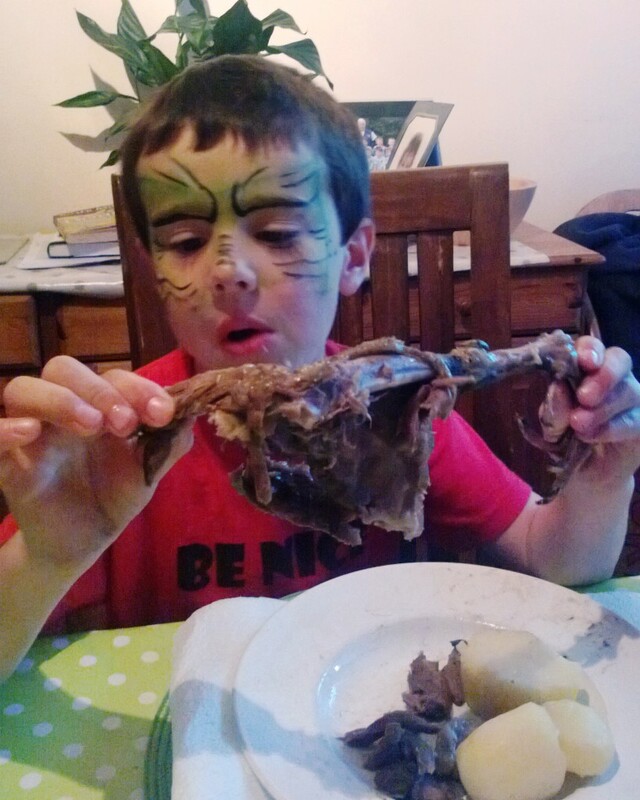 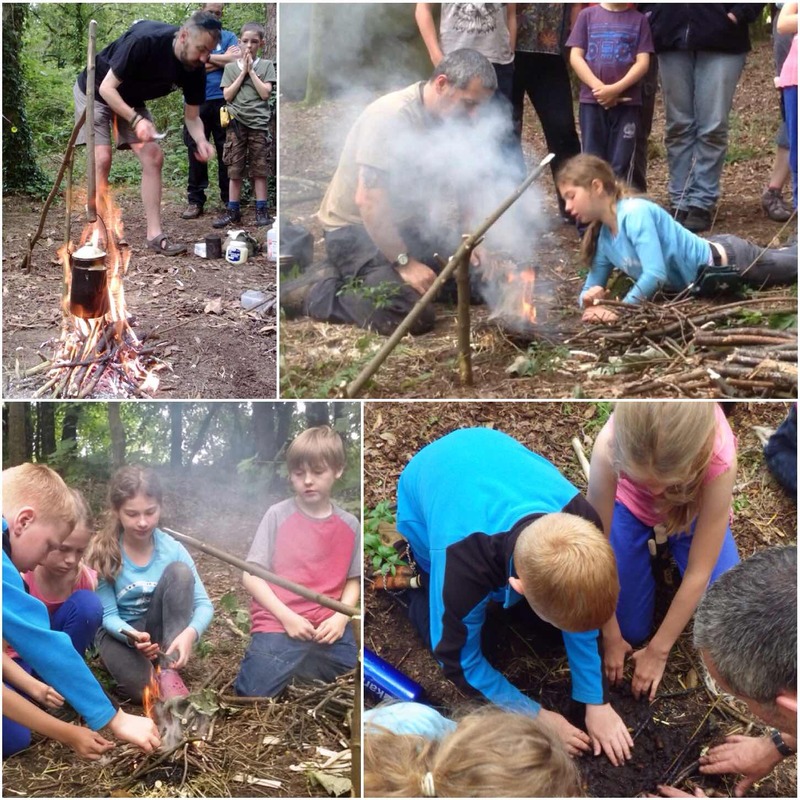 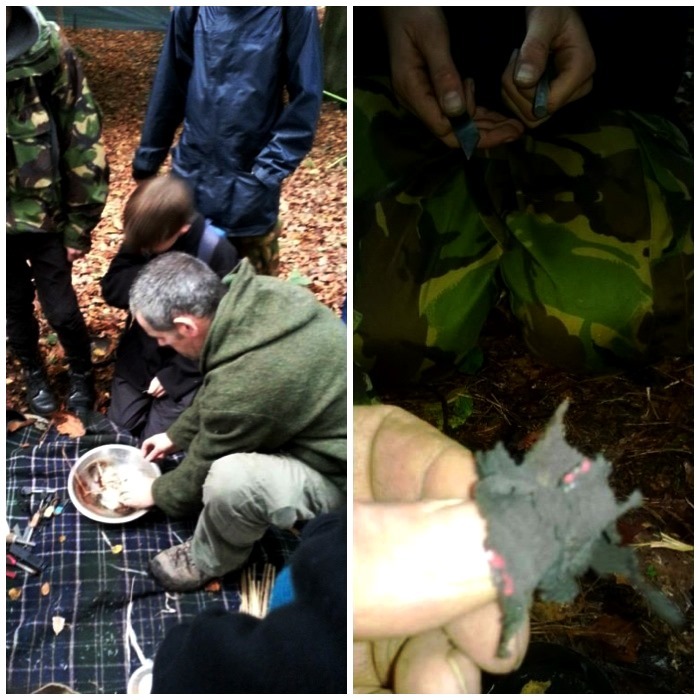 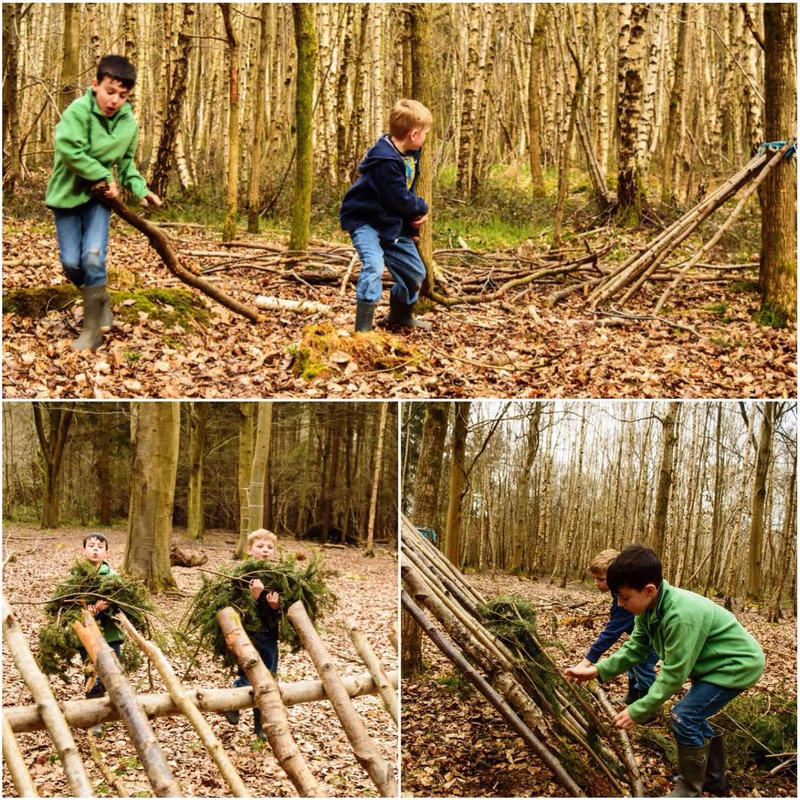 This freed us up to concentrate on different bushcraft activities without having to worry about getting food cooked over the open fires. 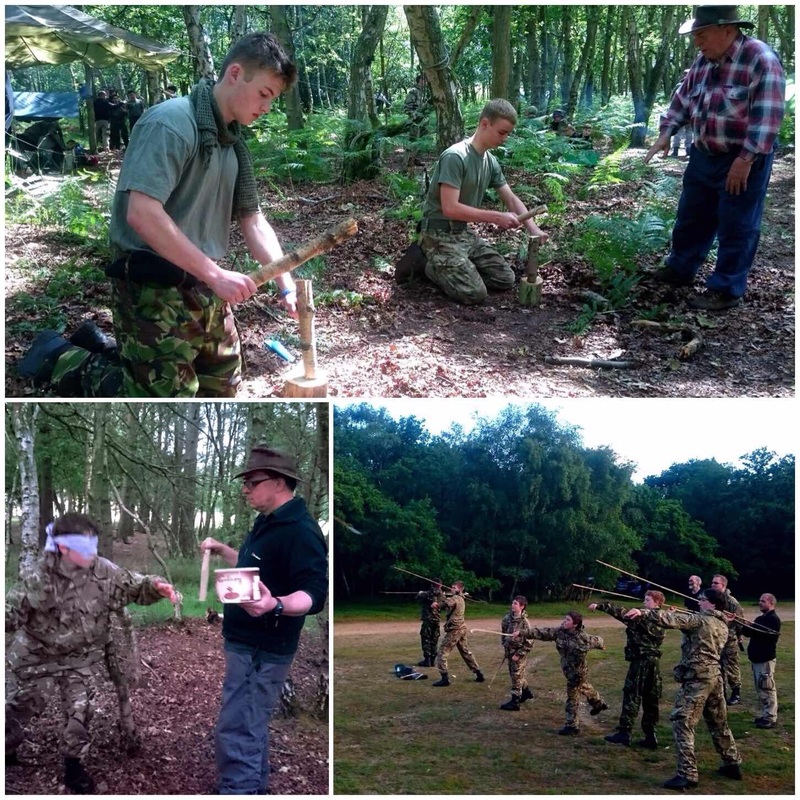 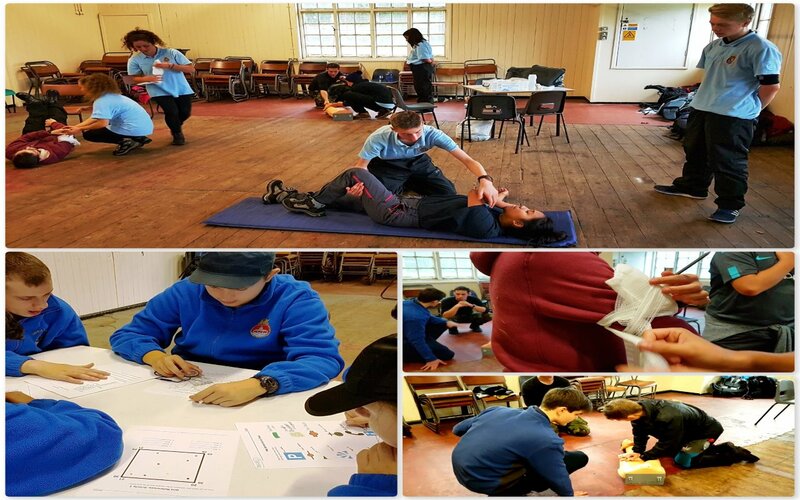 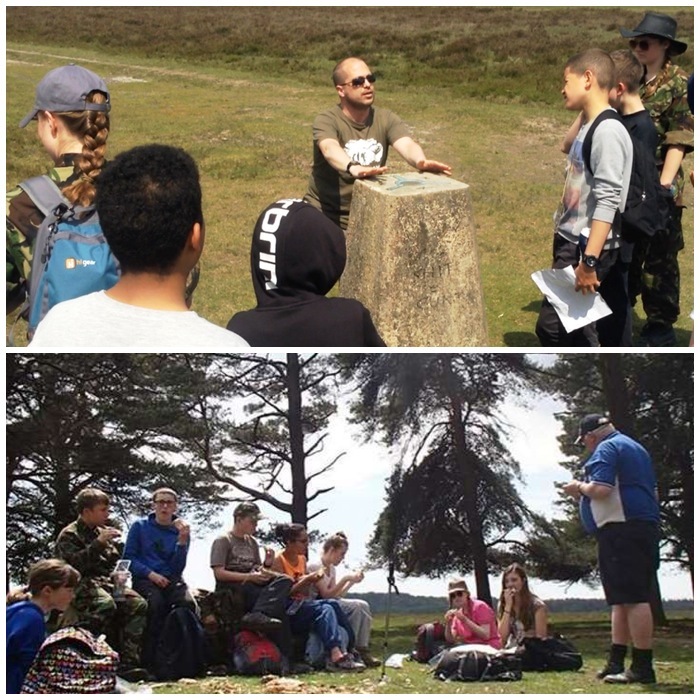 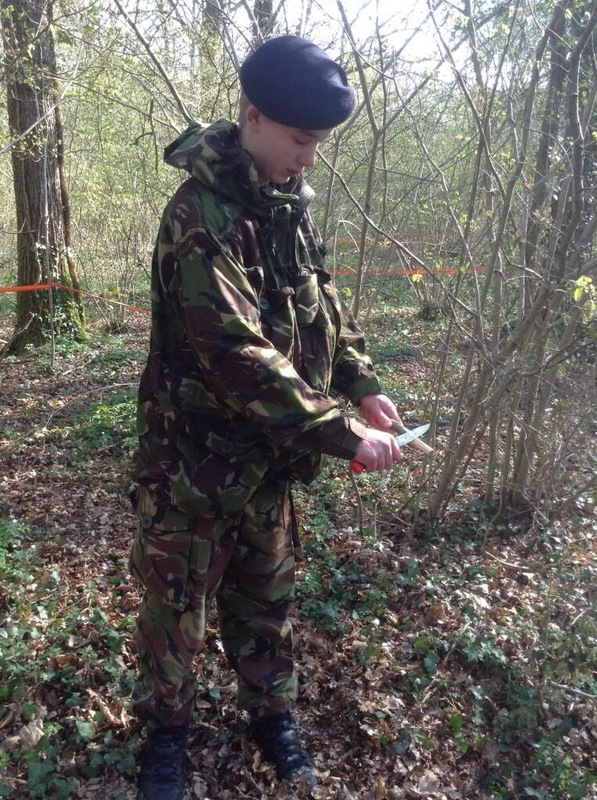 One of these activities was to introduce the cadets to a bit of safe knife use. 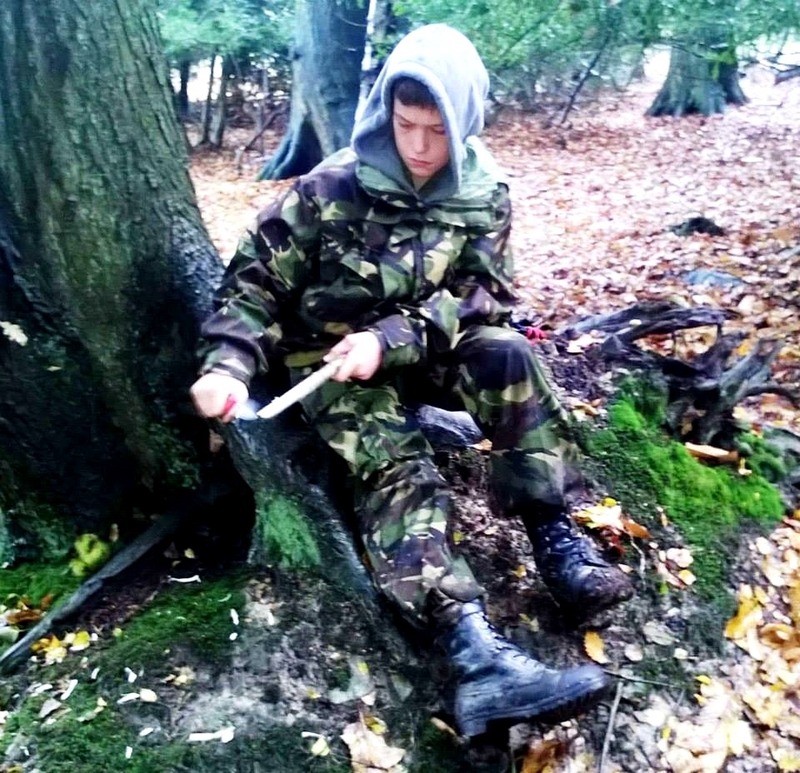 After discussing safety issues and the legalities of using a knife, the cadets learnt how to carve themselves a small wedge. 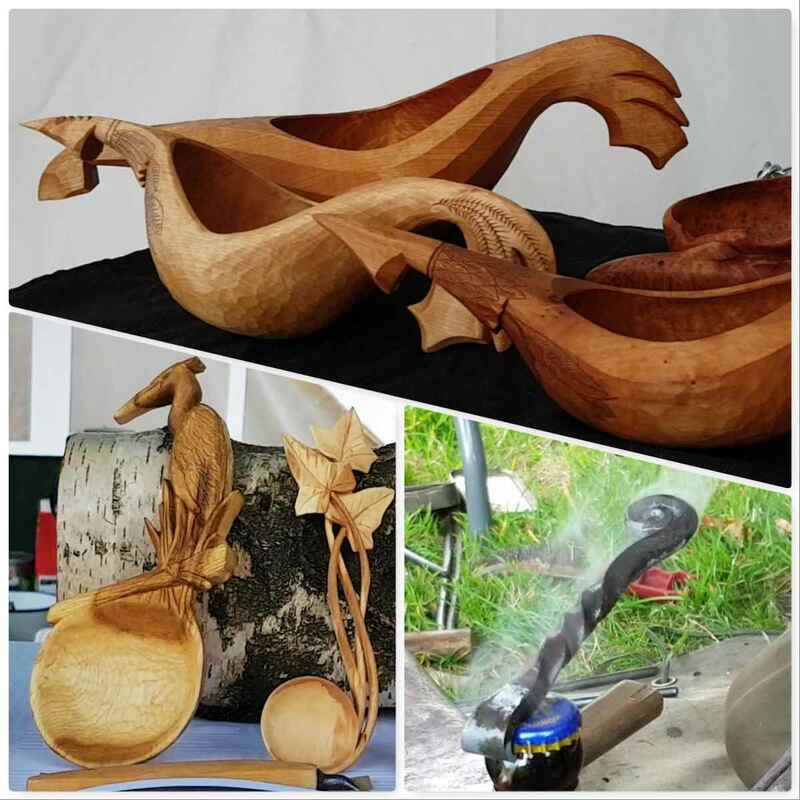 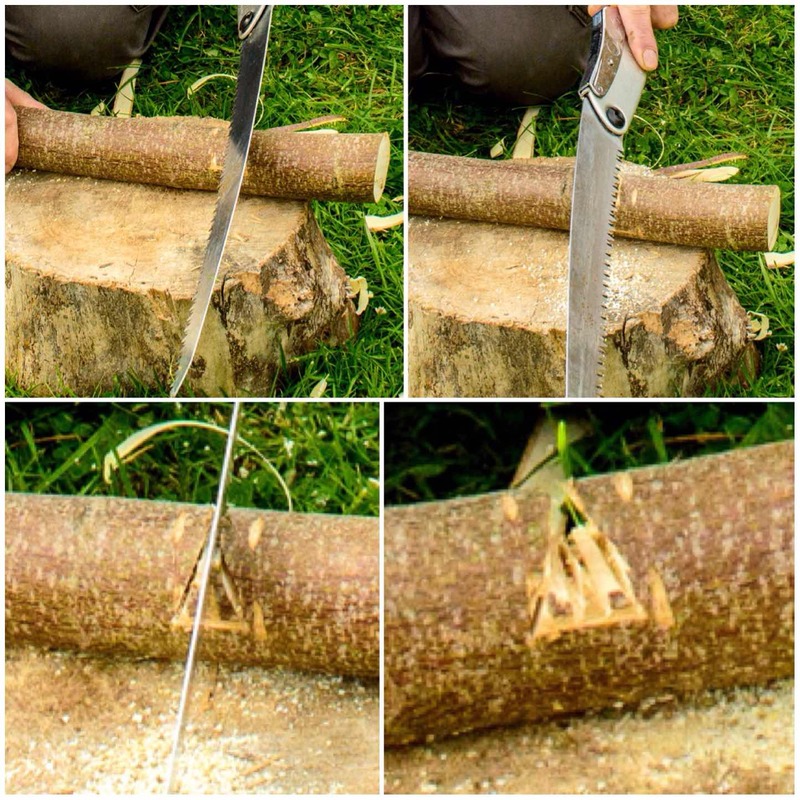 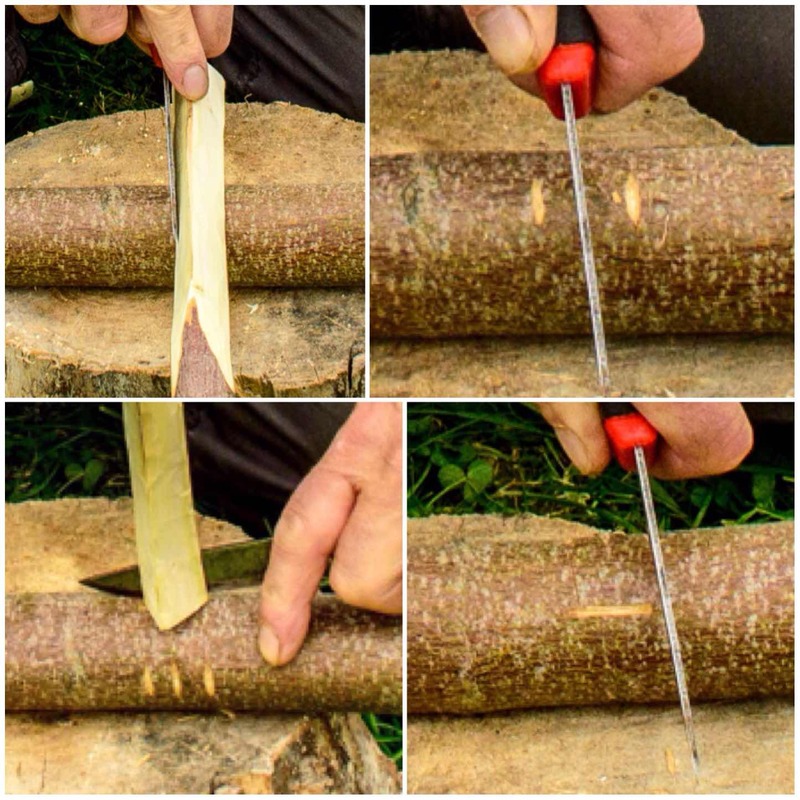 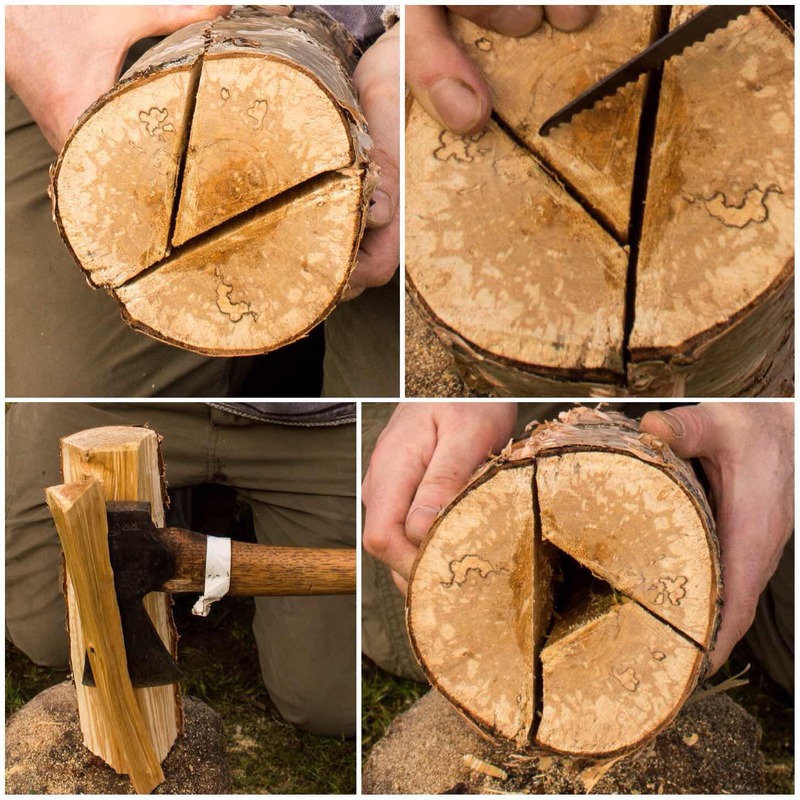 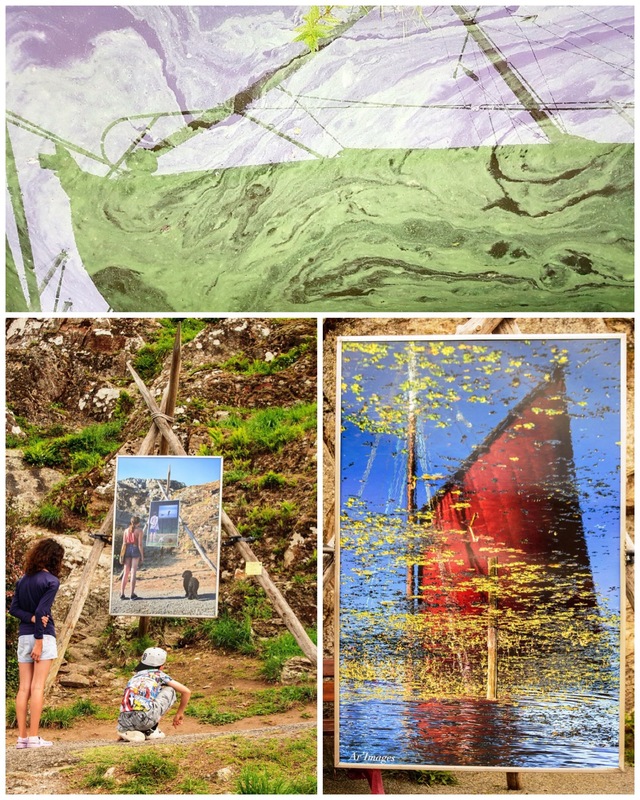 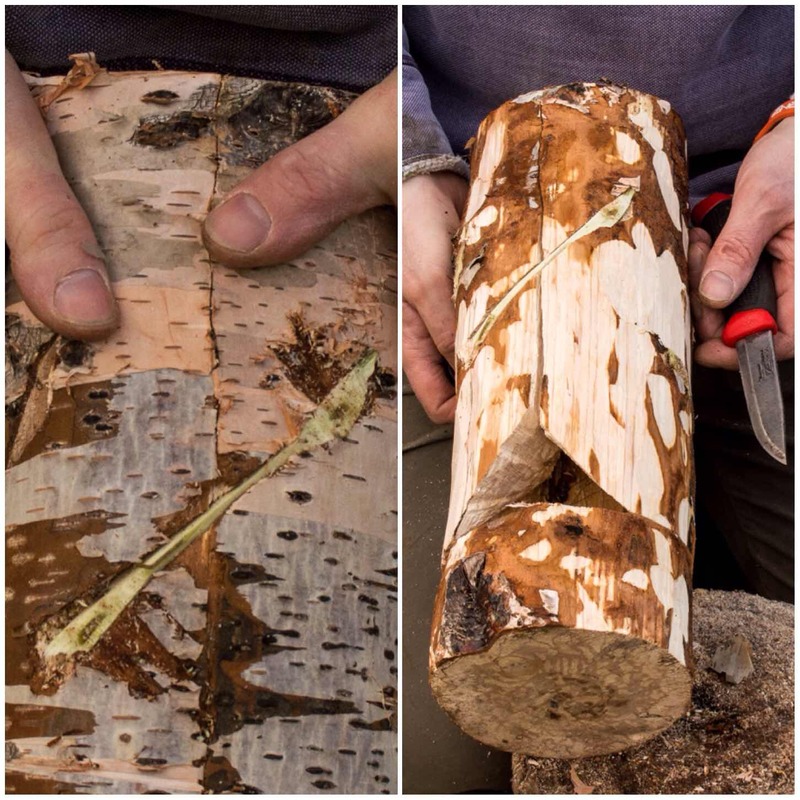 I like this simple activity as it involves using a variety of carving techniques. 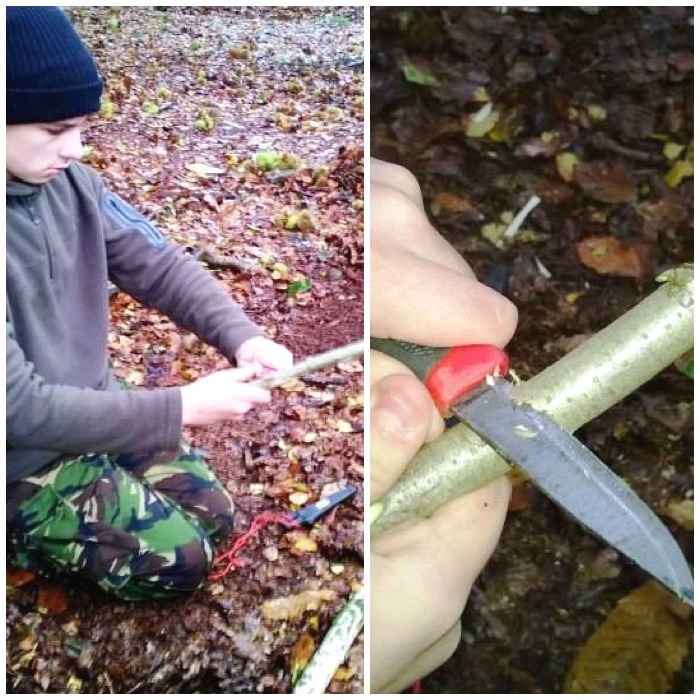 The cadets practised cutting techniques safely, making cuts away from themselves and in front of them or off to the side. 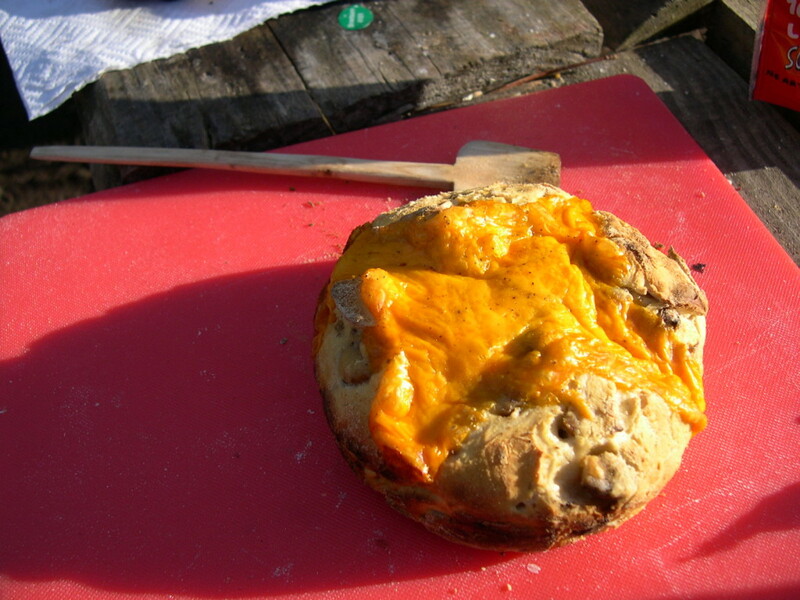 We spent a good hour trying out different cuts and everyone managed to finish their wedges. 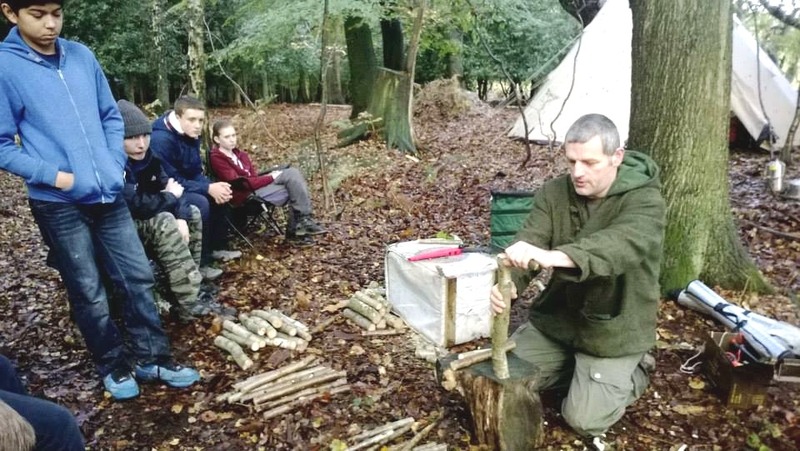 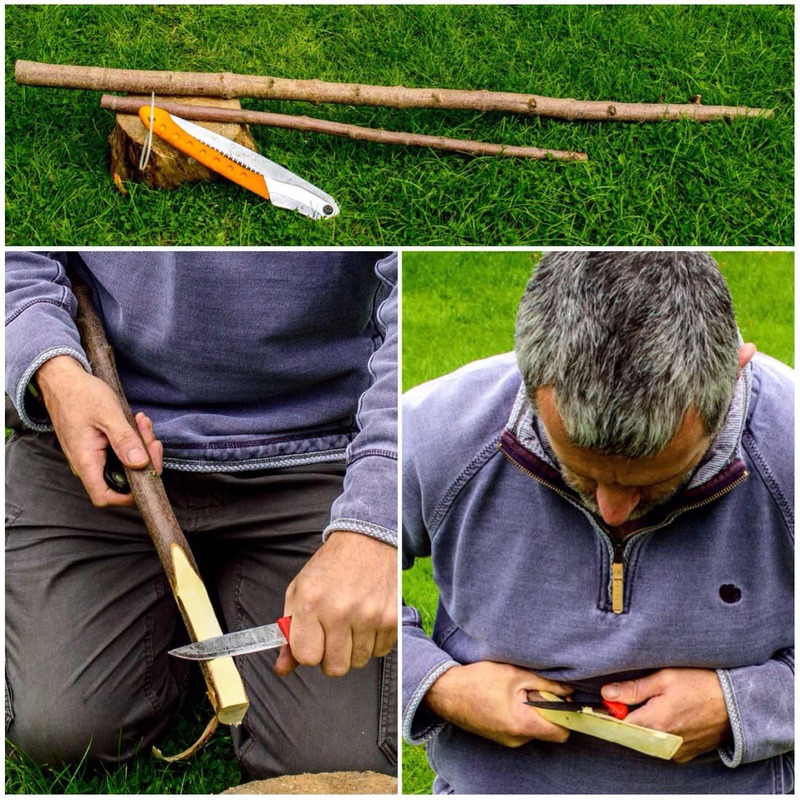 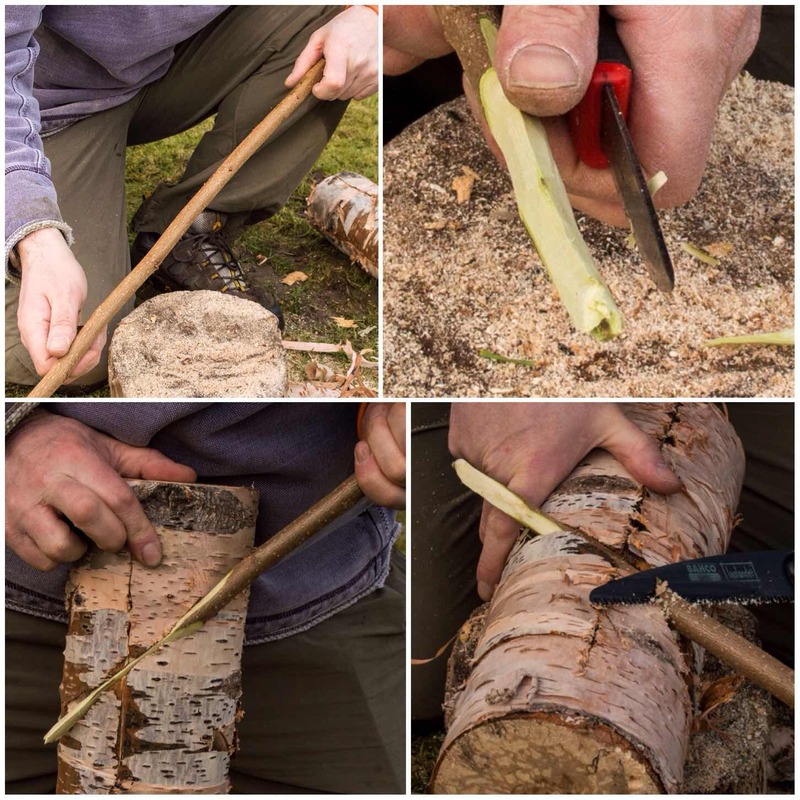 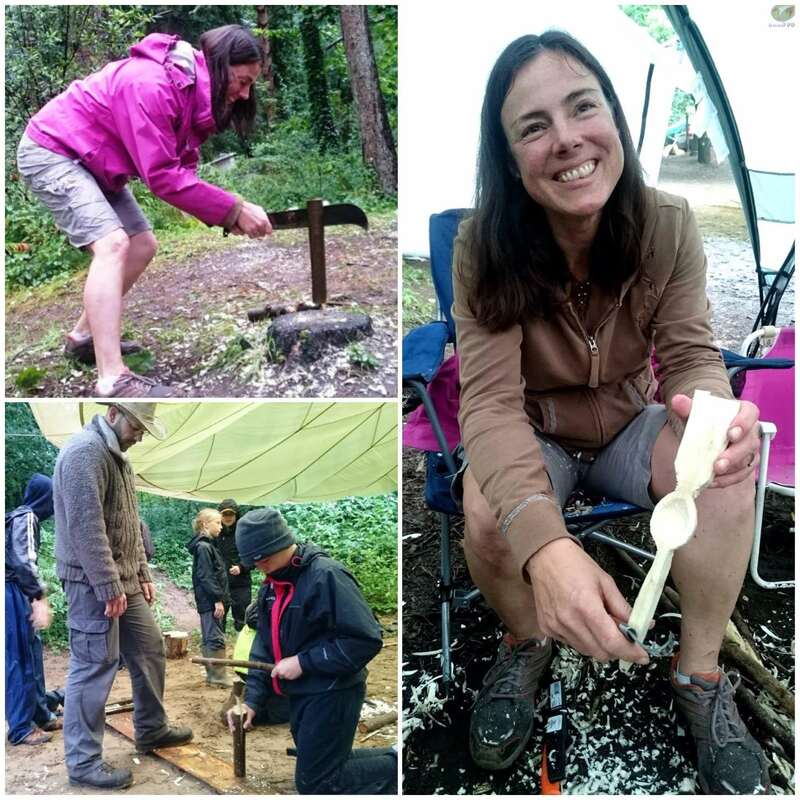 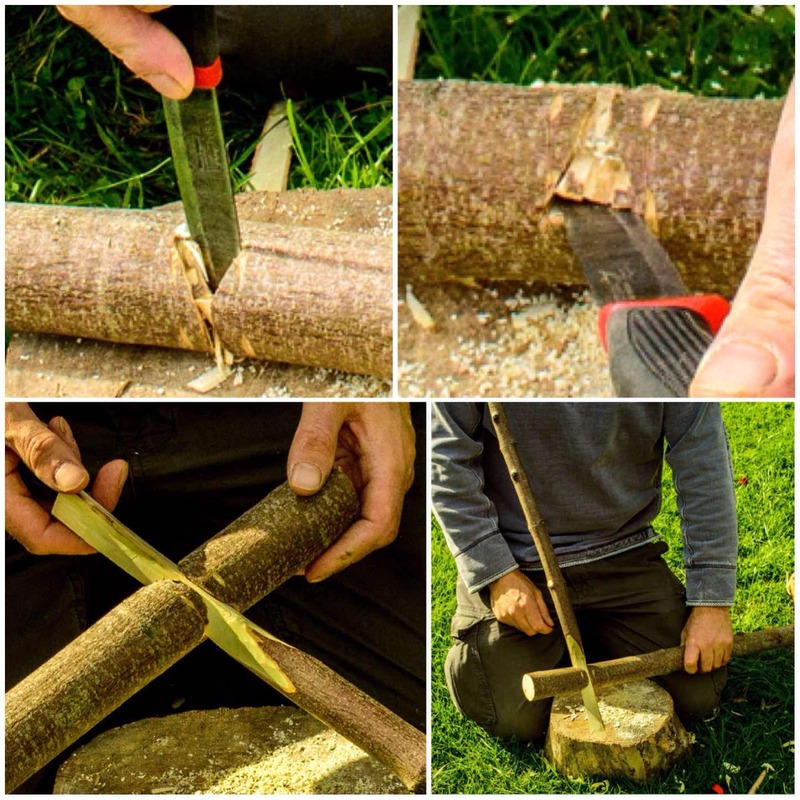 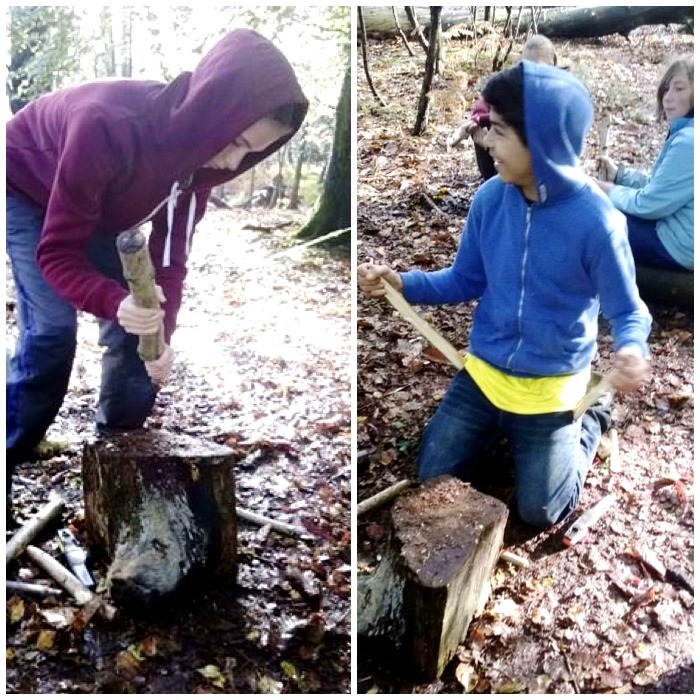 The wedges were needed because the next lesson was about battoning – where you use your knife more like an axe to split small logs. 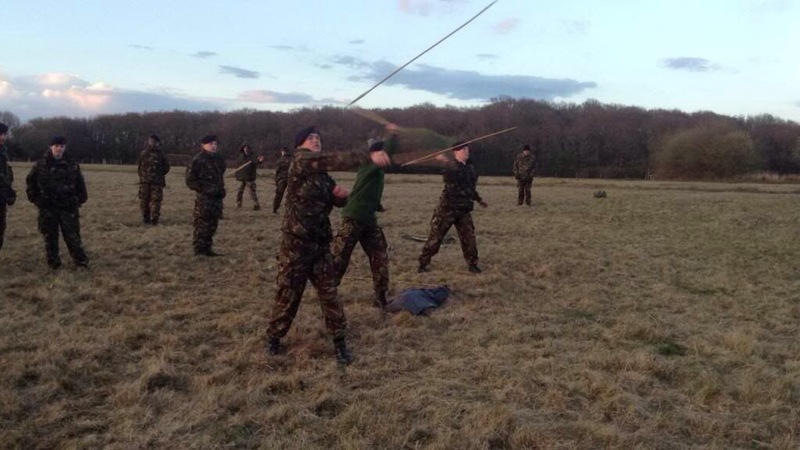 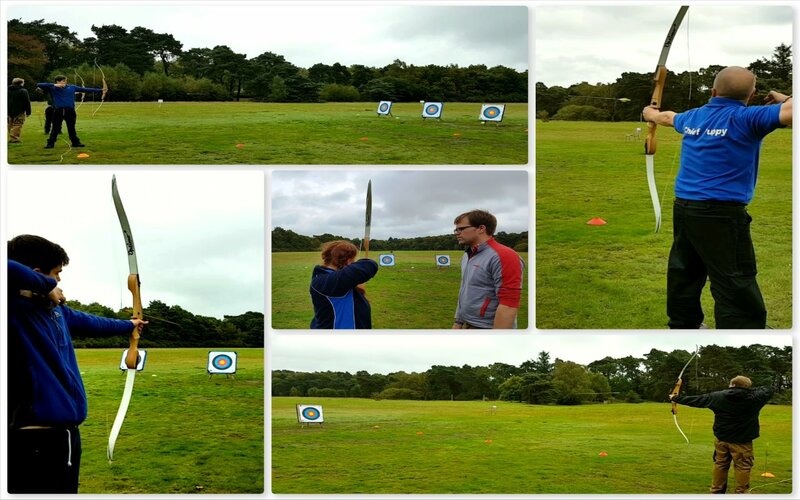 I did a demonstration to the class showing the whole process and then we split into two groups to let the cadets have a go themselves. 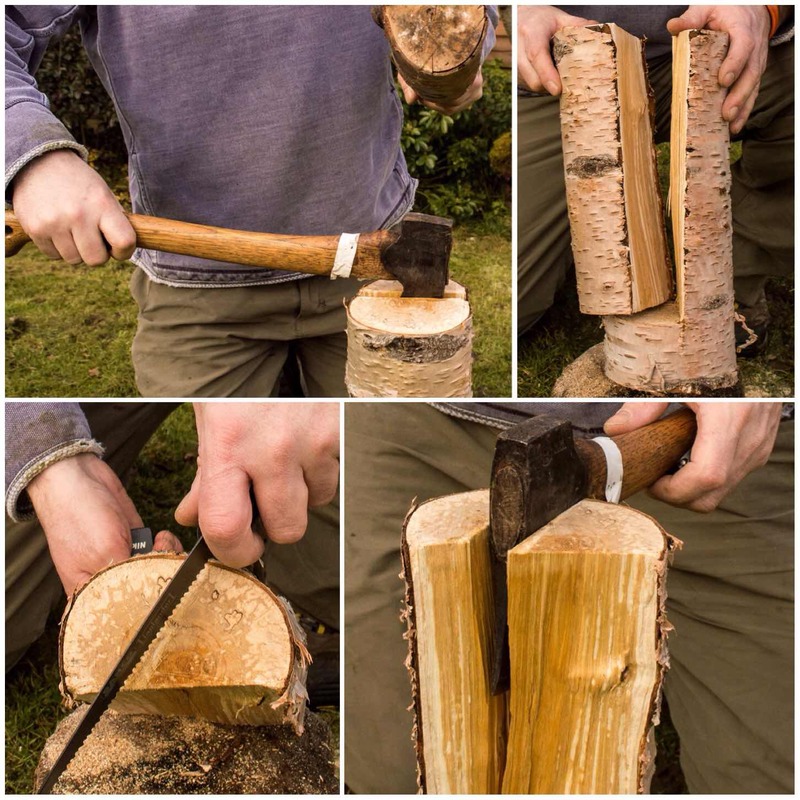 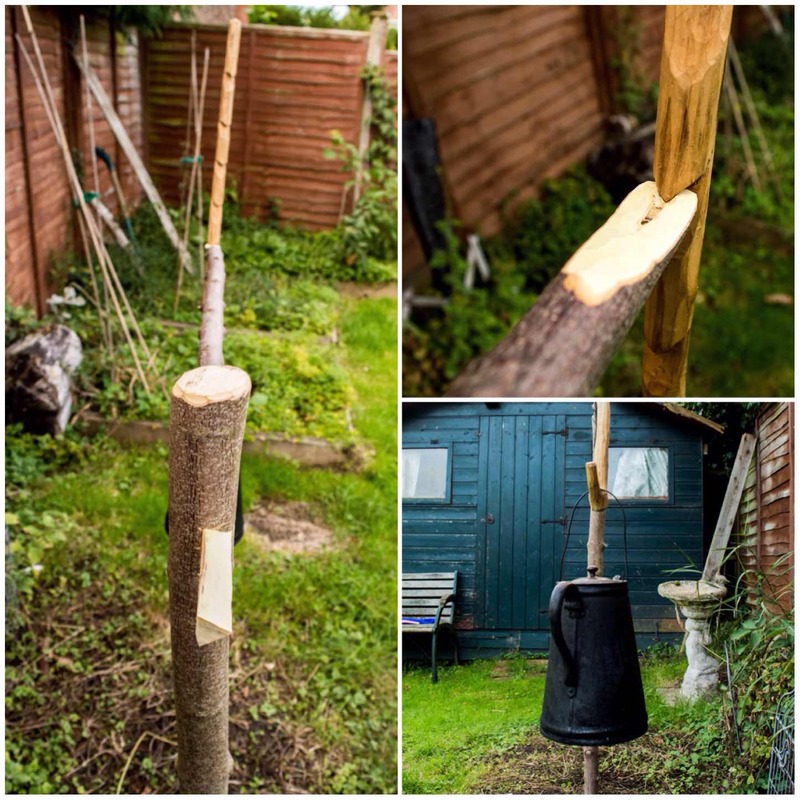 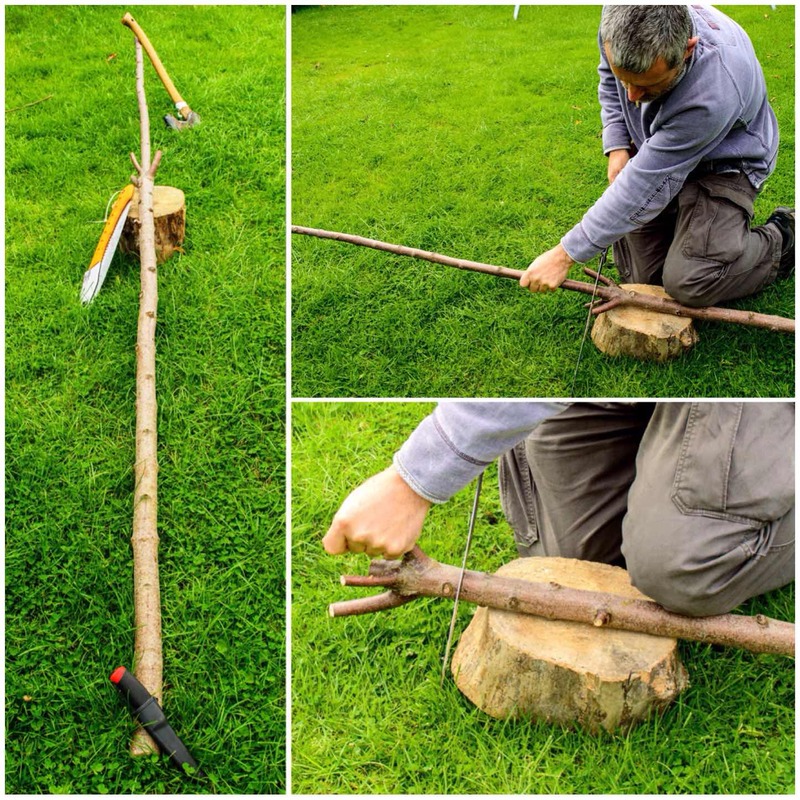 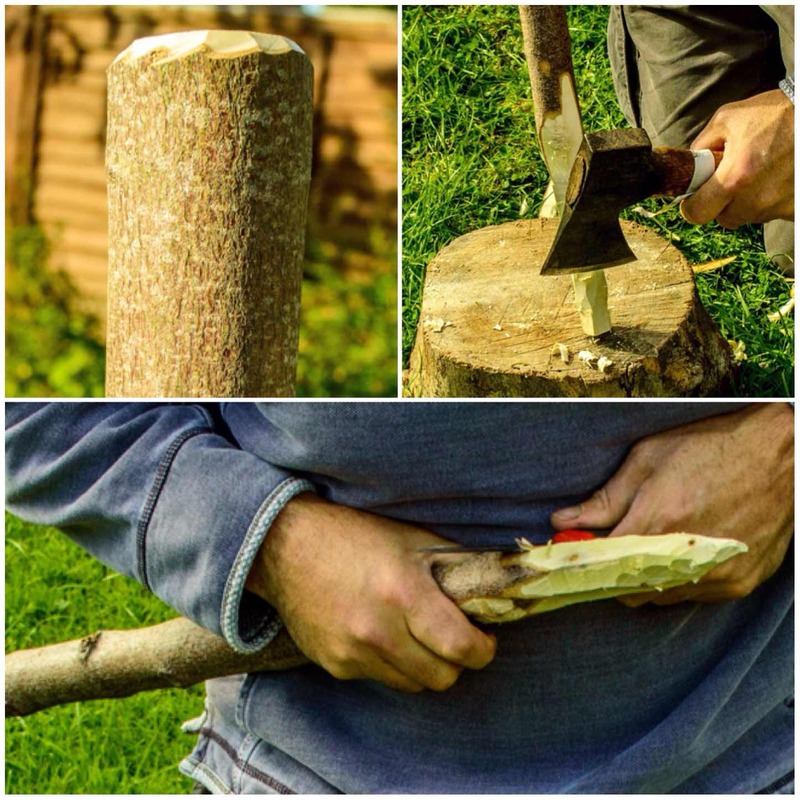 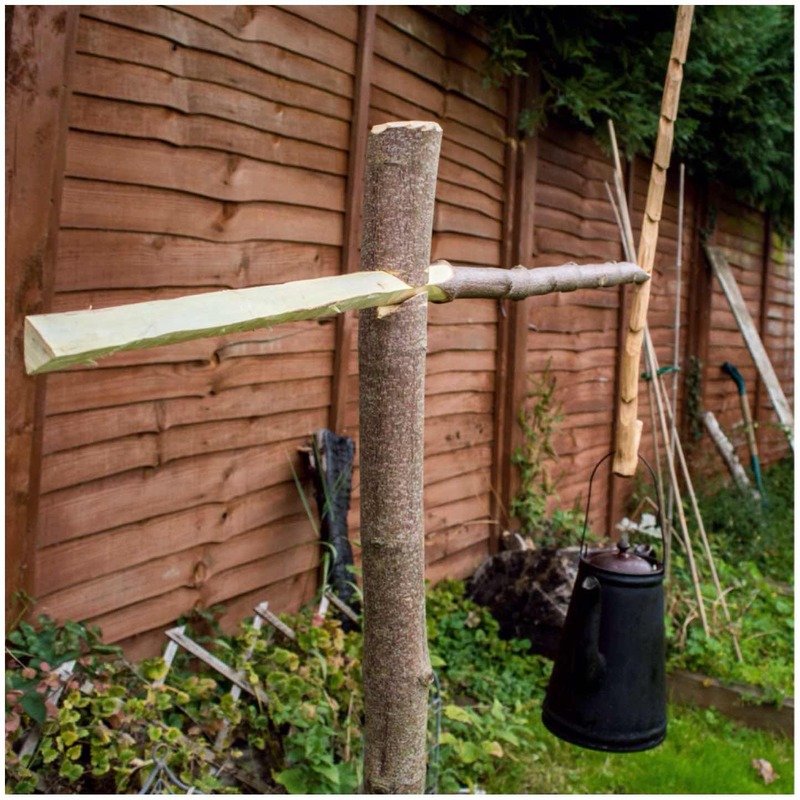 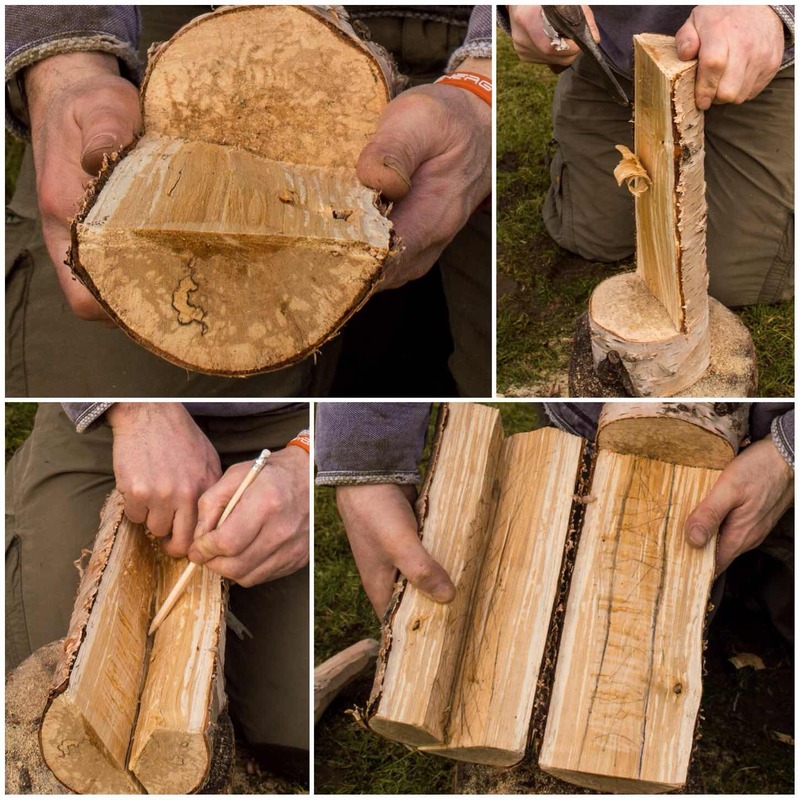 I find battoning is best done kneeling down and with the use of a stump on which to rest the piece of wood that needs to be split. 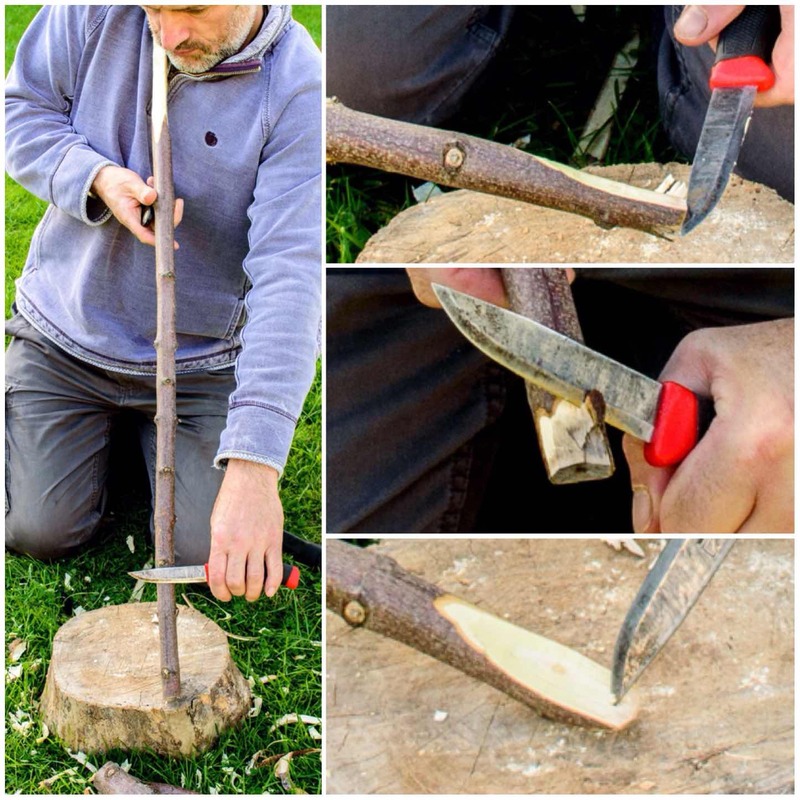 The knife is positioned on top of the piece of wood at 90 degrees to the body and the back of the blade is struck with the ‘hammer’ (a small but weighty stick) so that the edge of the blade is driven into the wood. 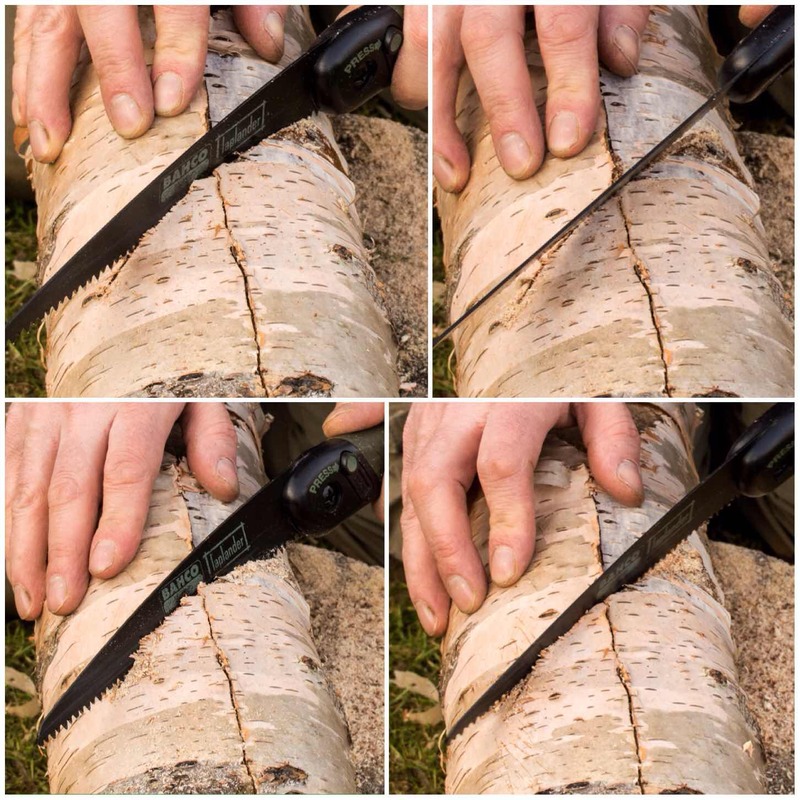 I published an article on knife safety last year that covers battoning in more detail. 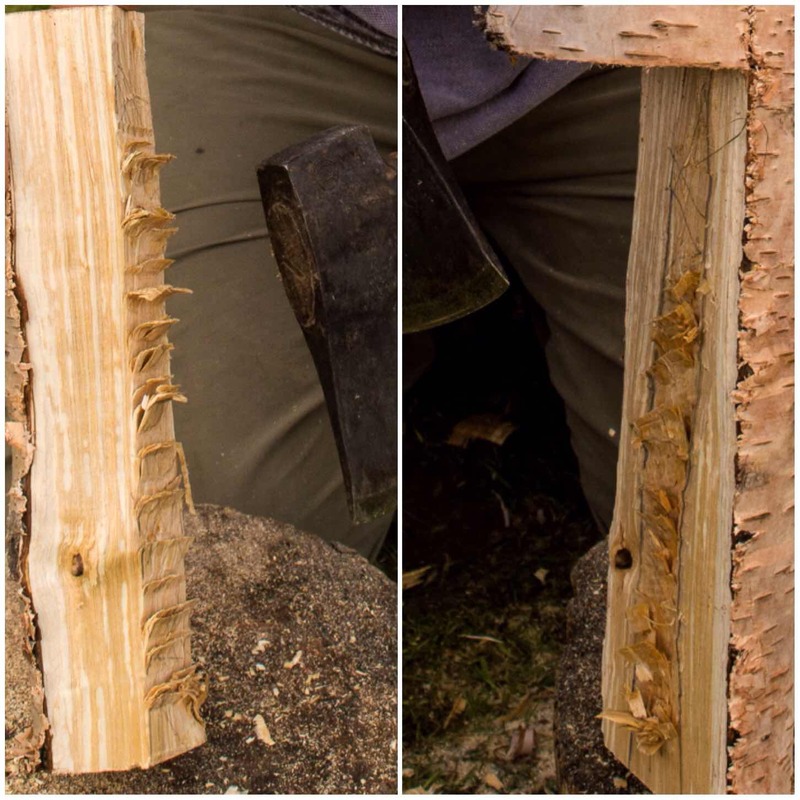 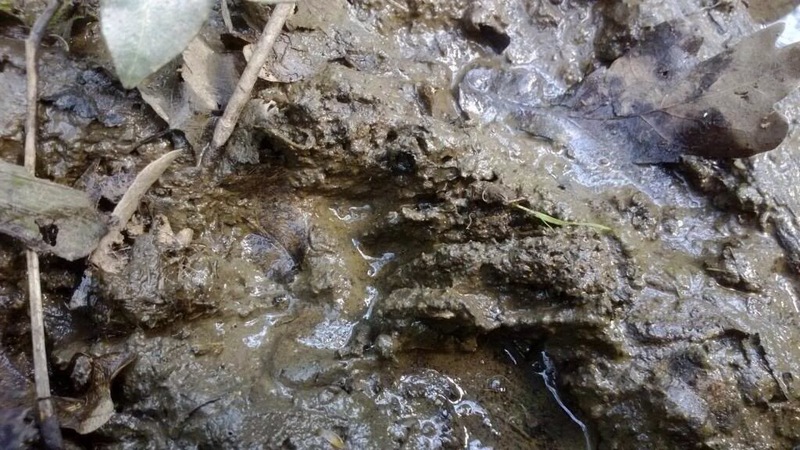 Here you can see that the knives have been driven well into the wood and the wedges are now being used to widen the split further. 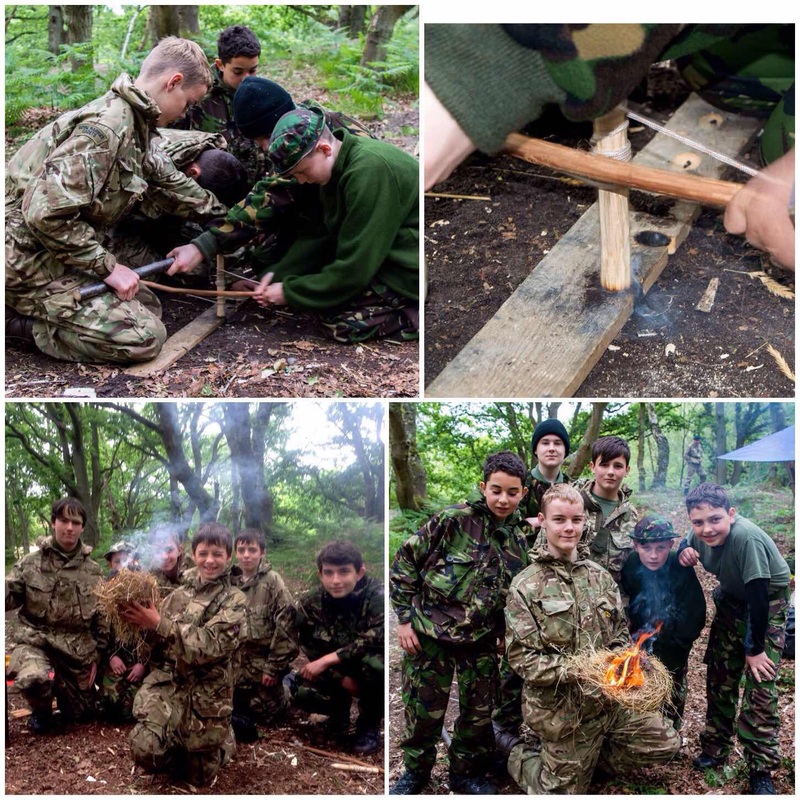 The cadets got the hang of it pretty quickly and were soon splitting the wood down. 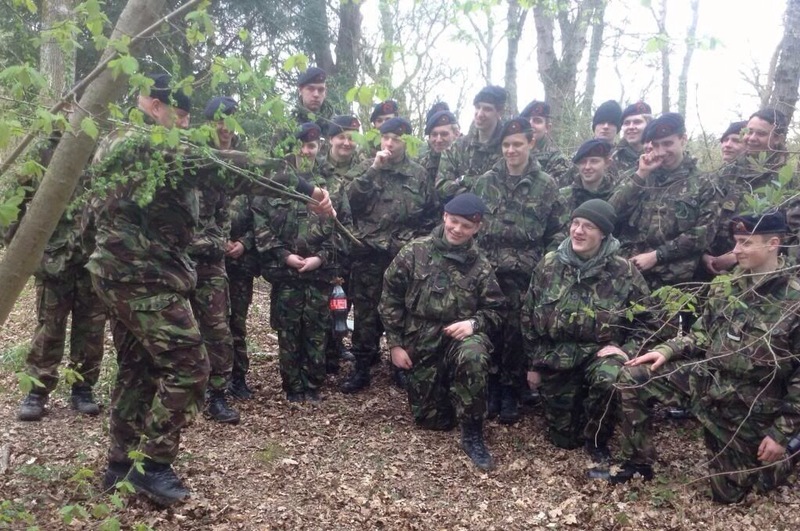 Here the knife has been removed and the cadets are using the stump to help drive the wedge into the wood to split it. 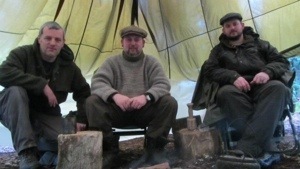 Later that afternoon we started on two shelters. 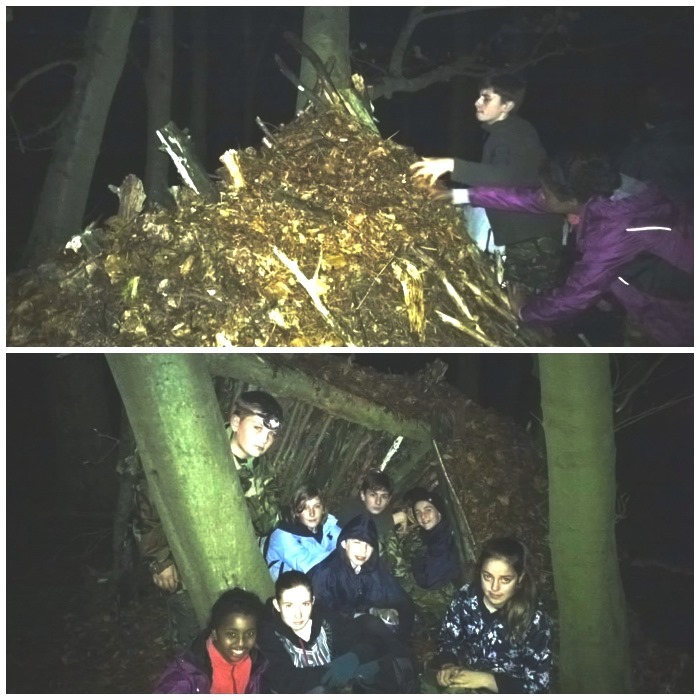 Normally I would ask for volunteers to try and sleep out in them but due to the high winds I did not offer the cadets the option this time. 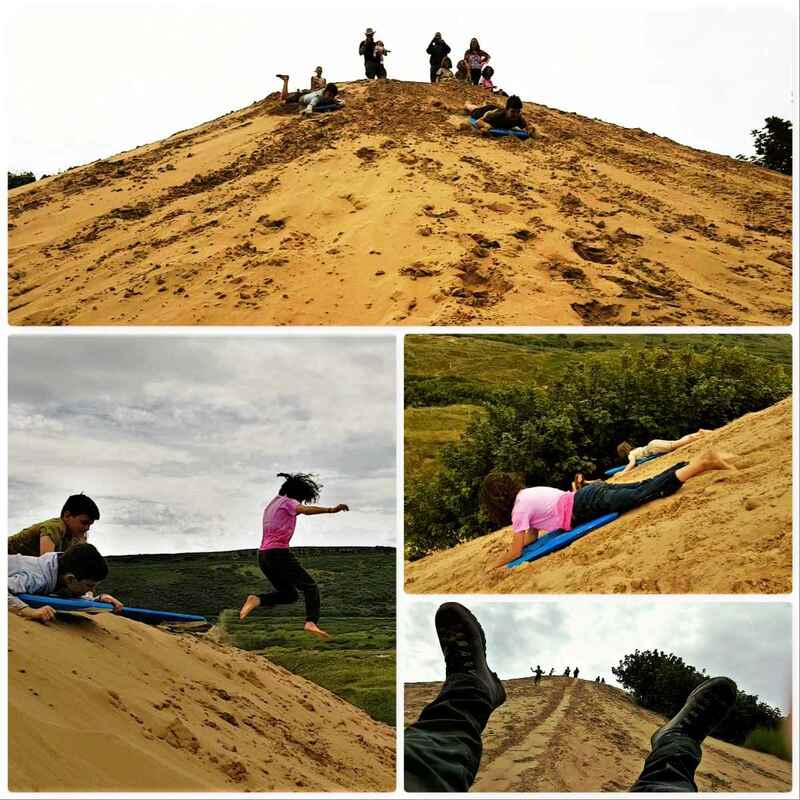 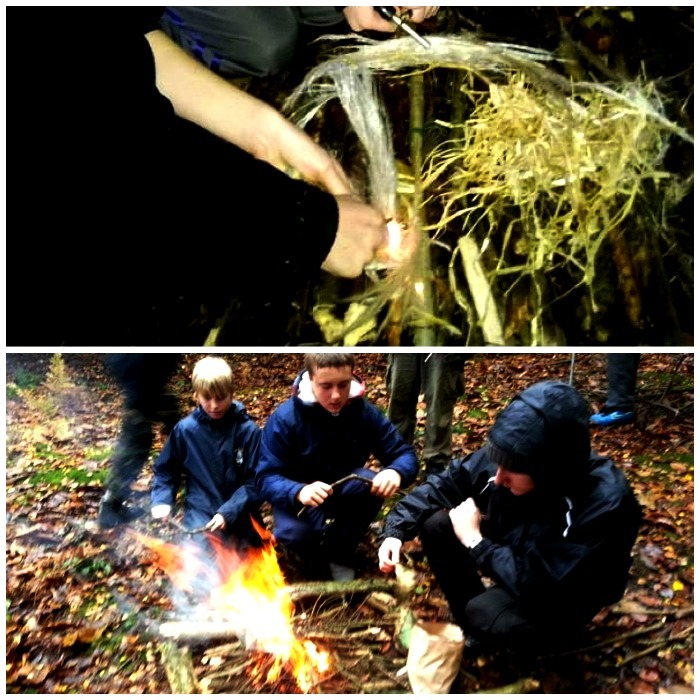 The weather was quite cold, but this activity kept them moving and warm. 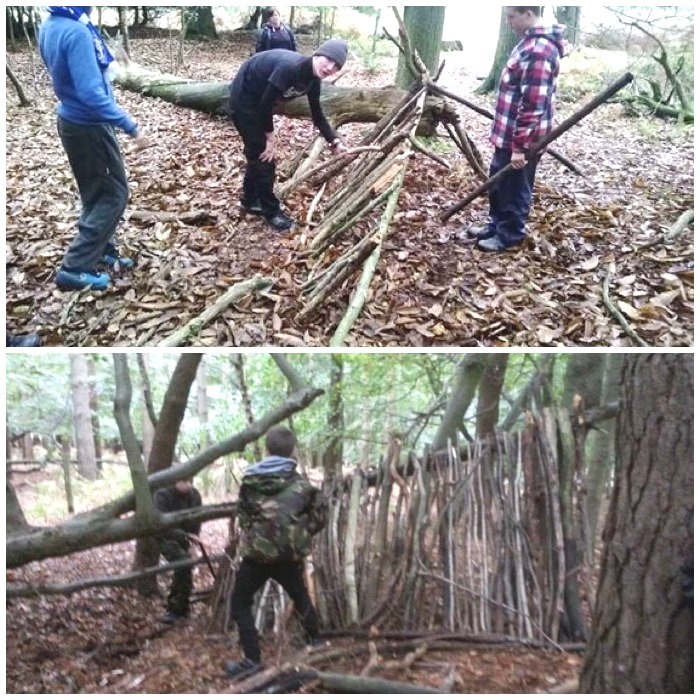 It was not until well after dark that I called a halt to the shelter building but they did a good job and worked well together. 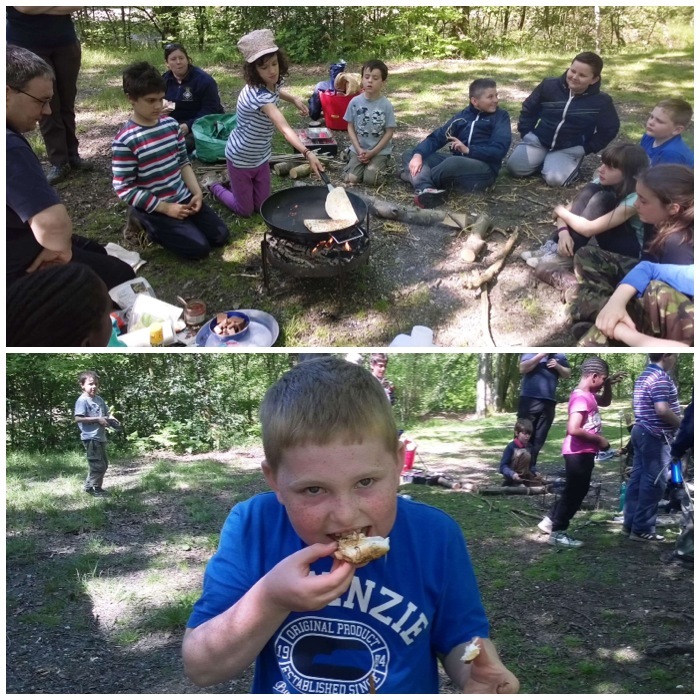 Even though the weather was not kind to them and we worked them hard there was still time to play and chill out around the fire with a marshmallow or two. 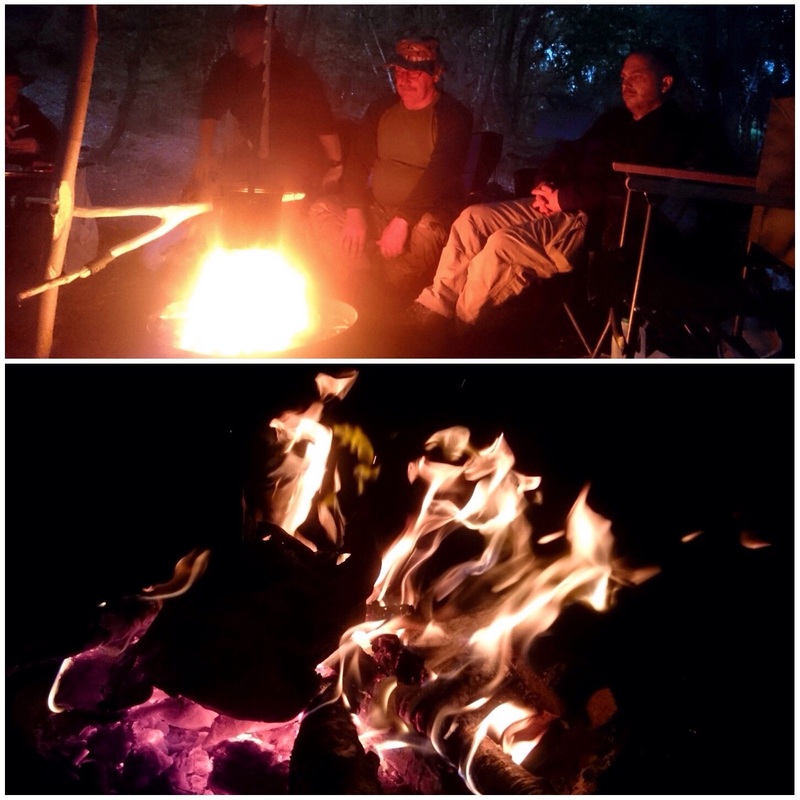 We stayed a couple of hours around the fire before sending the cadets back to the main camp and getting our own heads down. 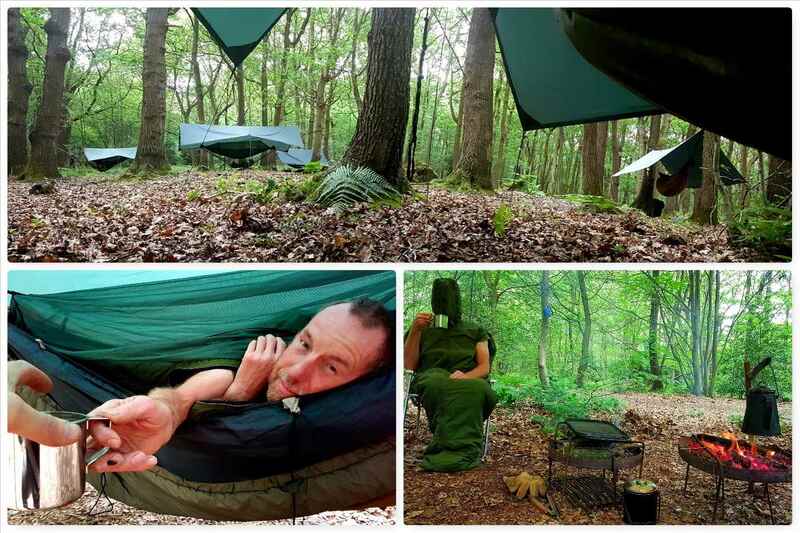 All the instructors stayed in the woods with our hammocks and it was a slightly ‘swaying’ night to say the least with lots of creaking from the trees above us. 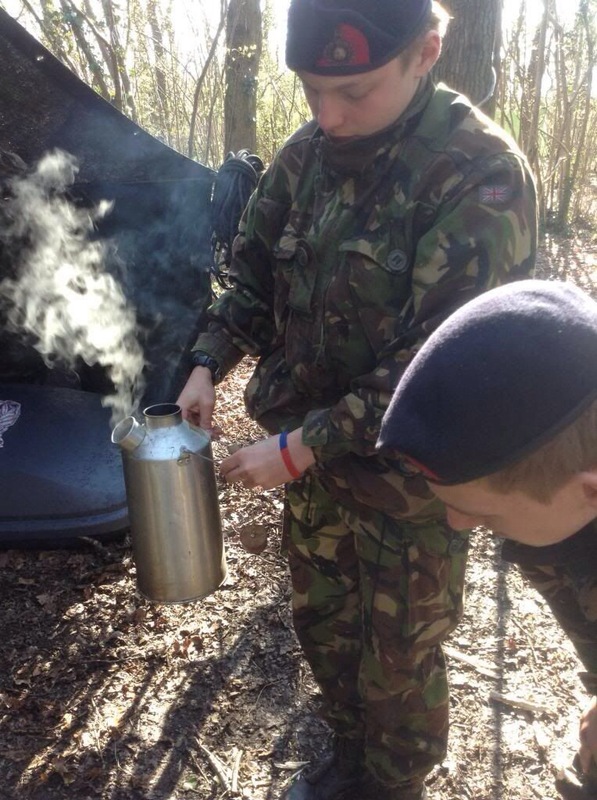 Charlie had a brew on first thing and also showed the cadets how to use the Kelly Kettles safely. 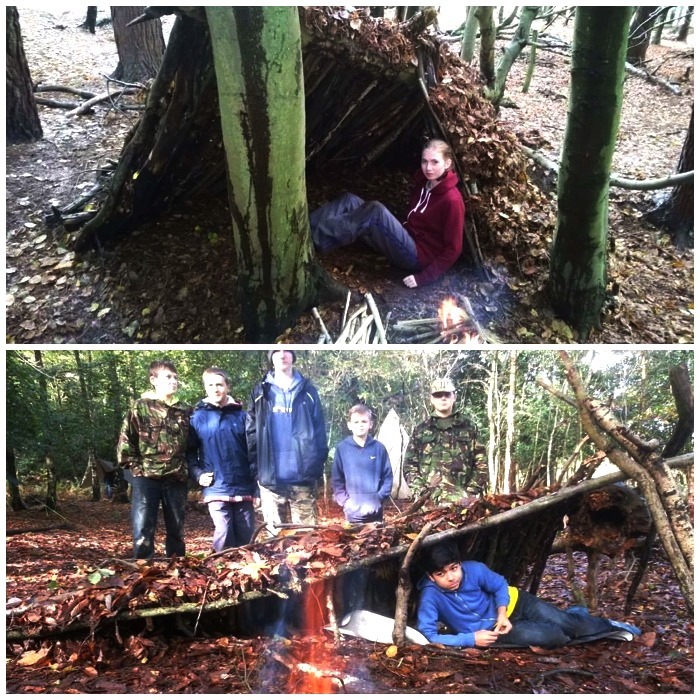 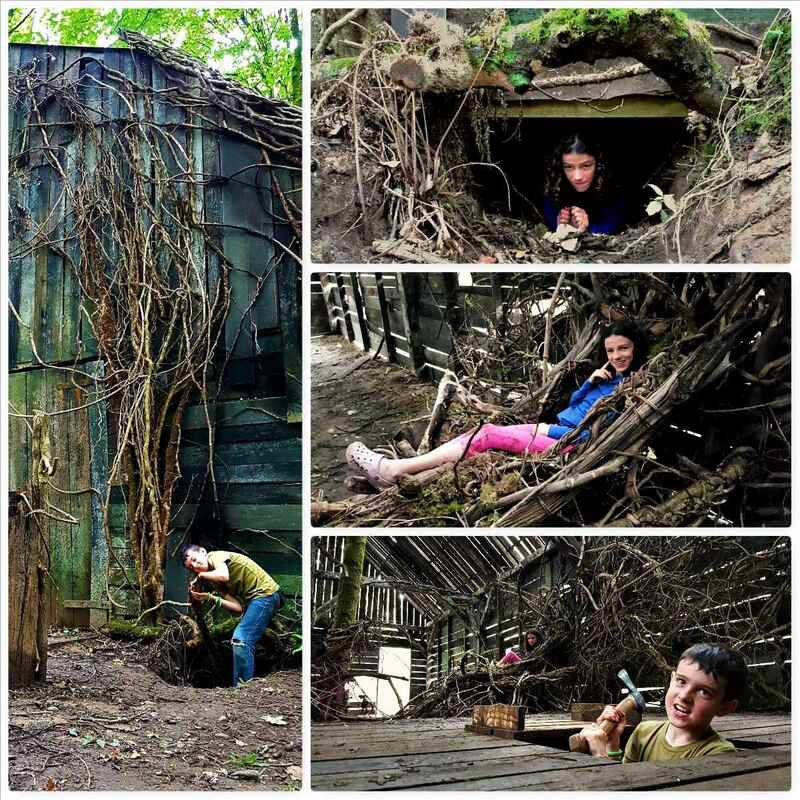 There was time for a couple of posed pictures in front of the shelters before the cadets dismantled them both and scattered the debris back around the site so as to leave no trace of them. 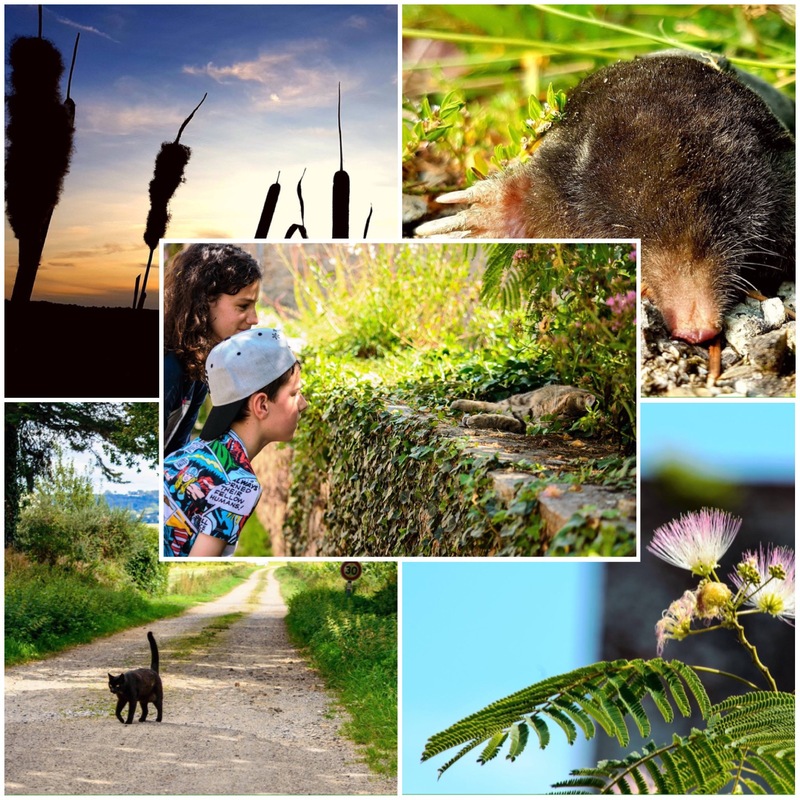 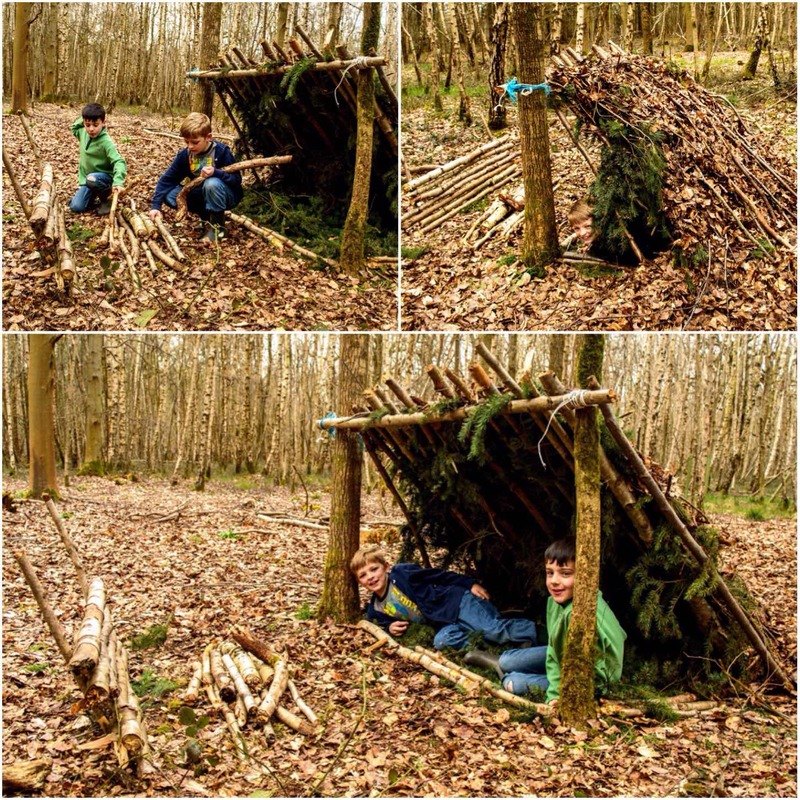 Apart from becoming unstable if left up, shelters tend to attract rodents to the site (since it’s not just humans who seek shelter) – so down they came. 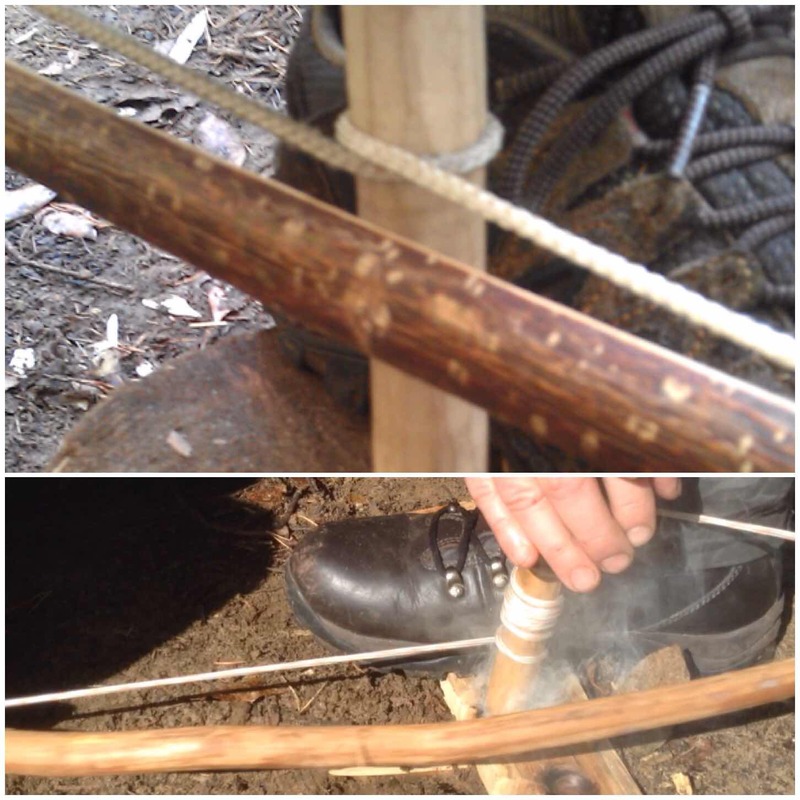 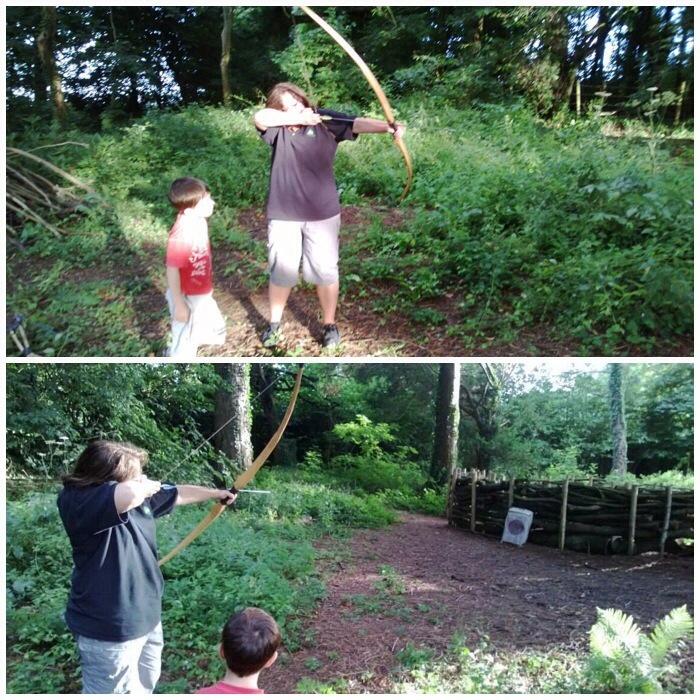 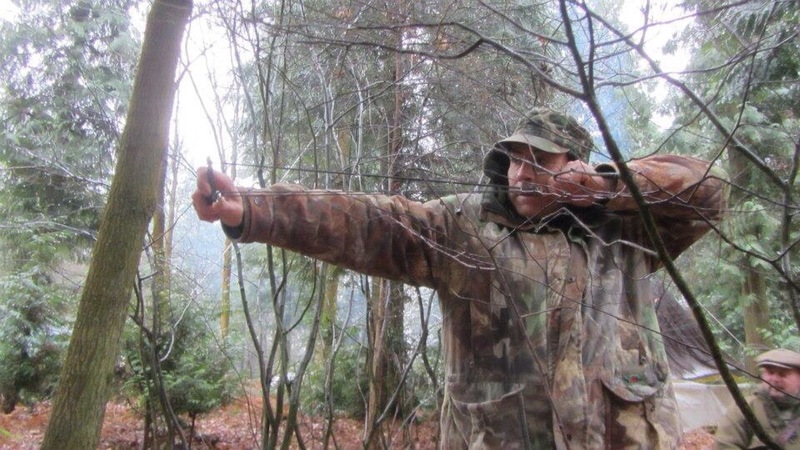 For the next couple of hours it was time for Atlatls, bows and stalking games. 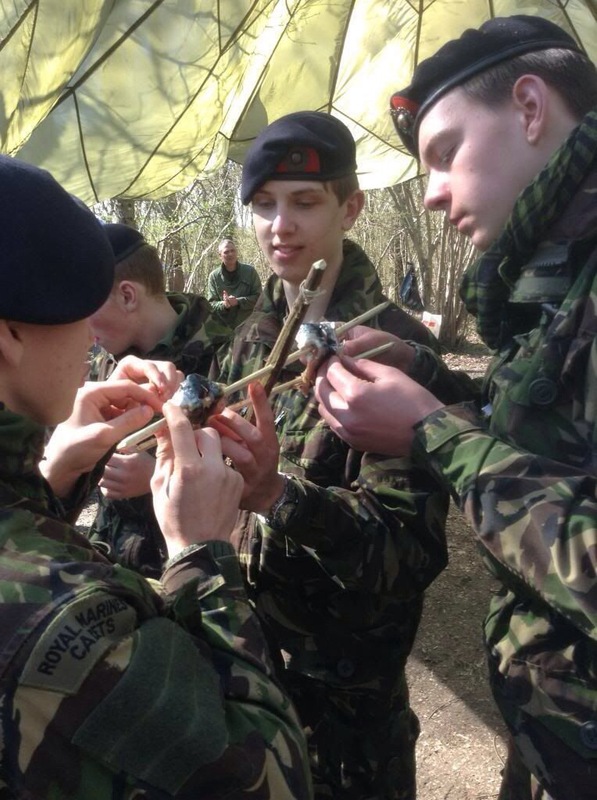 Once the cadets got their eye in some had pretty good groupings. 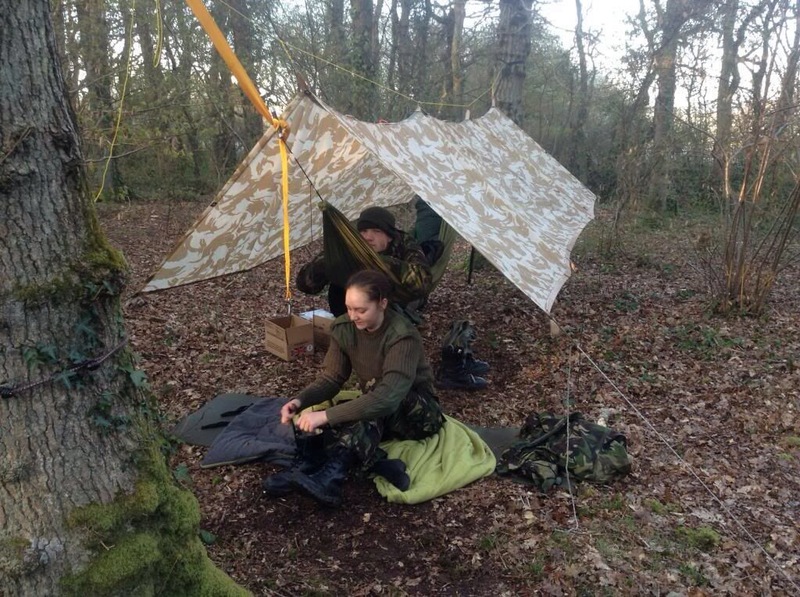 Even though the cadets did not get to use the hammocks and tarps this time we did get some out for them to try. 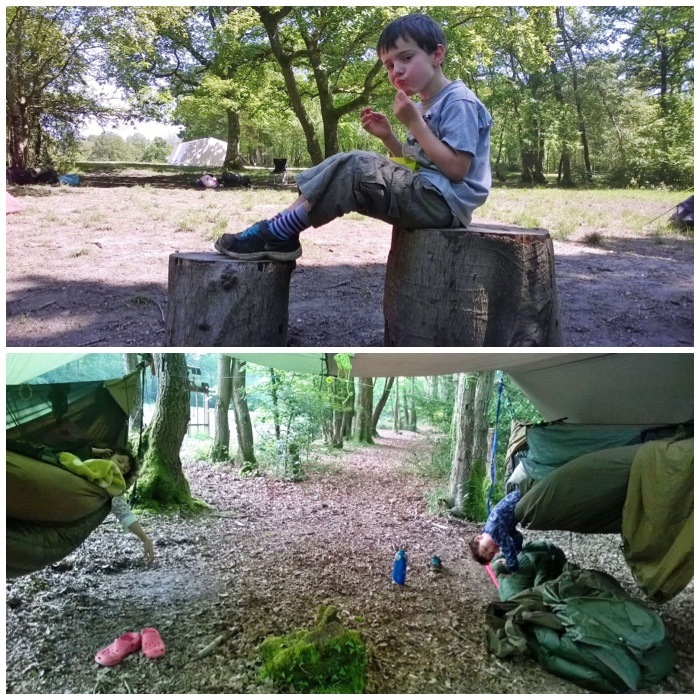 The final part of the weekend was to return the campsite to the condition we found it in, if not better. 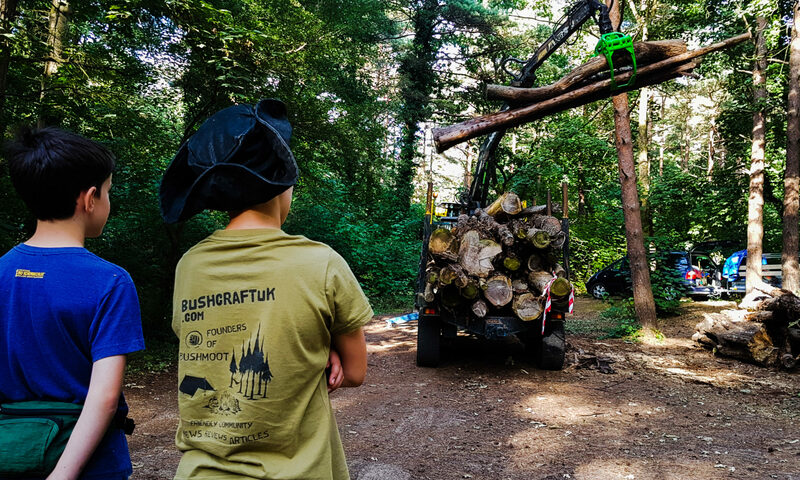 This was the easy part of the weekend as the teams were now working well together and everything was stripped down and packed away quickly. 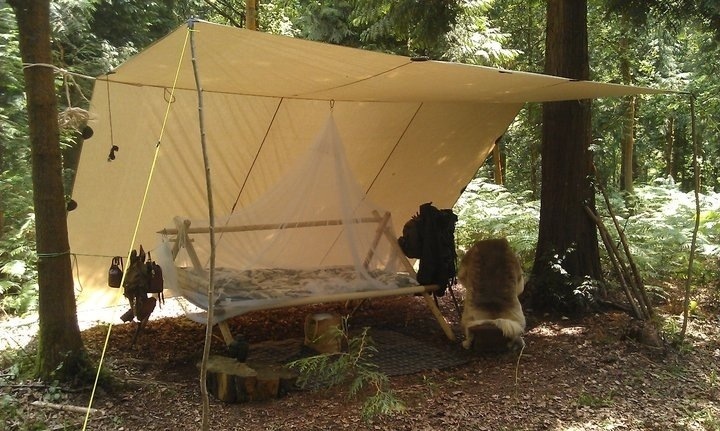 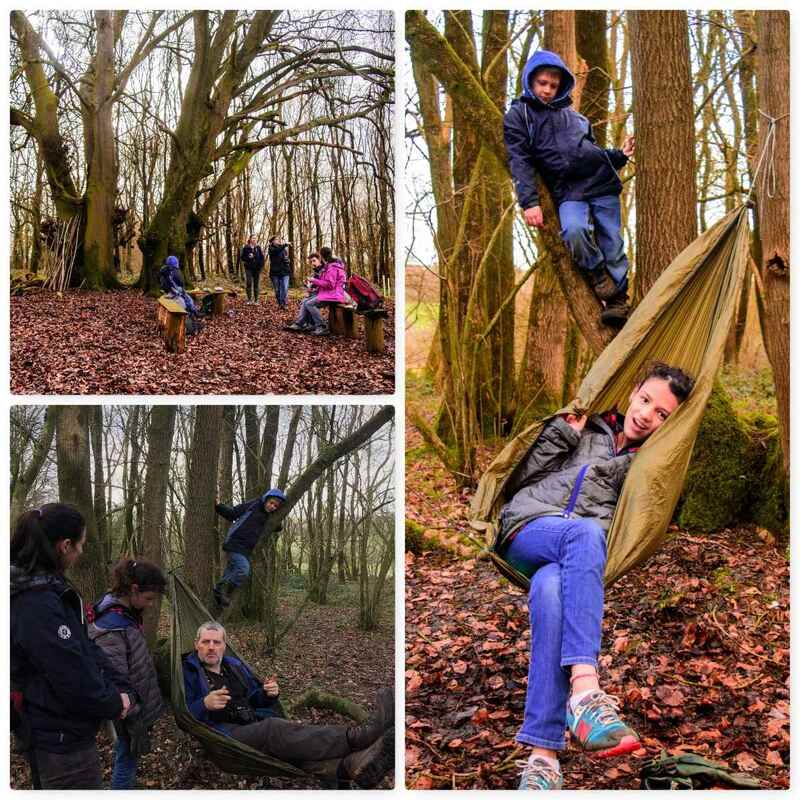 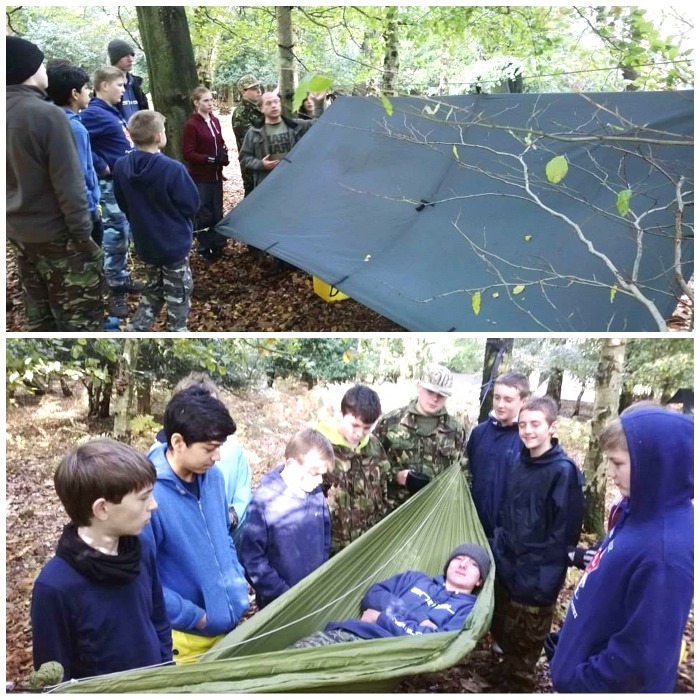 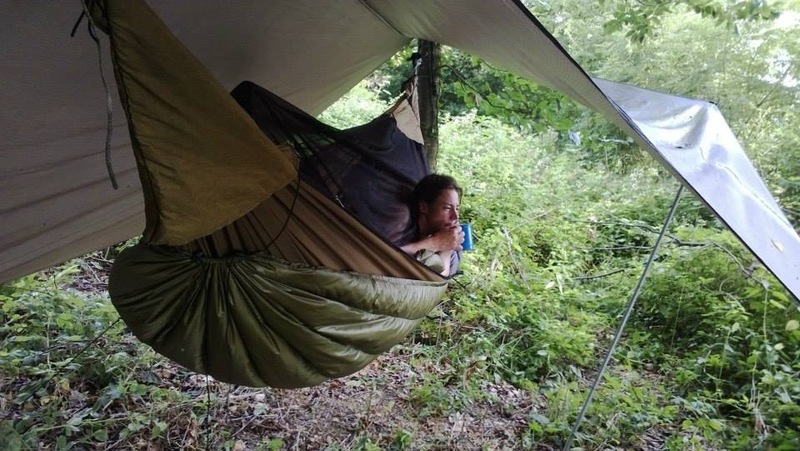 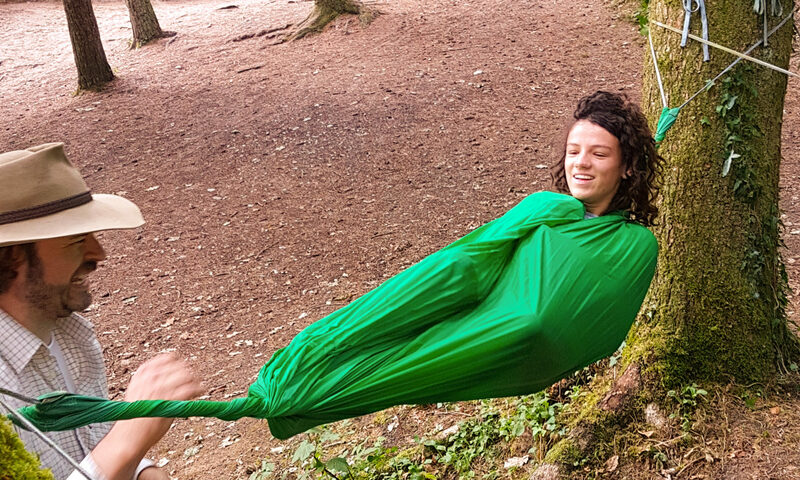 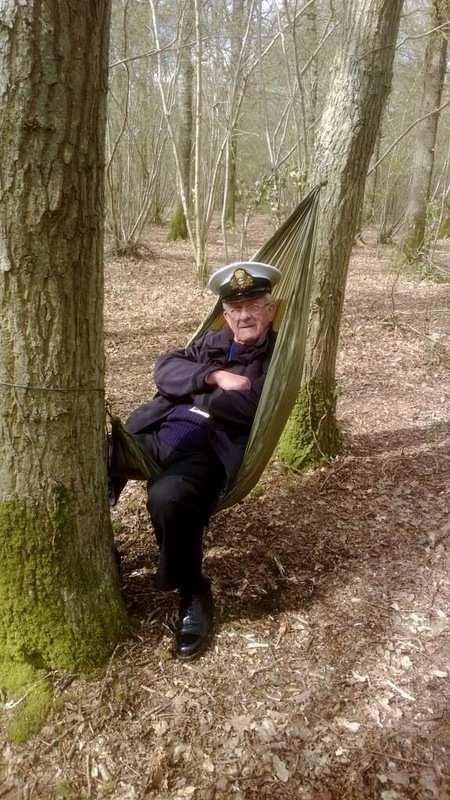 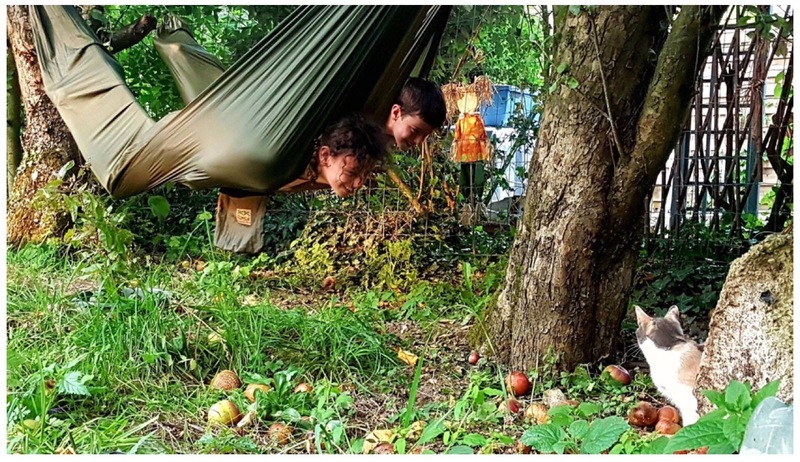 I hope to run one or two more bushcraft courses for the cadets this year and give them the chance to sleep out in a hammock. 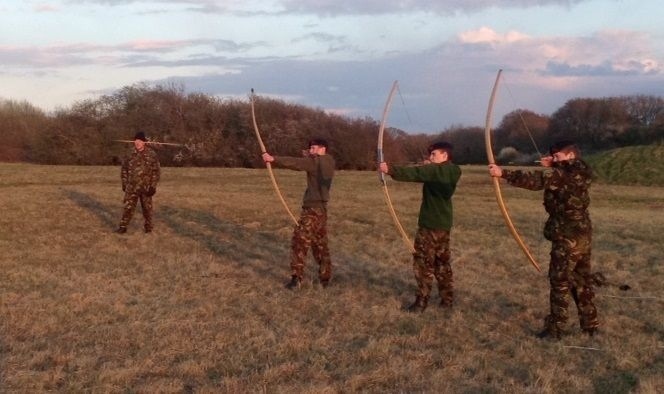 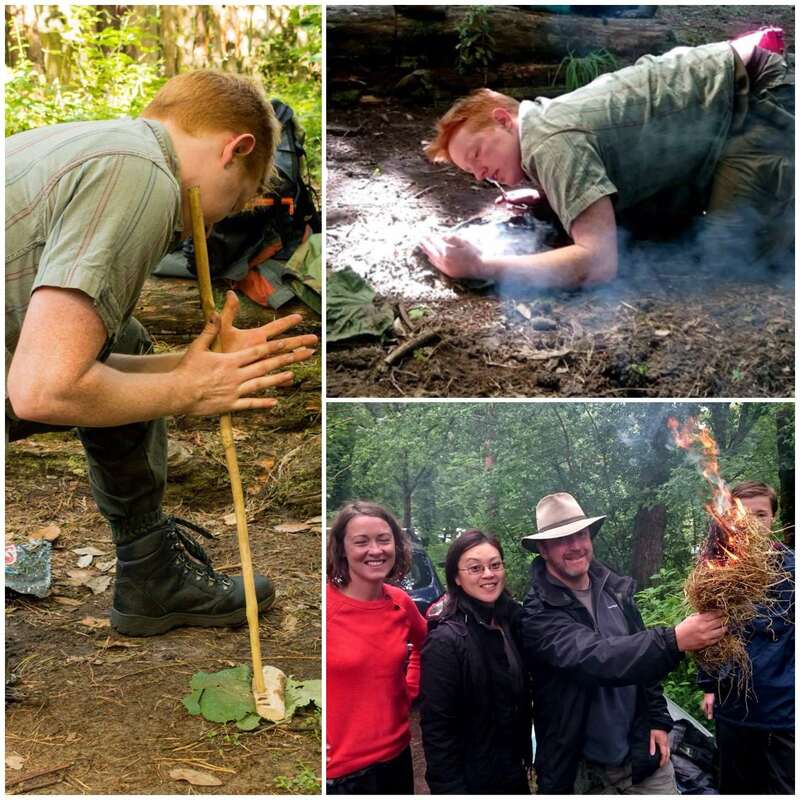 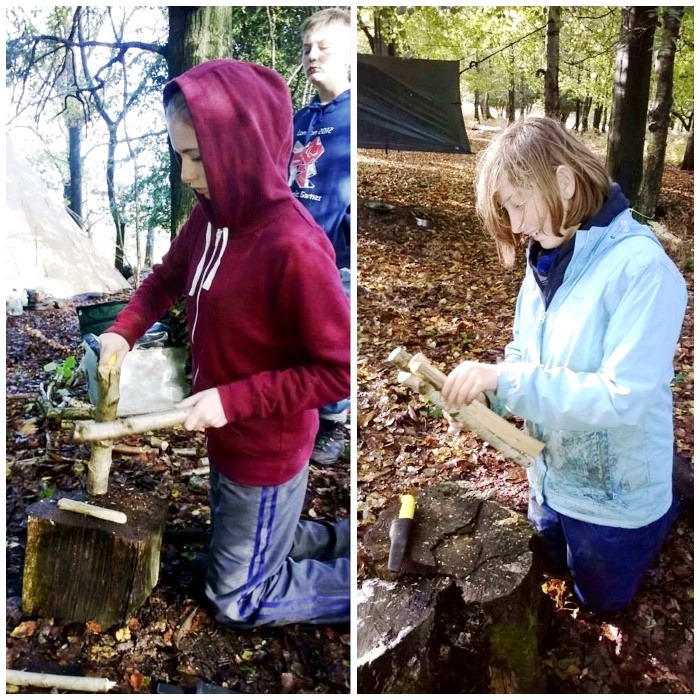 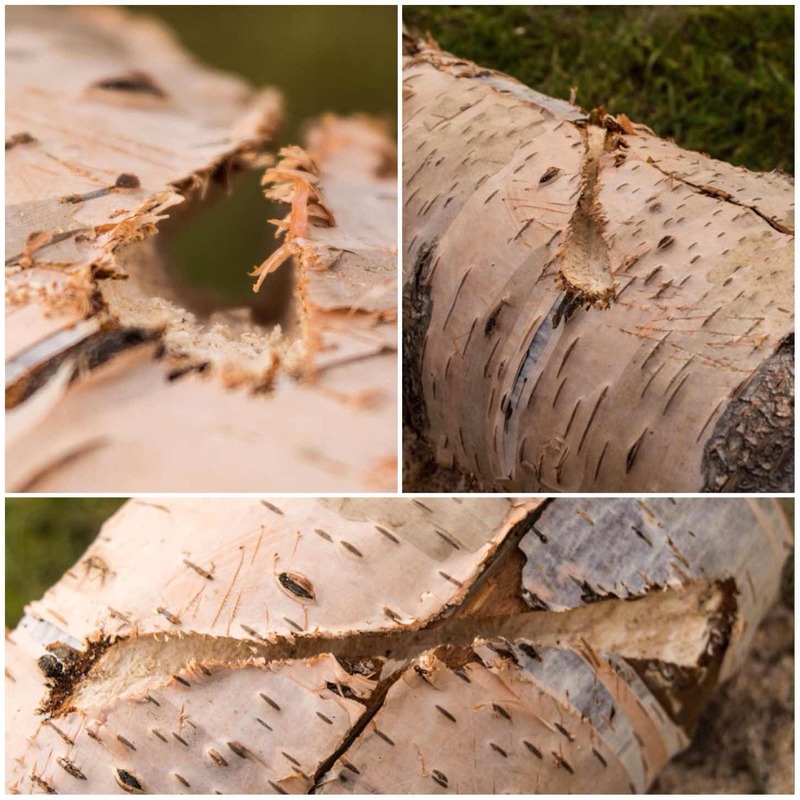 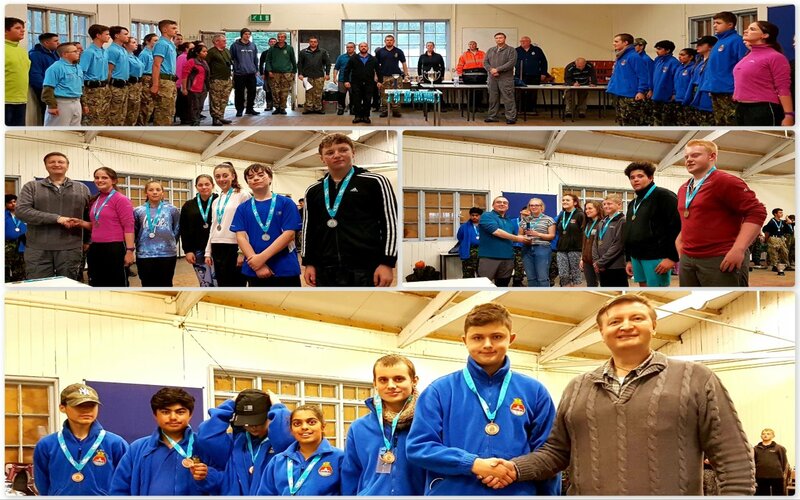 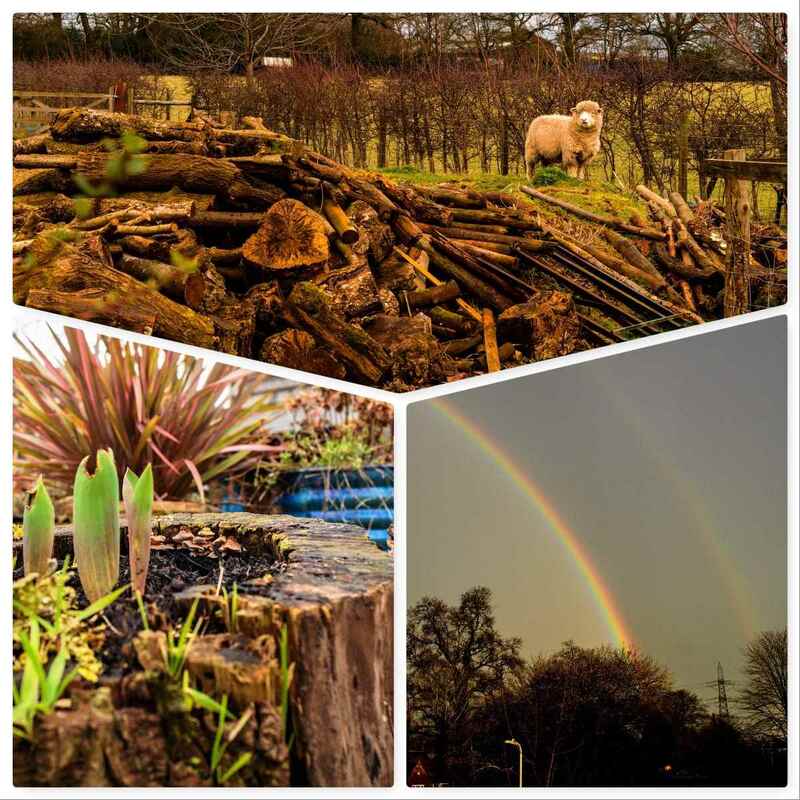 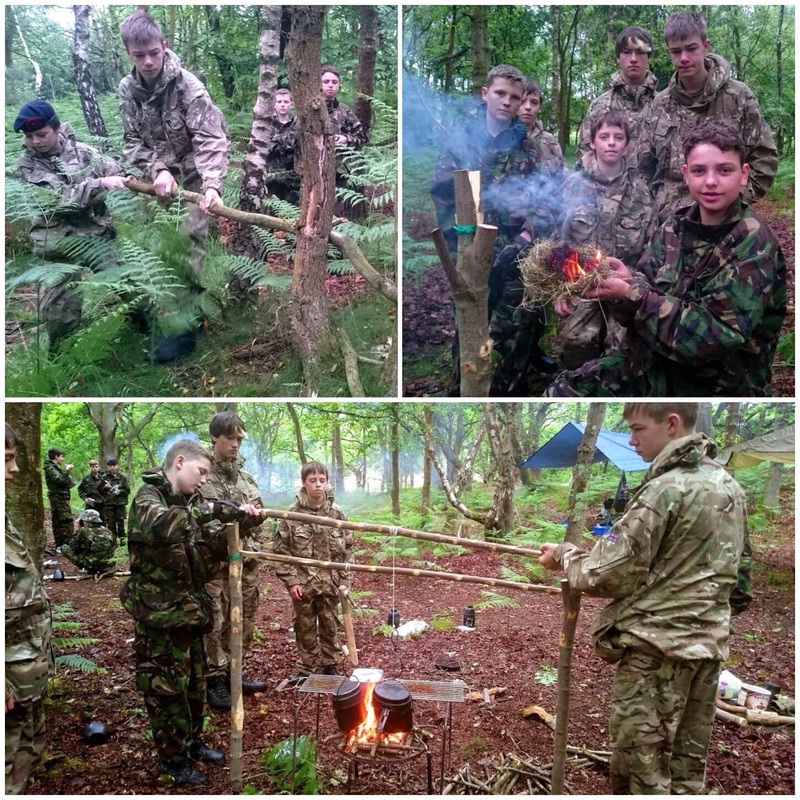 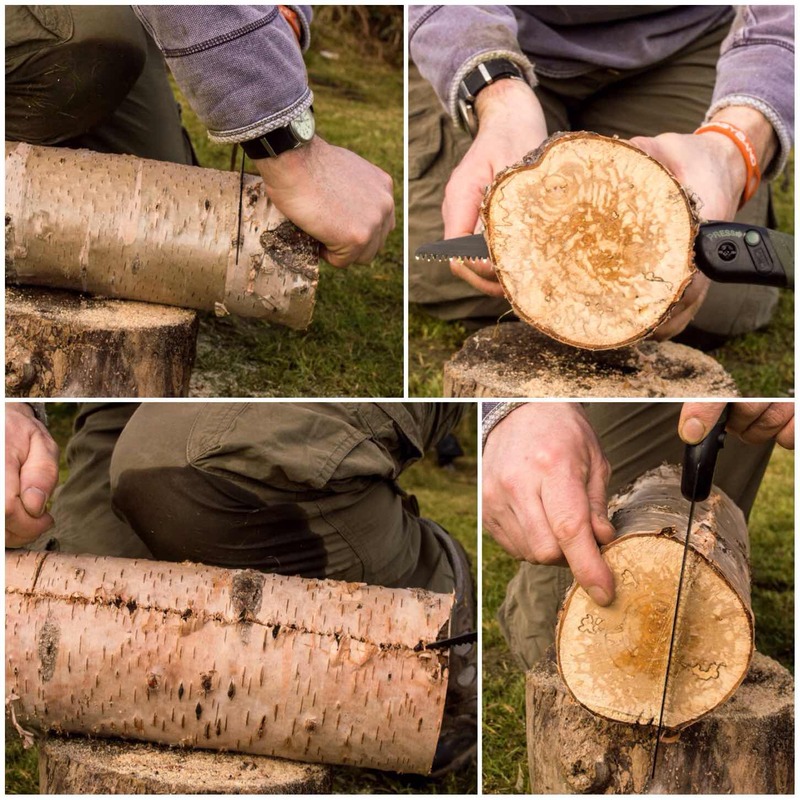 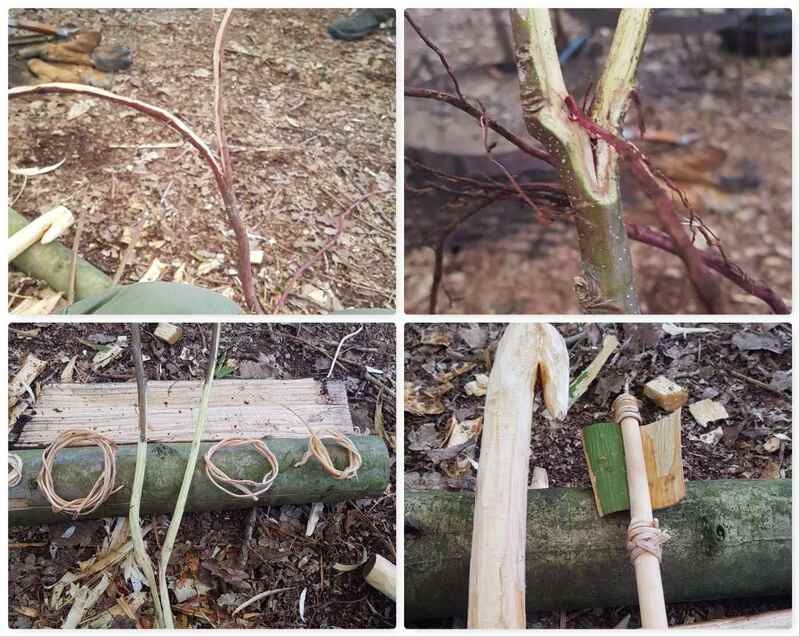 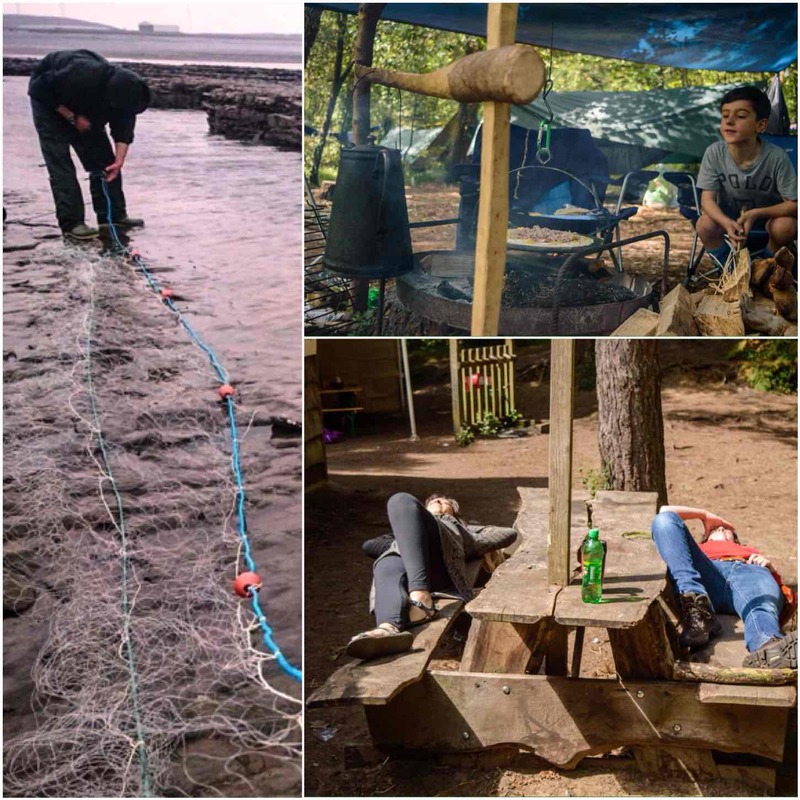 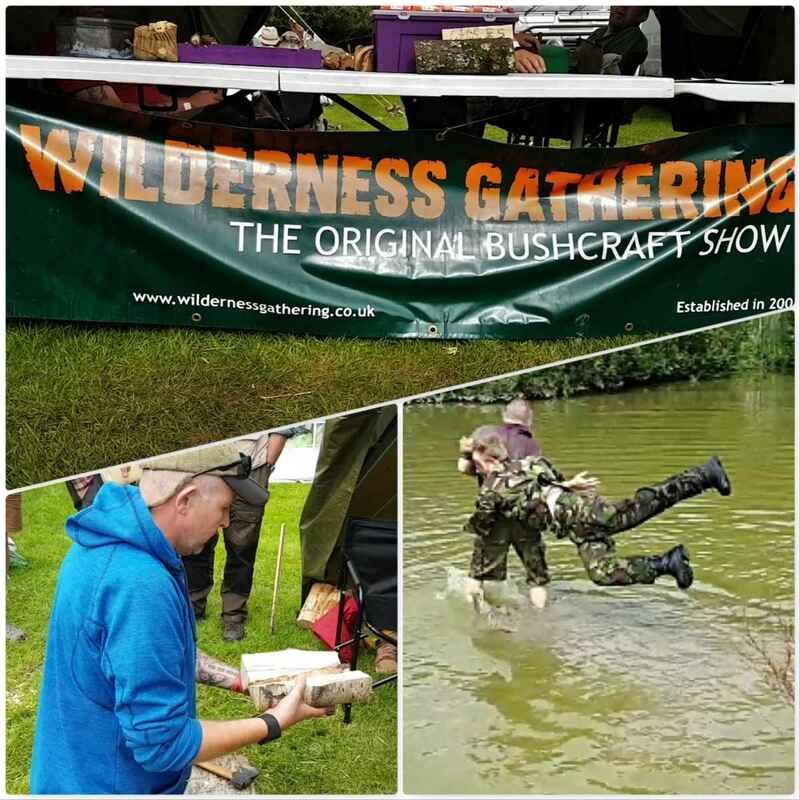 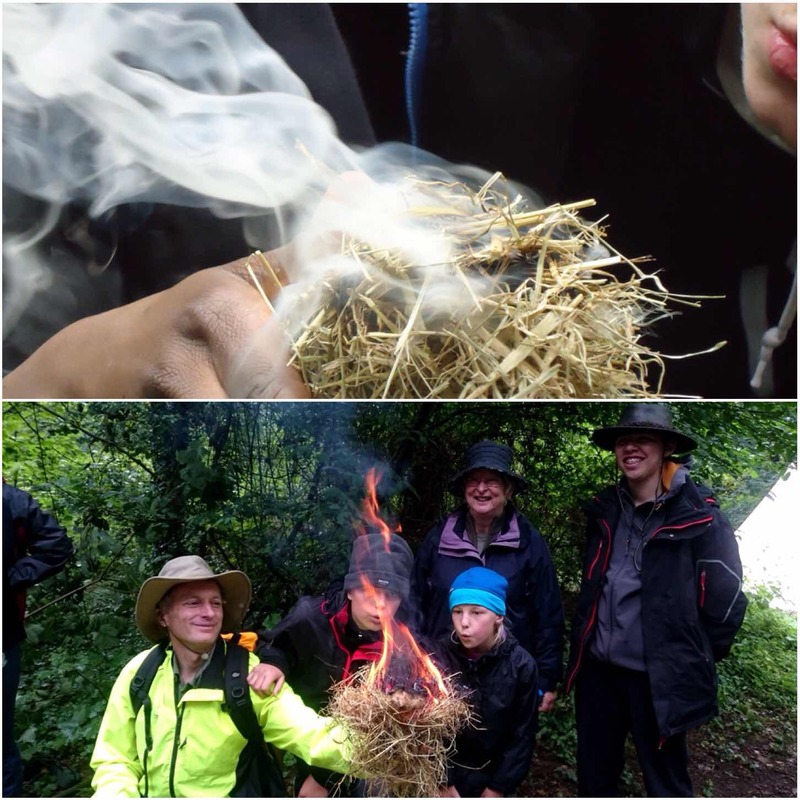 Even though the weather was against us this time the cadets knuckled down, worked hard, had great fun and made things comfy for themselves – that’s bushcrafting for you. 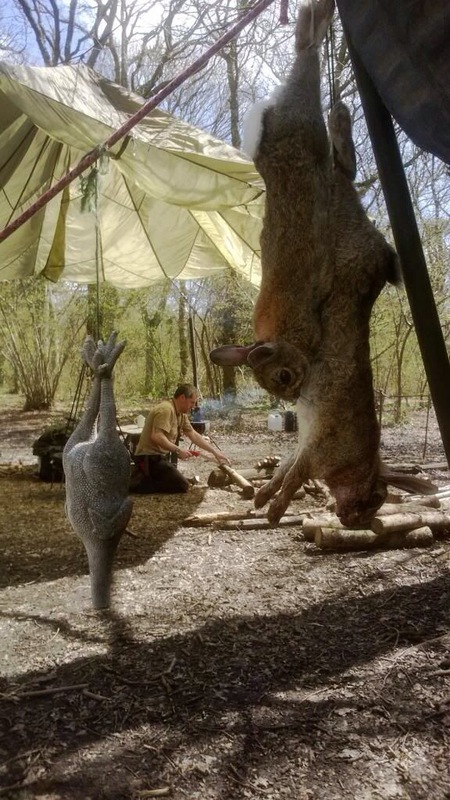 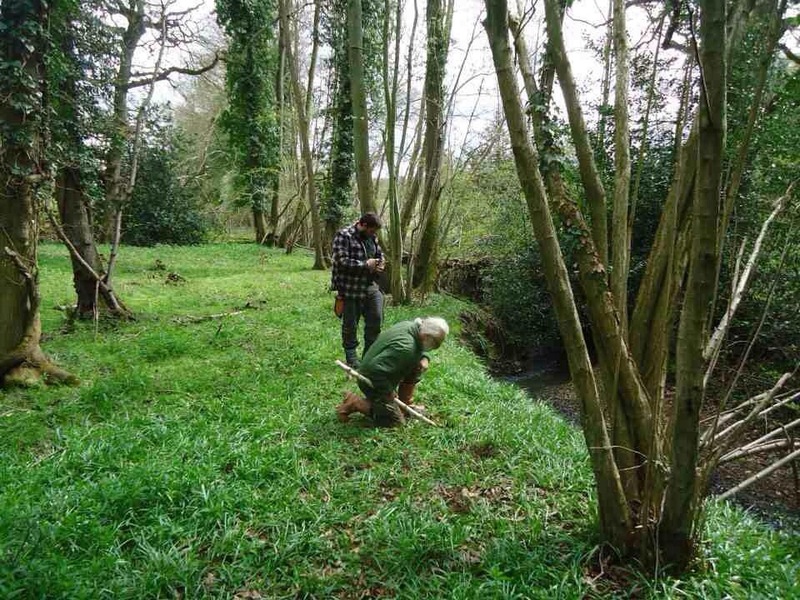 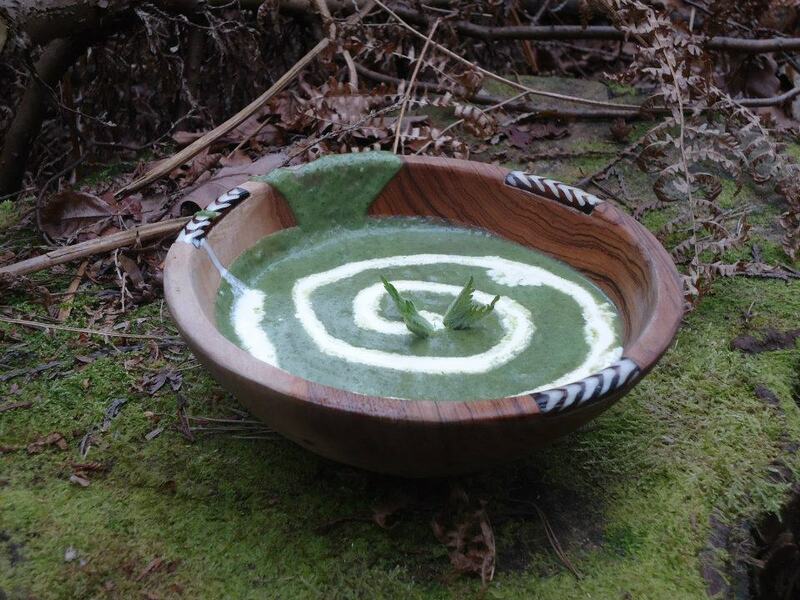 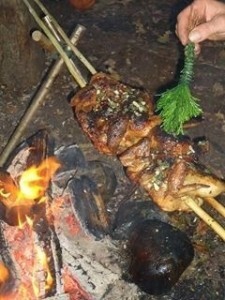 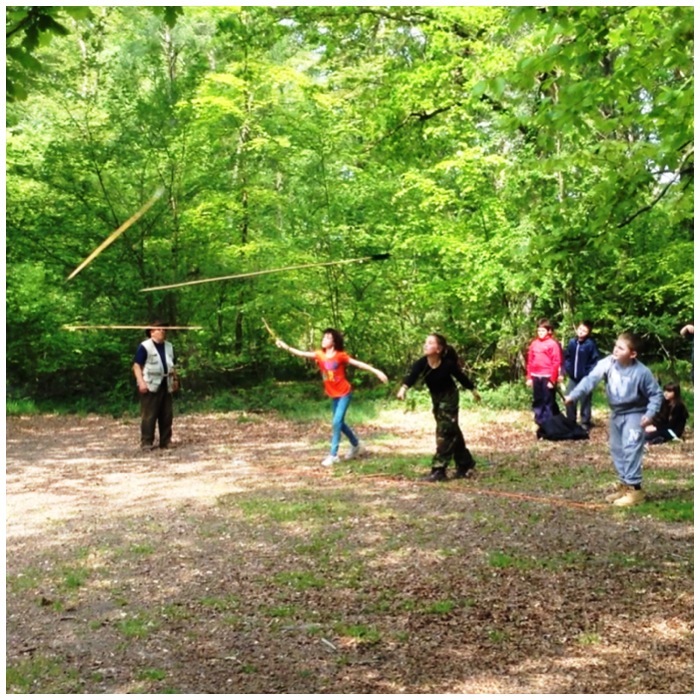 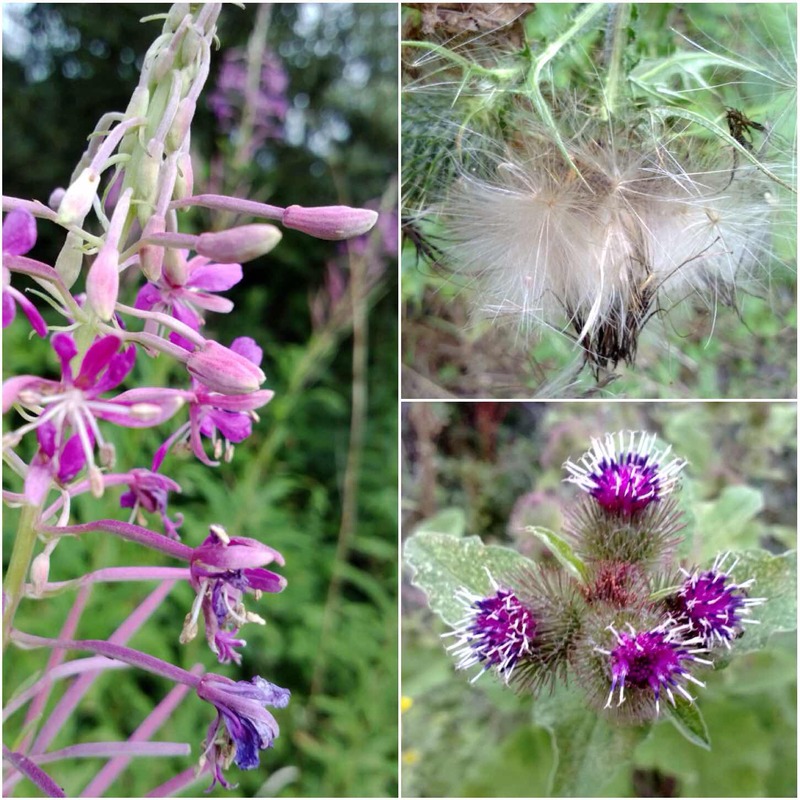 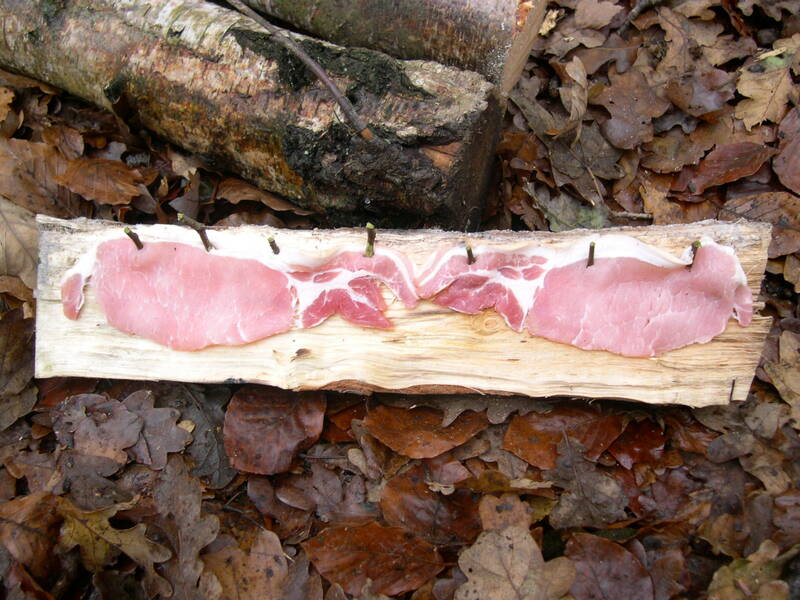 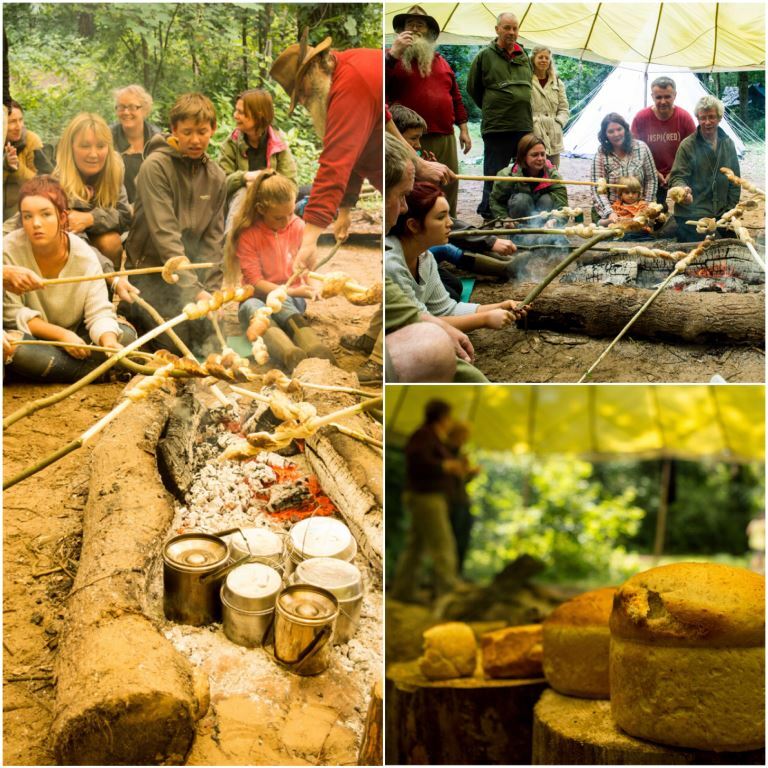 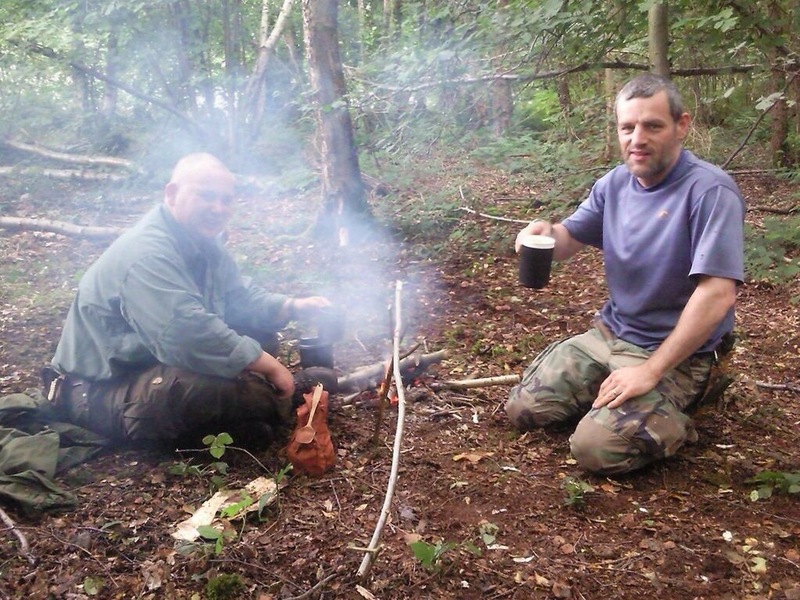 Since about 2007 one of my local Bushcrafting locations has been in the woods near Silchester. 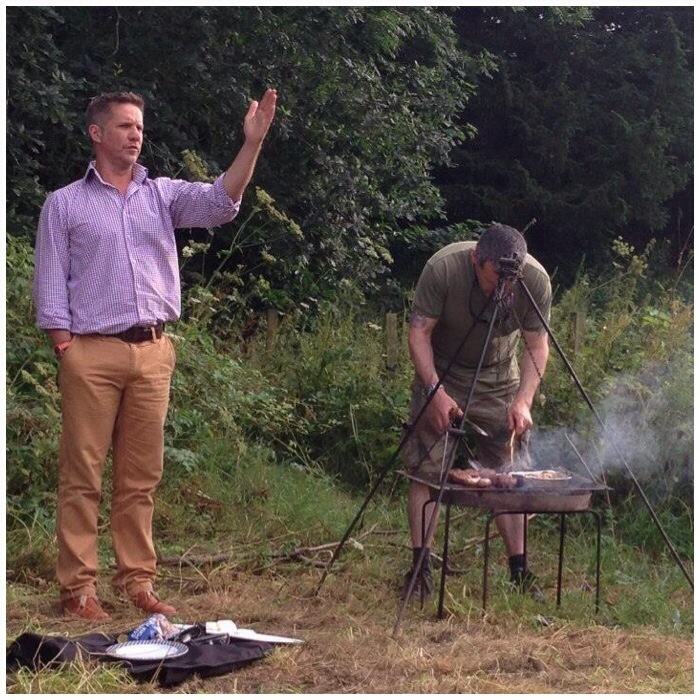 This was organised by my good friend Mark Beer as he was a Forester working for the Benyon Estate. 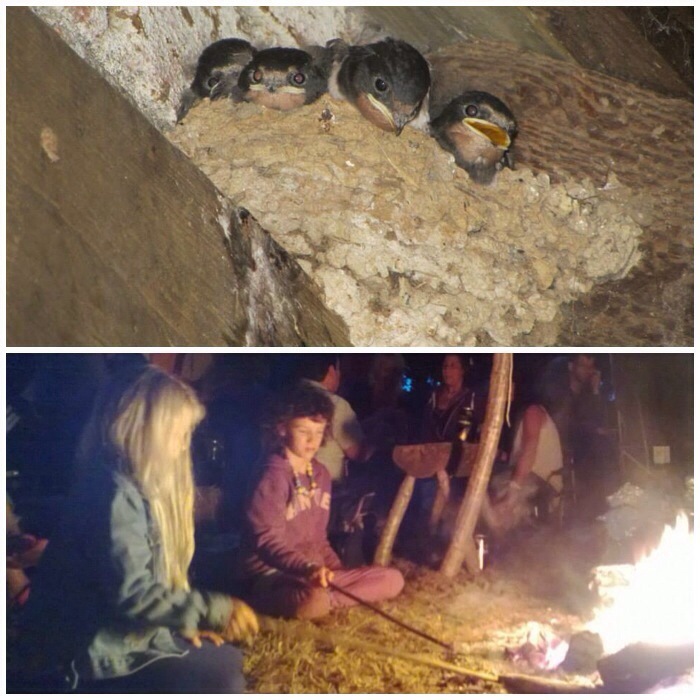 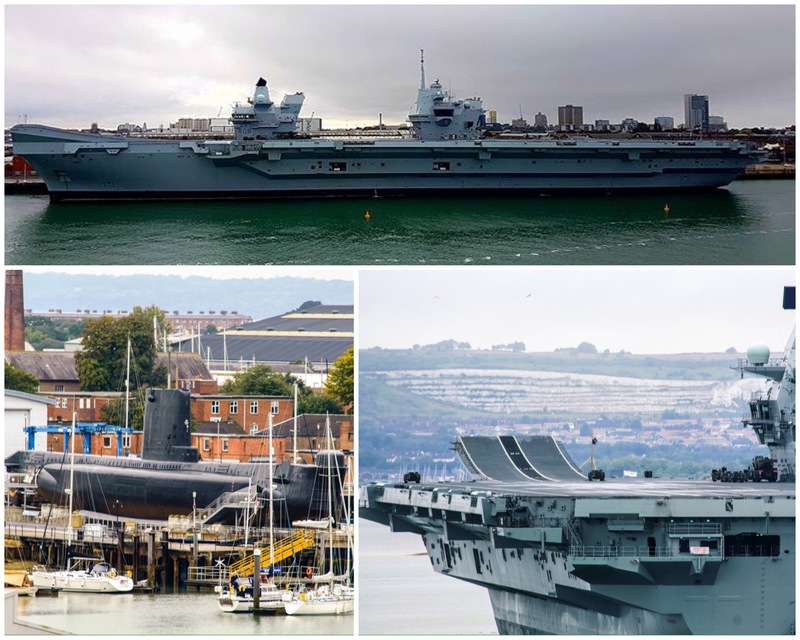 My last overnight visit was in February this year but I did pop up and visit the lads for a few hours while they were out this summer. 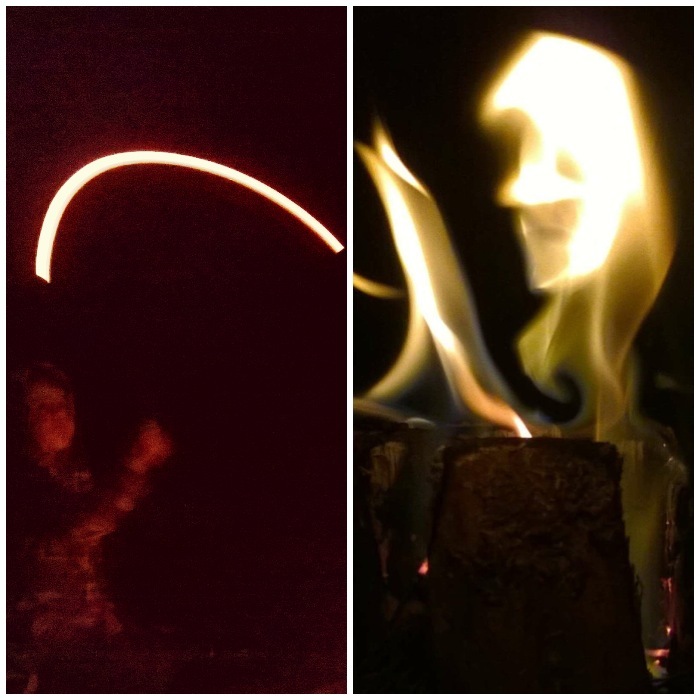 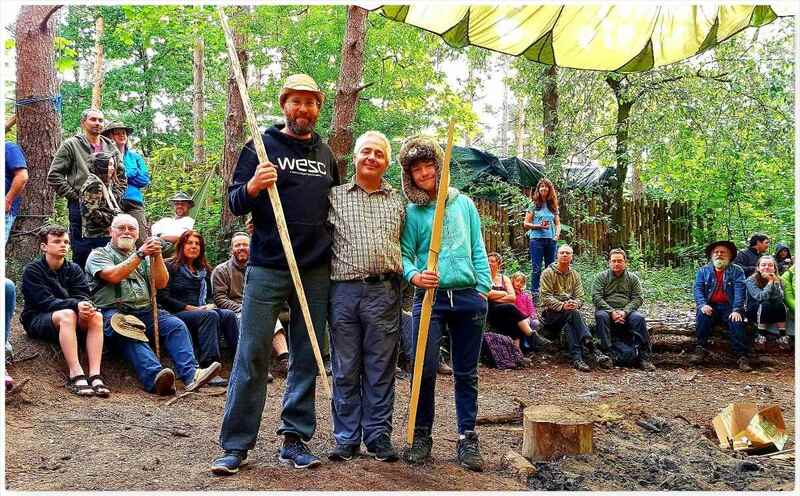 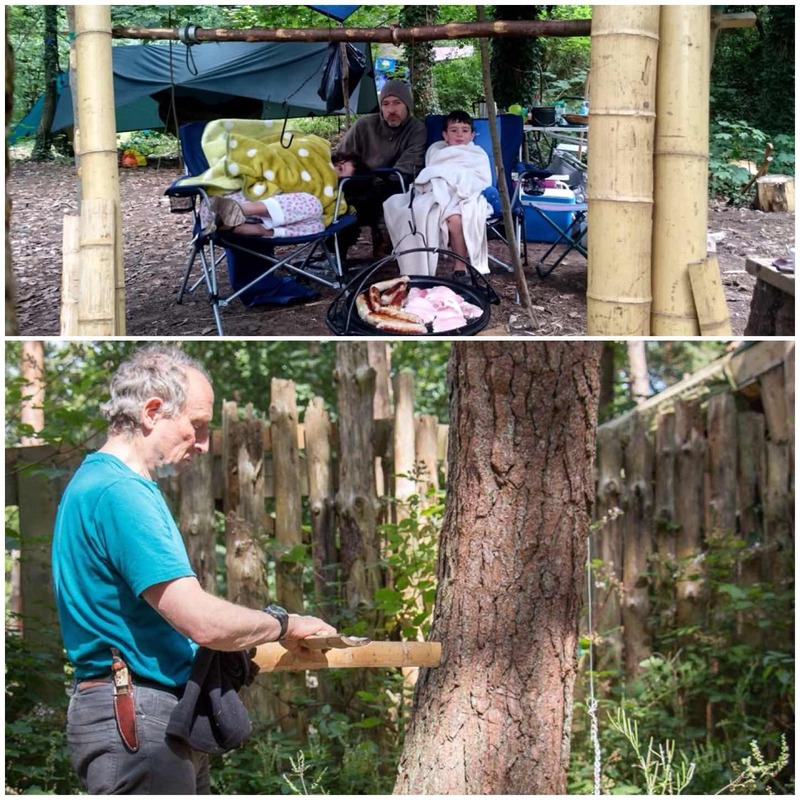 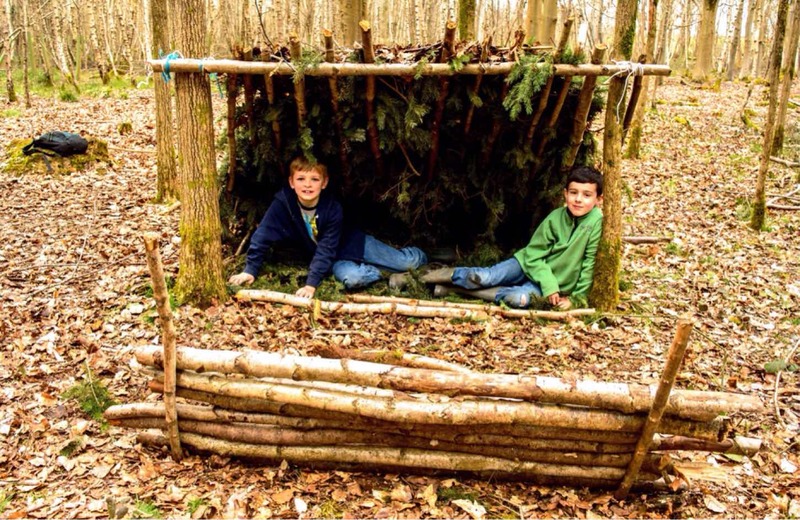 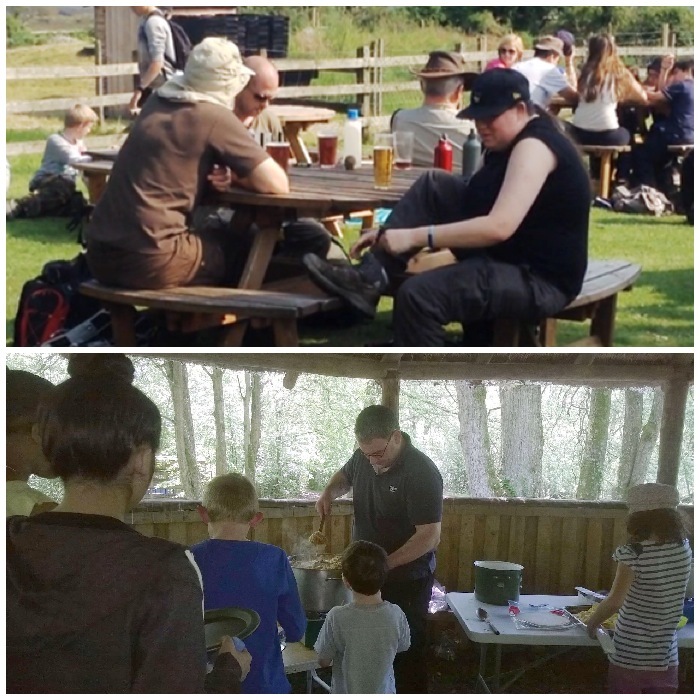 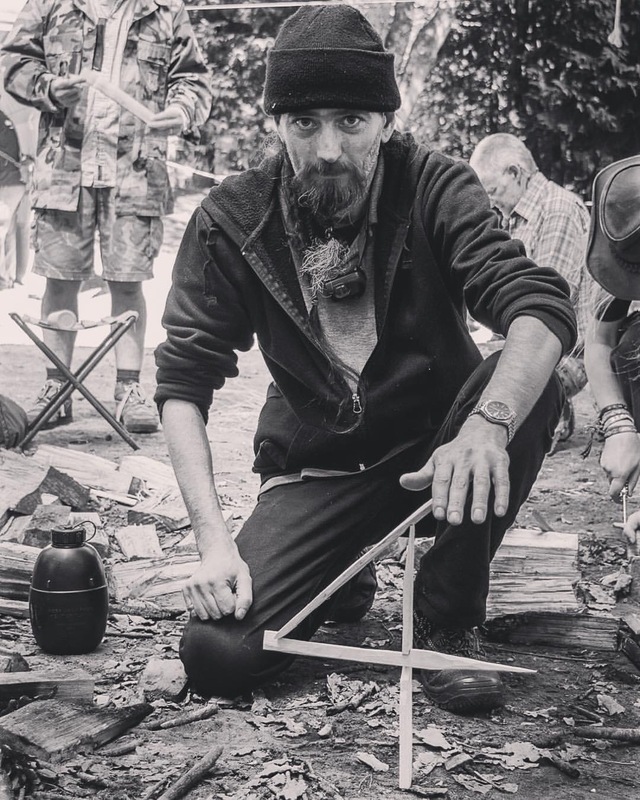 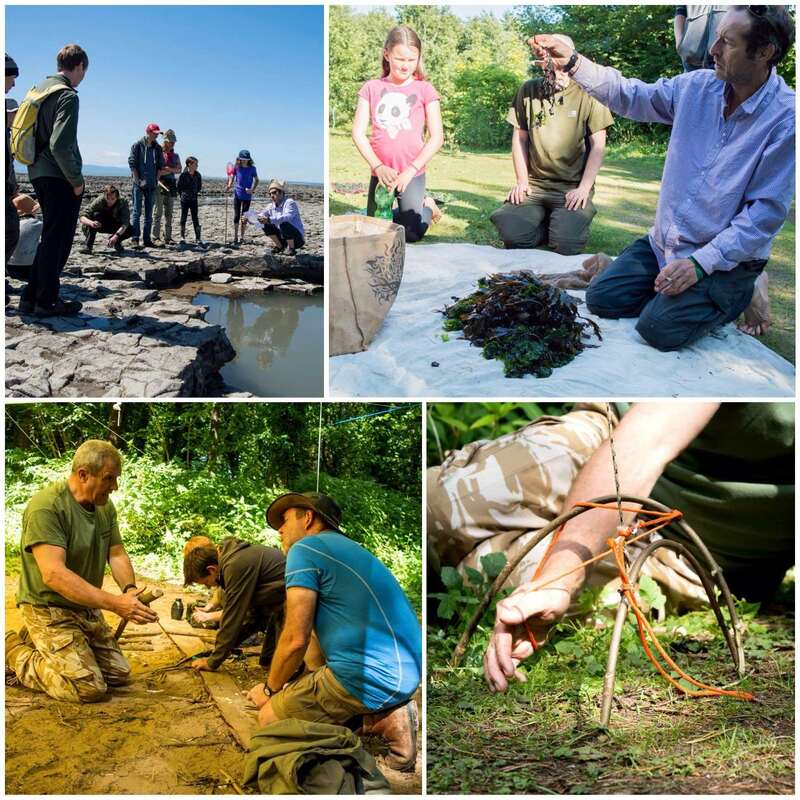 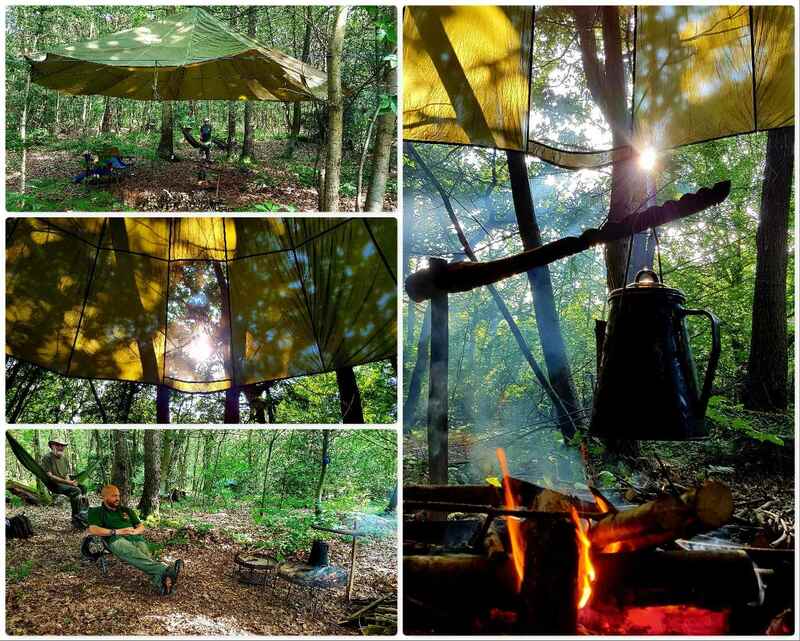 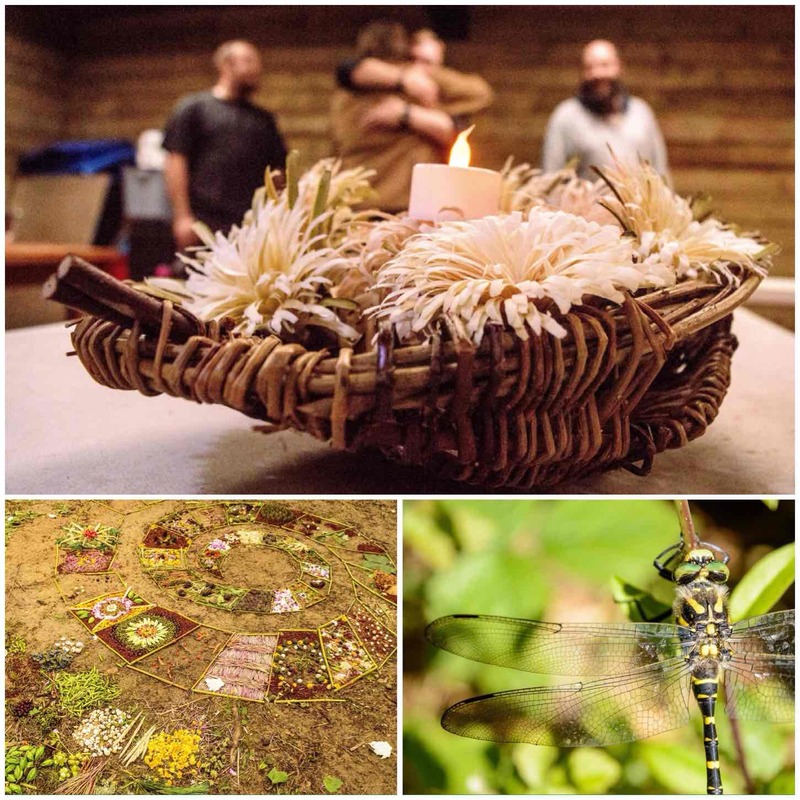 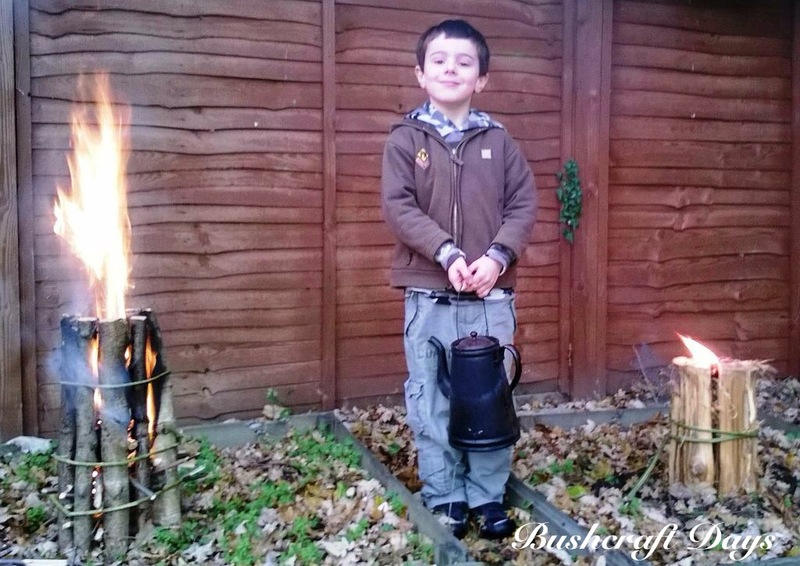 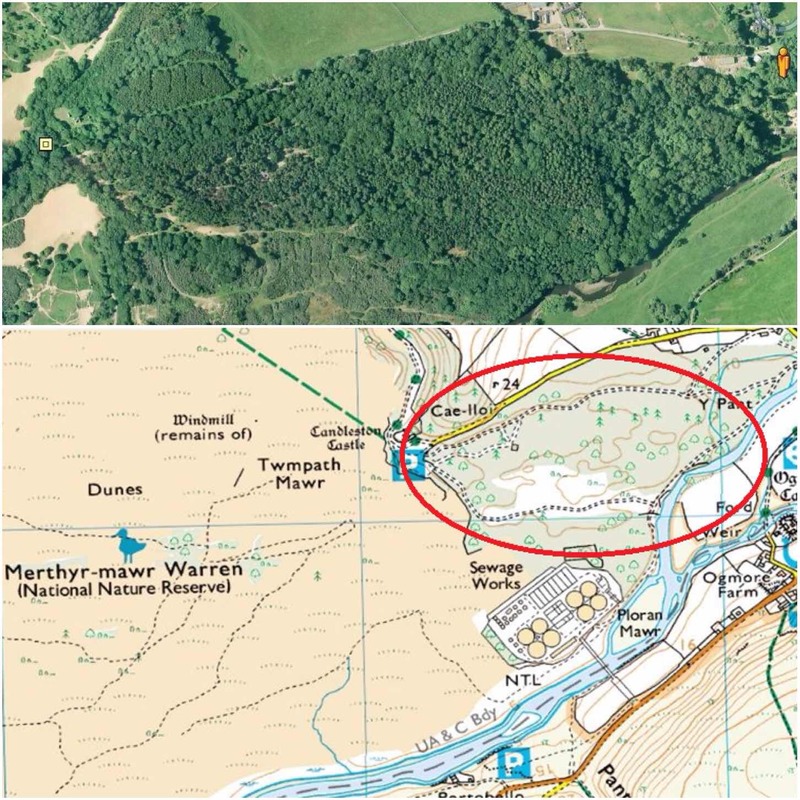 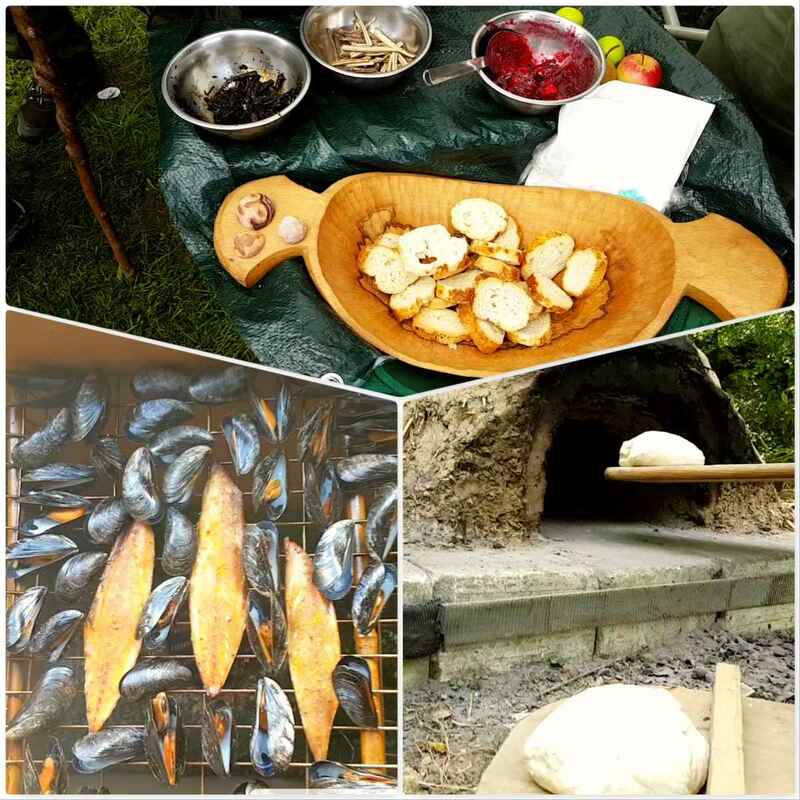 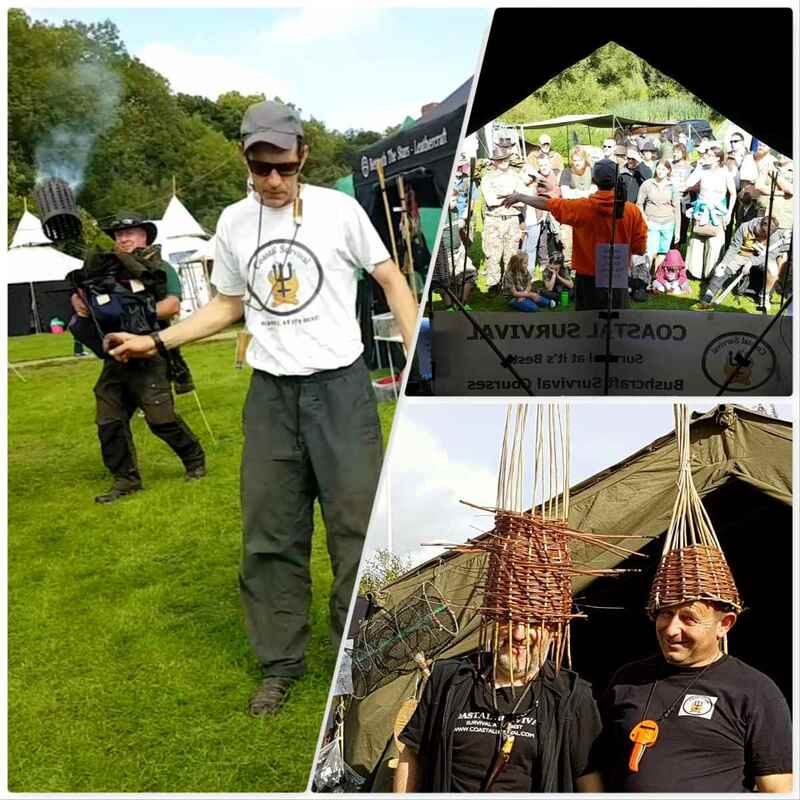 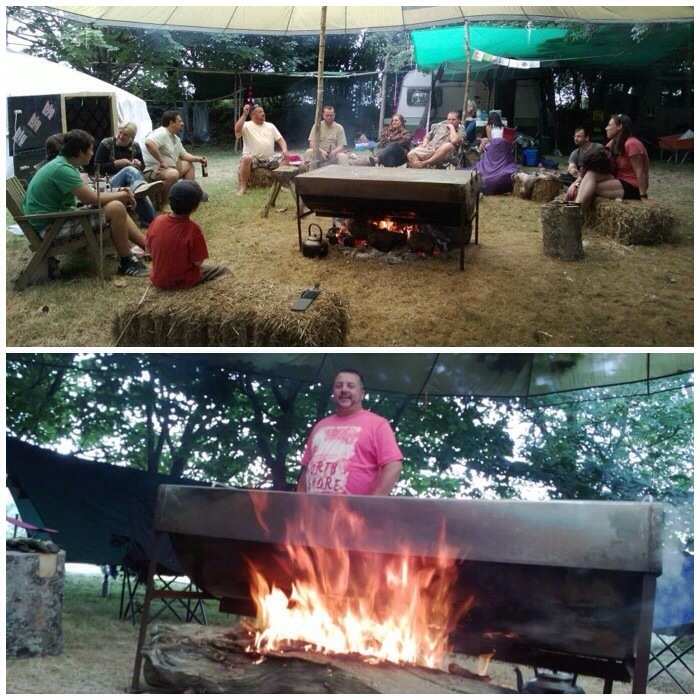 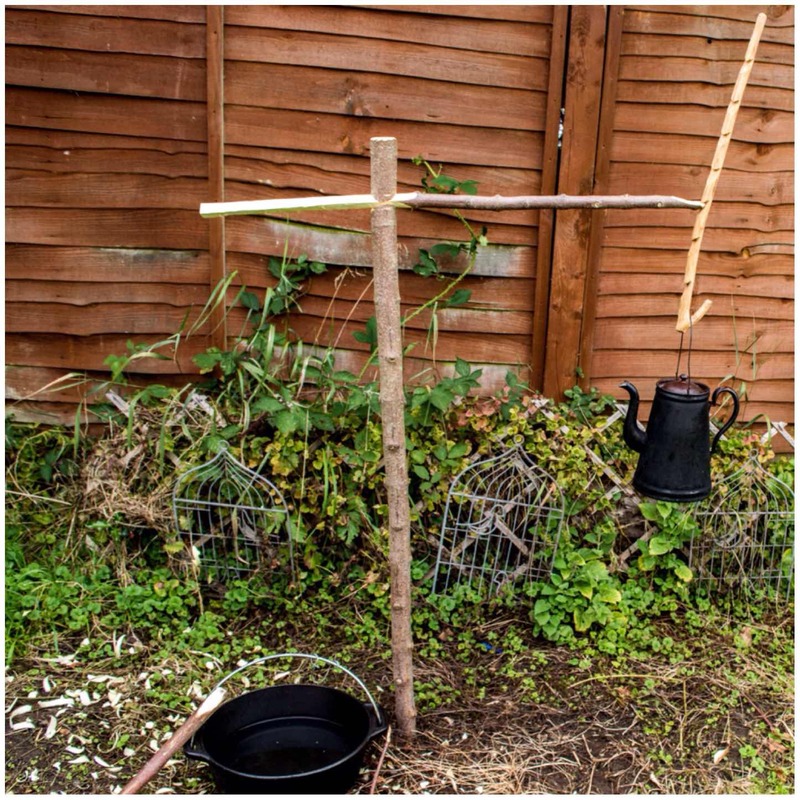 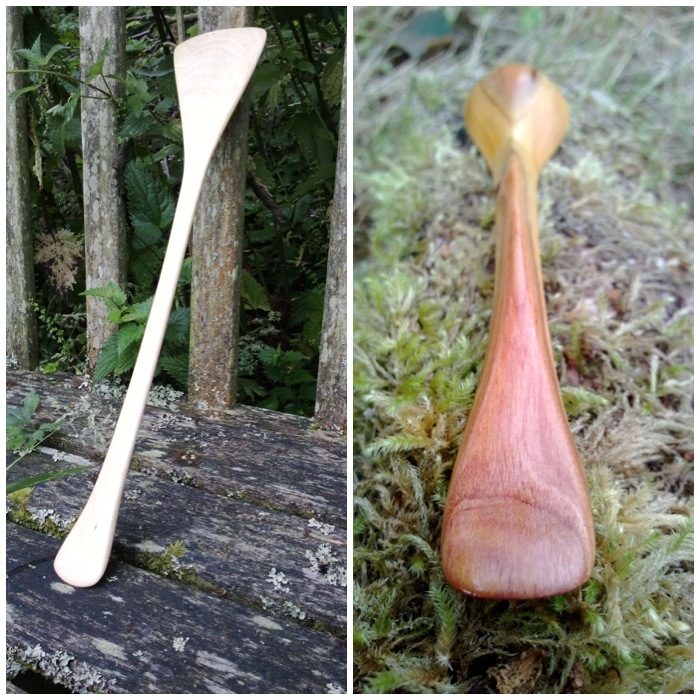 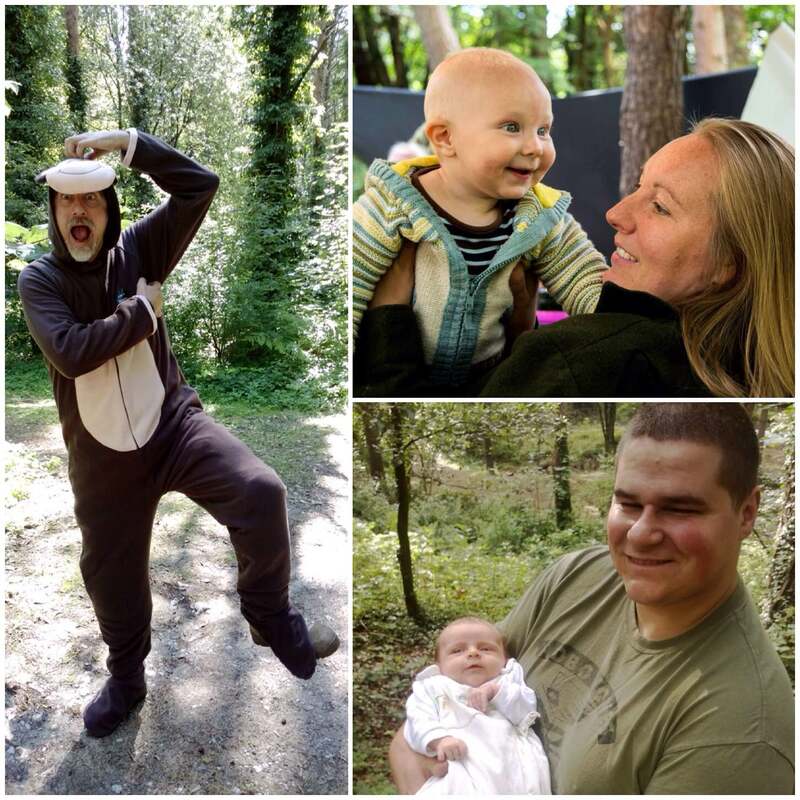 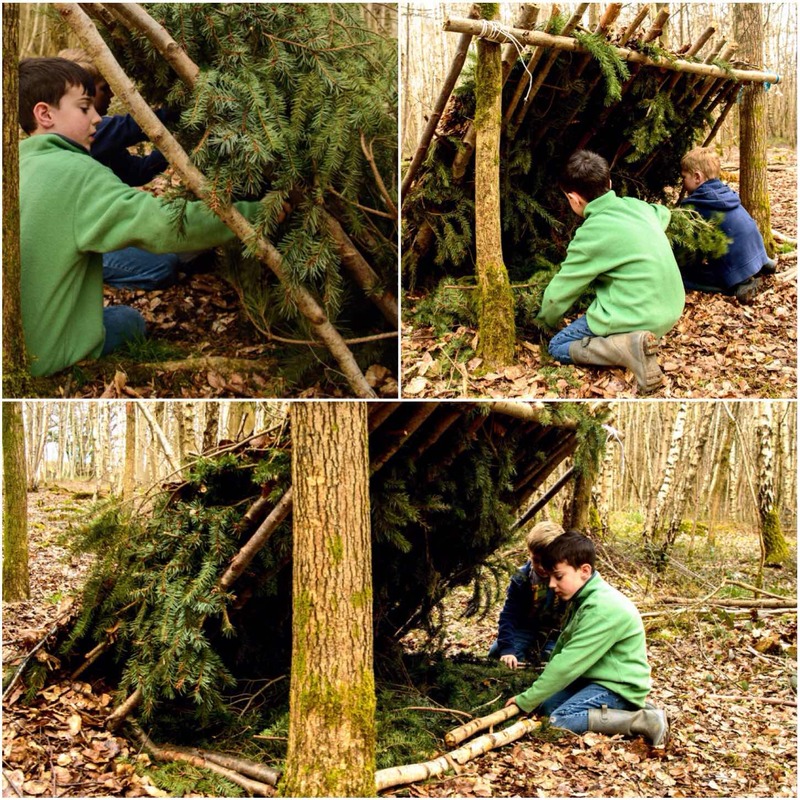 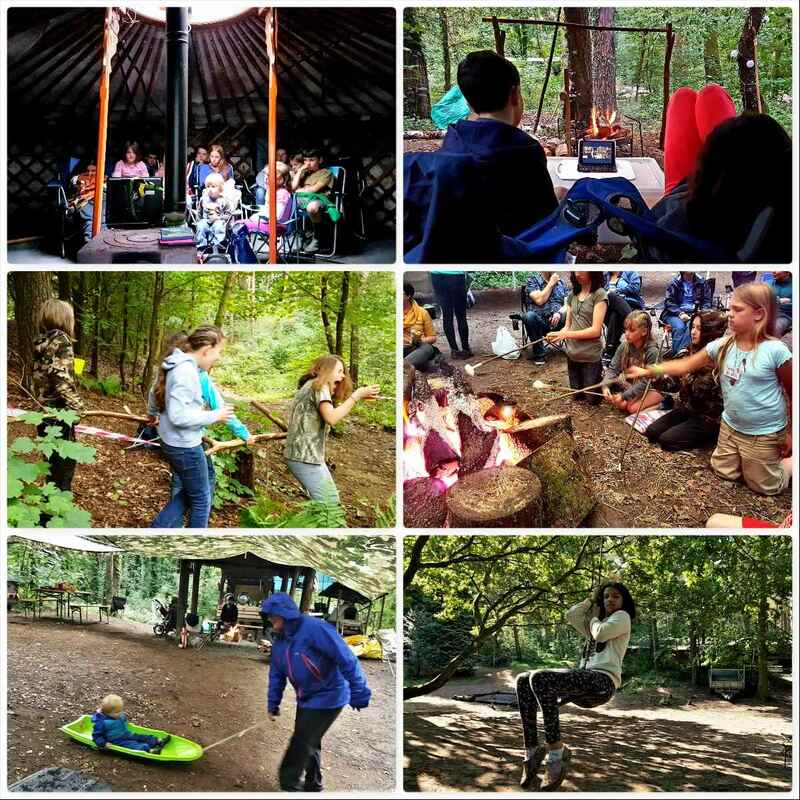 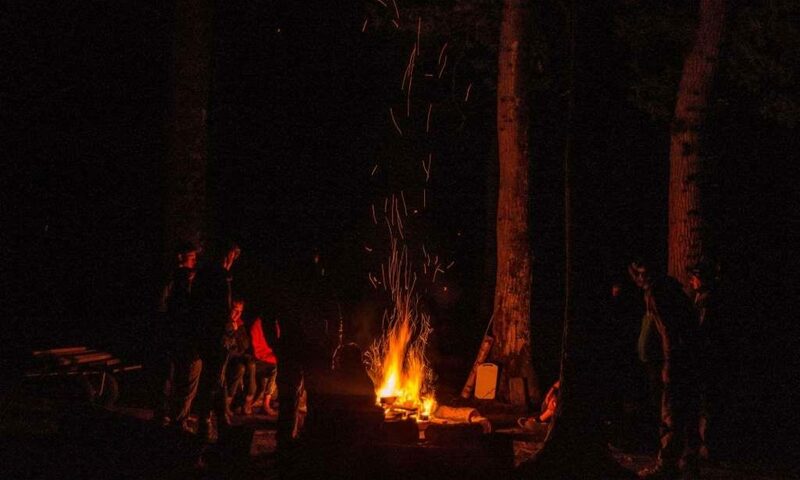 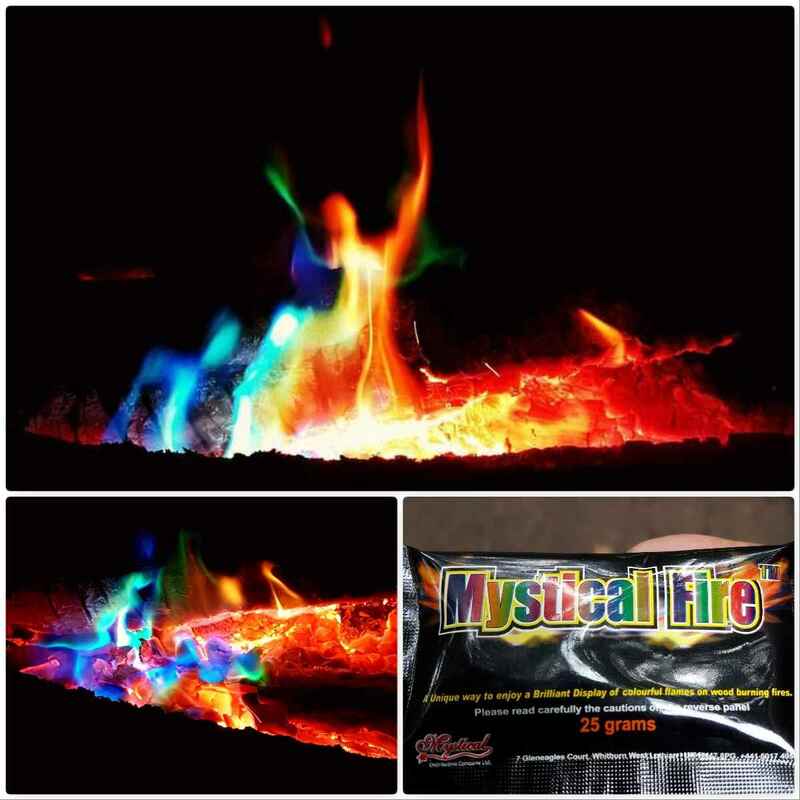 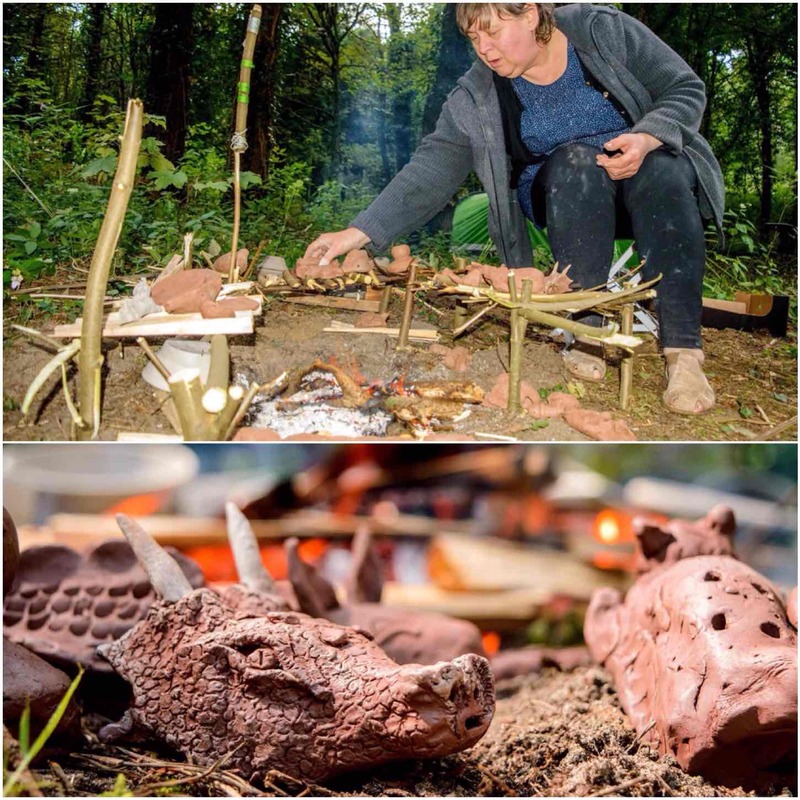 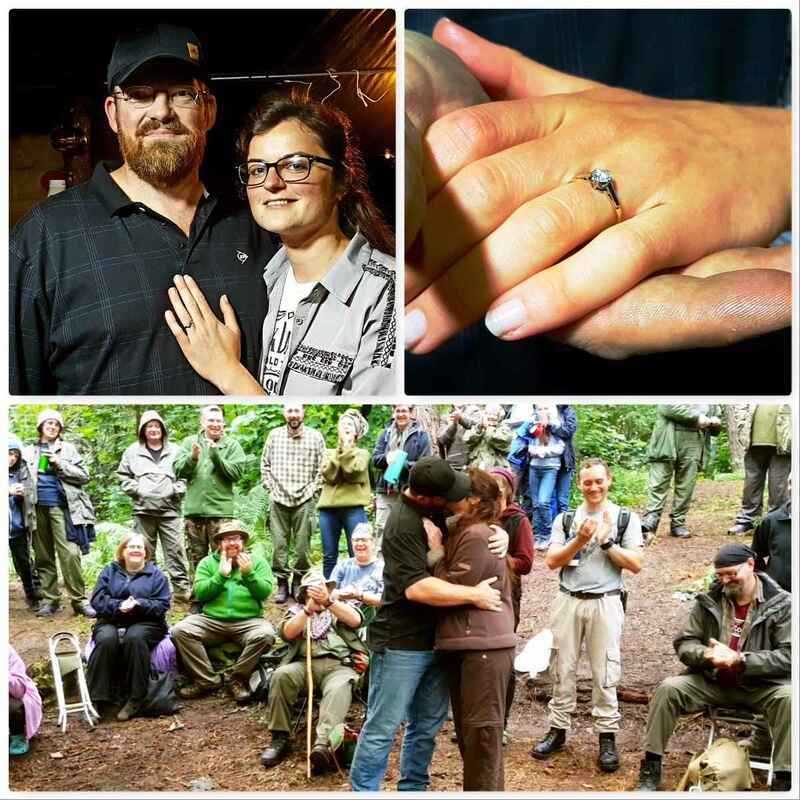 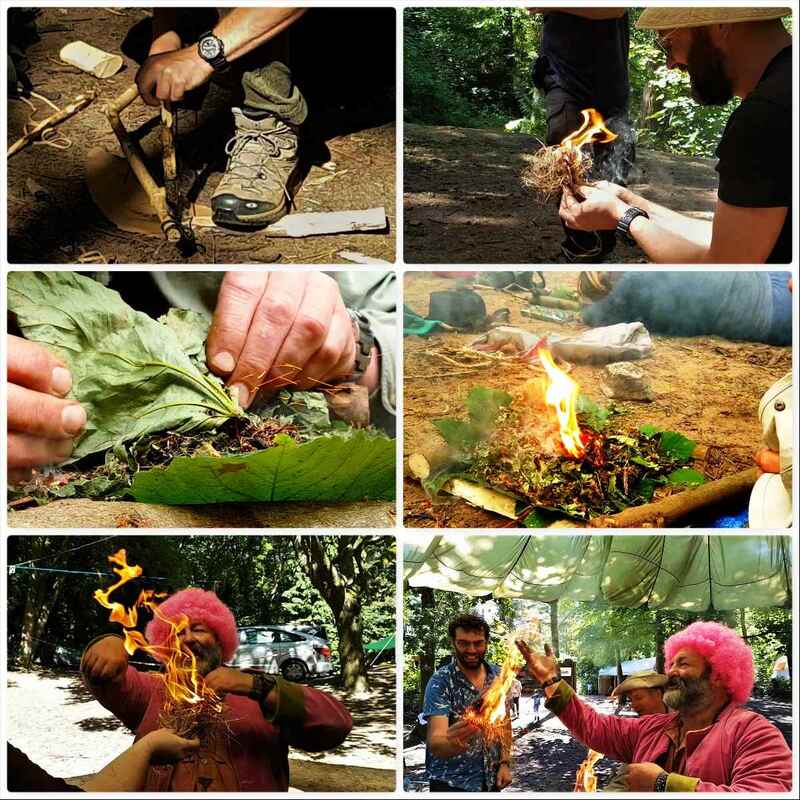 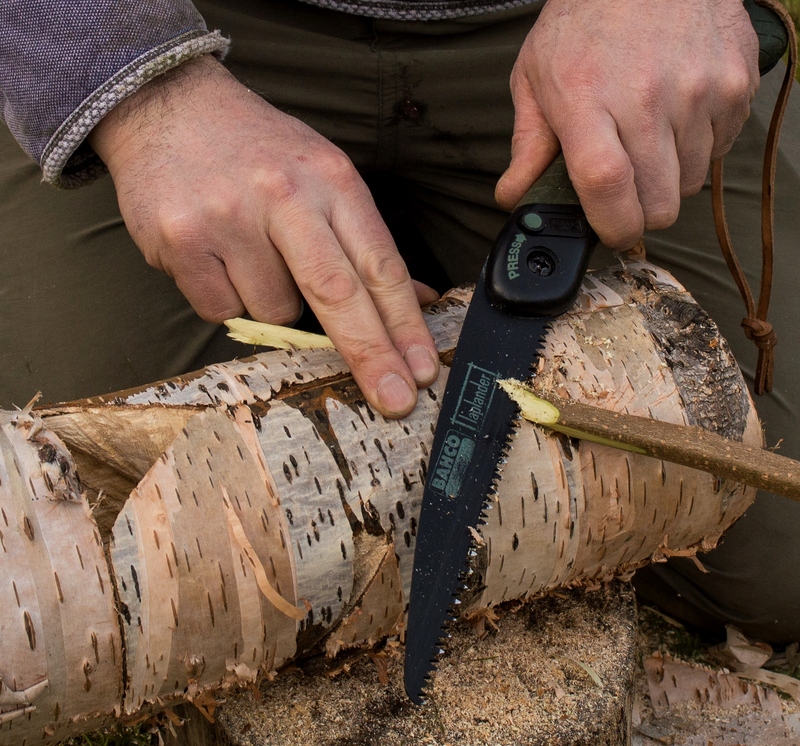 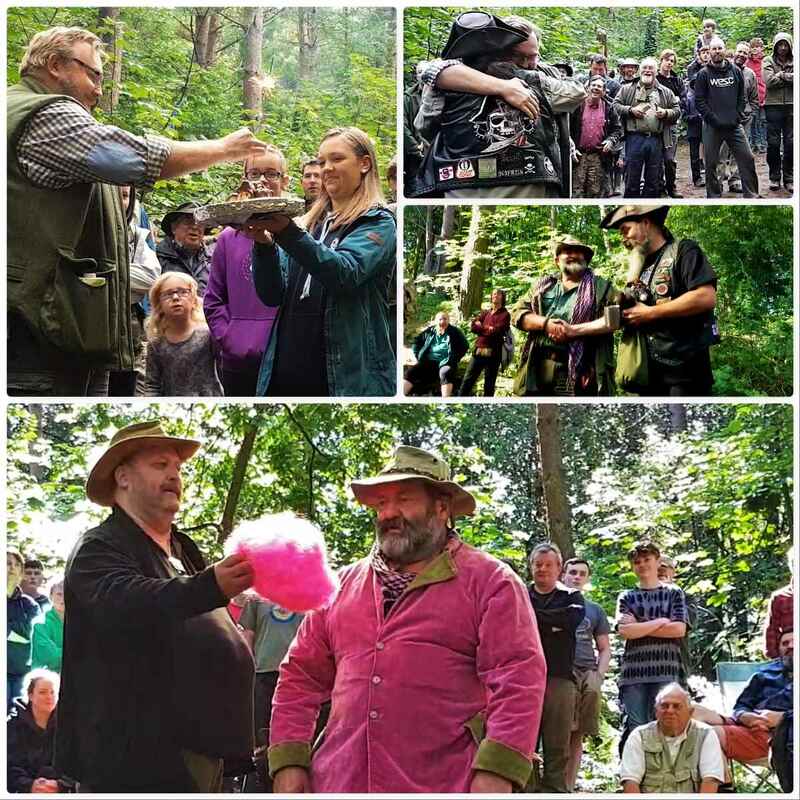 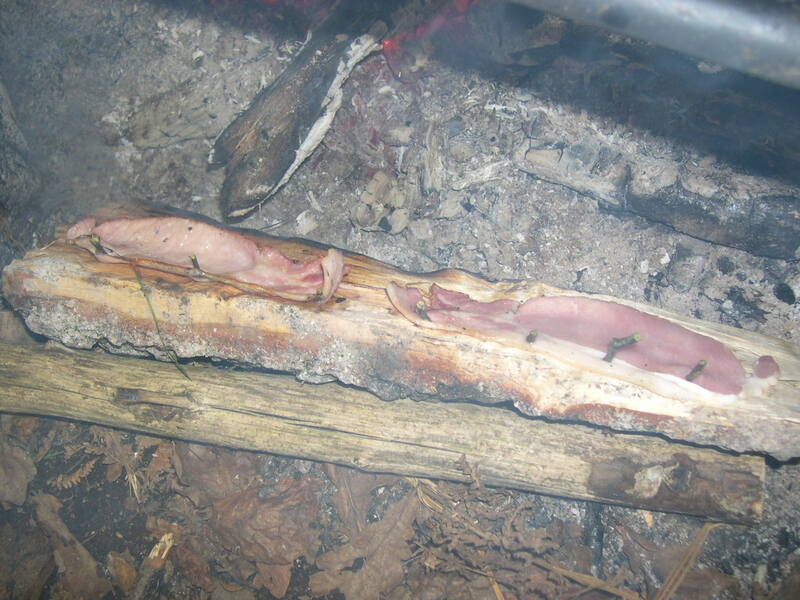 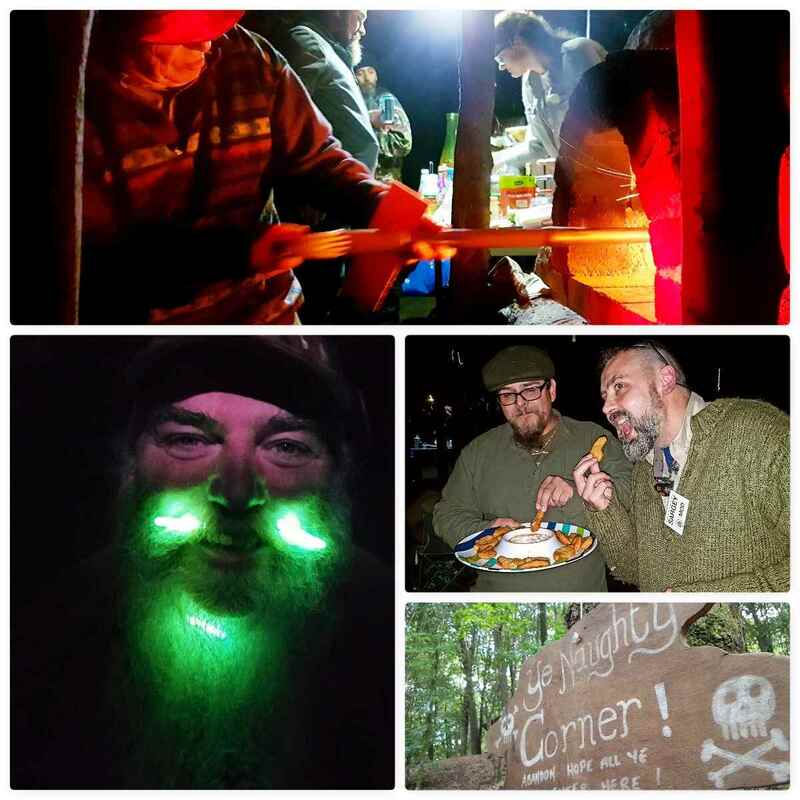 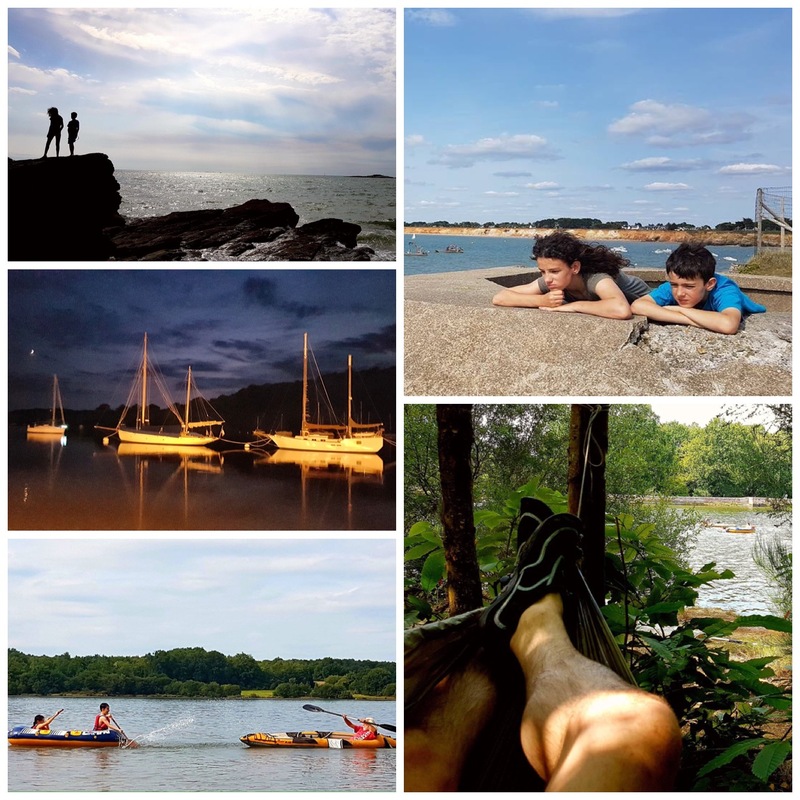 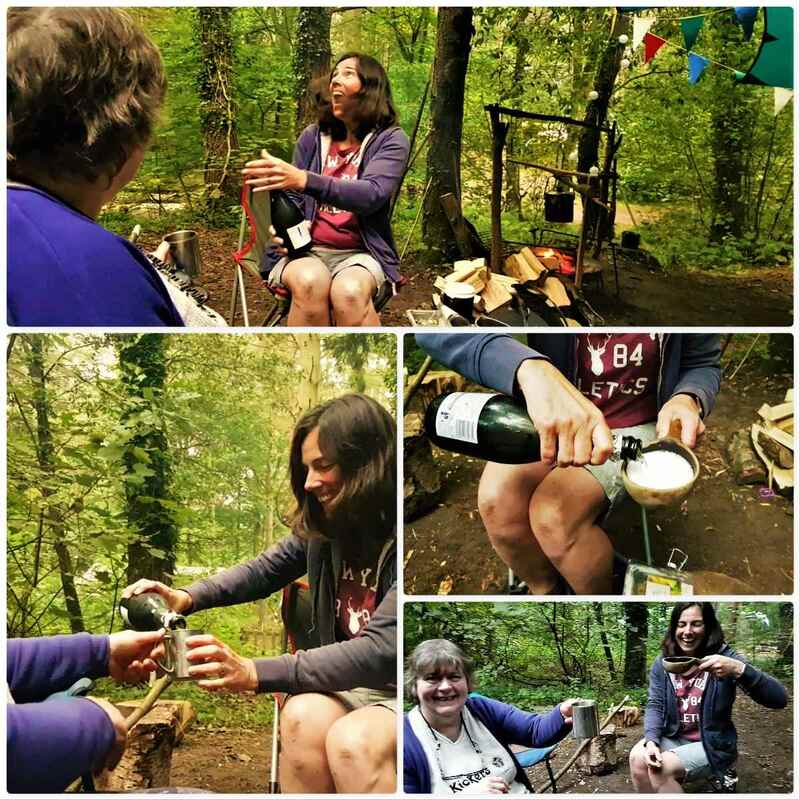 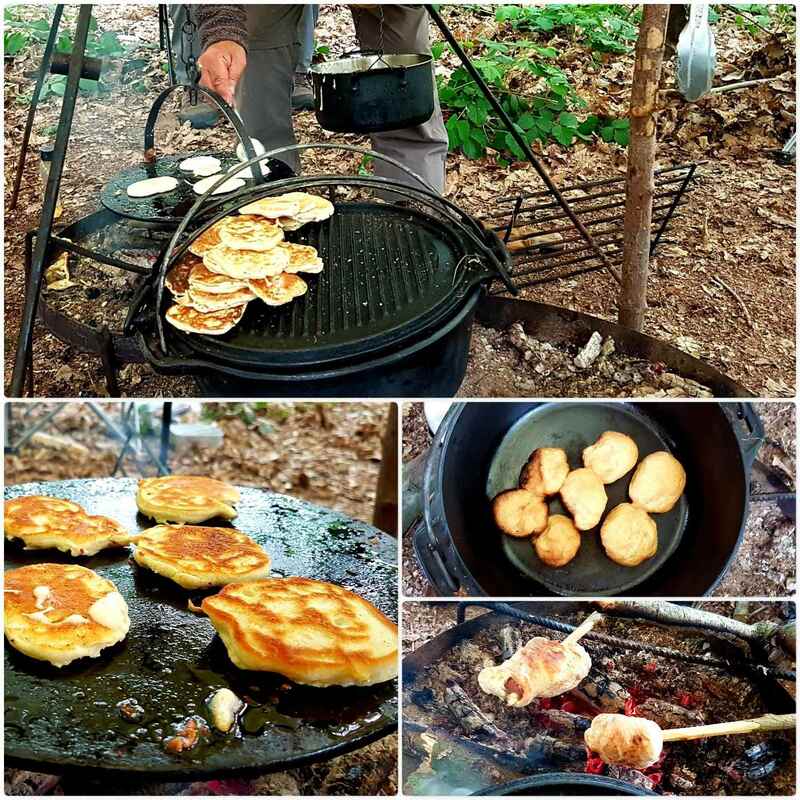 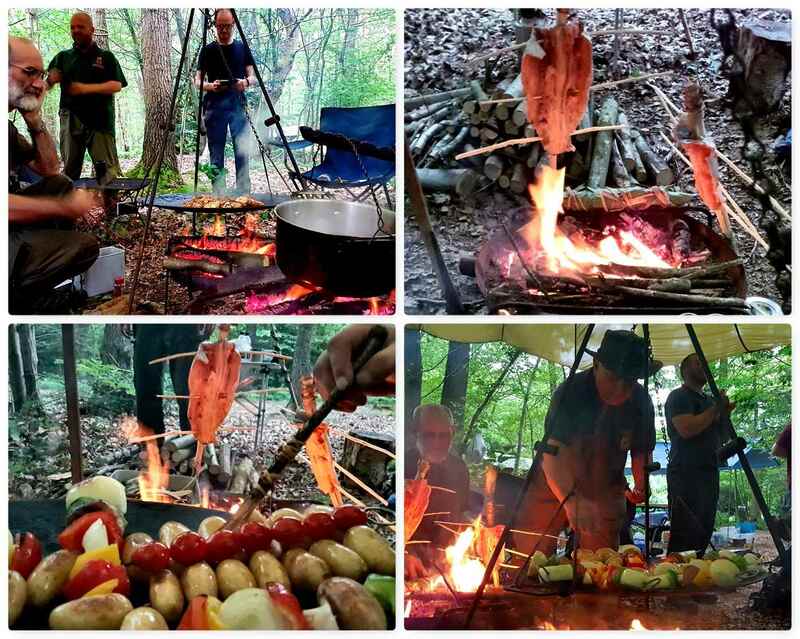 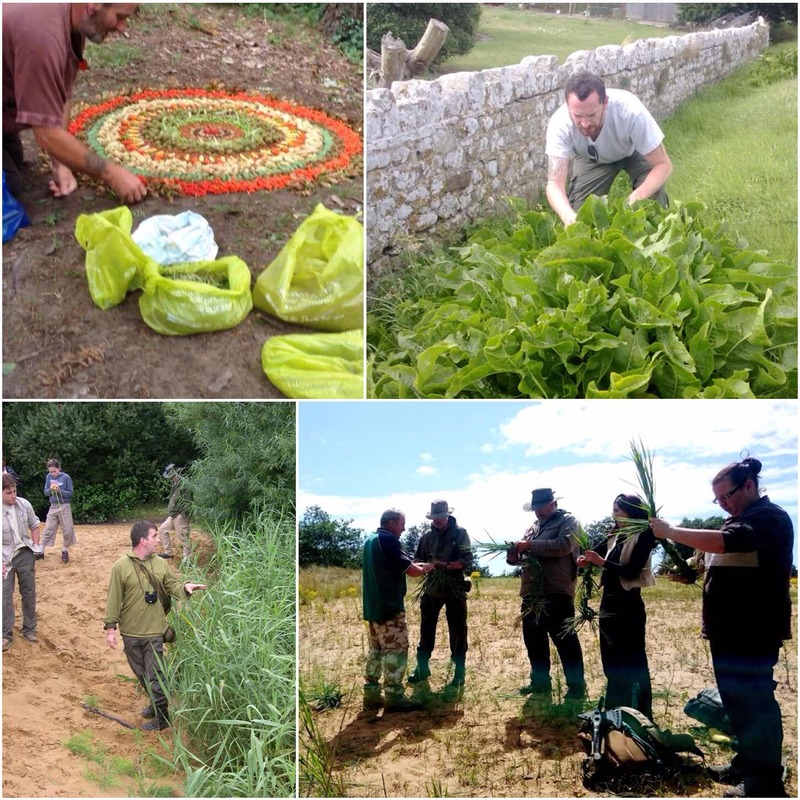 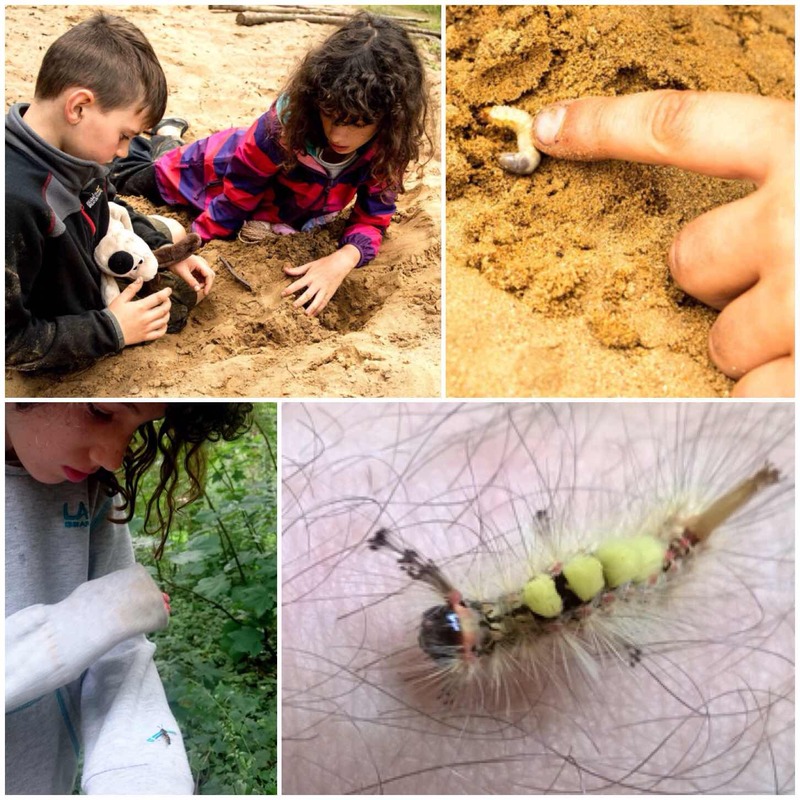 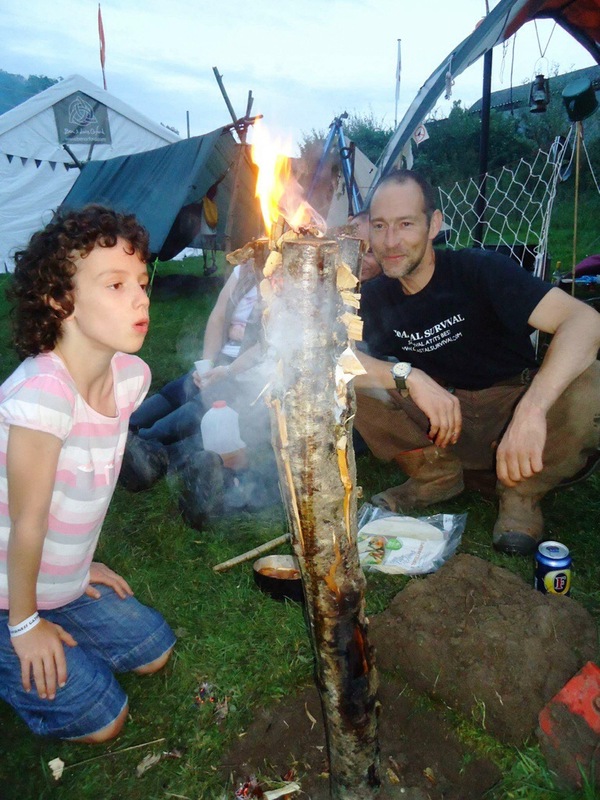 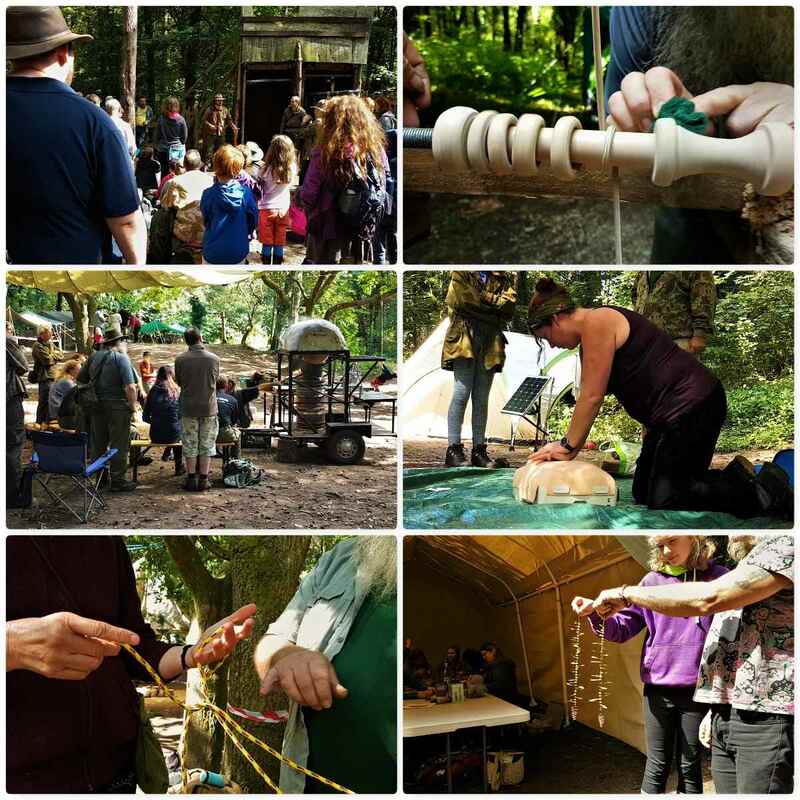 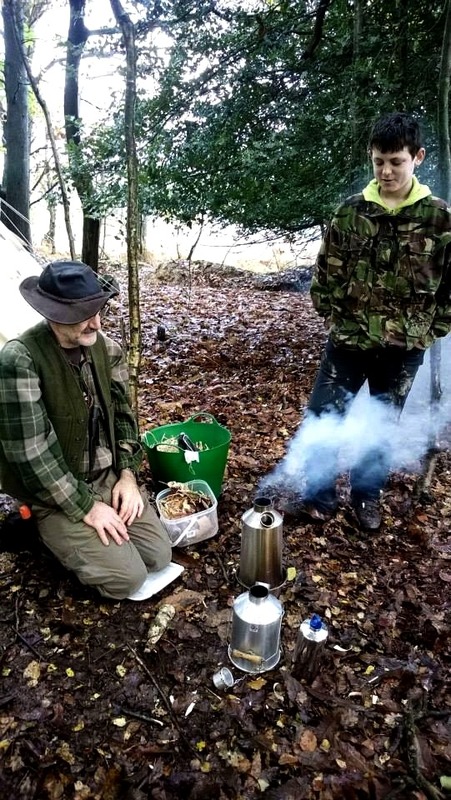 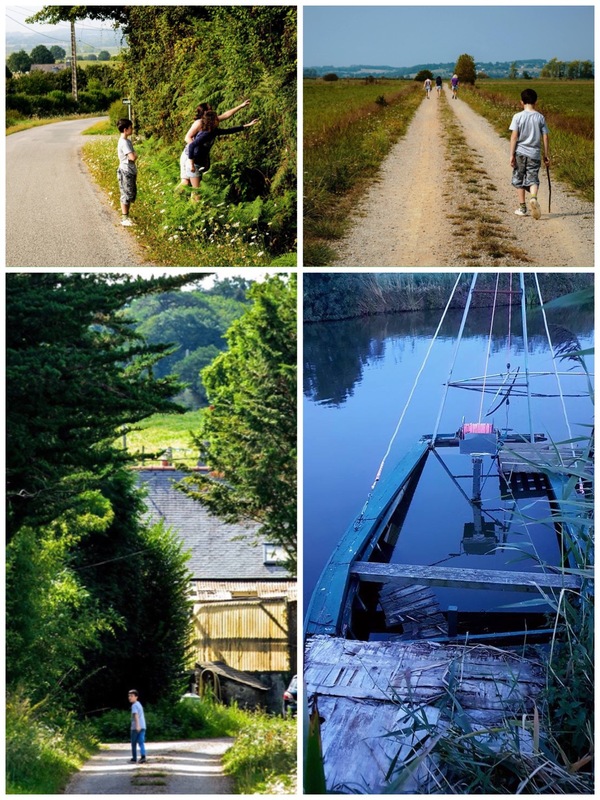 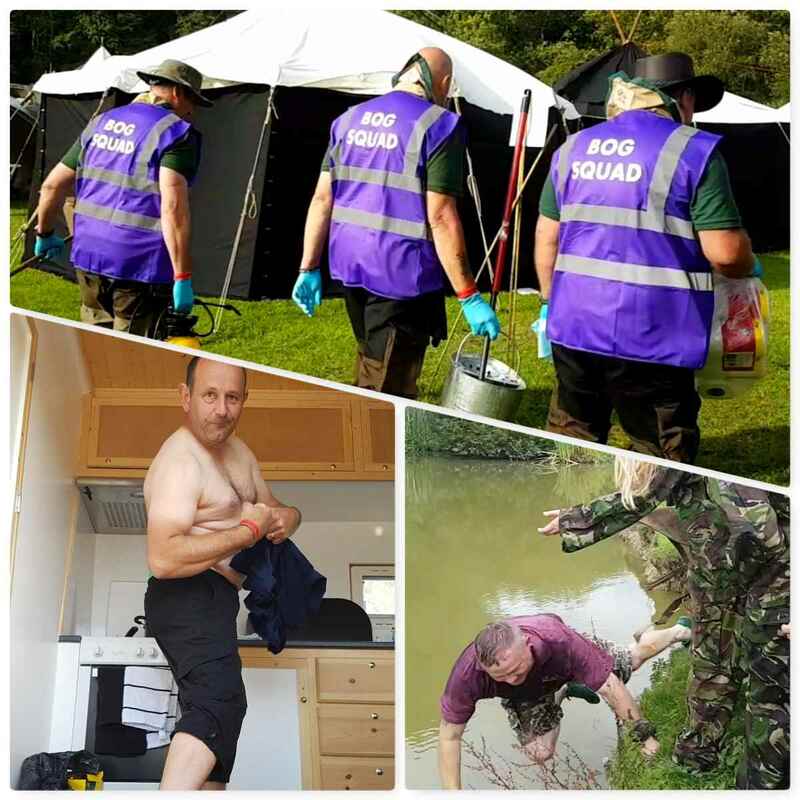 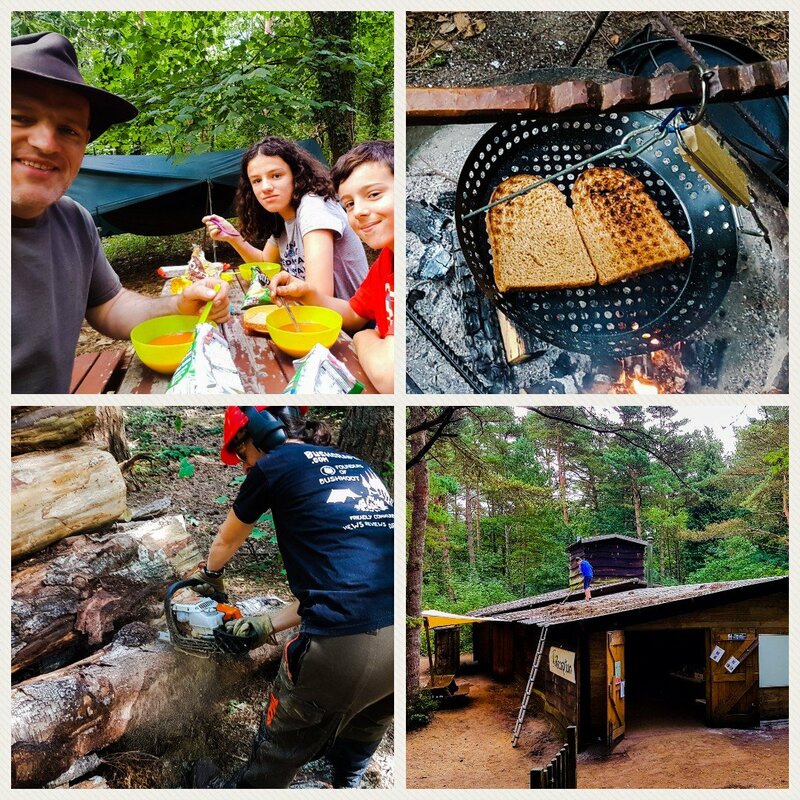 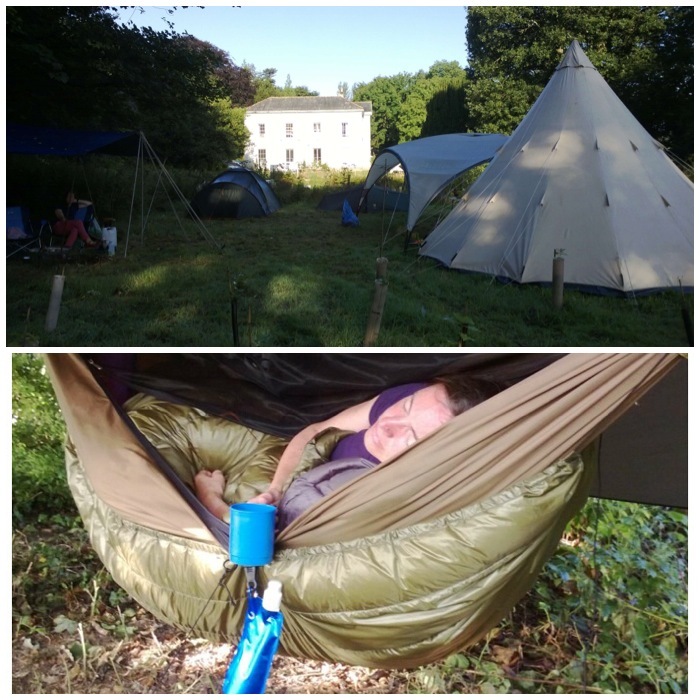 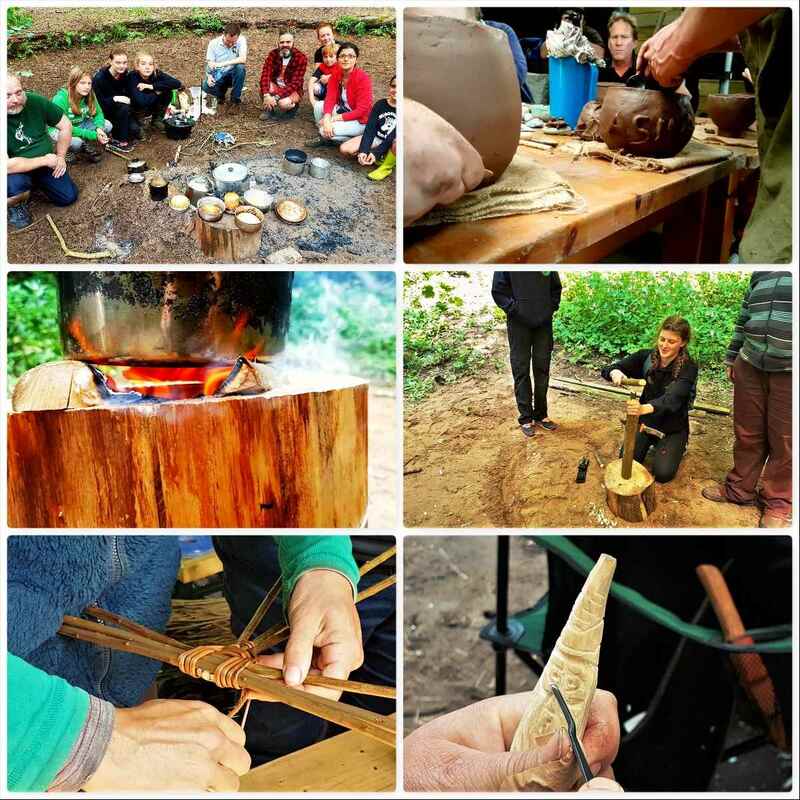 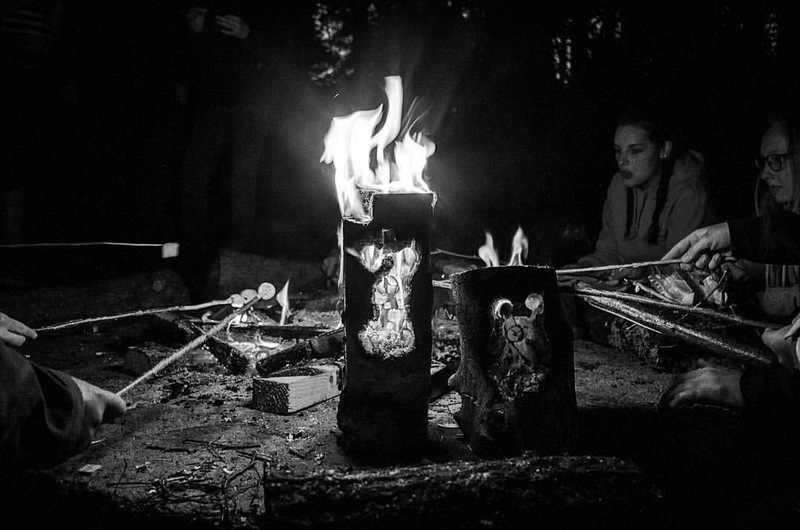 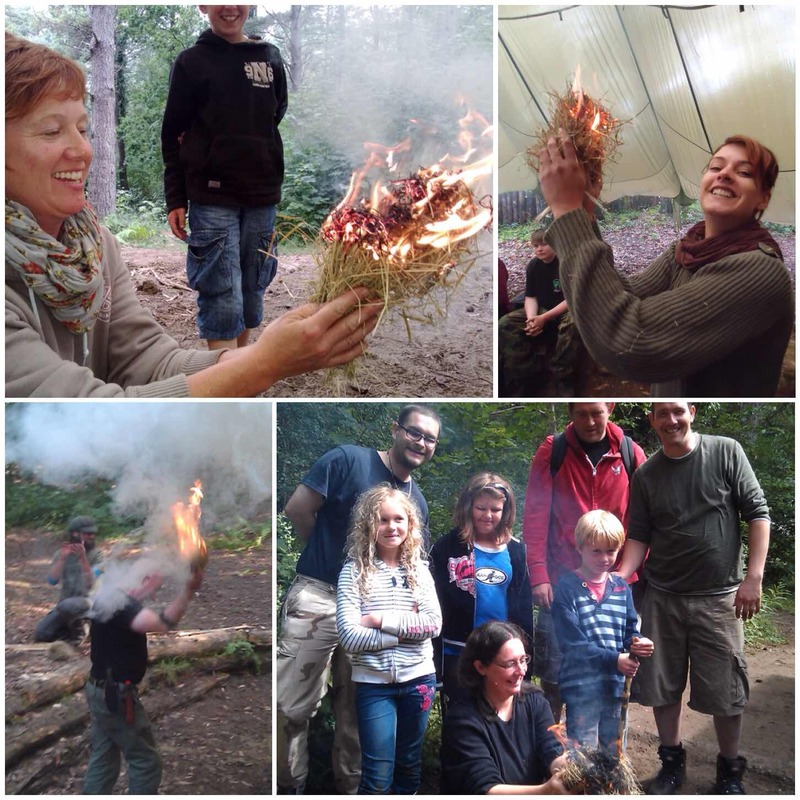 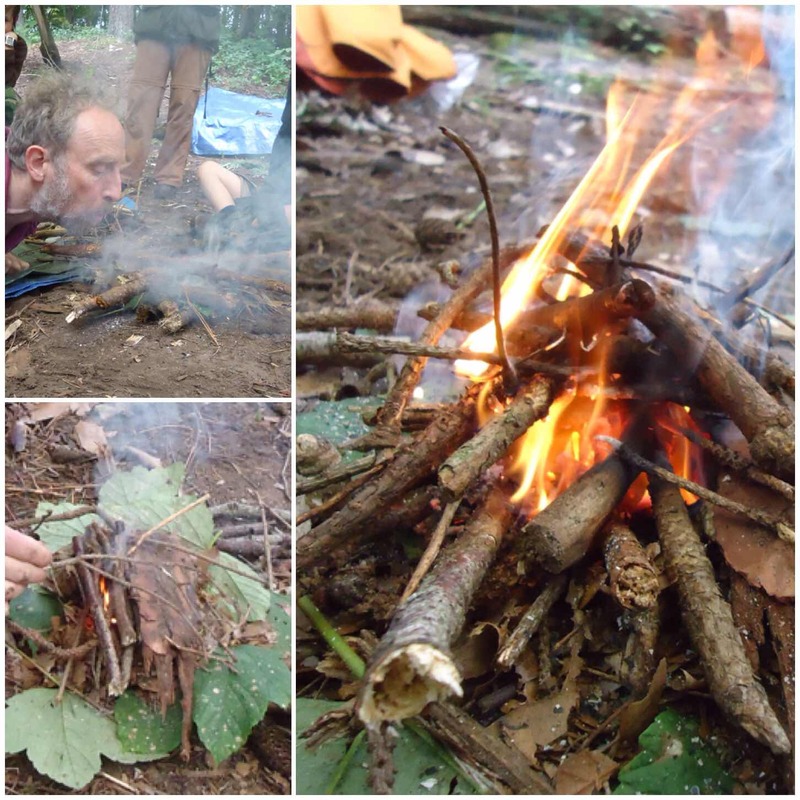 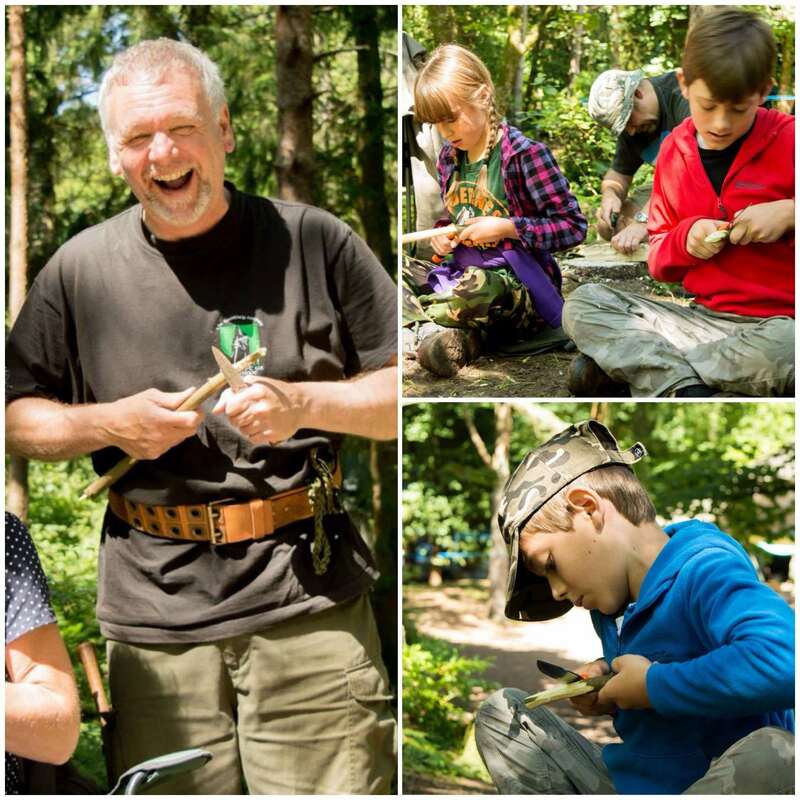 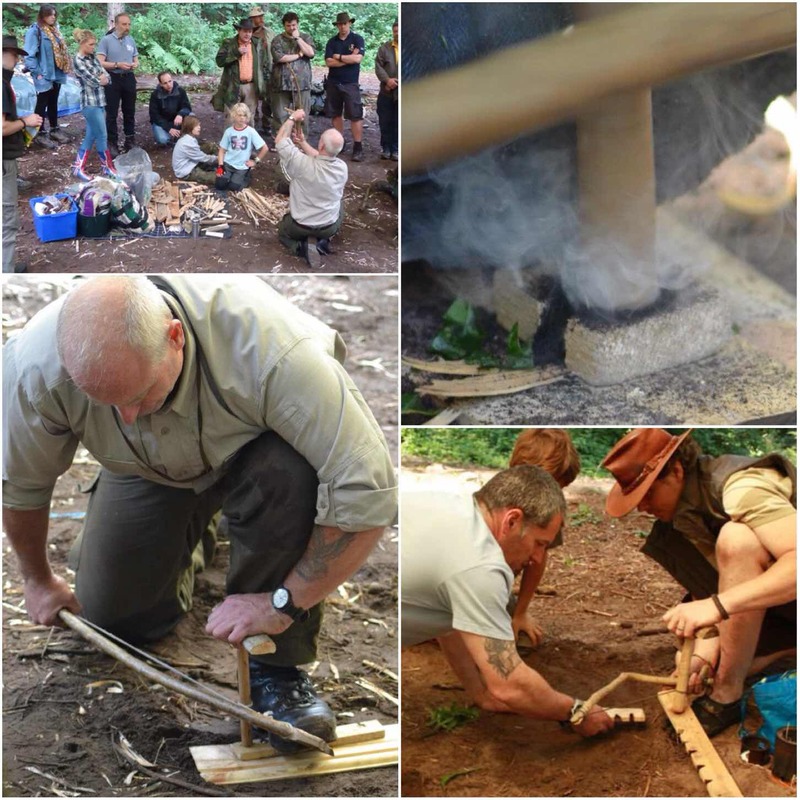 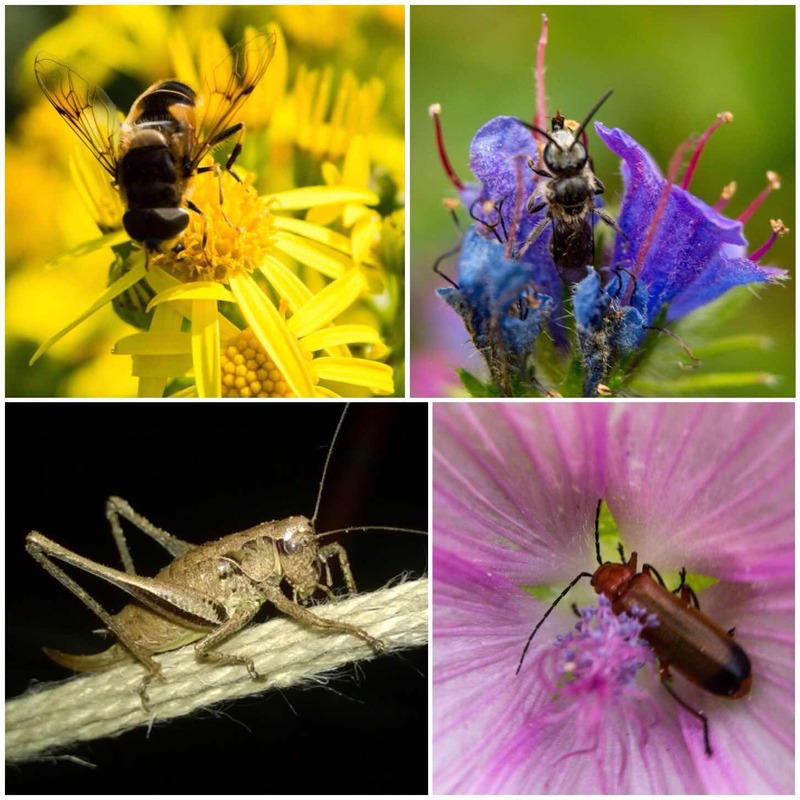 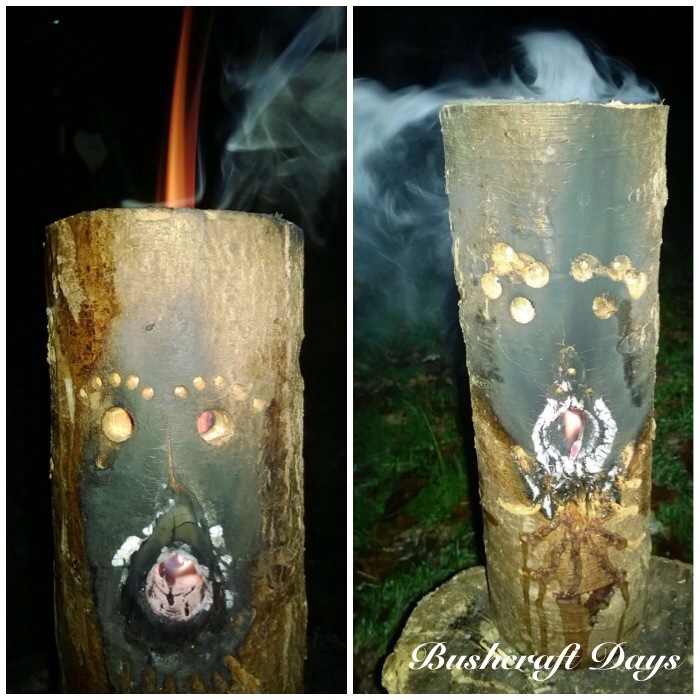 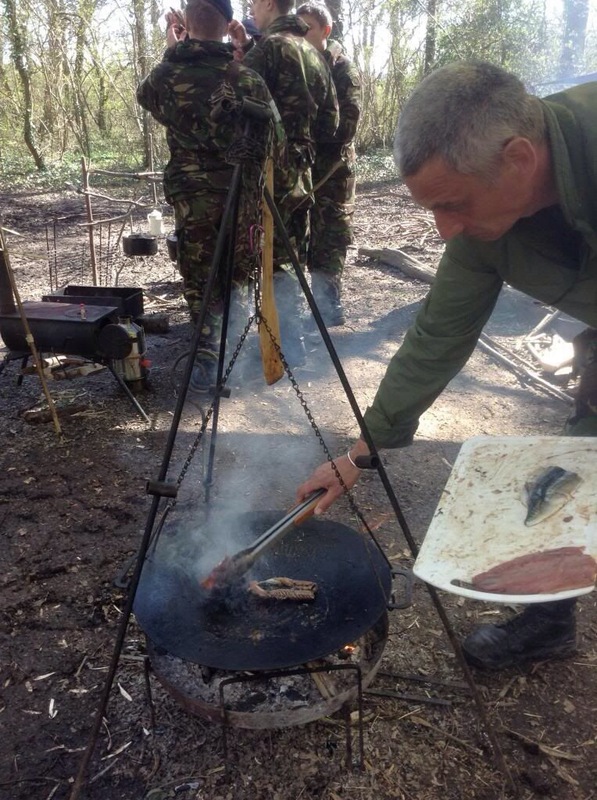 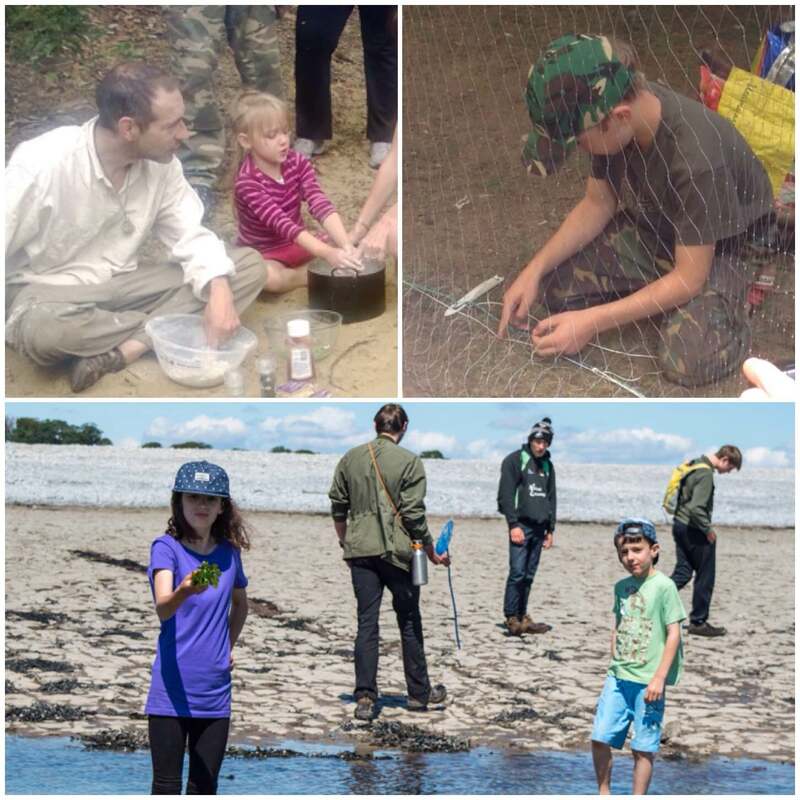 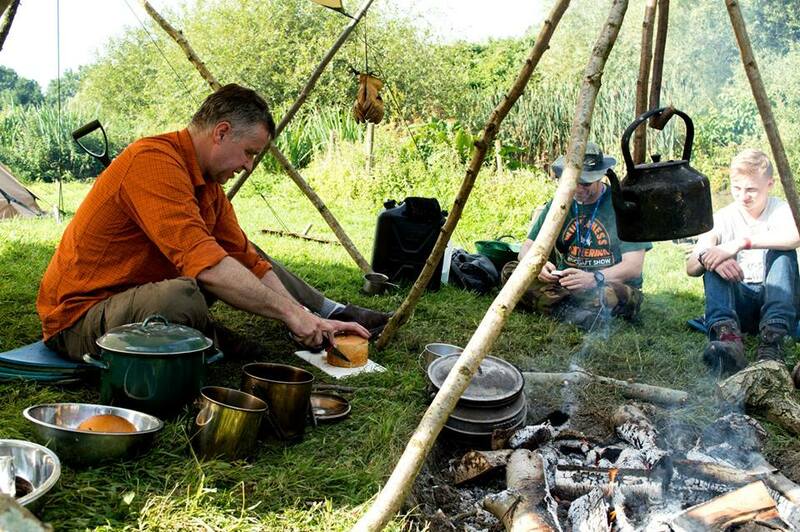 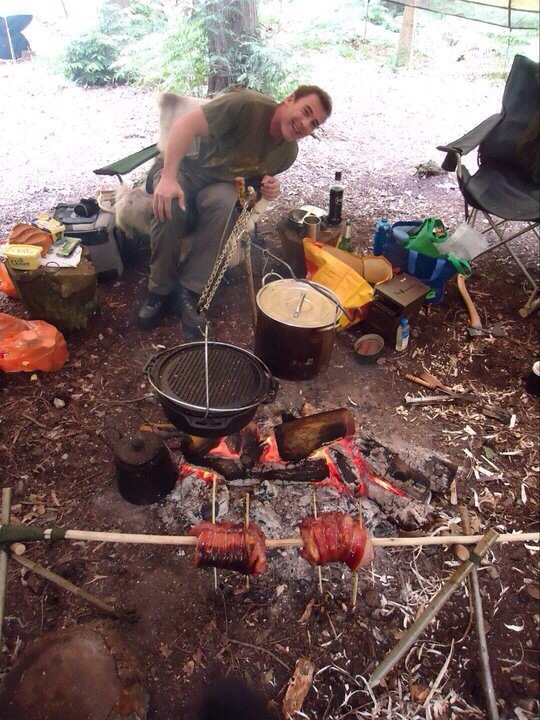 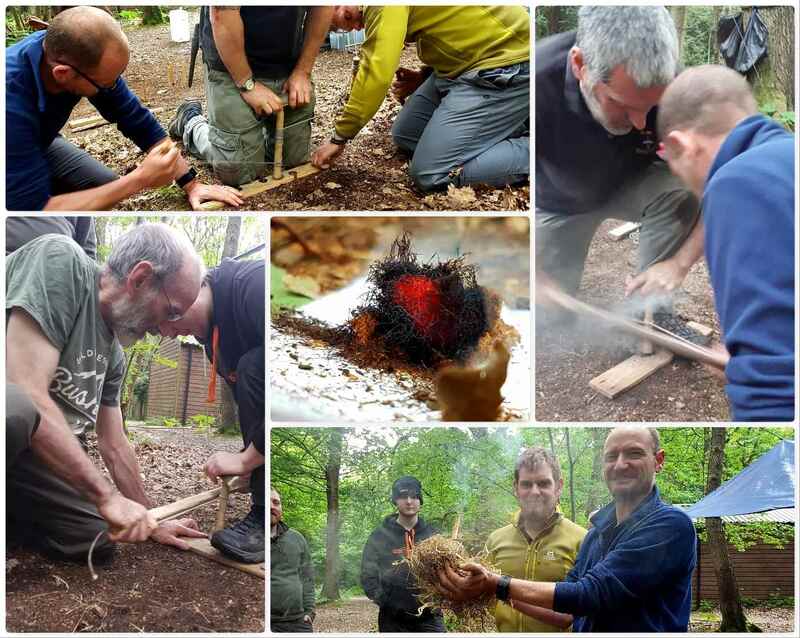 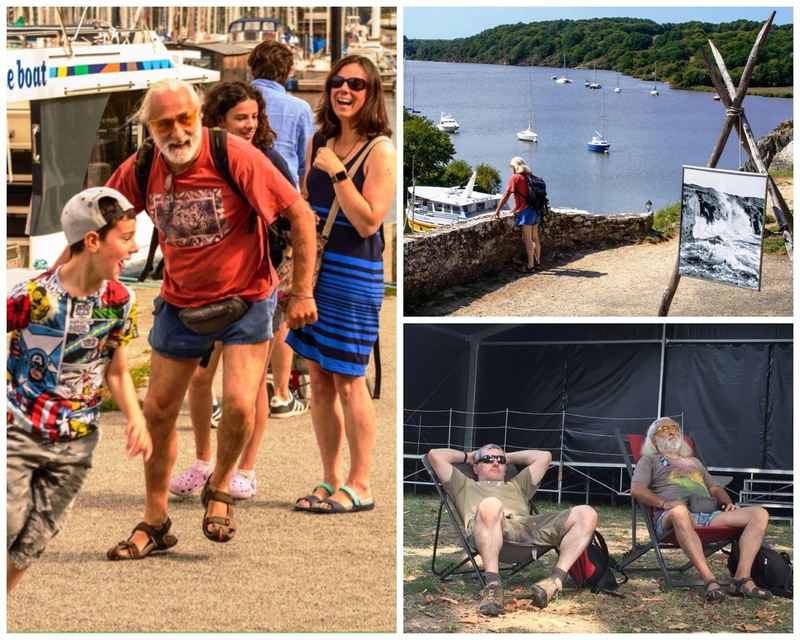 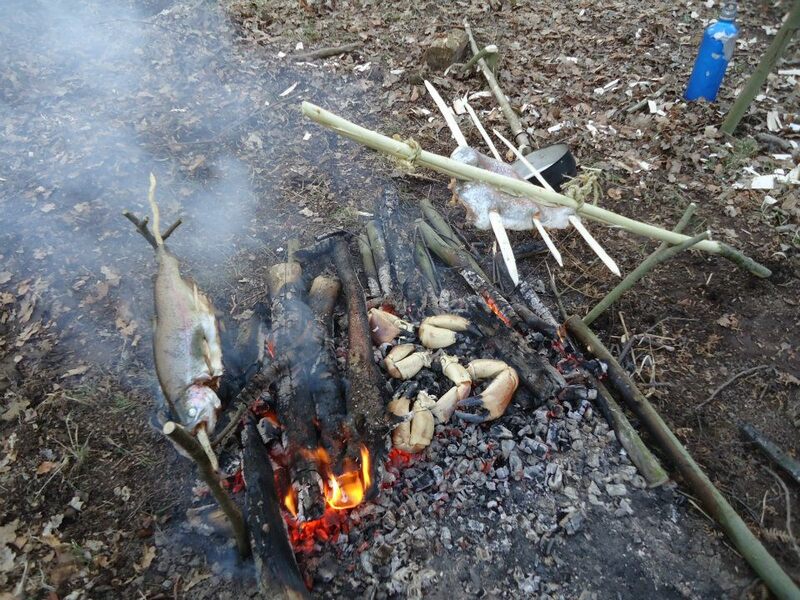 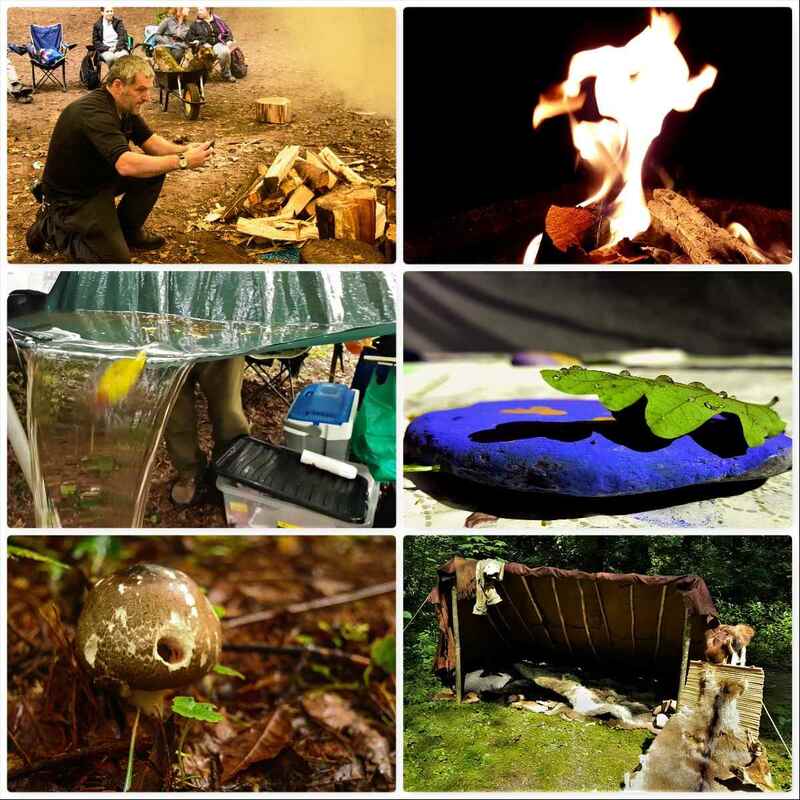 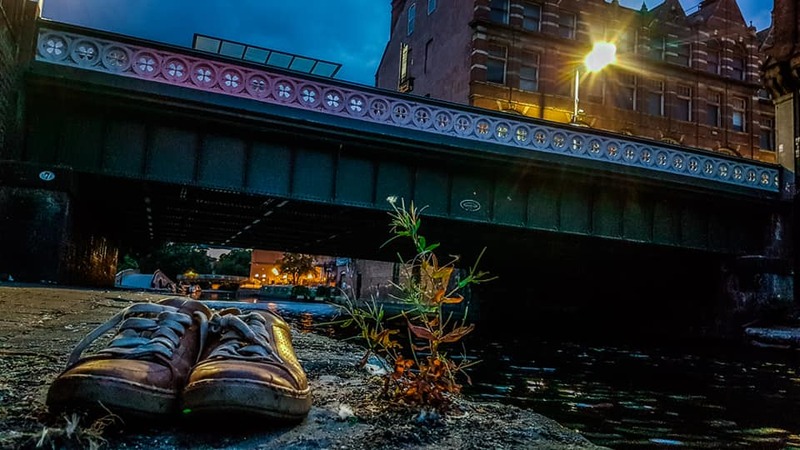 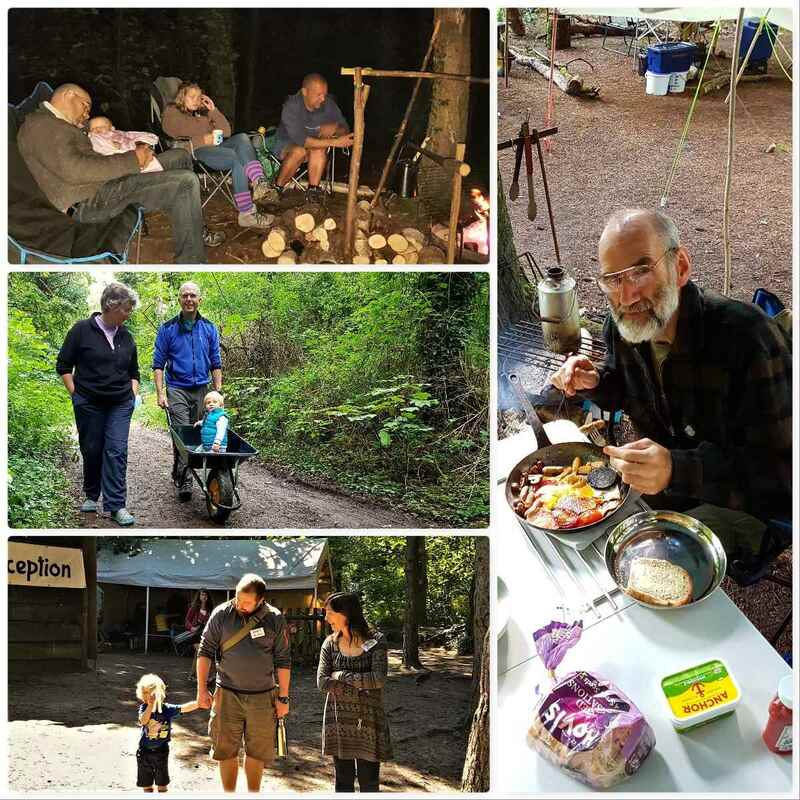 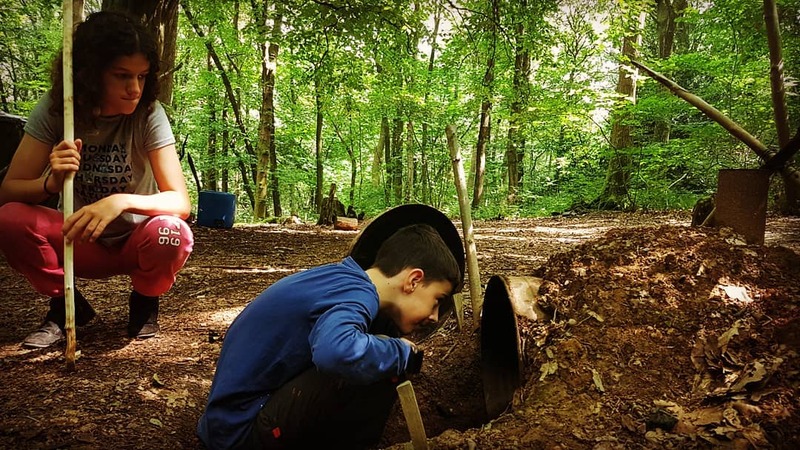 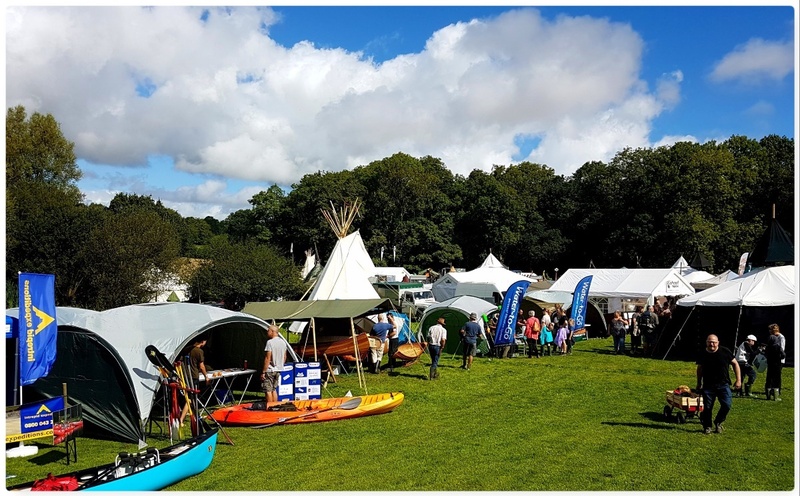 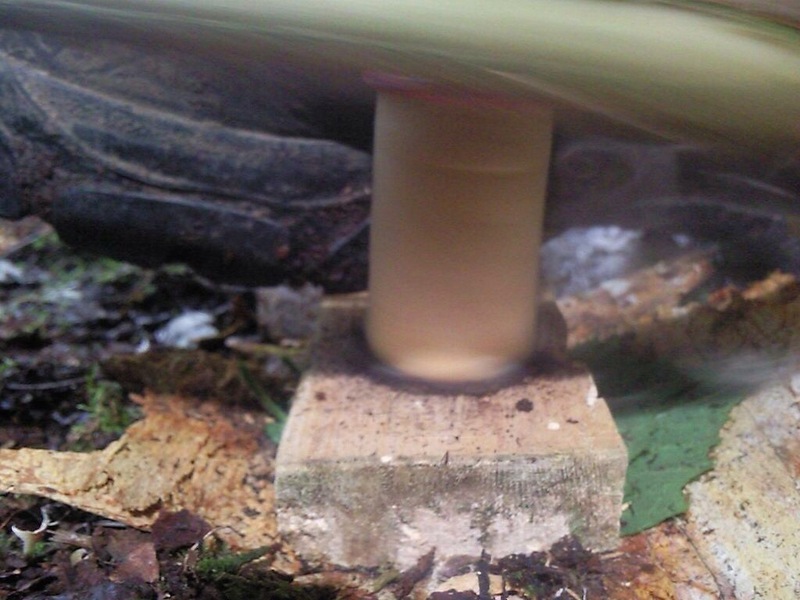 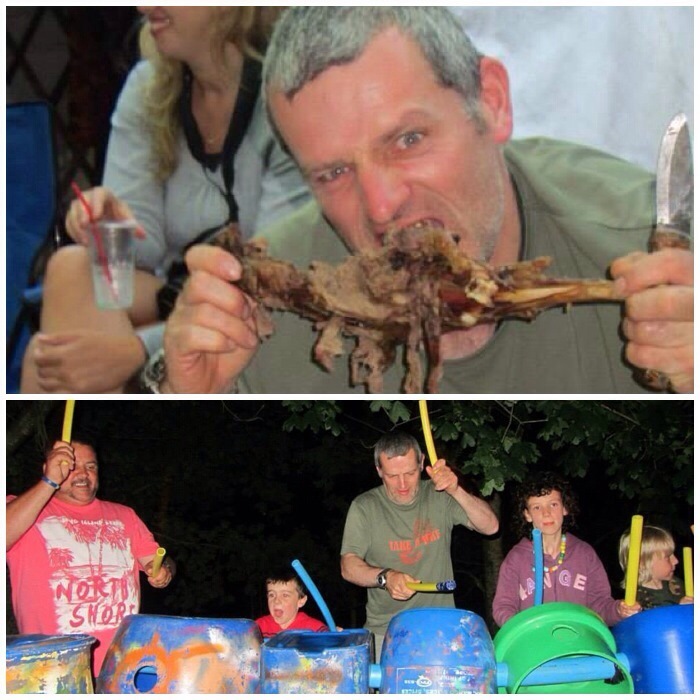 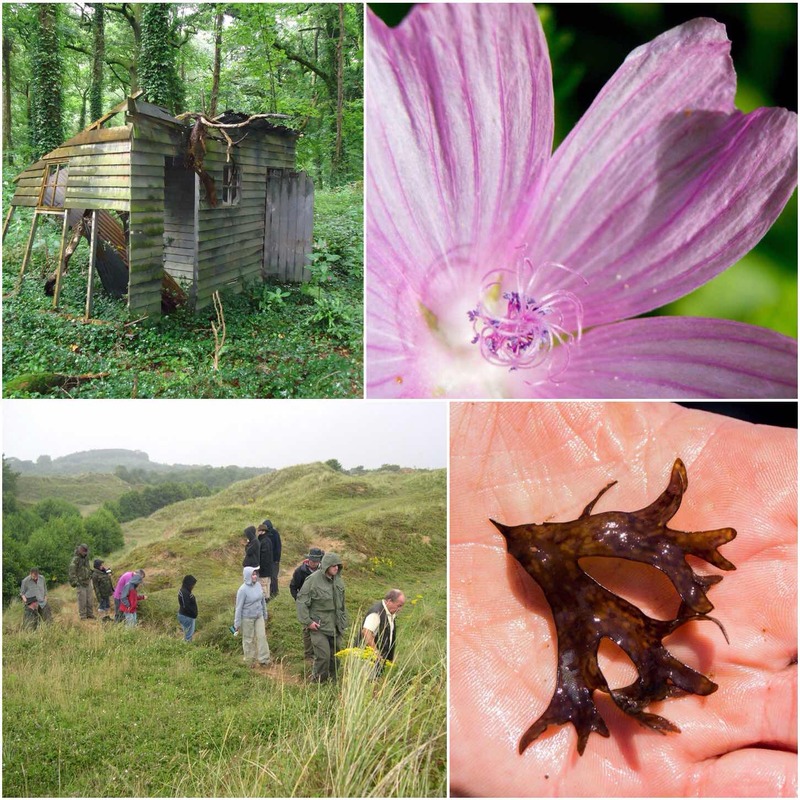 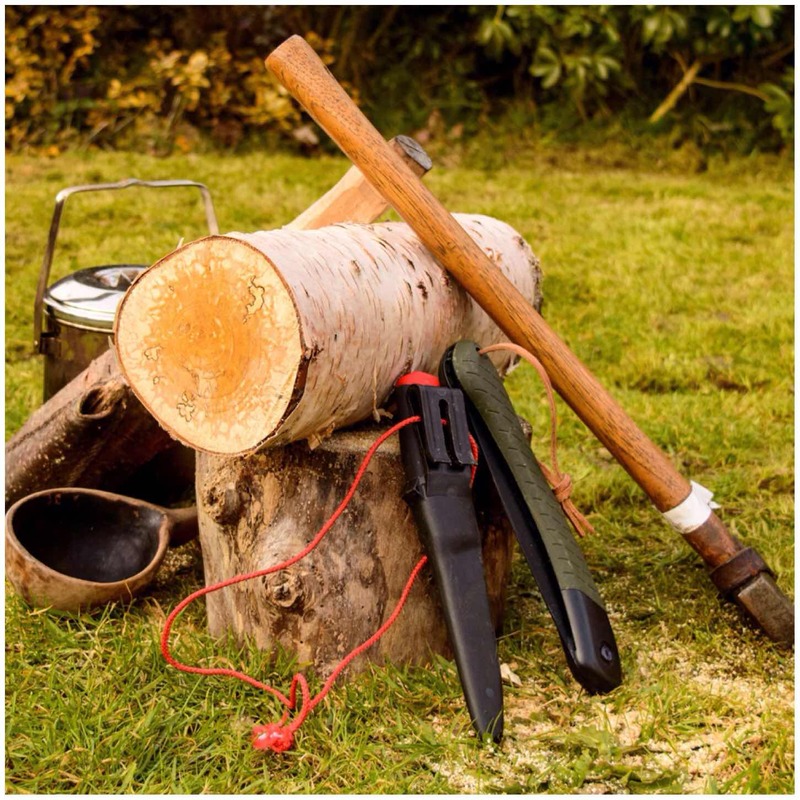 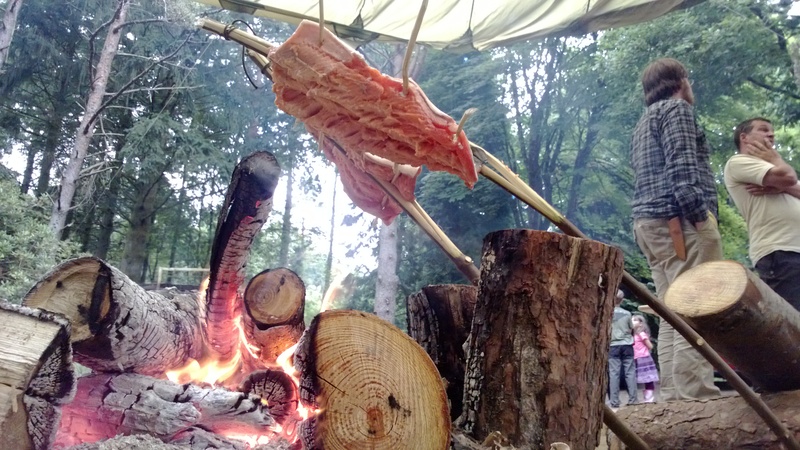 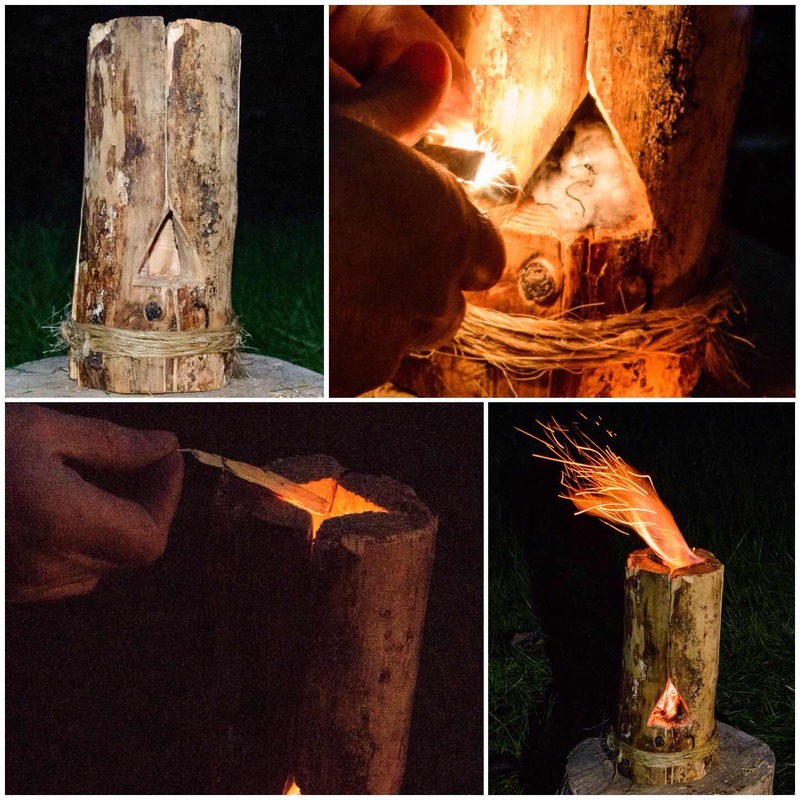 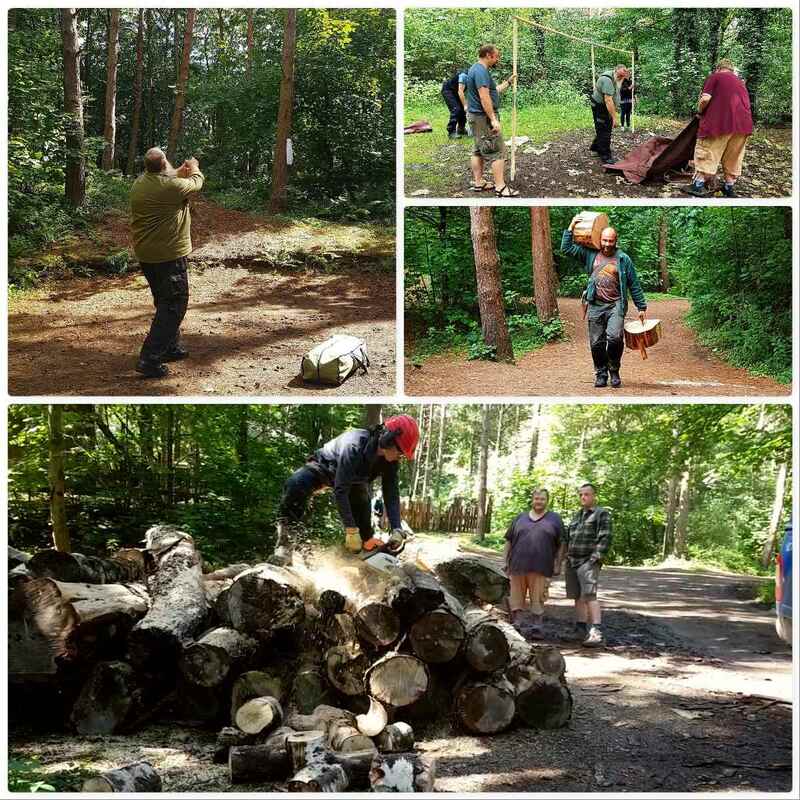 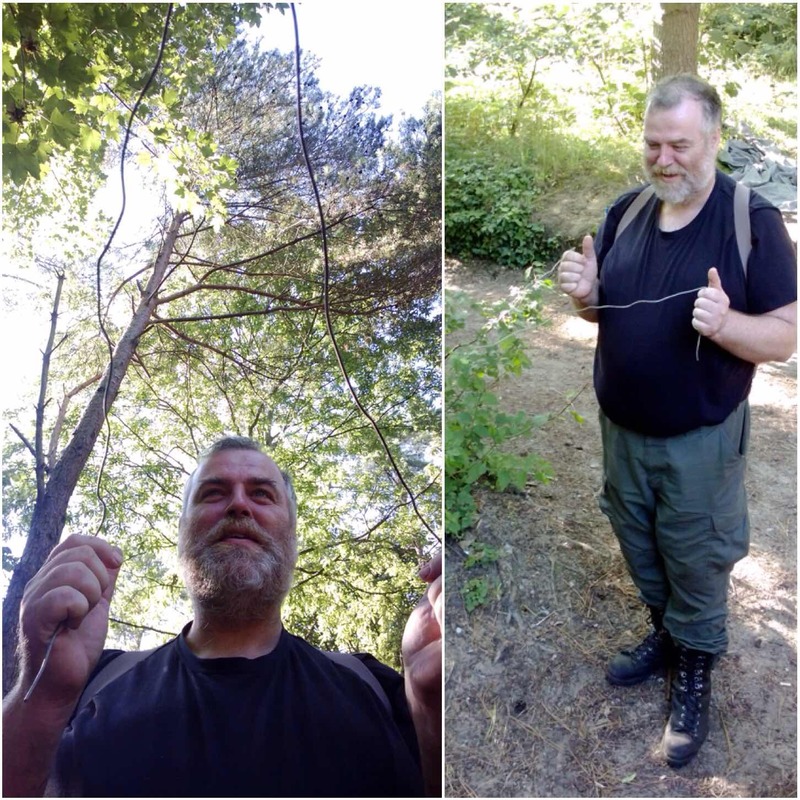 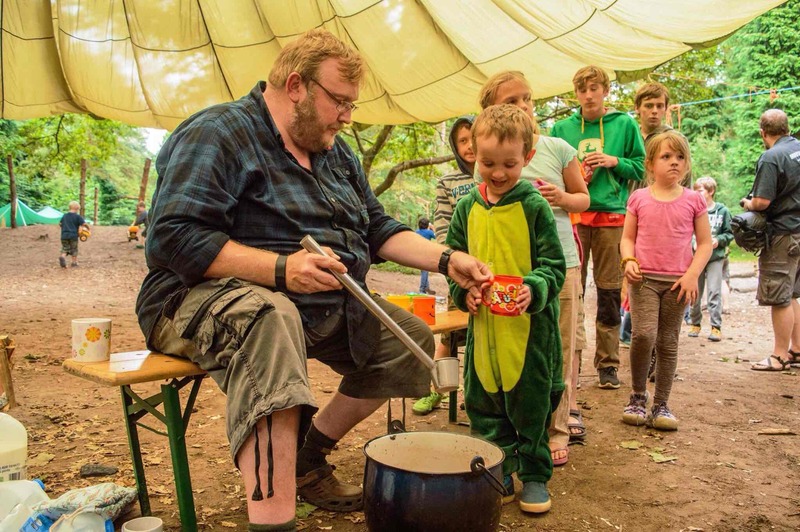 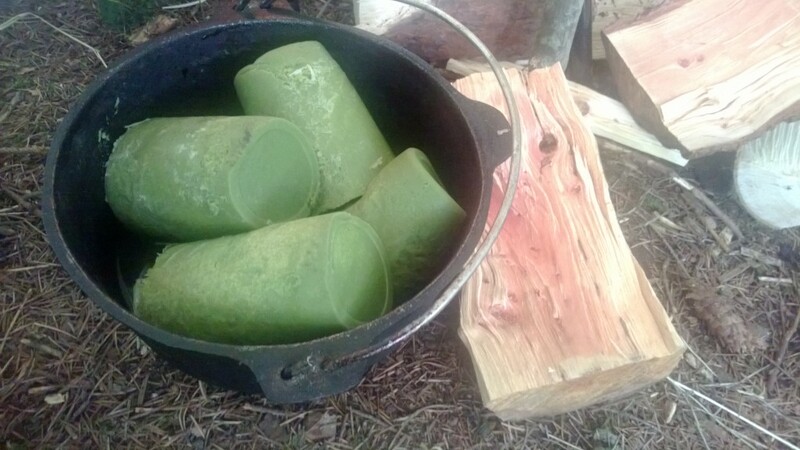 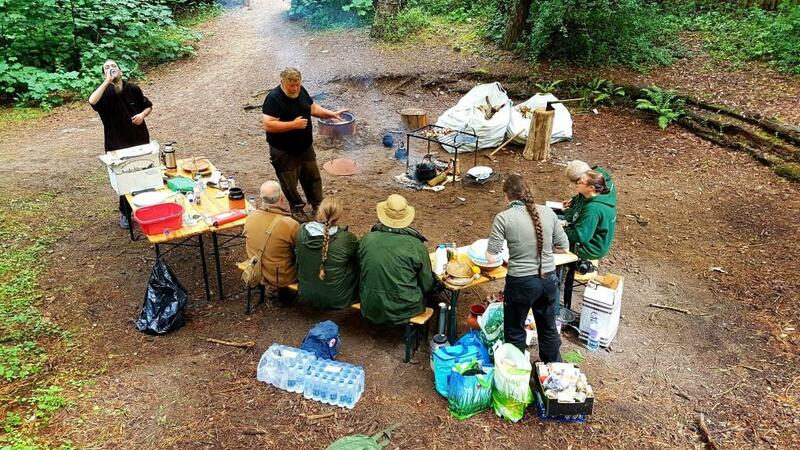 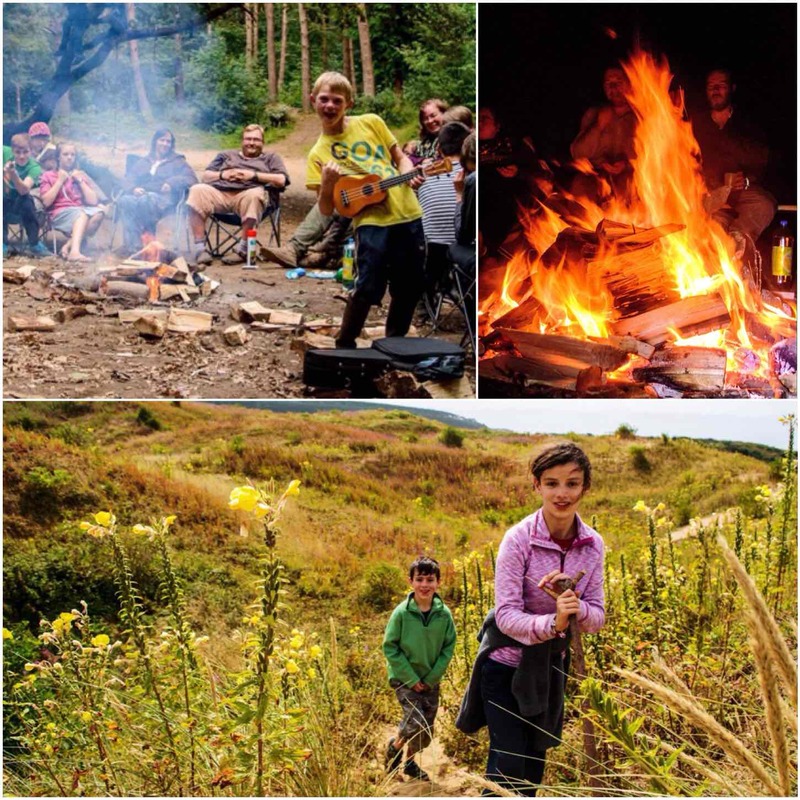 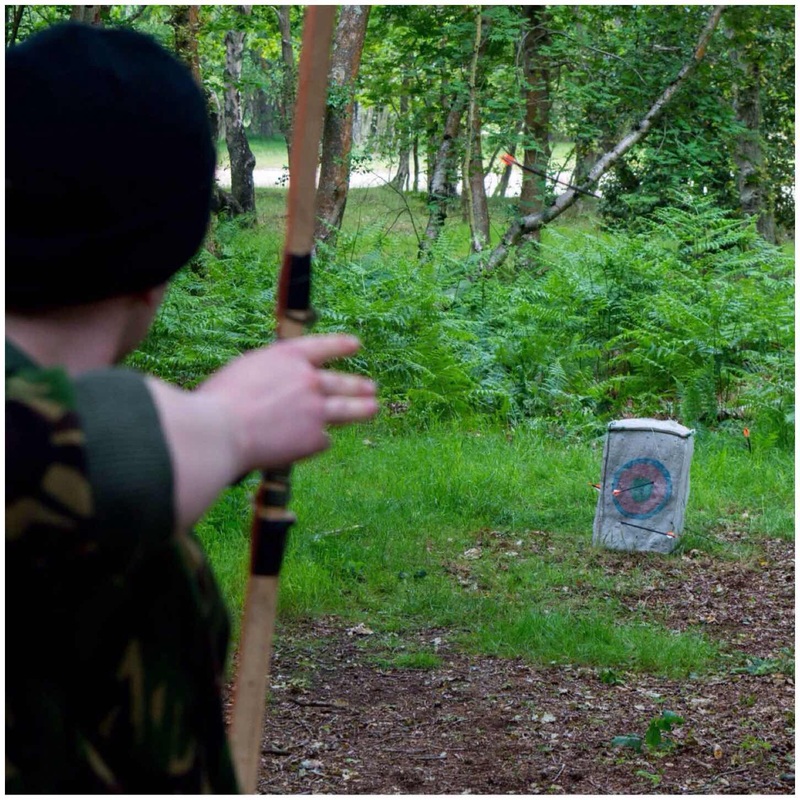 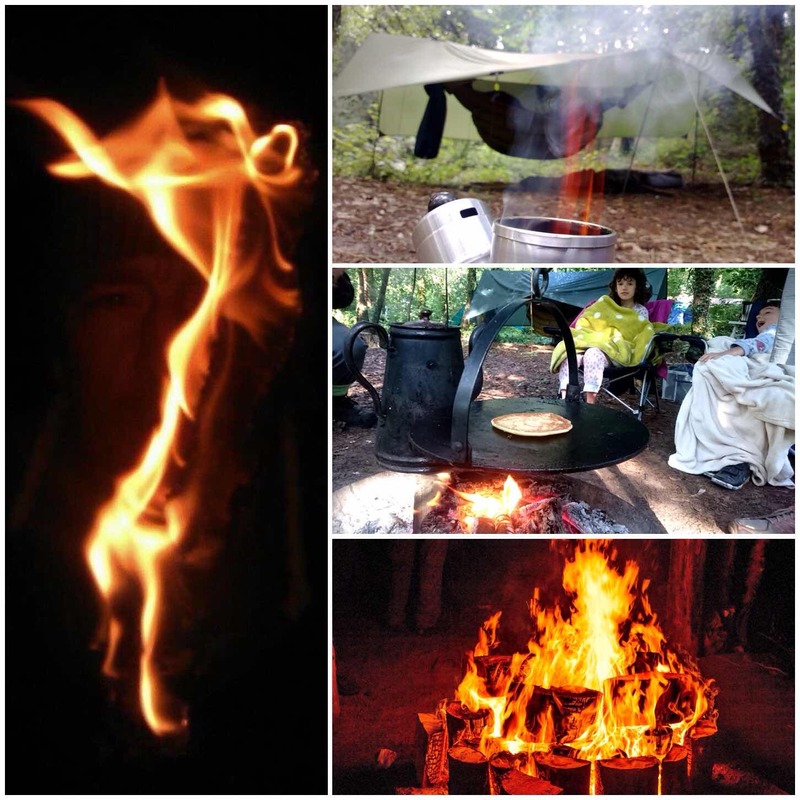 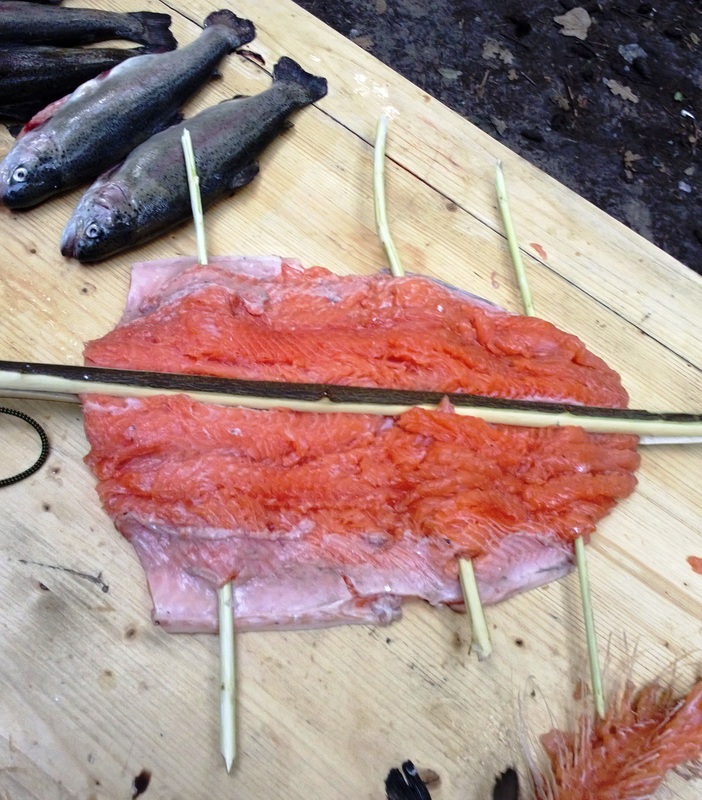 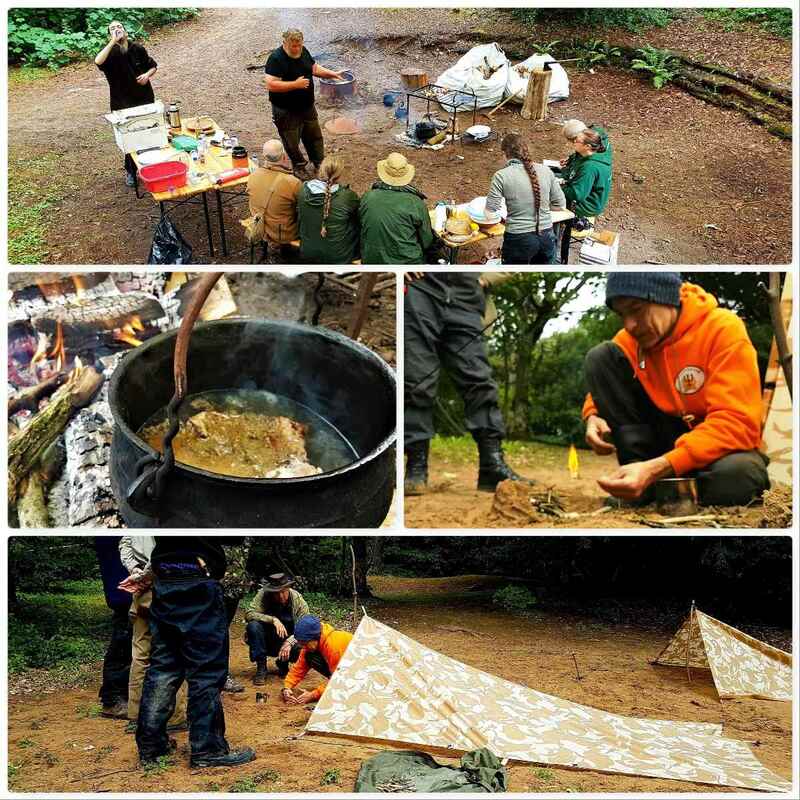 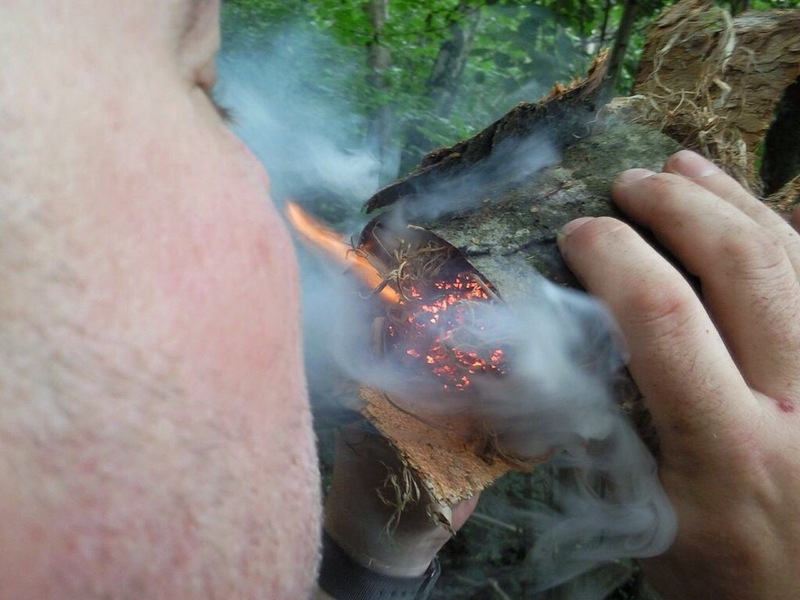 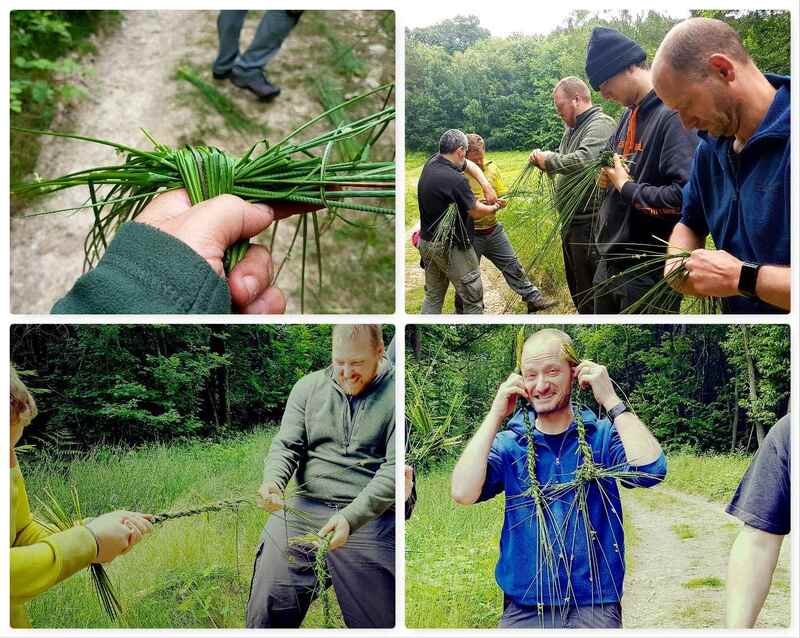 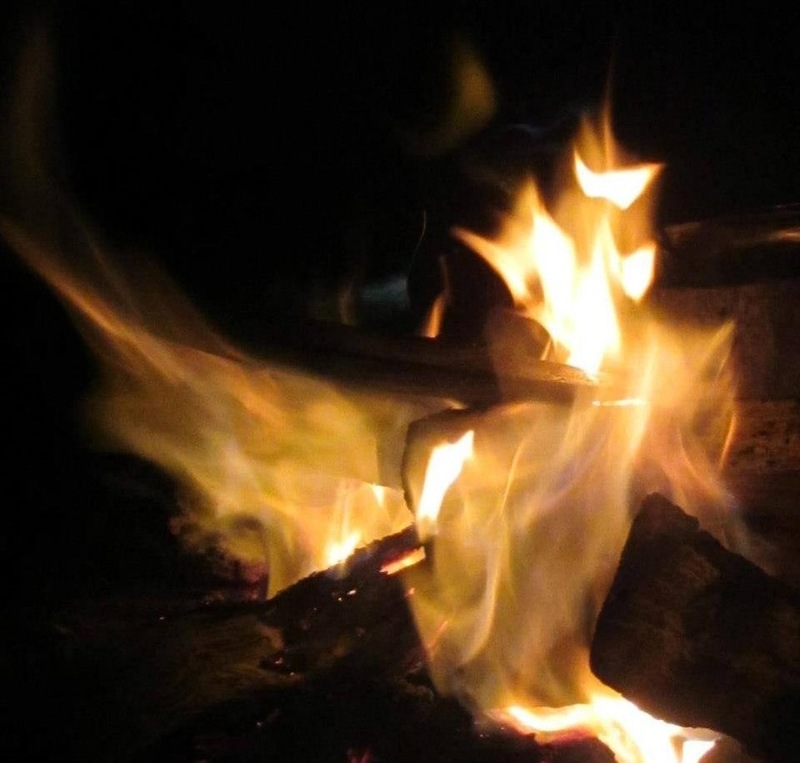 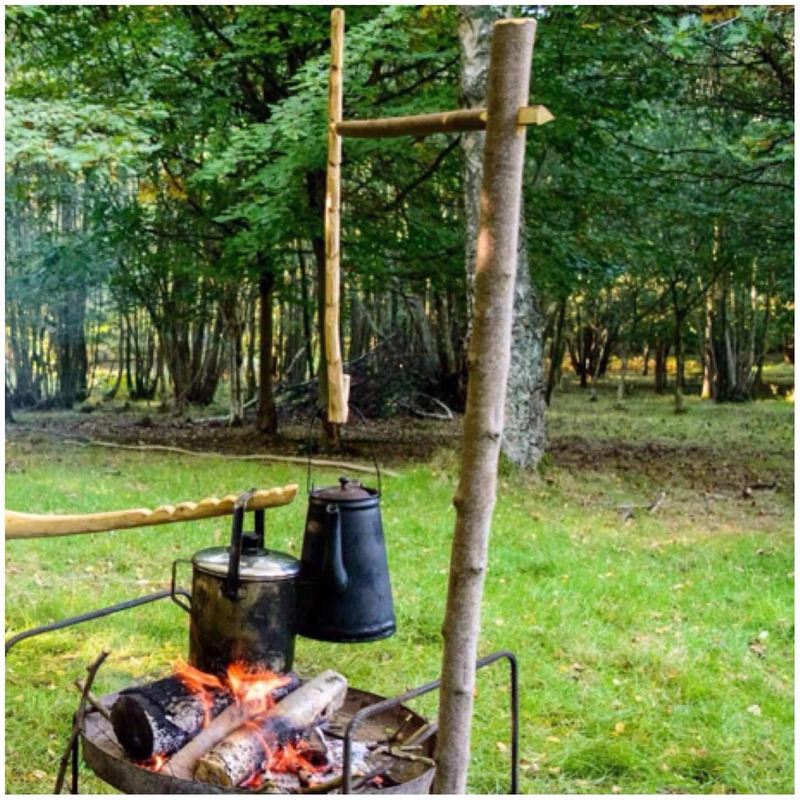 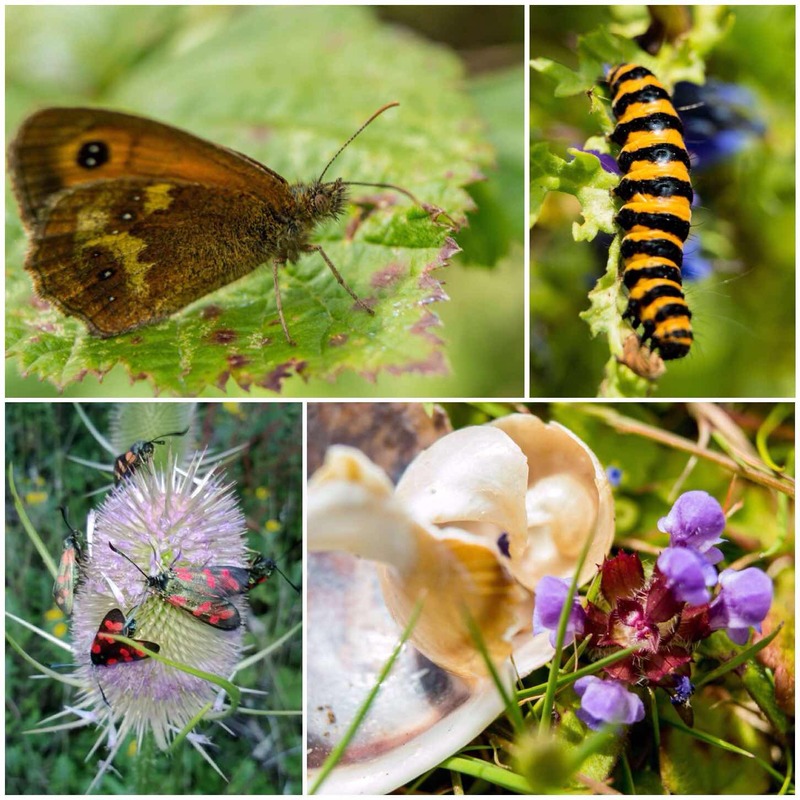 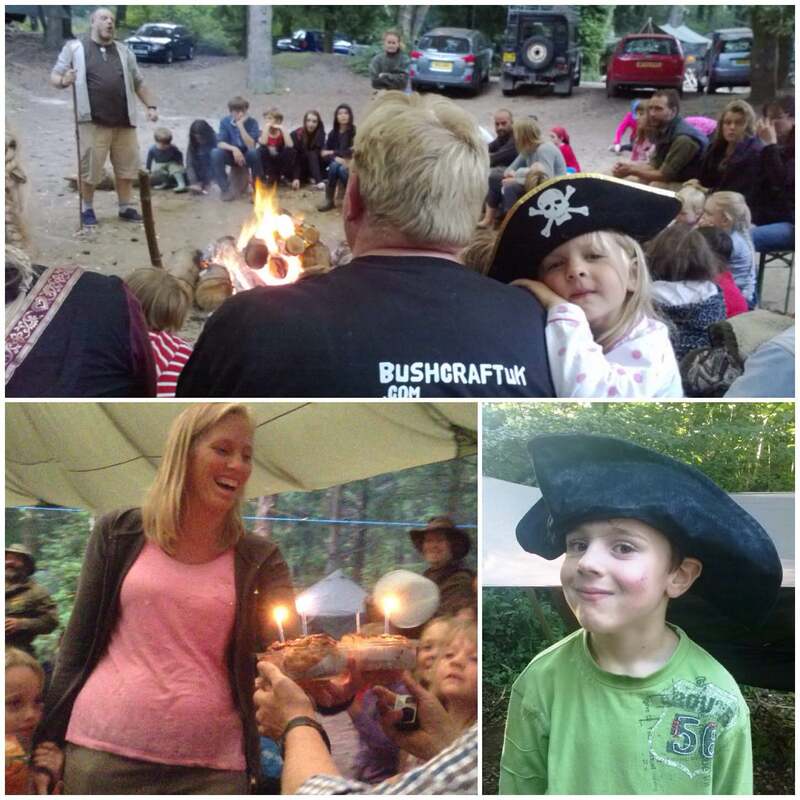 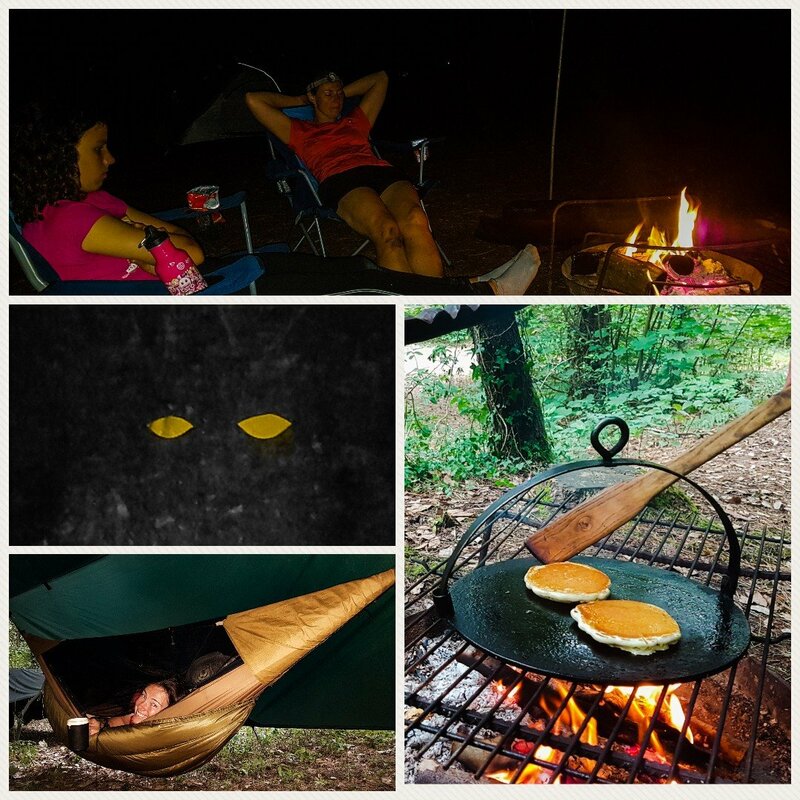 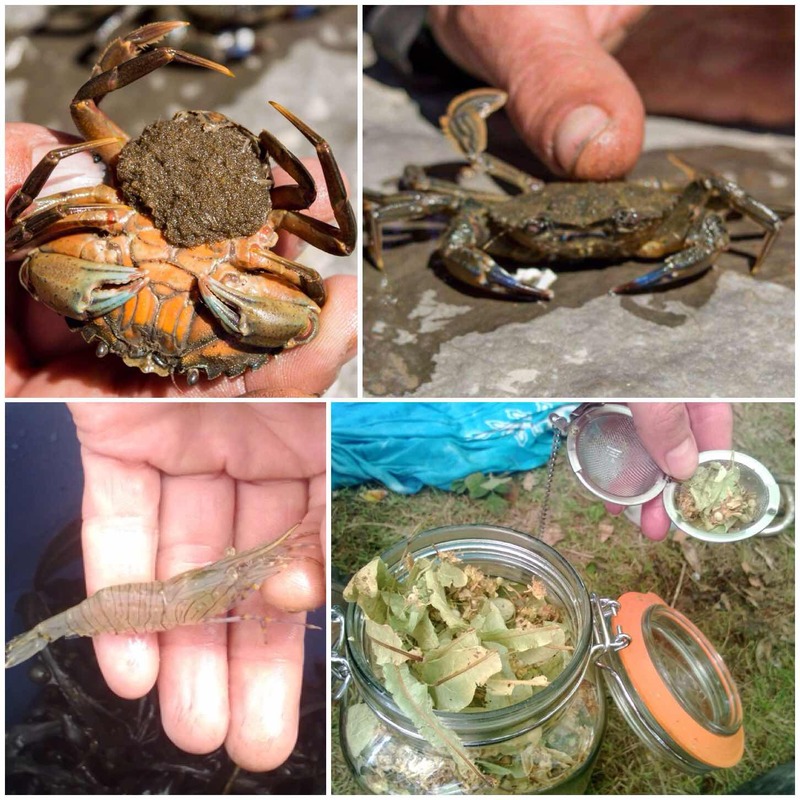 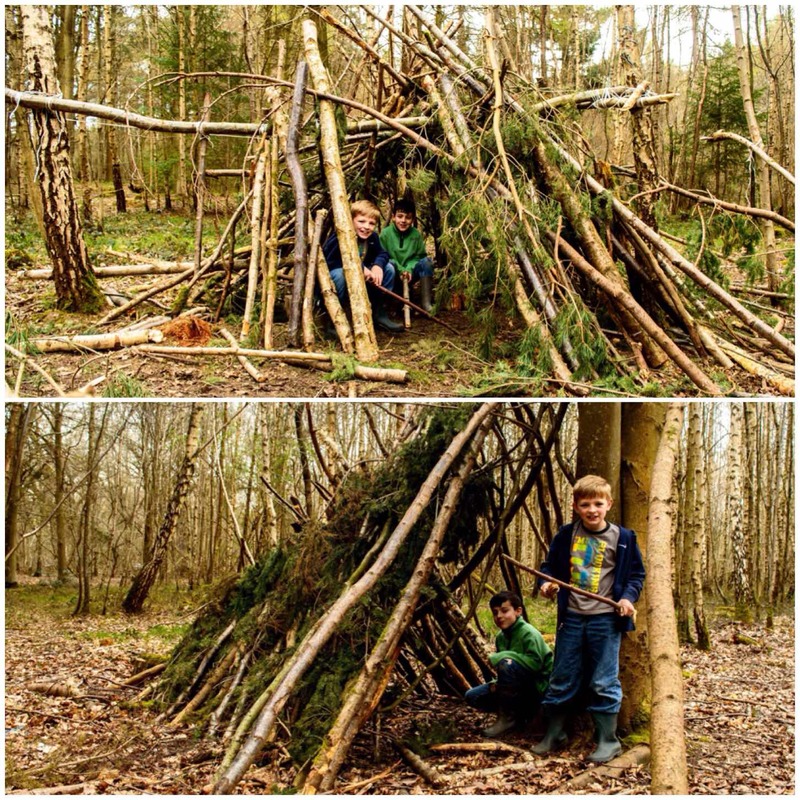 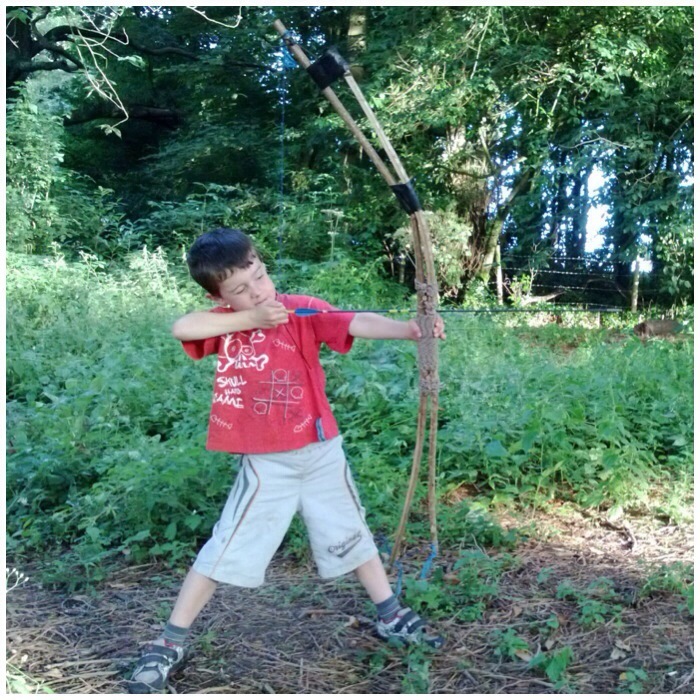 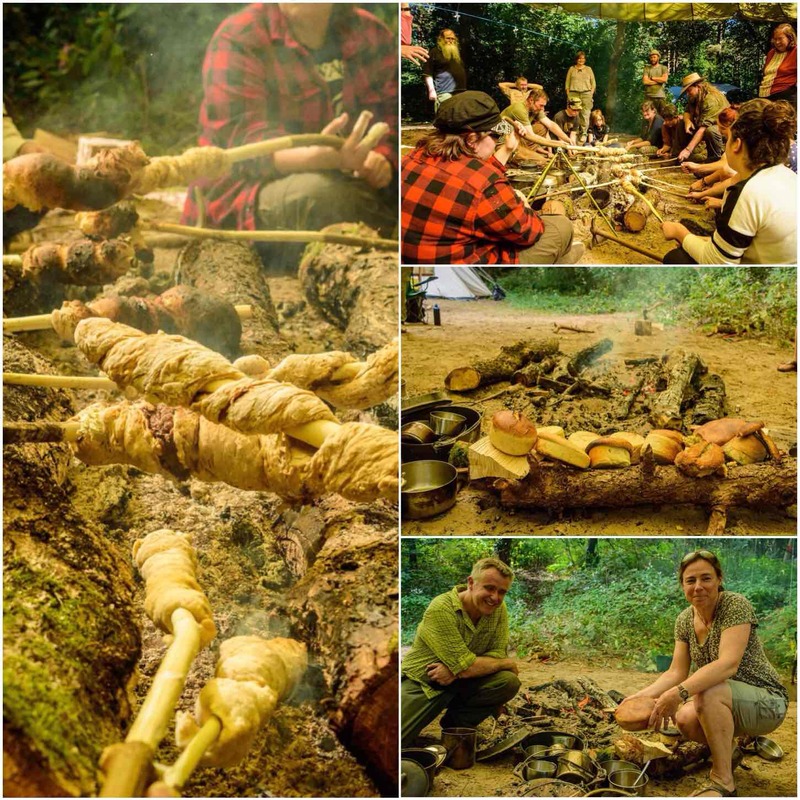 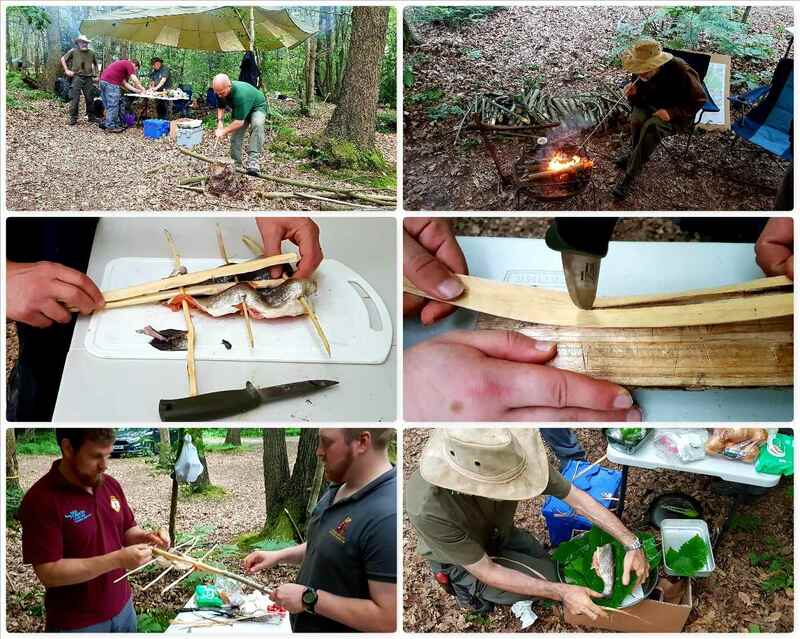 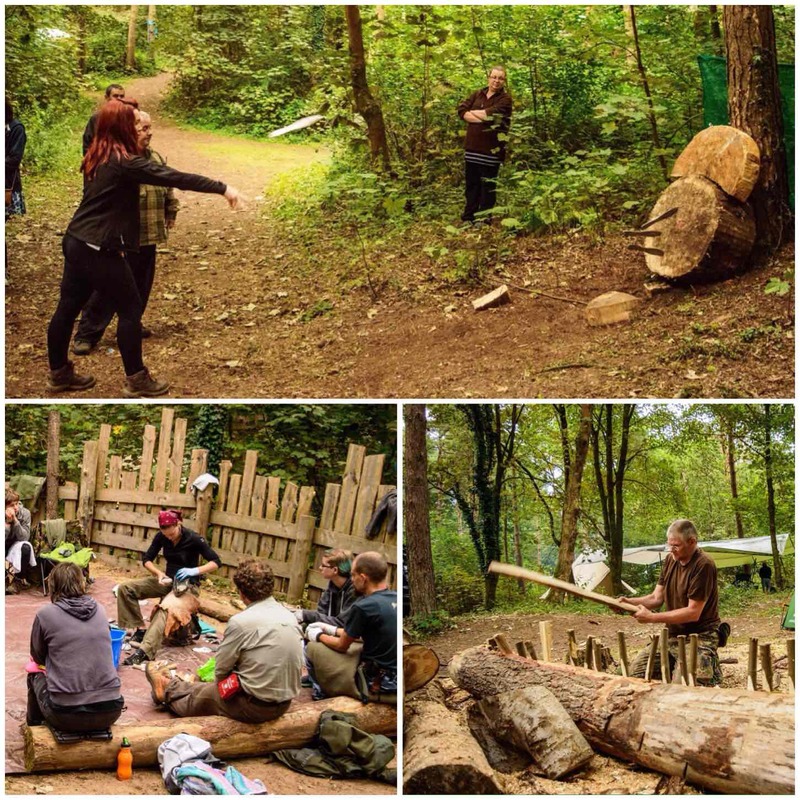 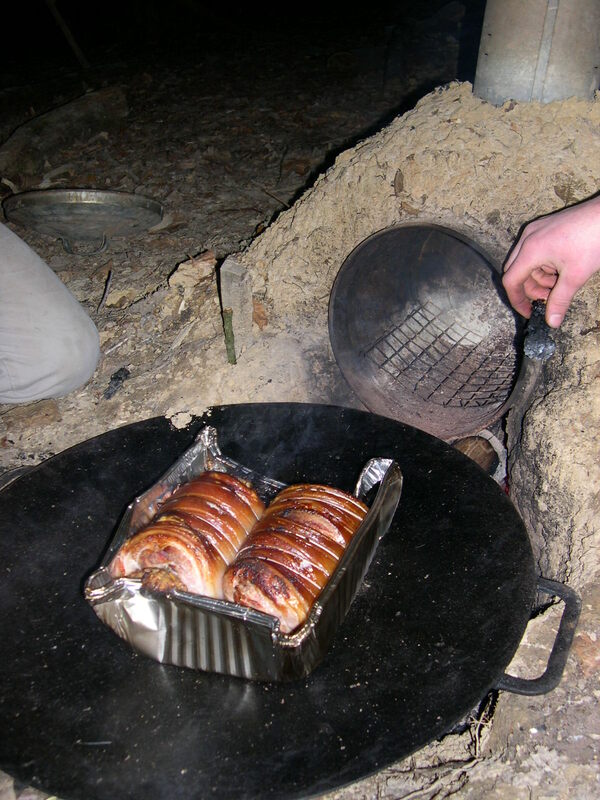 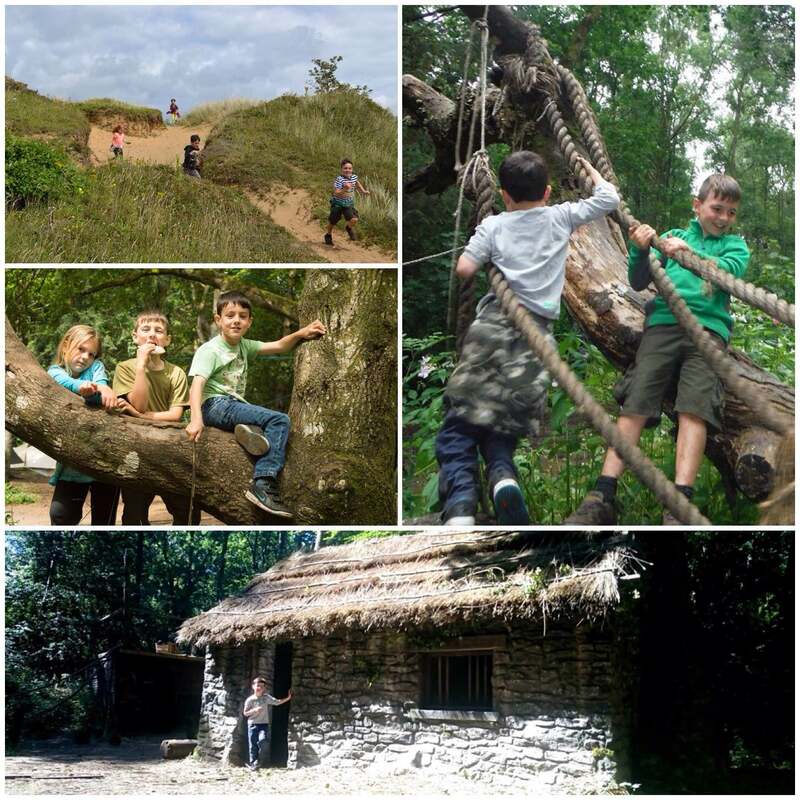 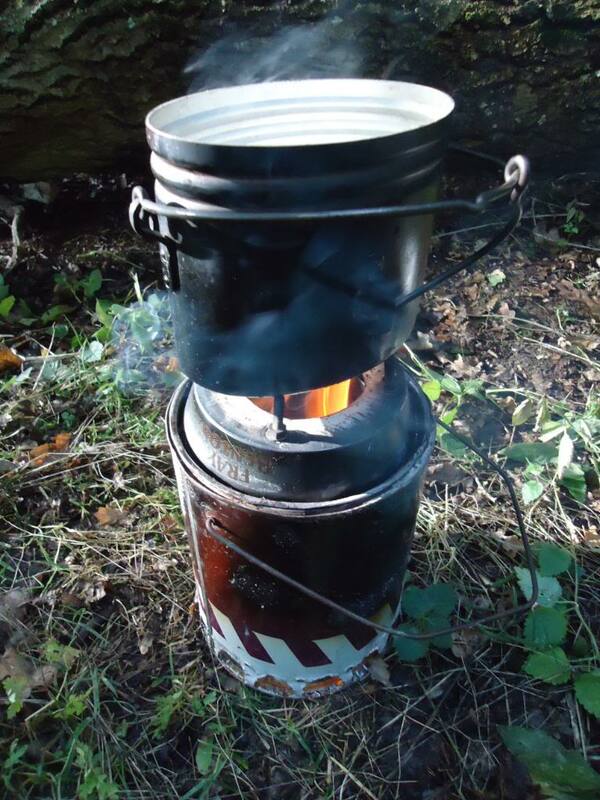 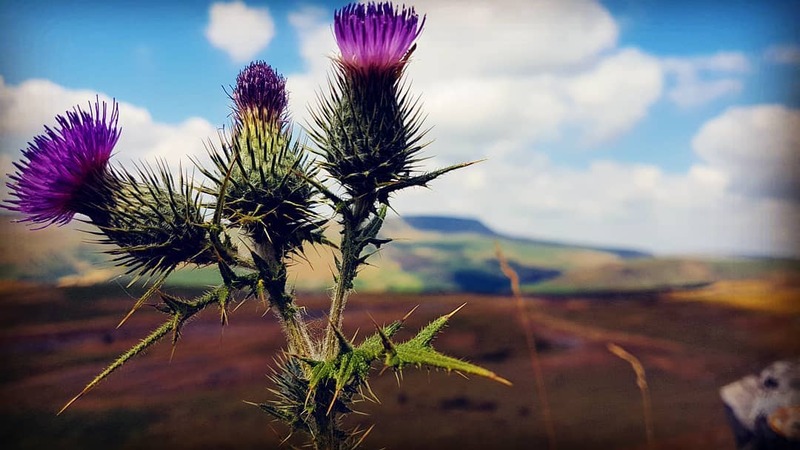 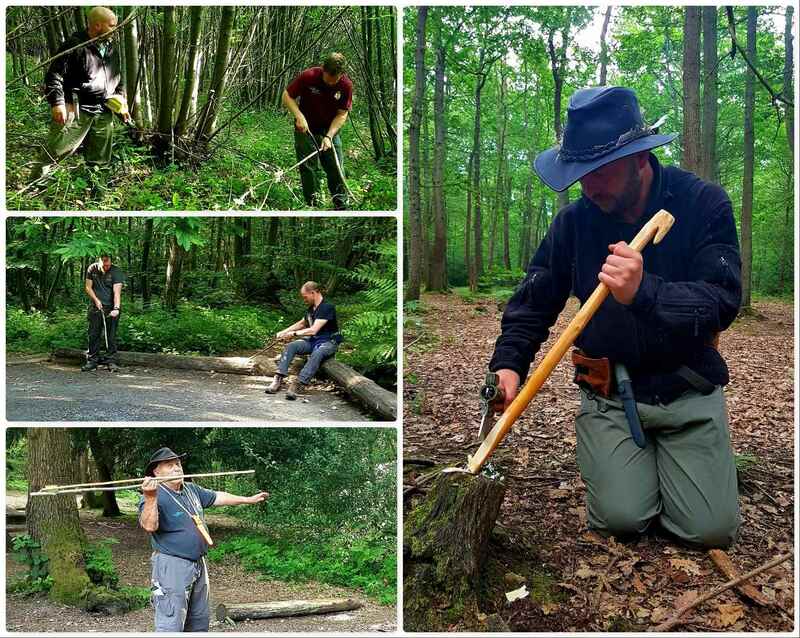 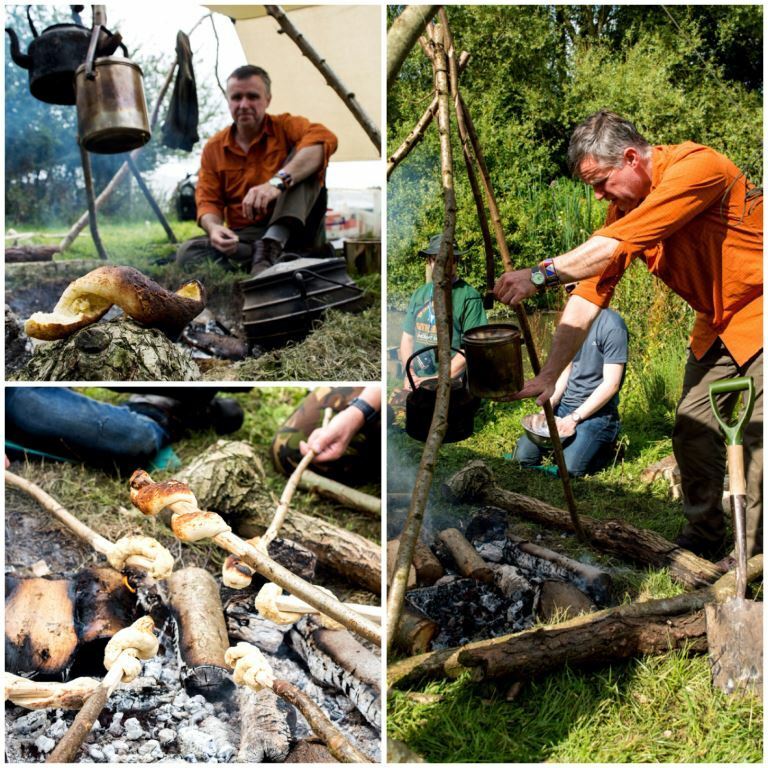 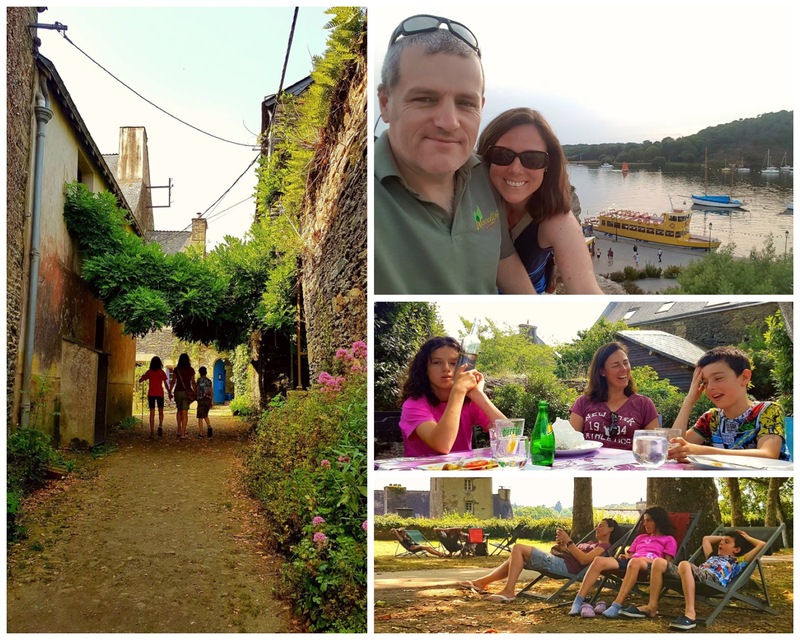 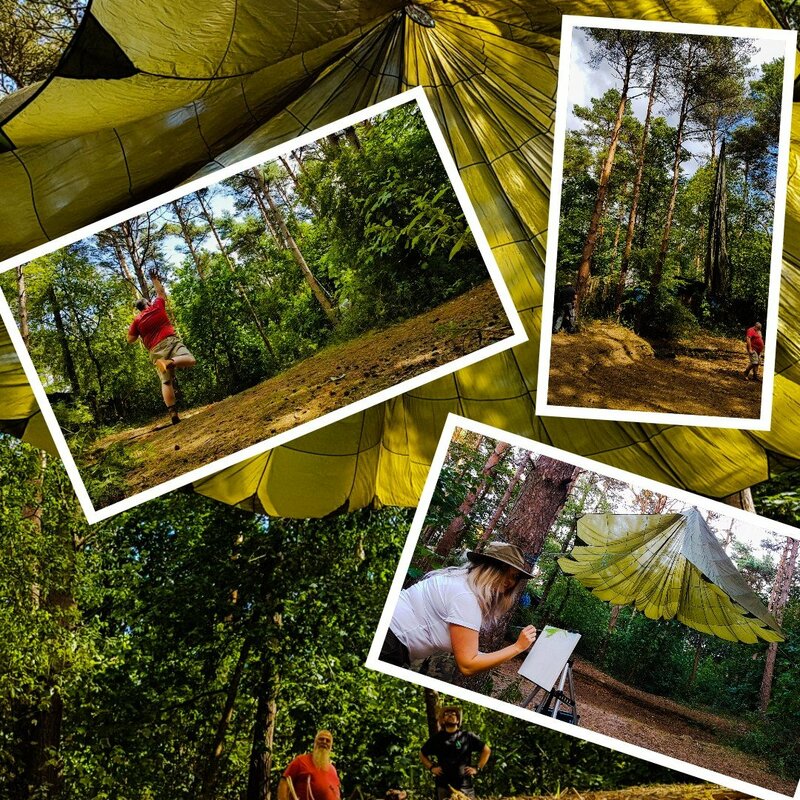 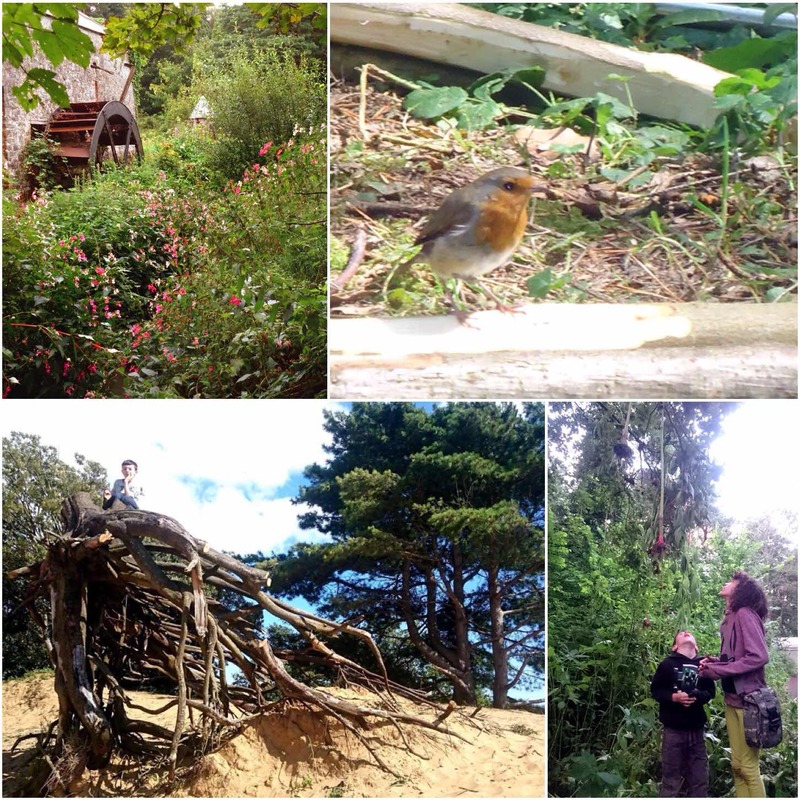 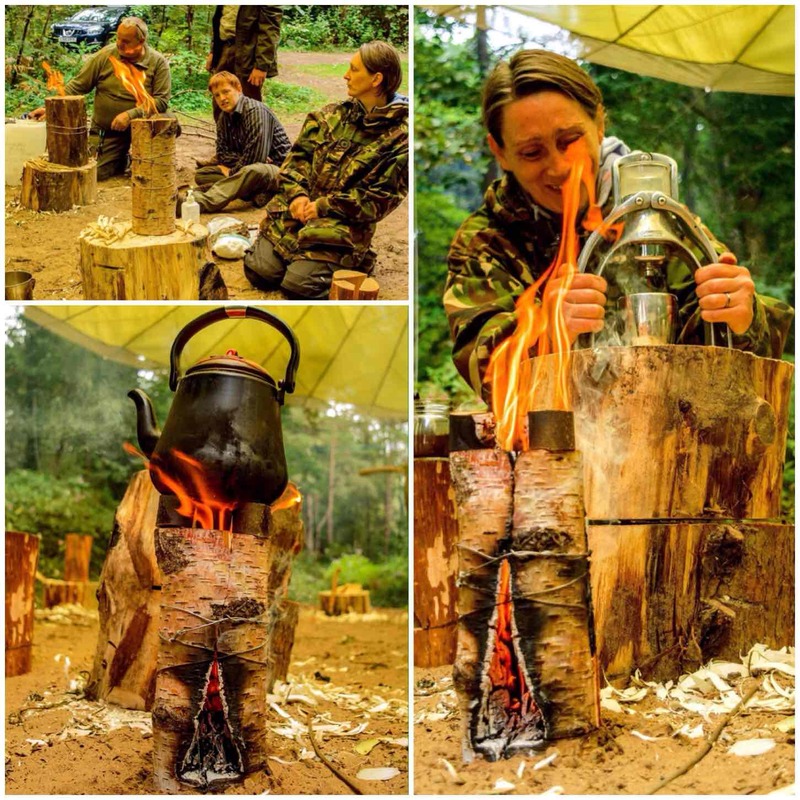 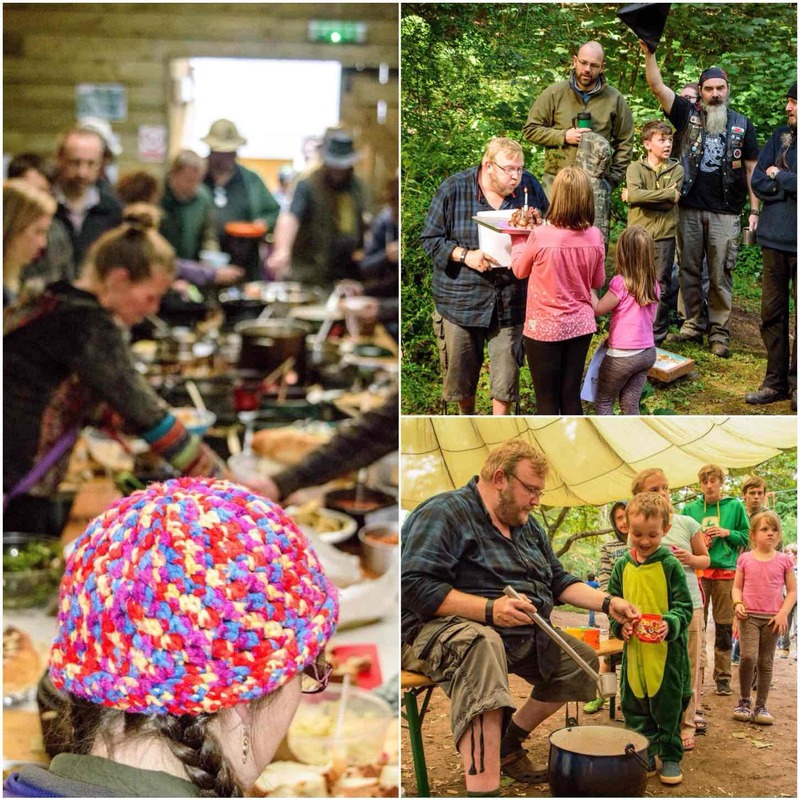 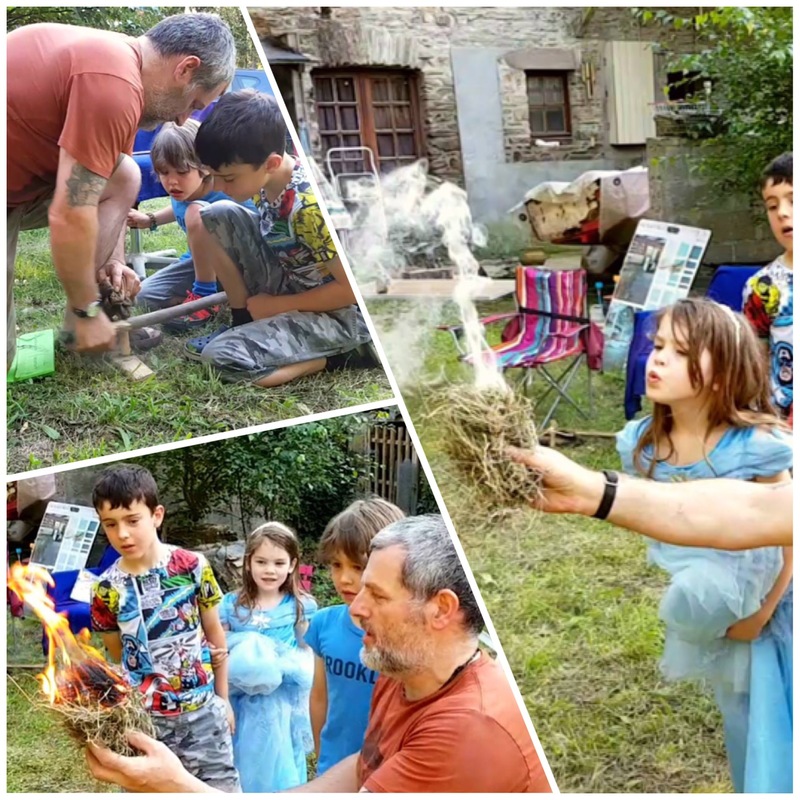 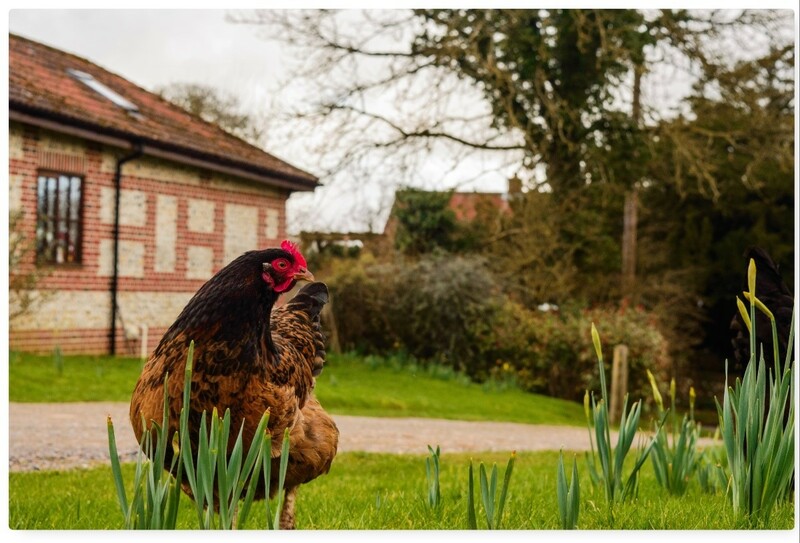 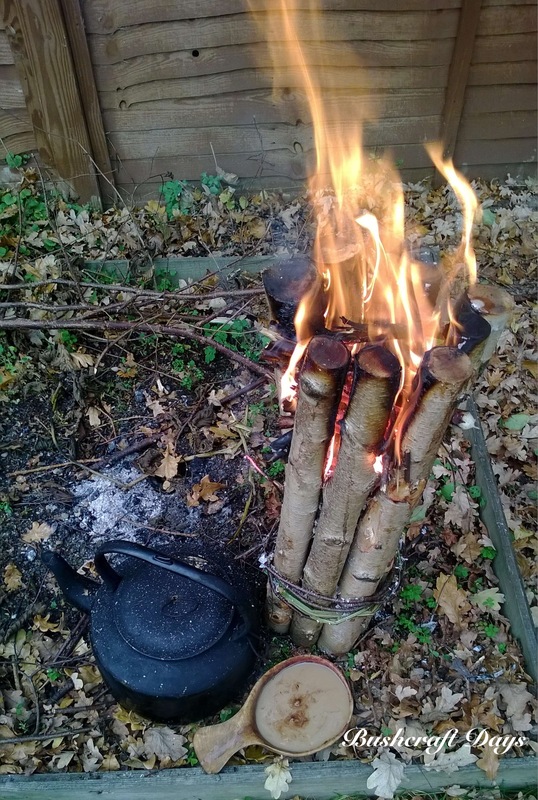 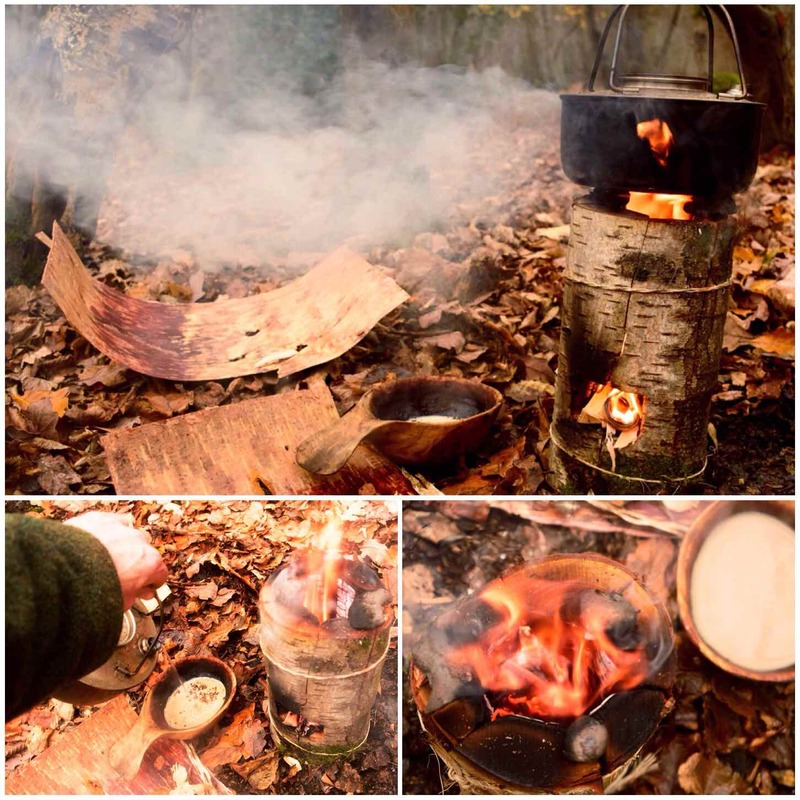 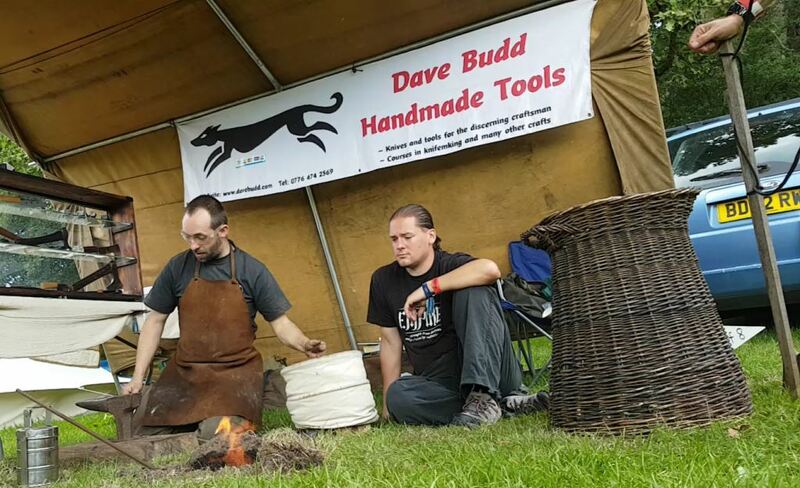 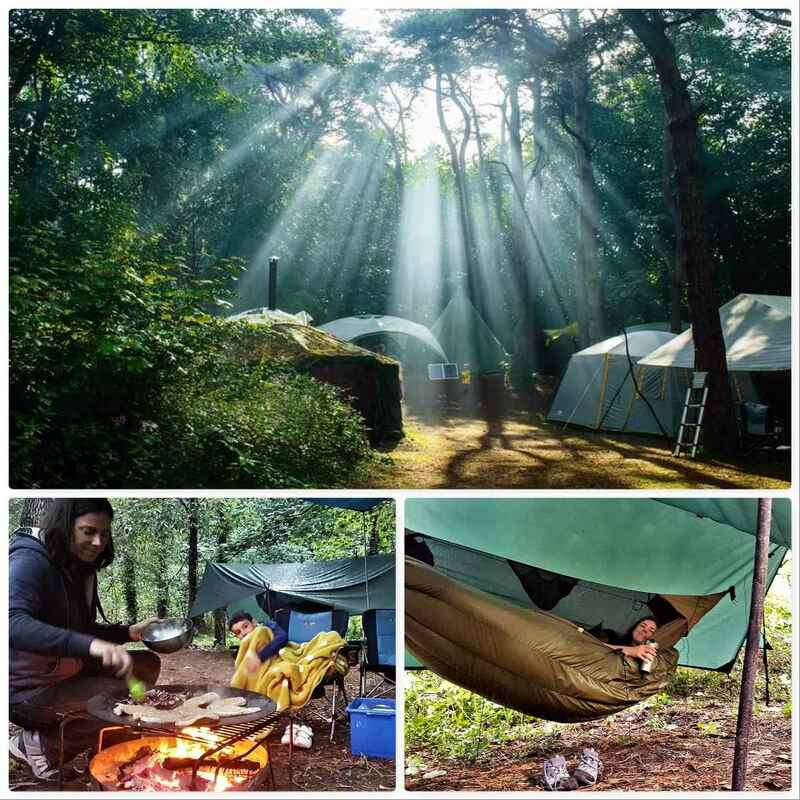 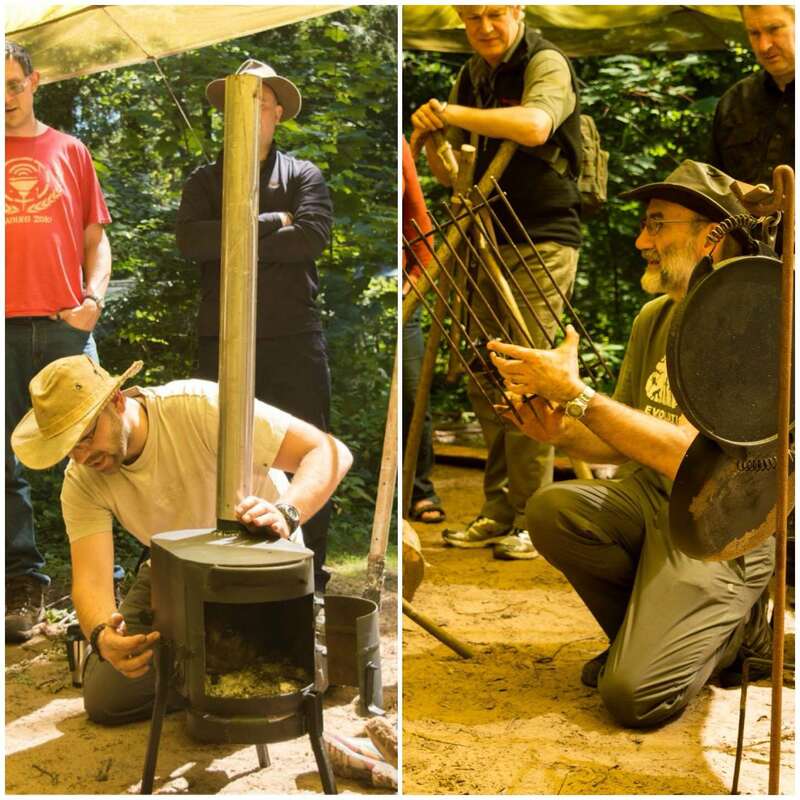 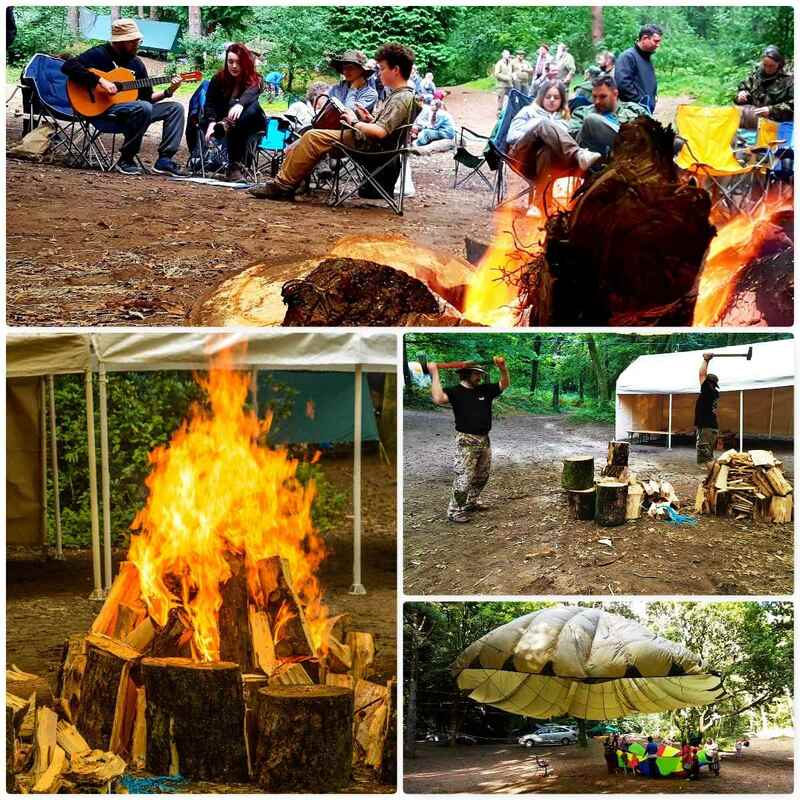 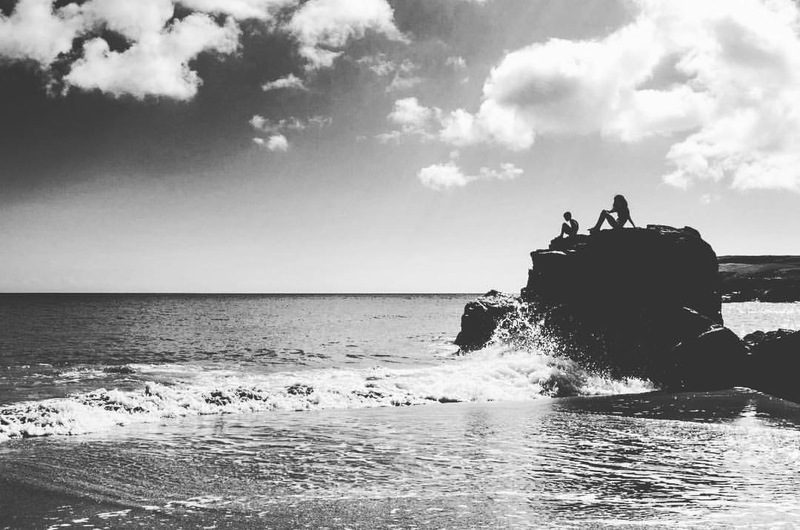 Sadly access to the site is very limited now as Mark no longer works there so I thought instead of just writing about my last visit I would write about some of the different Bushcraft activities we got up to over the years. 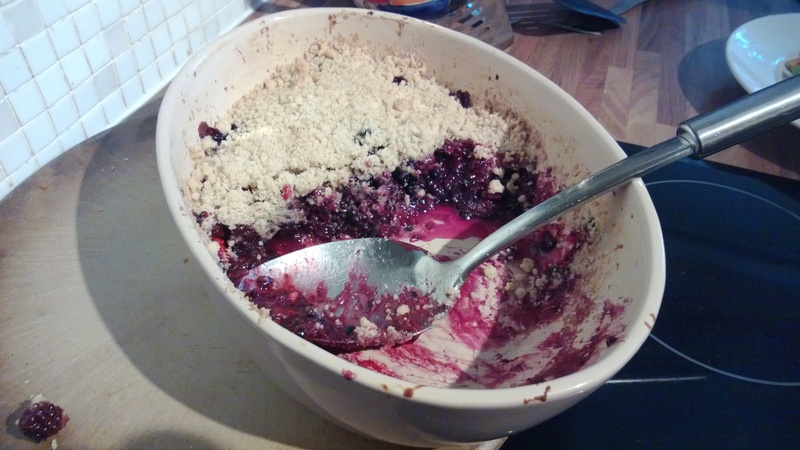 This was probably the last picture I took in February. 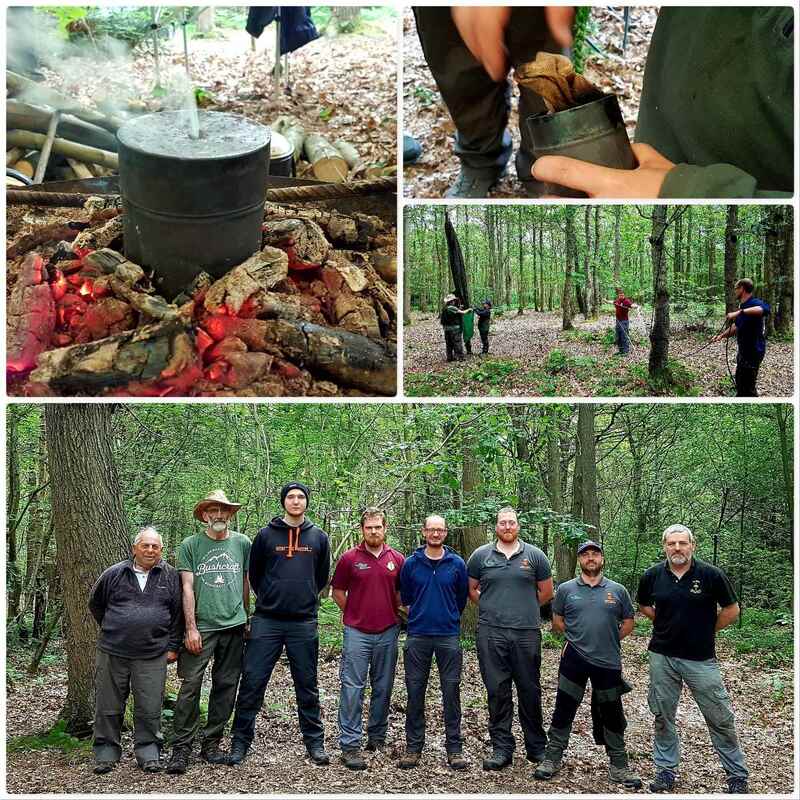 Apart from Mark Beer and Adam Cottrell who are in this picture other regular members who attended were Nick Currie, Mat Howes, Andy Smith, Jon Searle and Rod Anderson Boyle. 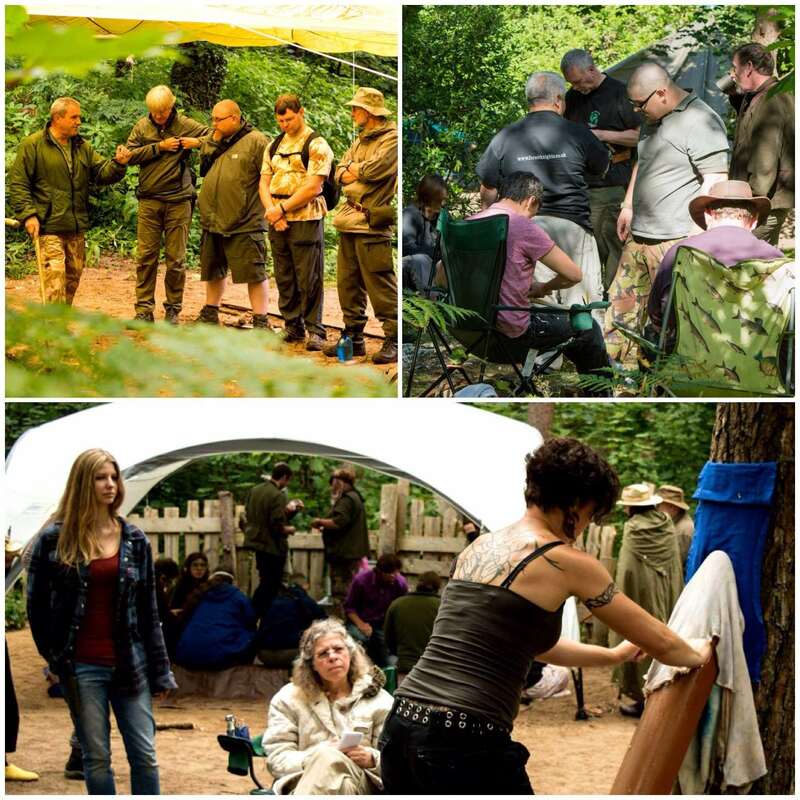 There have been many more who have attended in the past so please forgive me for not listing everyone. 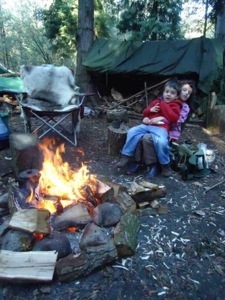 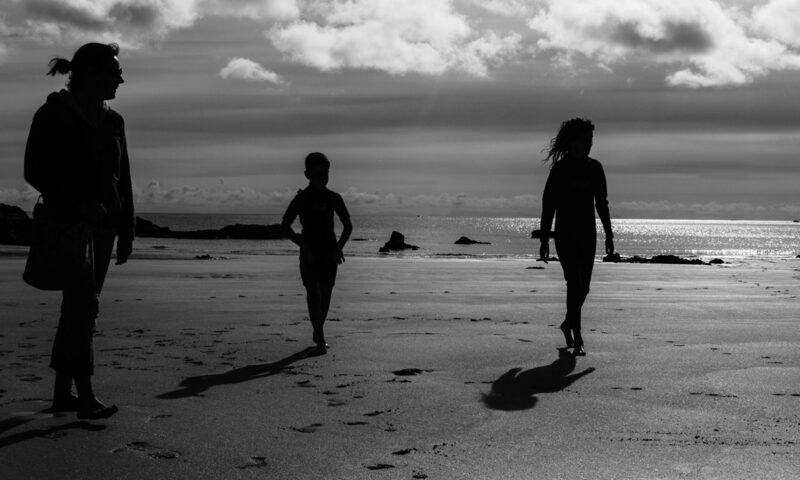 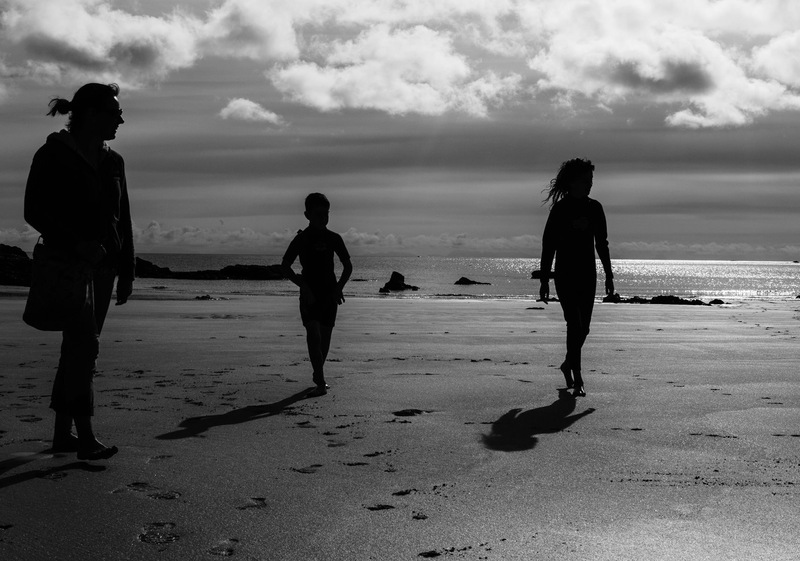 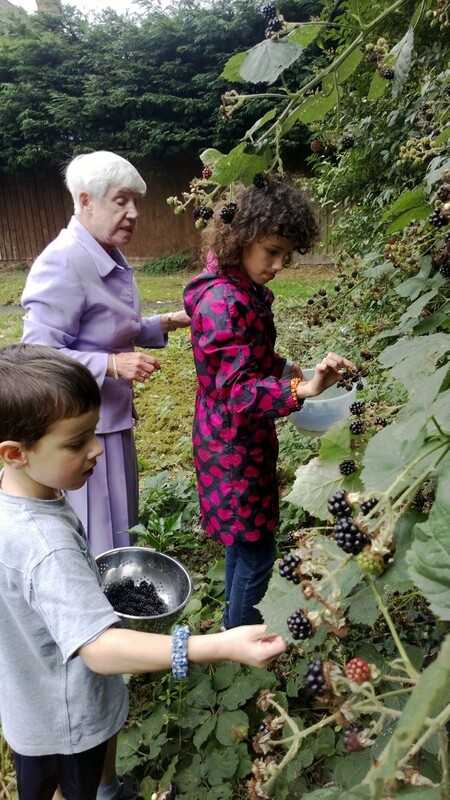 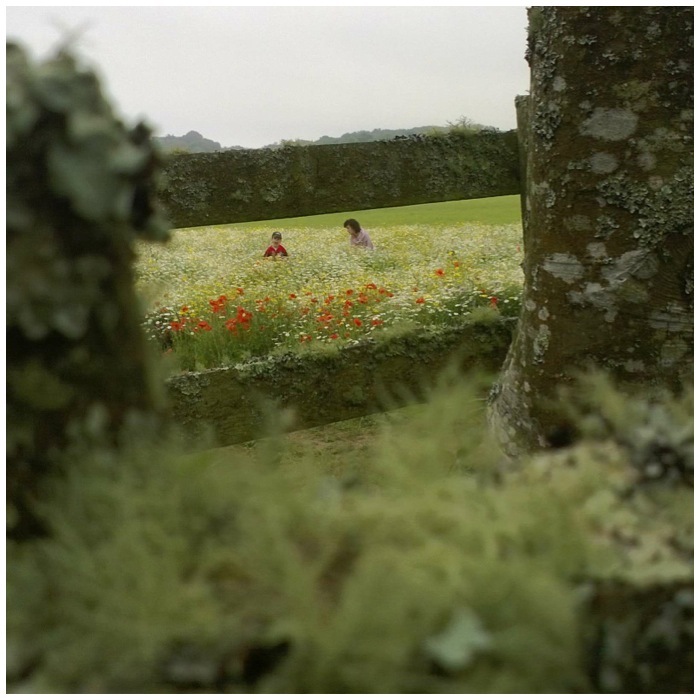 My kids have visited the site a few times over the years where they were always welcomed. 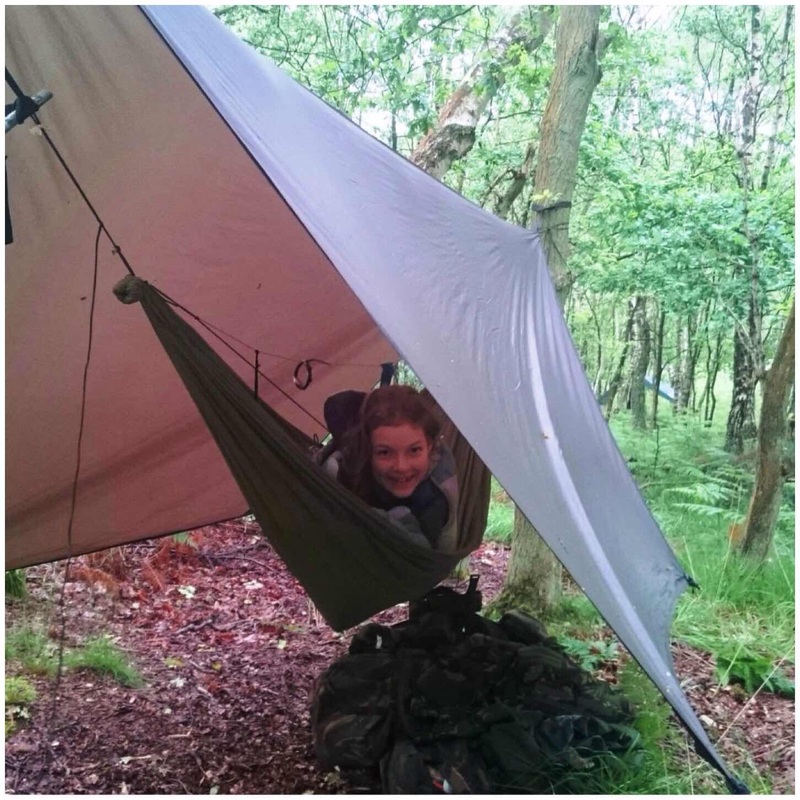 Catherine was very happy to sleep in her hammock here and was always keen to dance around the fire to the music of one of the flutes. 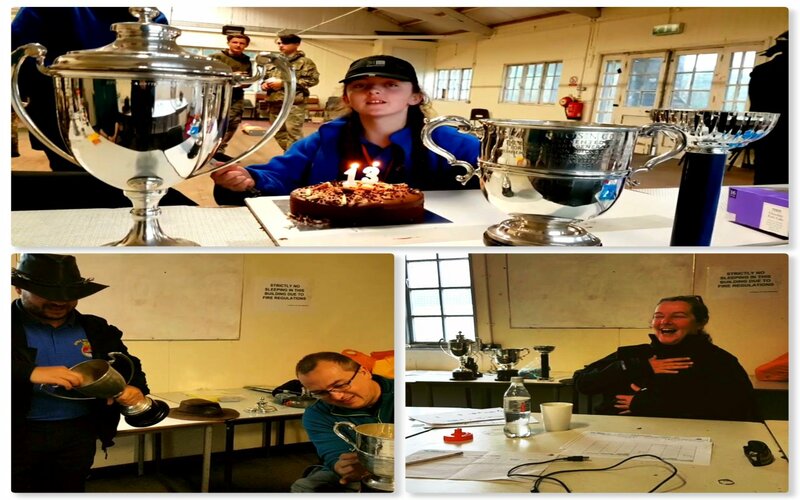 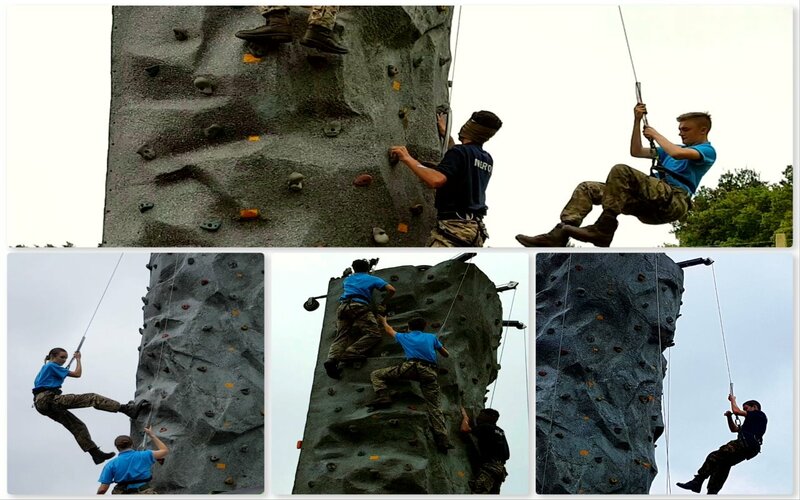 They are always keen to learn but this is one place where I could generally relax (cadet free zone) and learn from all the guys who would be there. 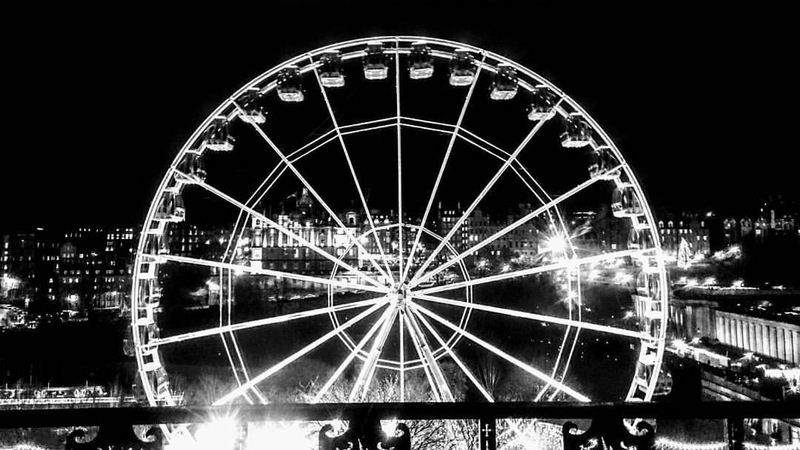 One of the things I liked about spending time here was to listen to all the different music that was played. 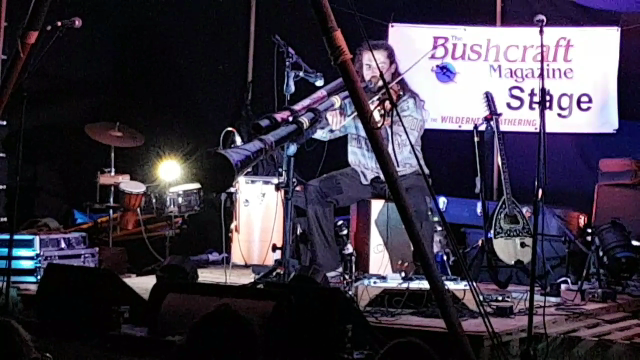 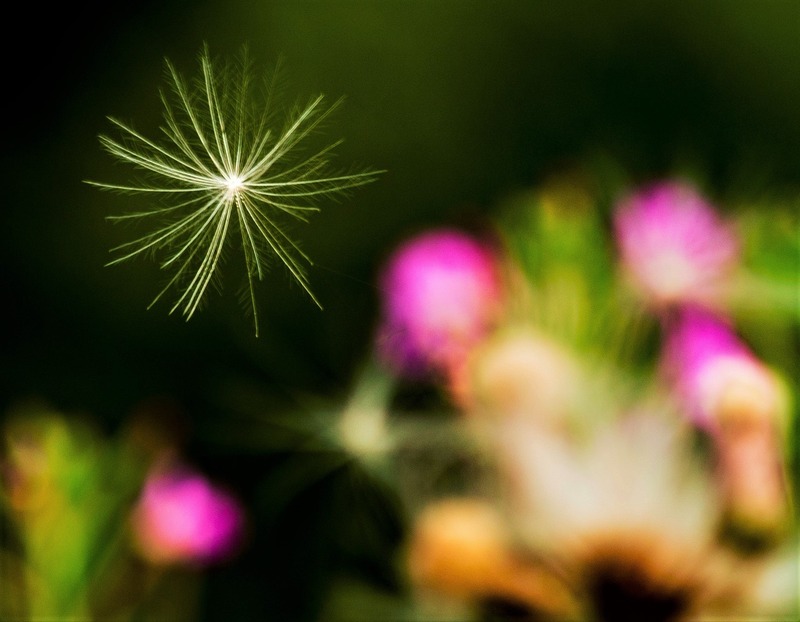 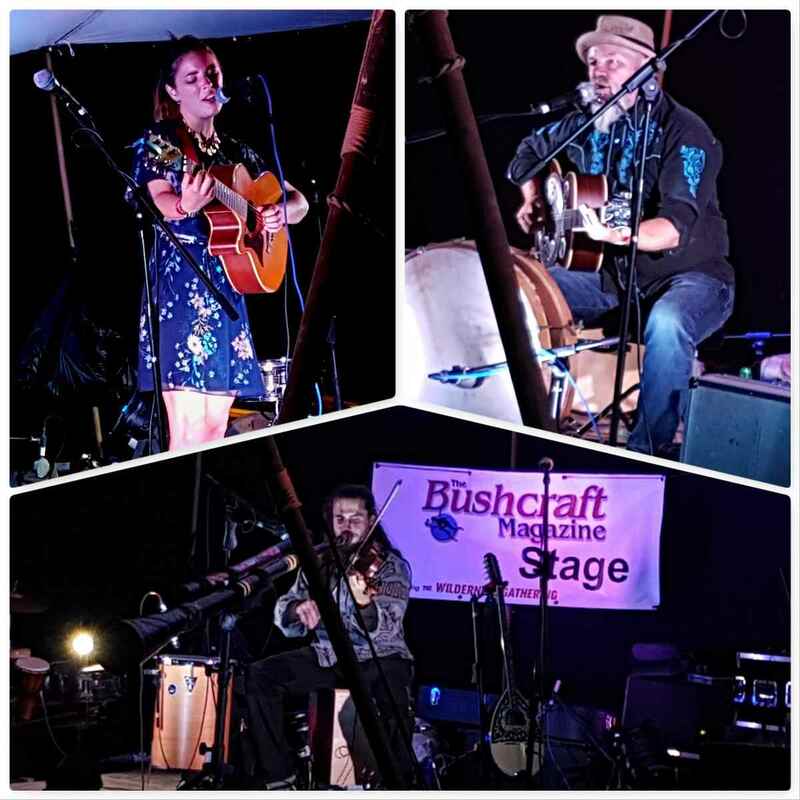 If it was not someone playing a guitar you would be listening to flutes or the Jaw harp. 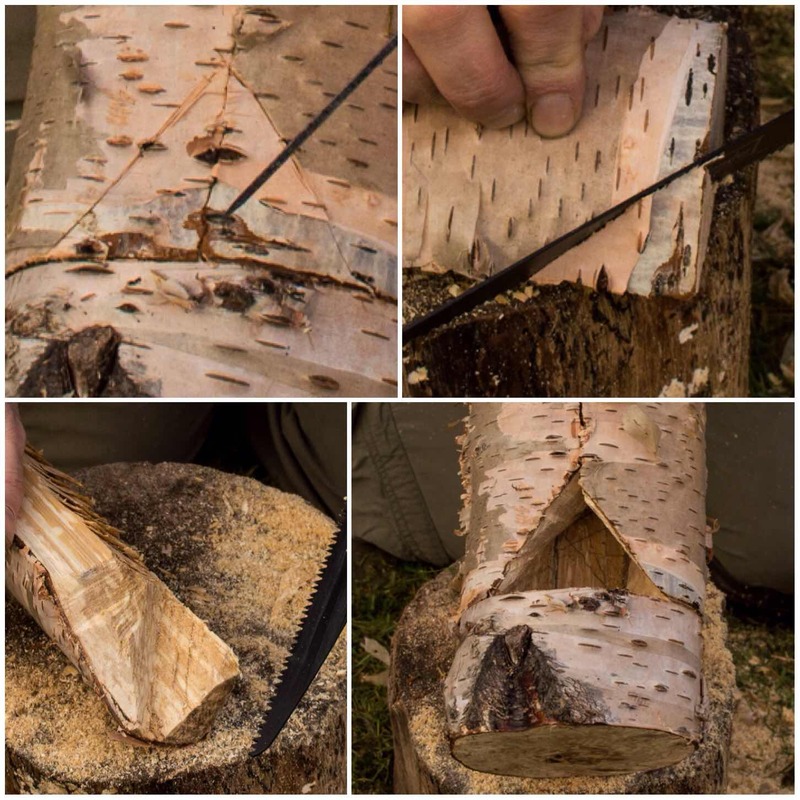 It made sitting there carving all the more pleasurable. 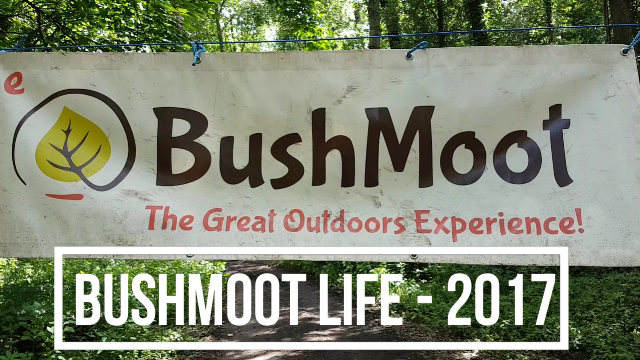 I have learned a lot here while out and about on the mooches from the guys. 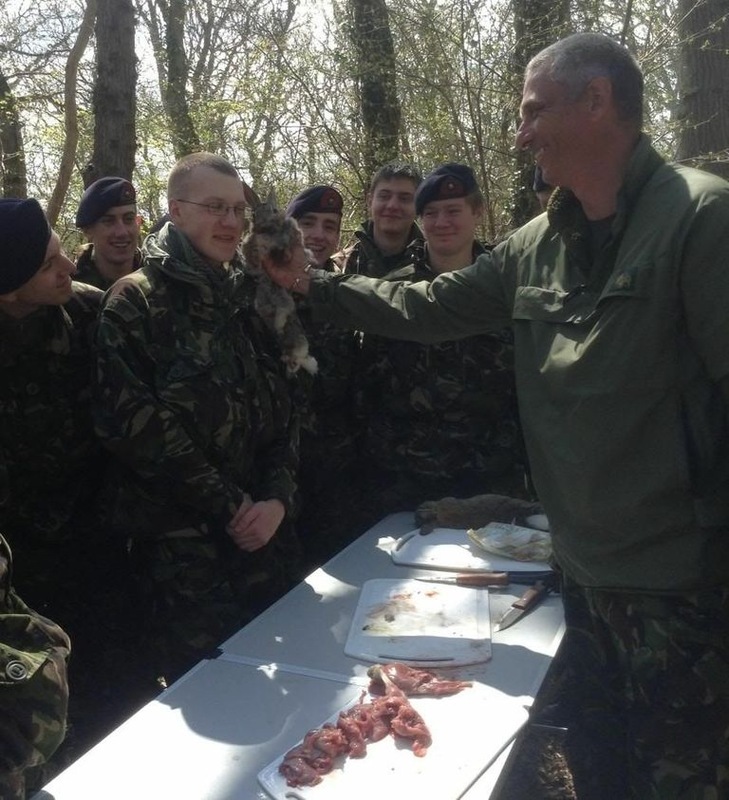 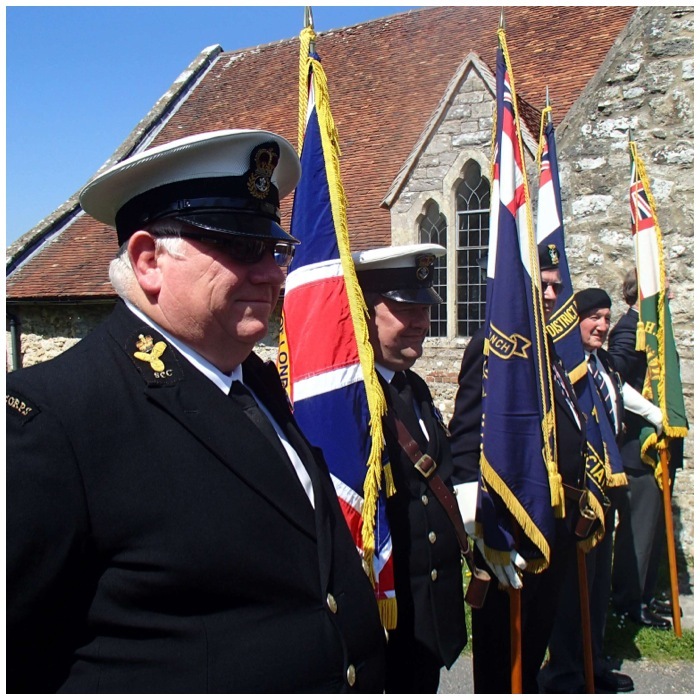 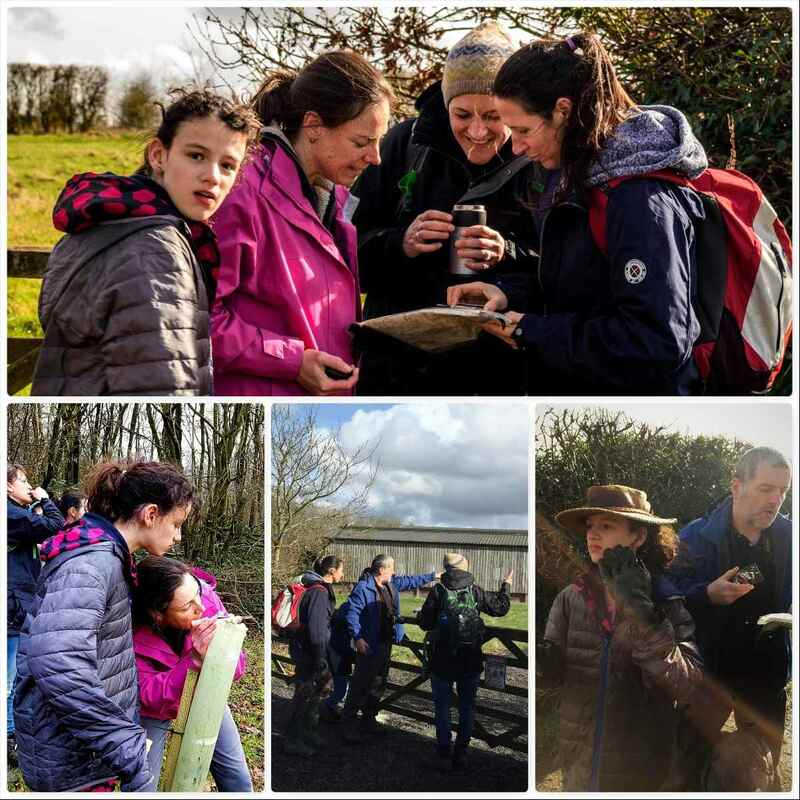 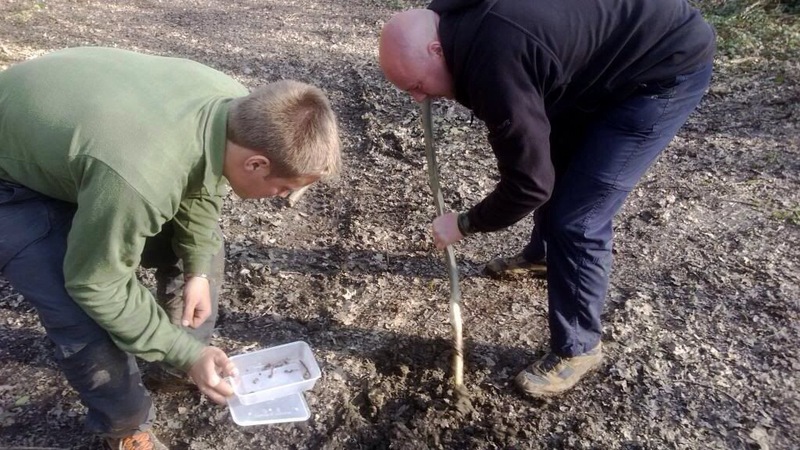 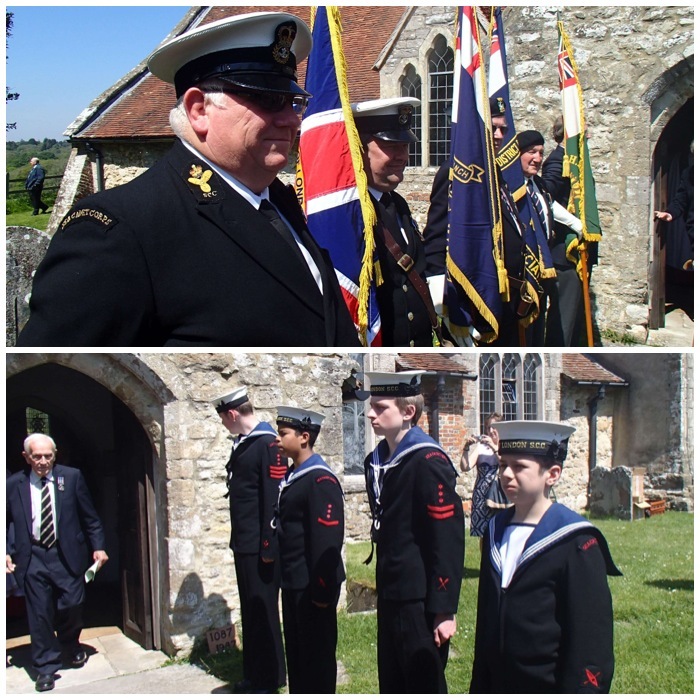 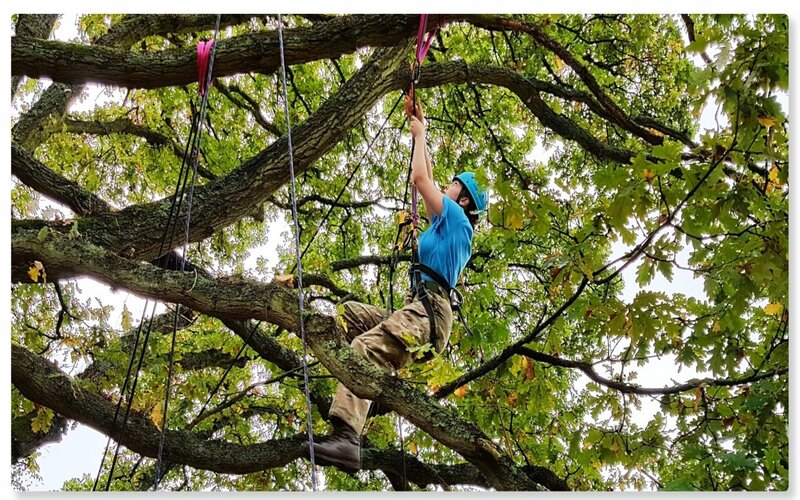 So much so that my colleague Sea Cadet instructors have been known to raise an eye brow or two when I start on about looking for Pignuts (or some other such environmental subject). 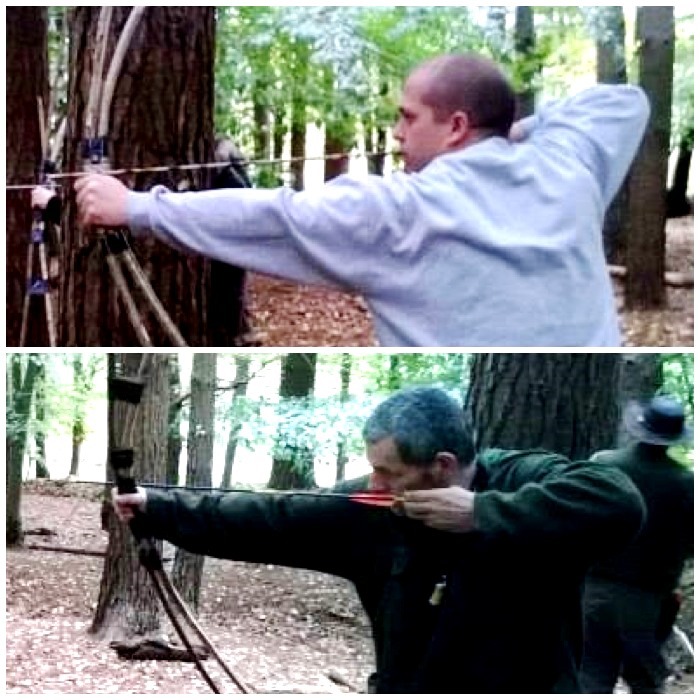 One of my passions is to get my bows out on these meets. 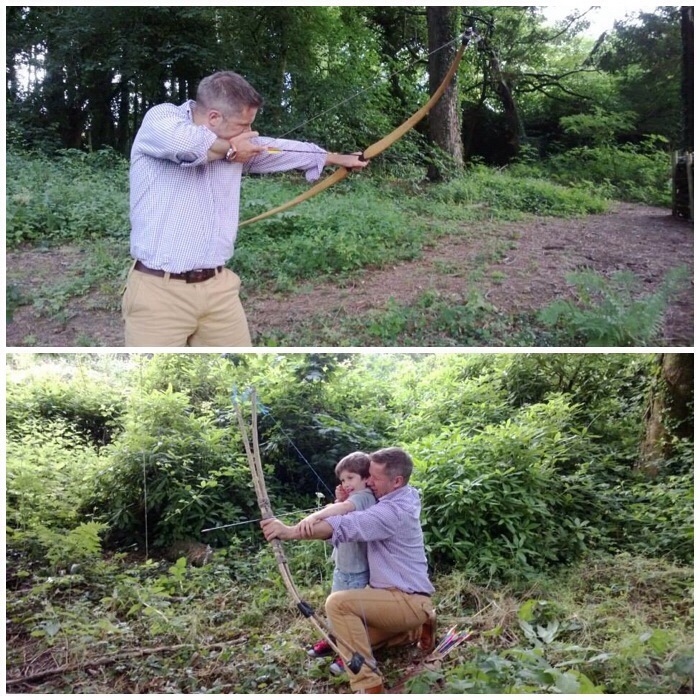 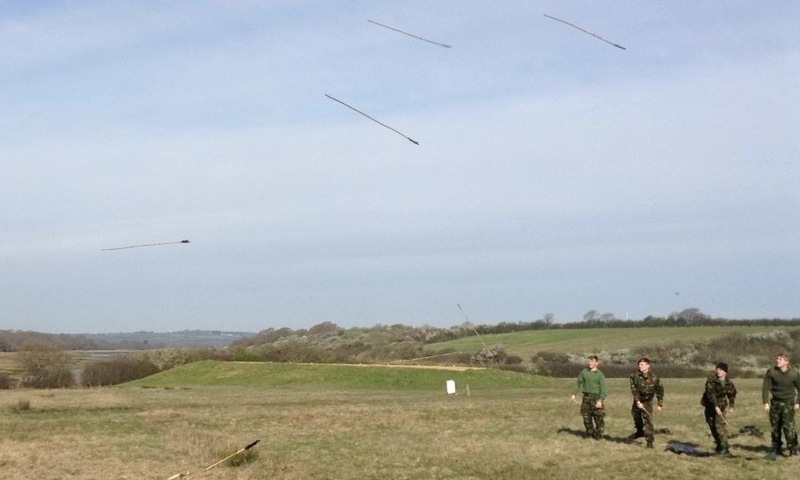 I have shot some remarkable bows over the years here that the lads have brought along. 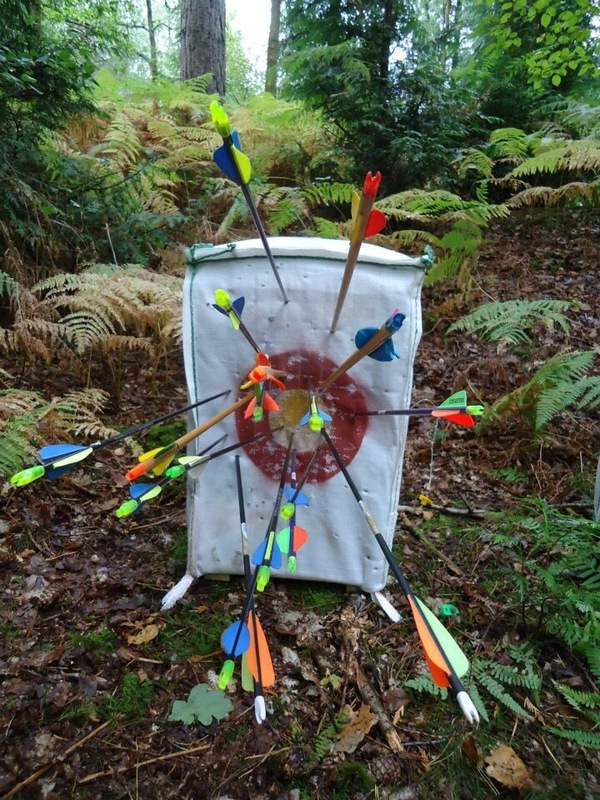 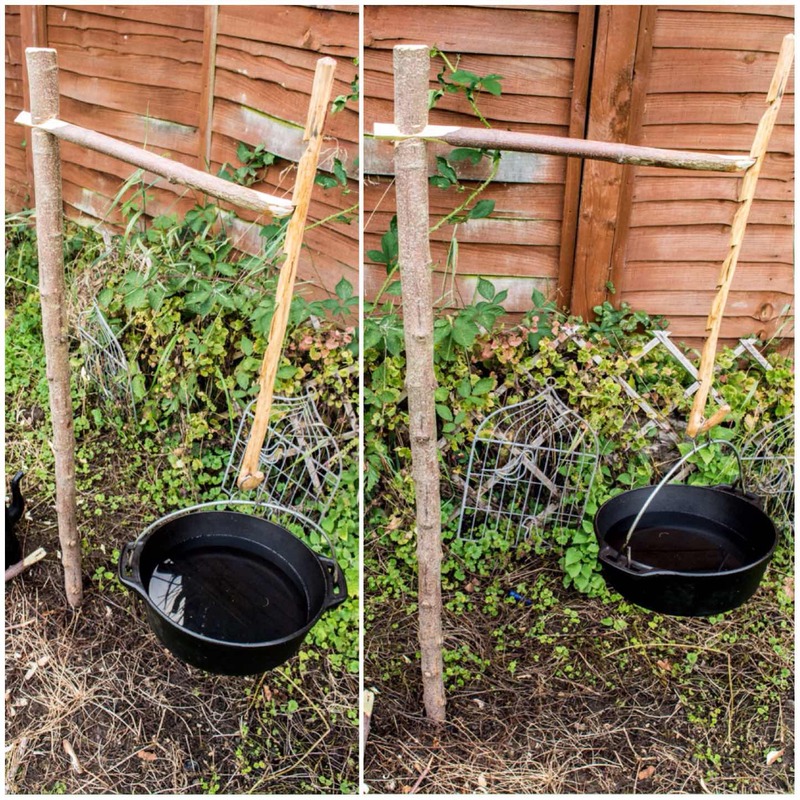 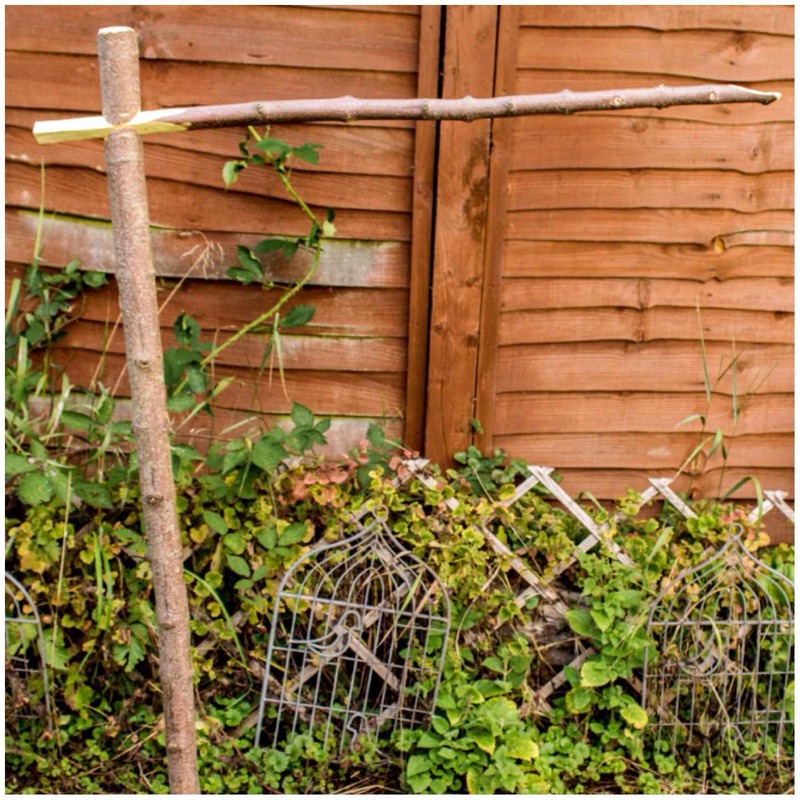 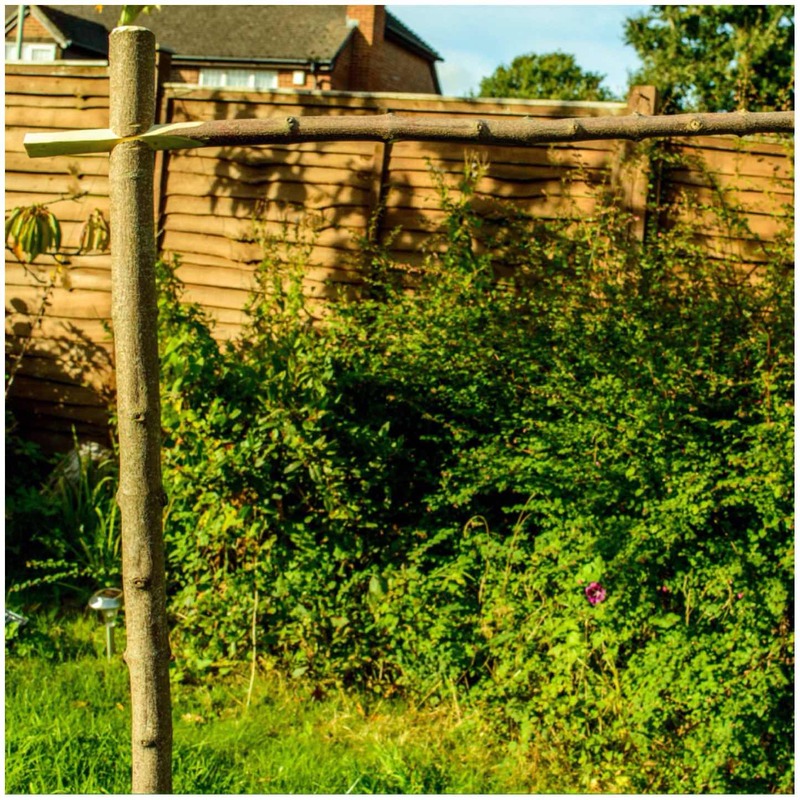 This target by G-Outdoors has been used here for a few years now and is still going great after all the abuse we gave it. 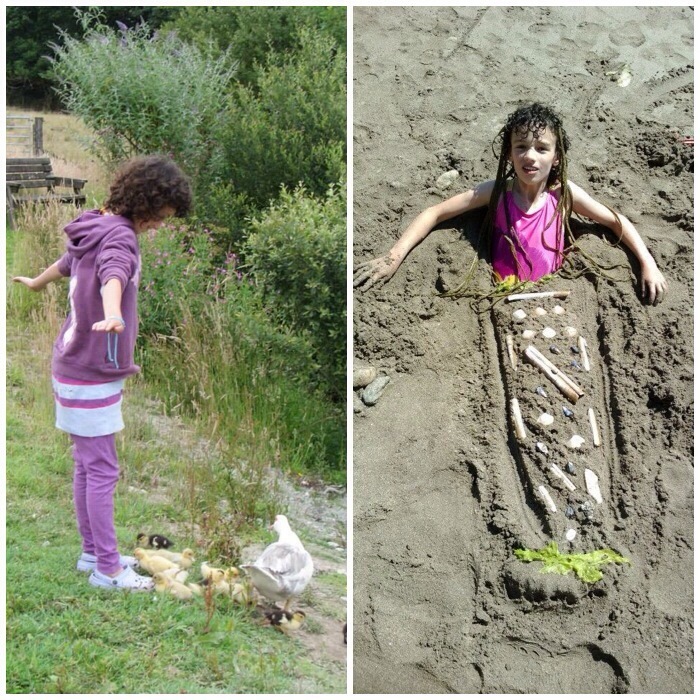 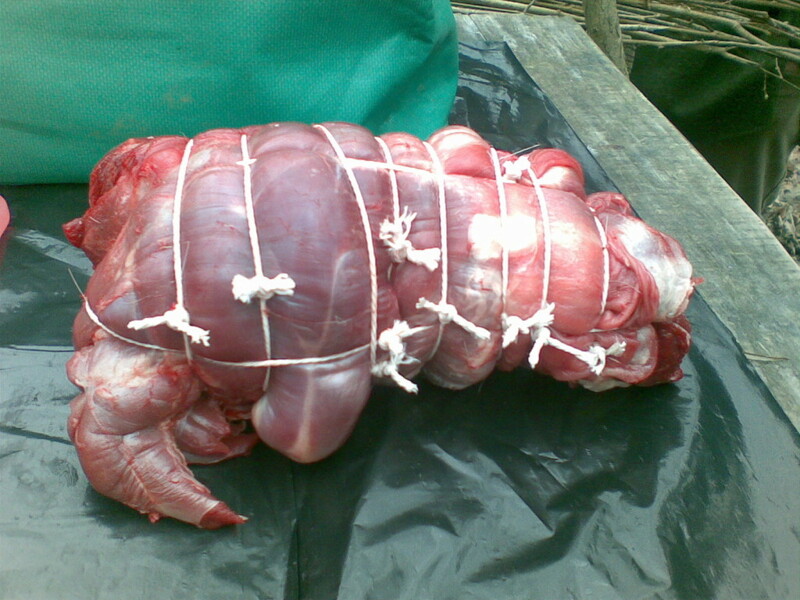 I will let the pictures say it all now. 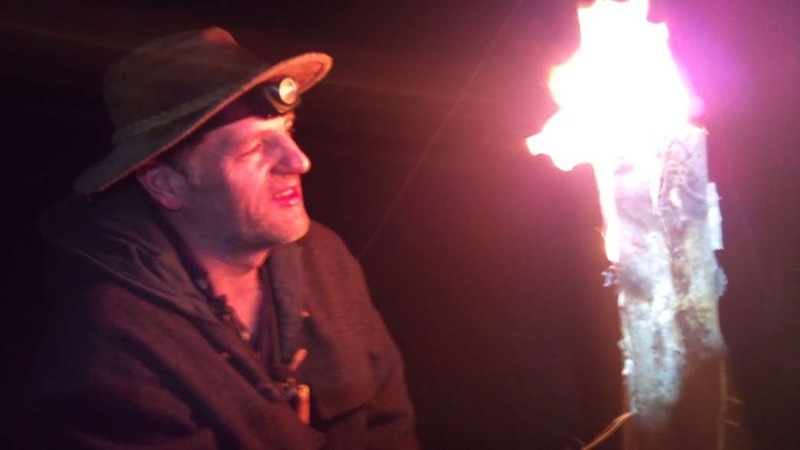 Remember Rich59’s Wet Tinder experiment? 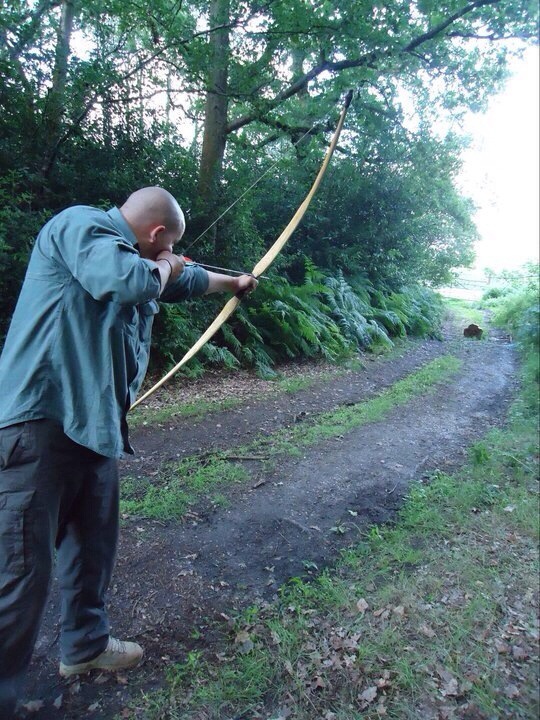 Hopefully I will get back out there sometime soon.